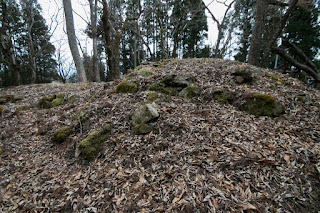 Shuzan castle (周山城) is located at Shiroyama mountain, one of over 200 meter height from hillside at the west of Shuzan town. 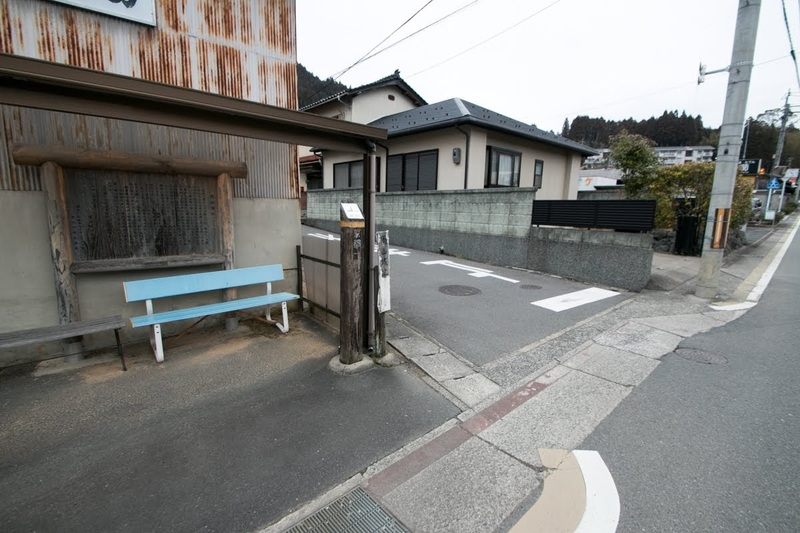 Shuzan town is a small valley in mountainous area at 10 kilometer north of Kyoto city, and an important place as a crossing point of Shuzan Kaido (Shuzan road), current Route 162 spreads north and south ward from Kyoto city to Obama city, and current Route 477 of east and west ward from Sakamoto town (Shiga prefecture) to Yagi town or Kameoka city. 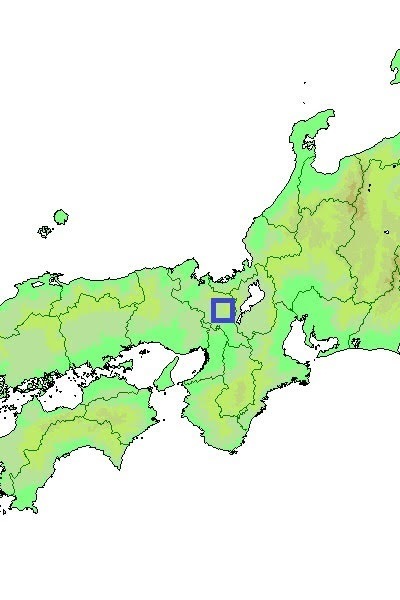 In ancient China and Japan, it was believed that the capital was guarded by four gods at each direction, it means Seiryu (blue dragon) at east, Suzaku (red phoenix) at south, Byakko (white tiger) at west and Genbu (black turtle) at east. 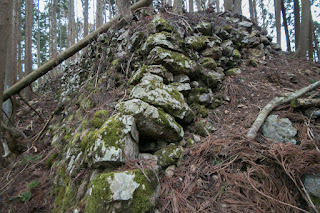 But apart from this legend, Kyoto city needed physical guard for each direction, and ruler of the capital built their defense base at each side of the castle, as Kyoto city itself is just a city without any strong wall at plain. 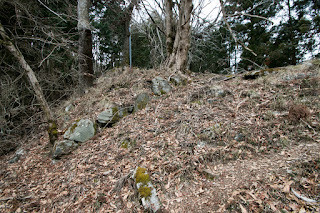 Nobunaga Oda (1534-1582), who marched to Kyoto city and became the ruler in 1567, also prepared defense point of Kyoto city. 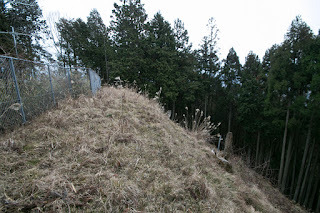 Eastward was protected by Sakamoto castle (Shiga prefecture), southward by Shoryuji castle (Kyoto prefecture) and westward by Tanba Kameyama castle (Kyoto prefecture). 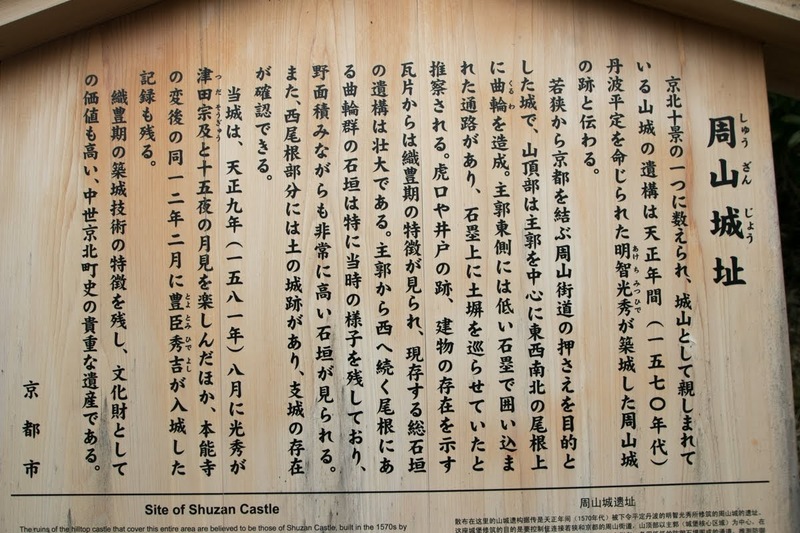 Mitsuhide Akechi (1528-1582), a confident general of Nobunaga and regional commander of Kinki region, managed all of these castles including Shuzan castle. When Mitsuhide revolted to Nobunaga in 1582, due to its situation Mitsuhide could hide his information to Nobunaga and shut all escape route from Kyoto city. 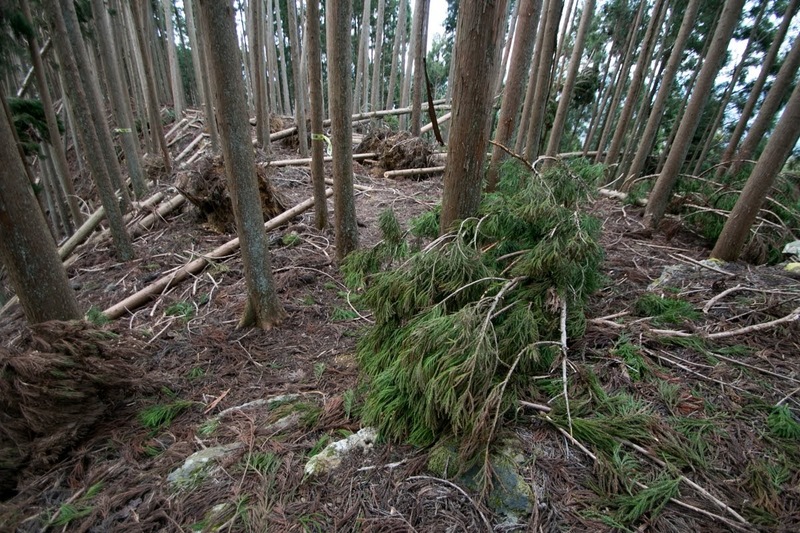 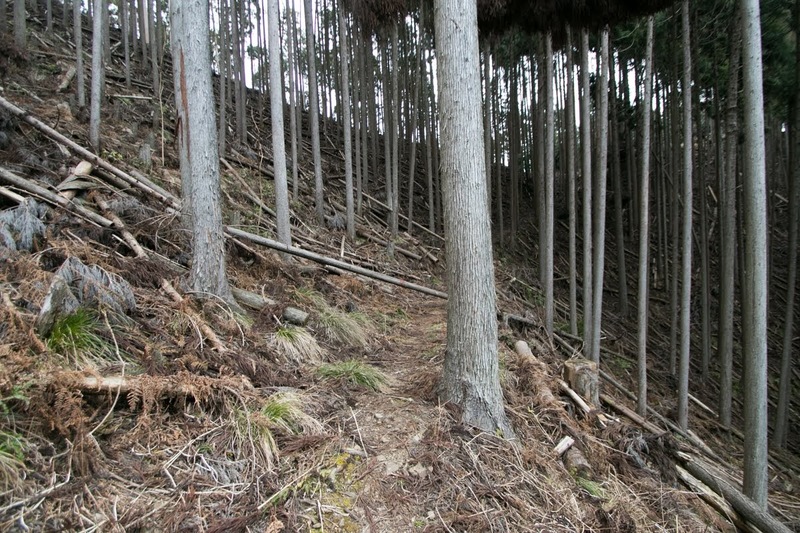 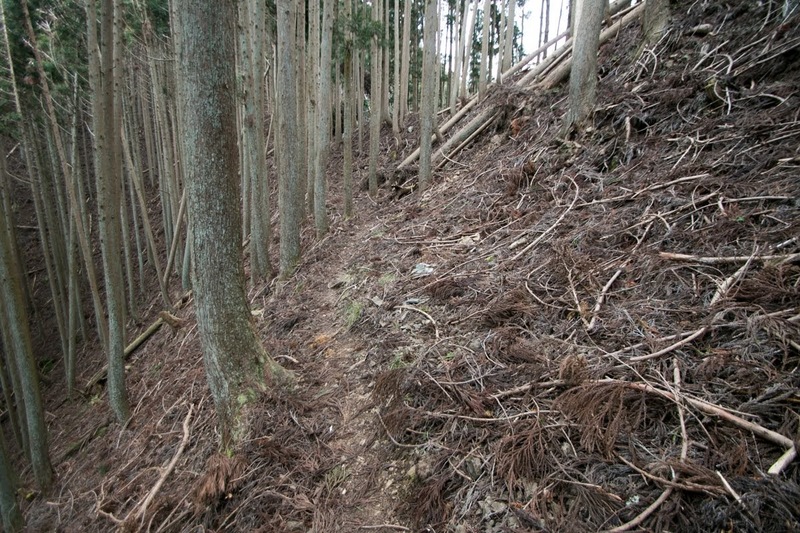 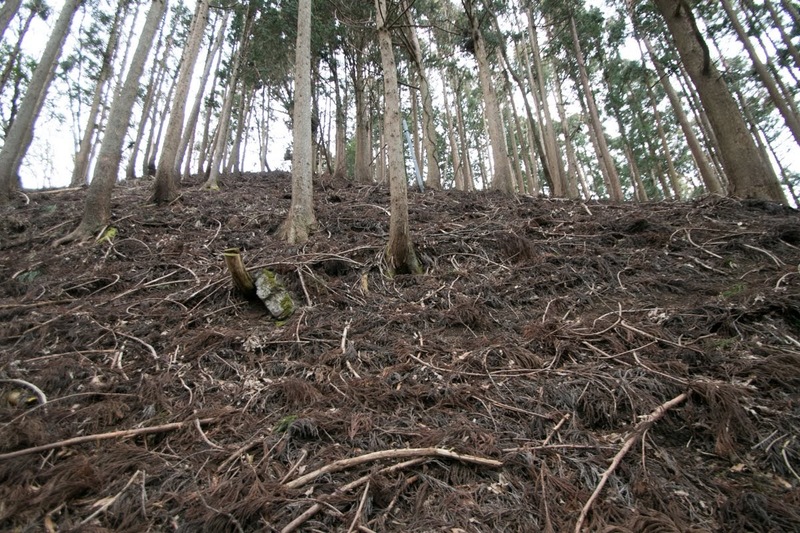 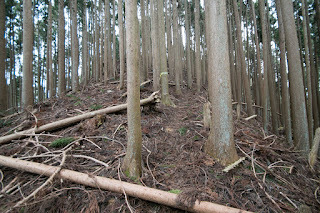 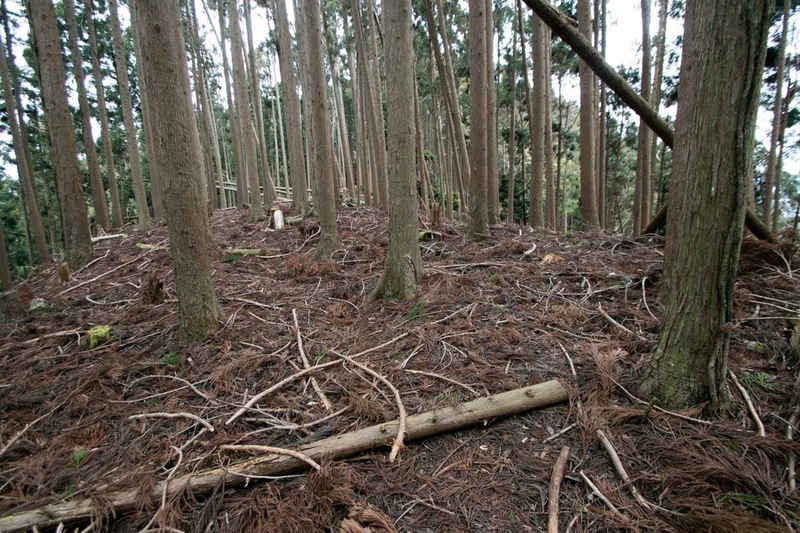 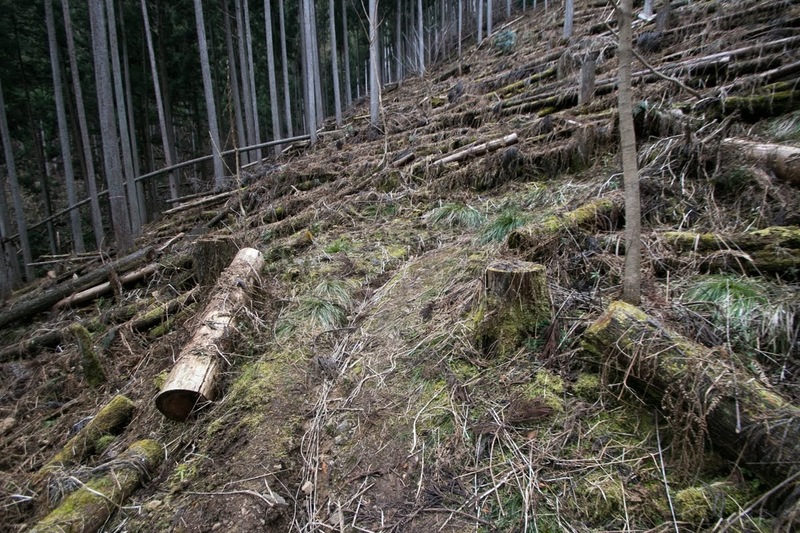 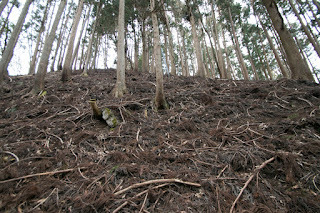 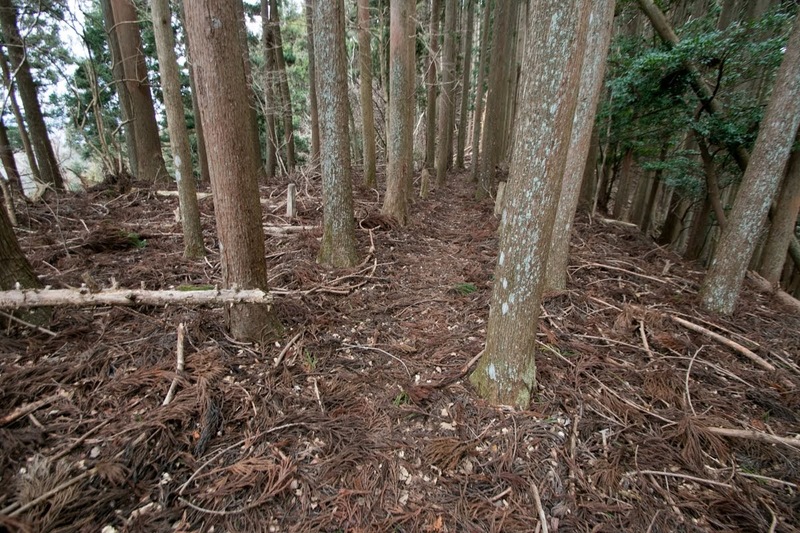 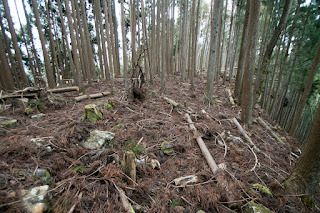 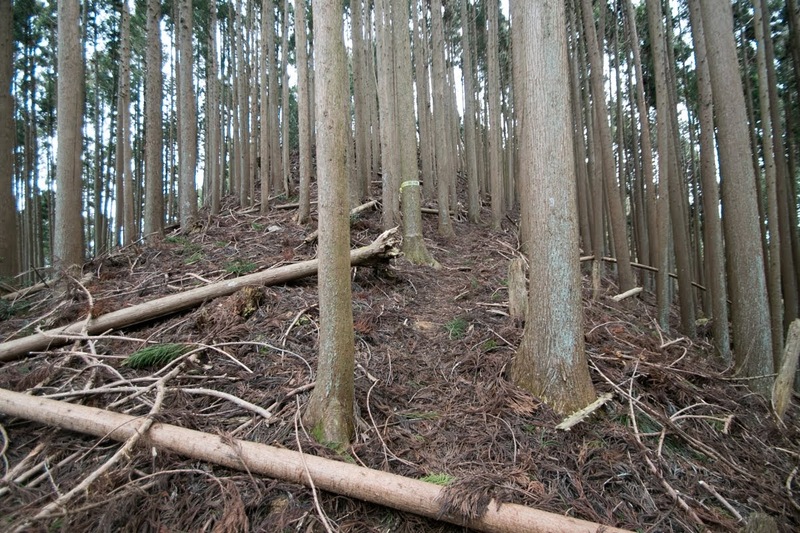 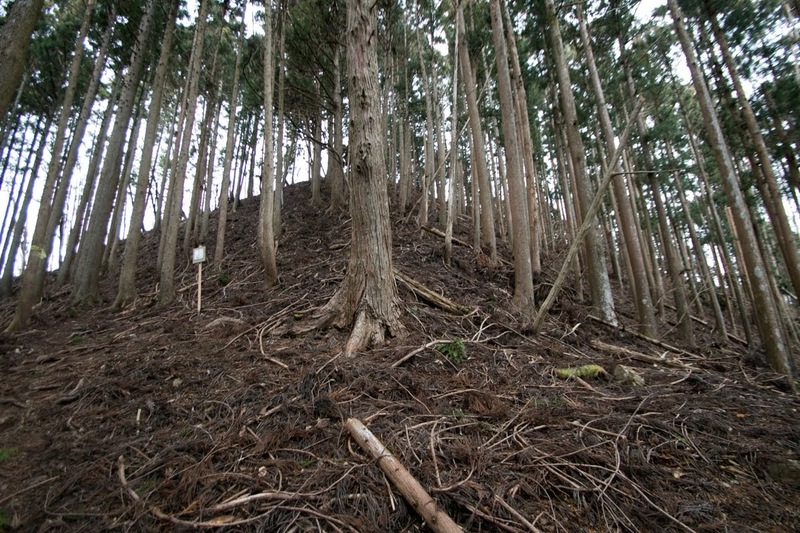 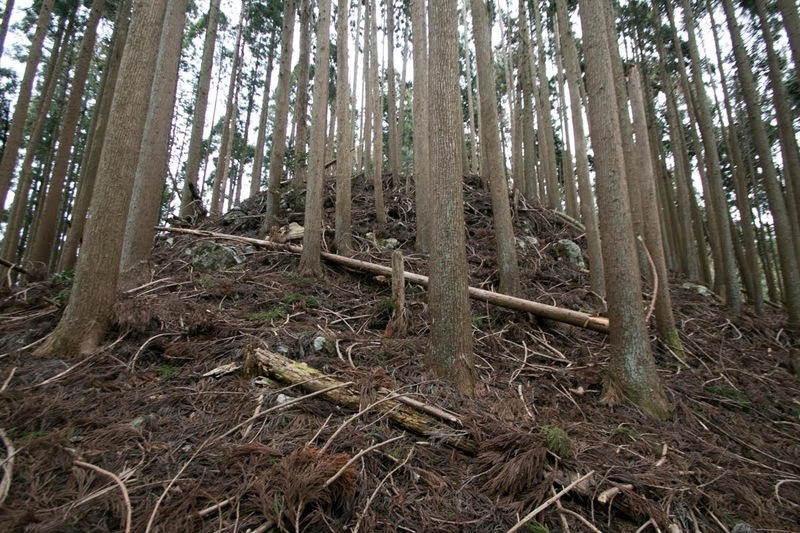 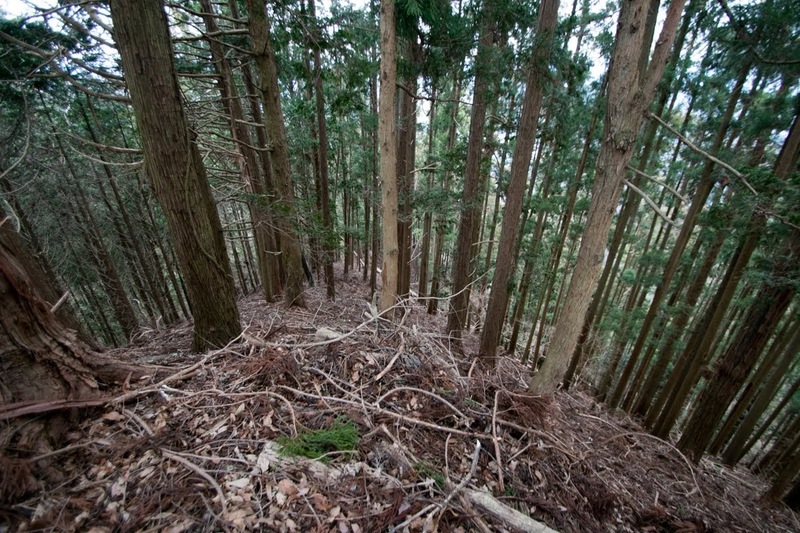 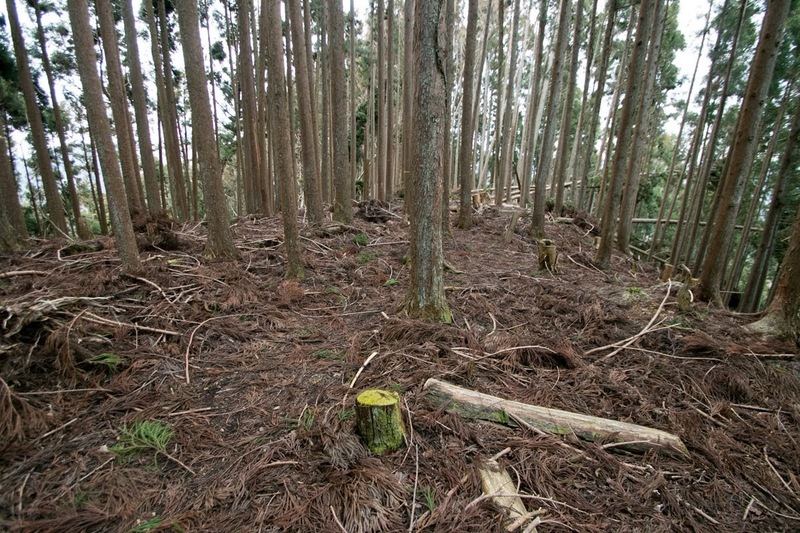 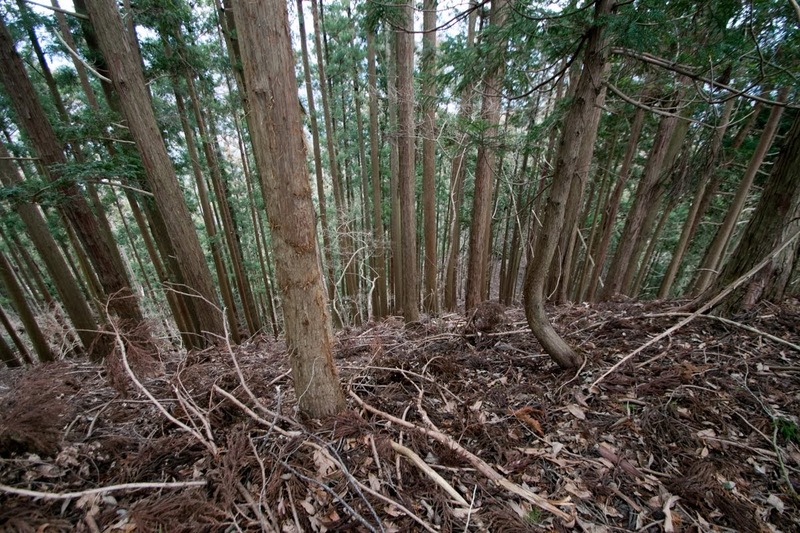 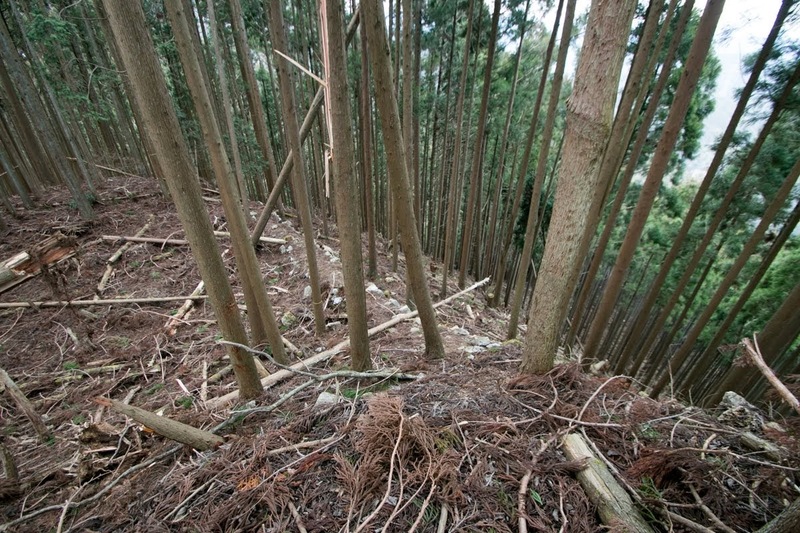 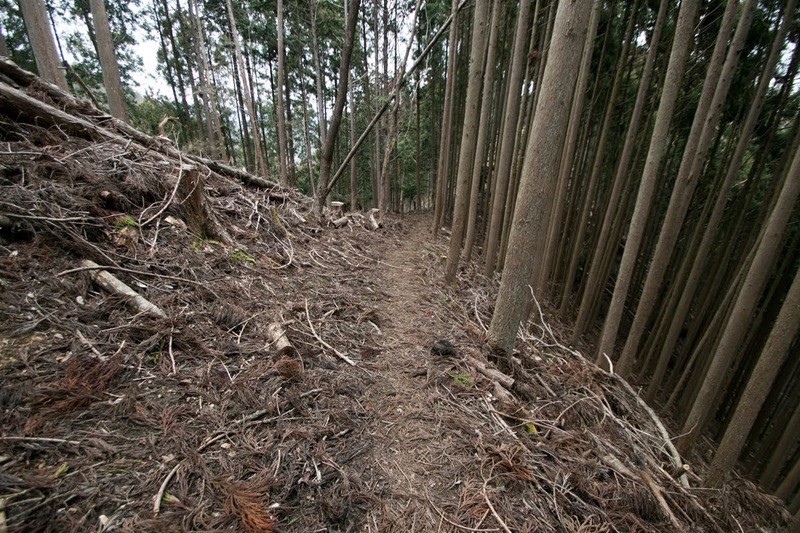 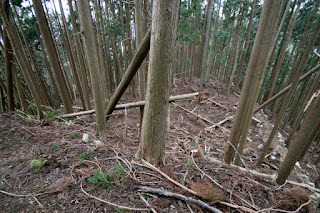 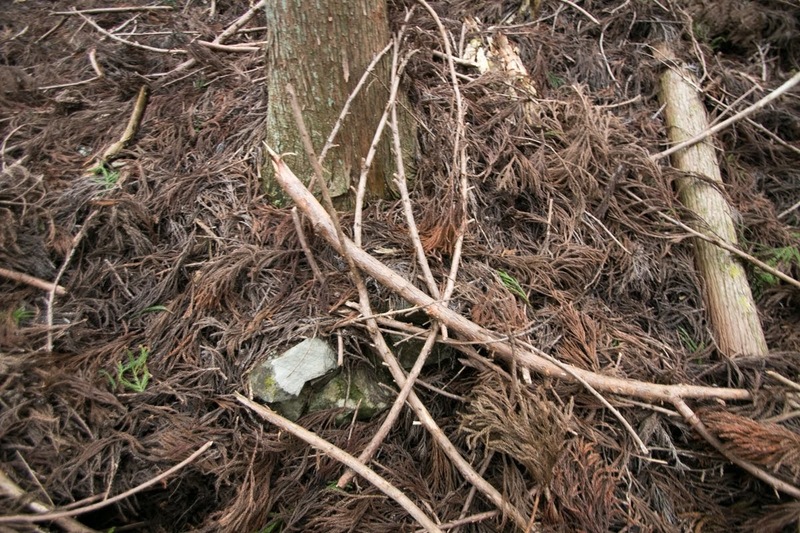 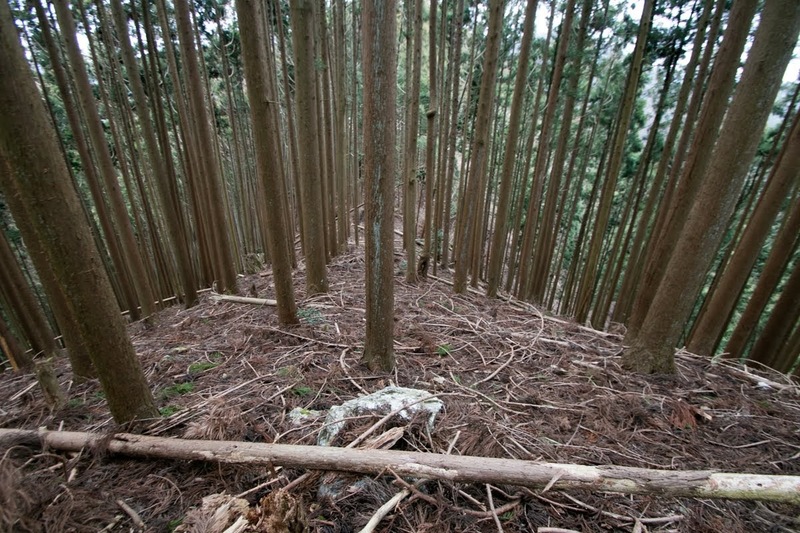 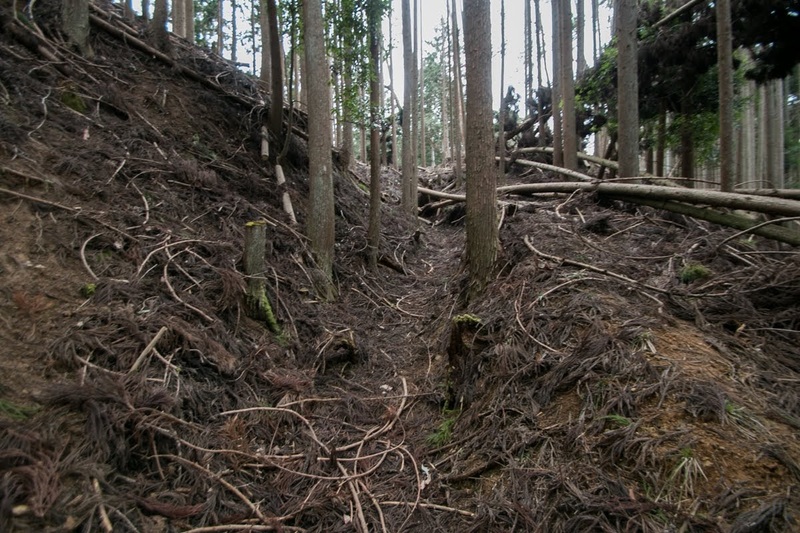 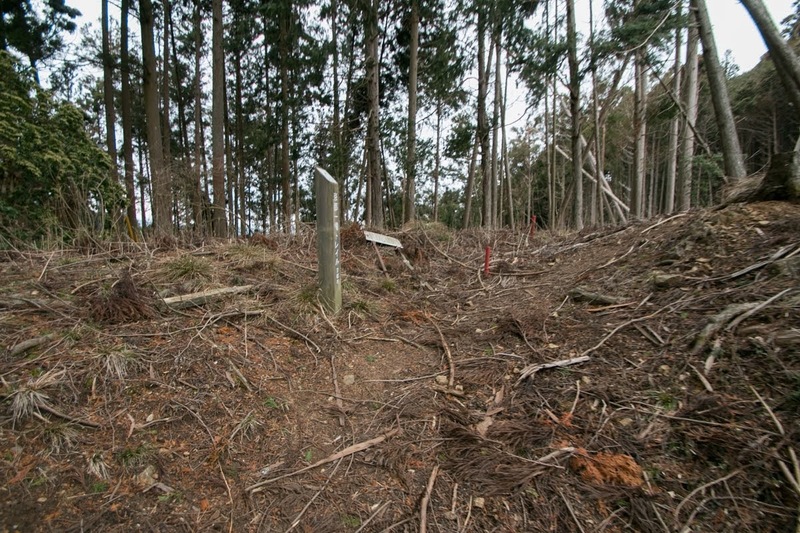 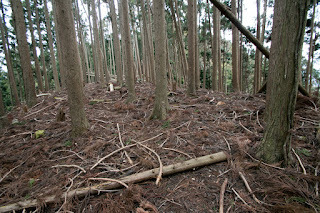 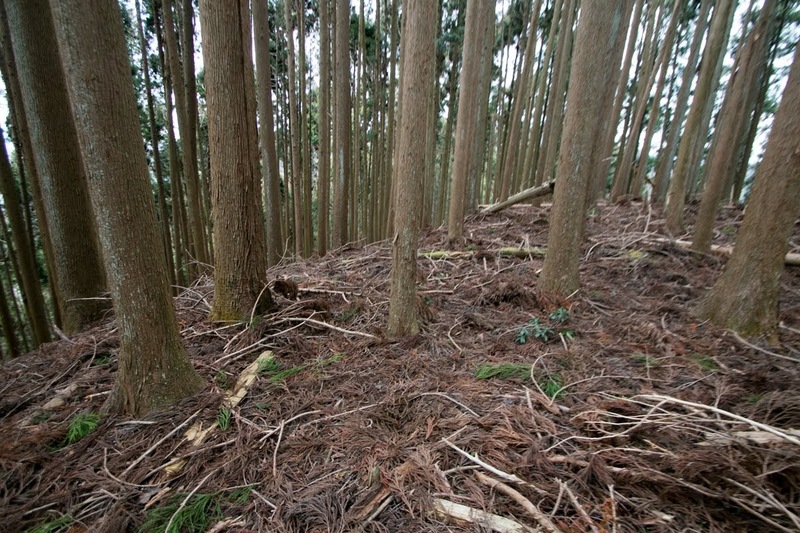 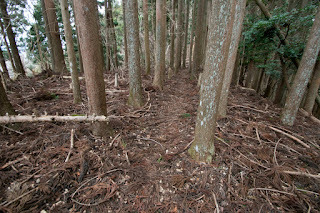 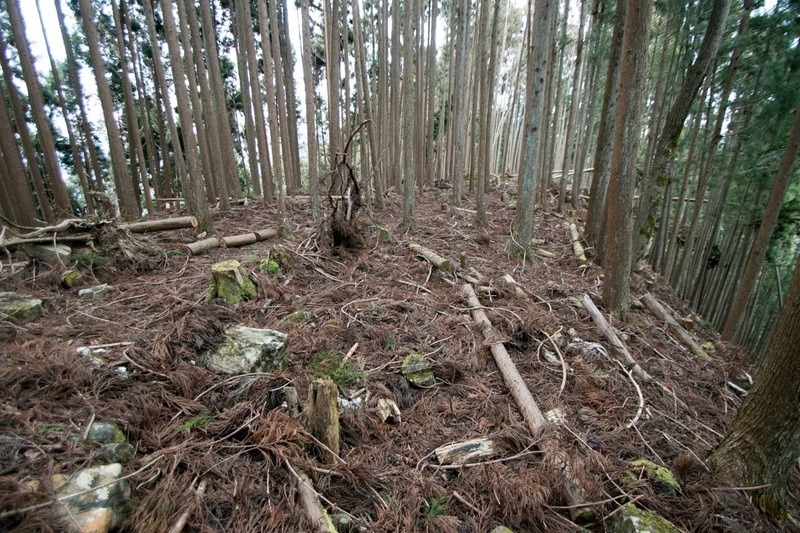 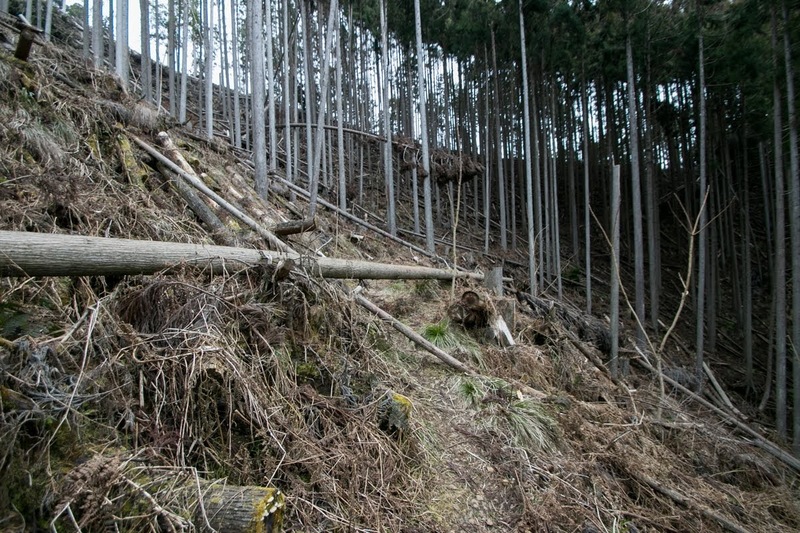 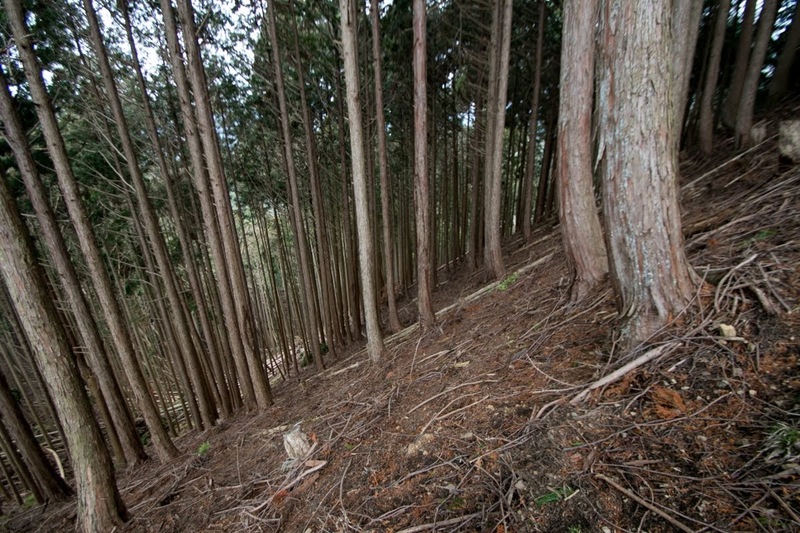 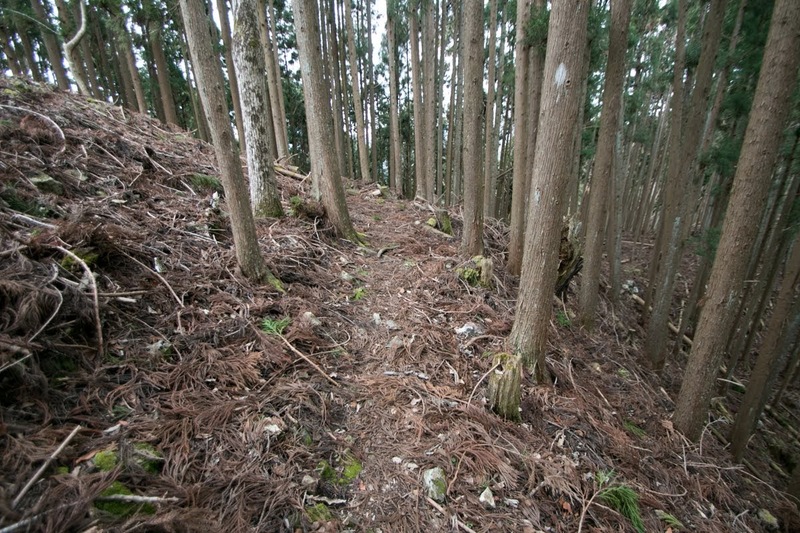 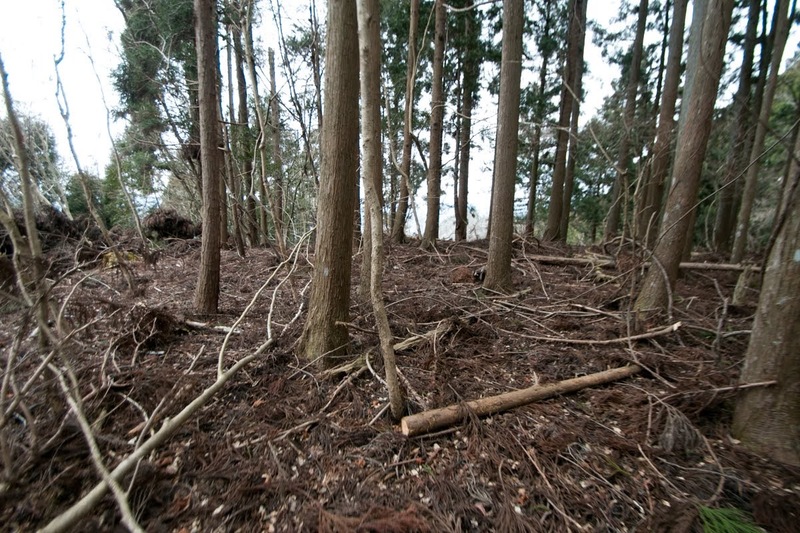 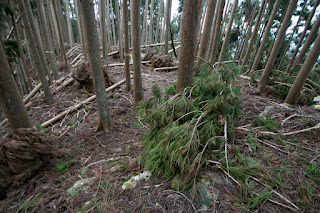 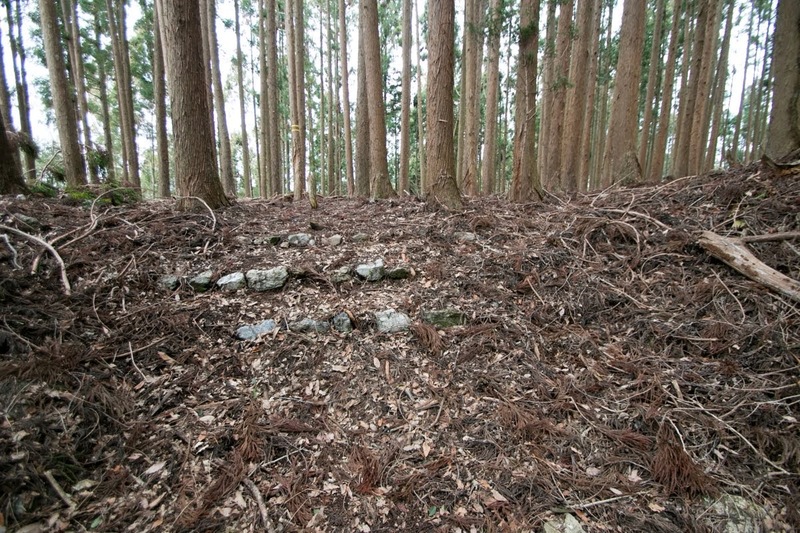 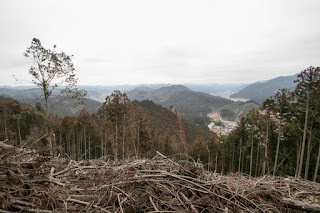 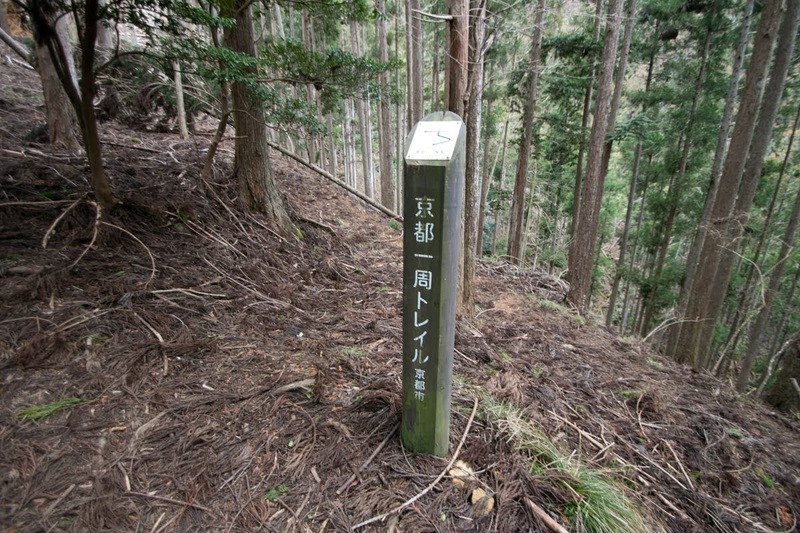 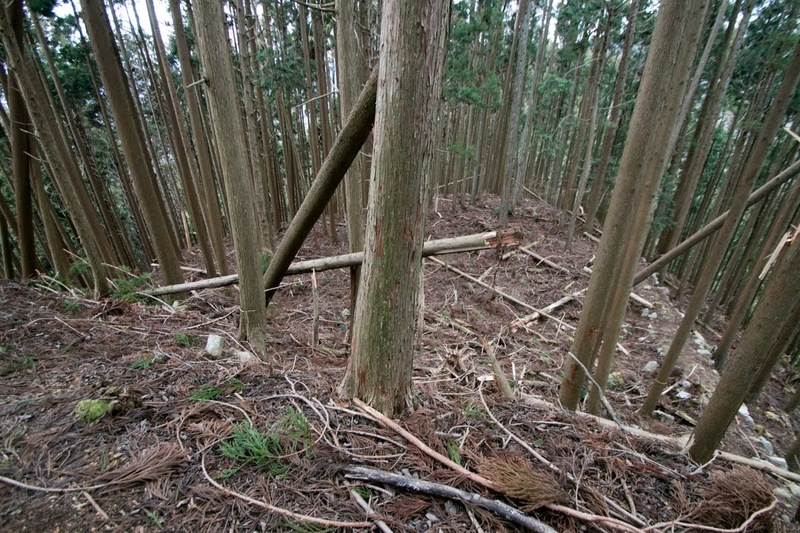 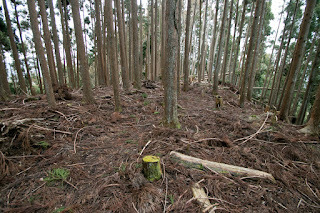 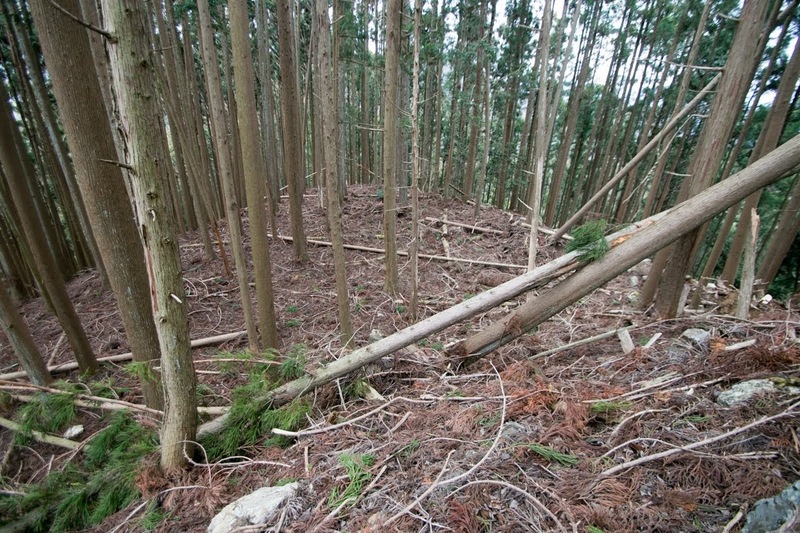 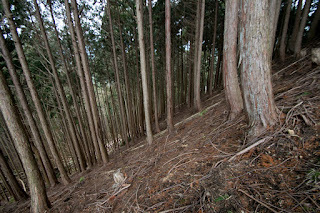 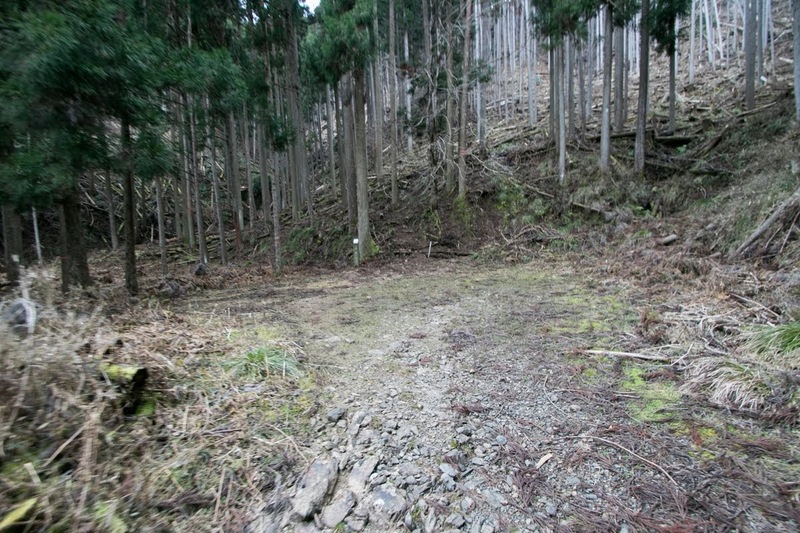 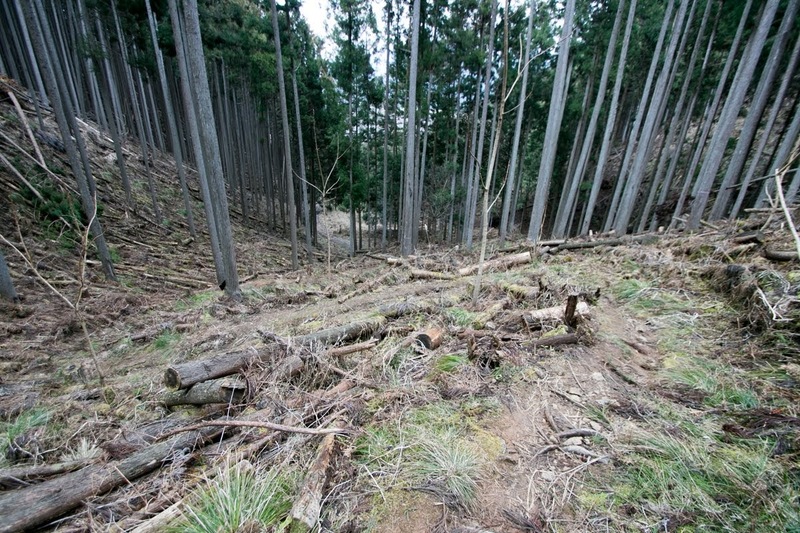 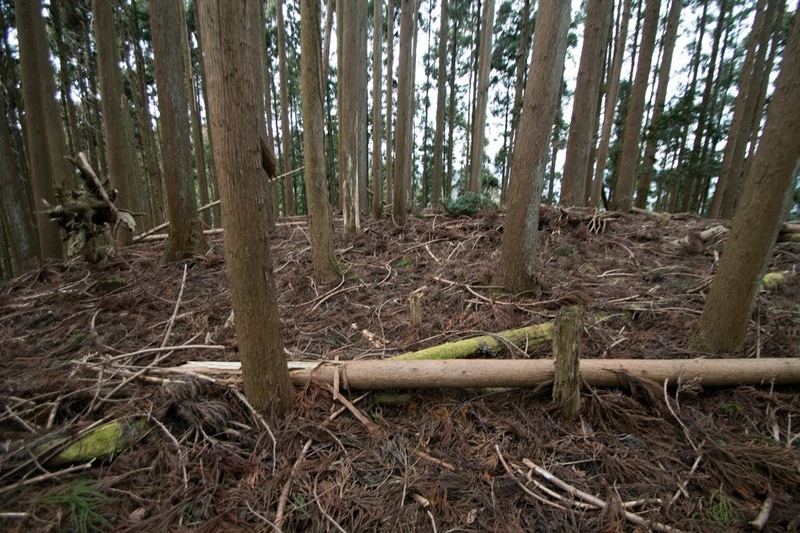 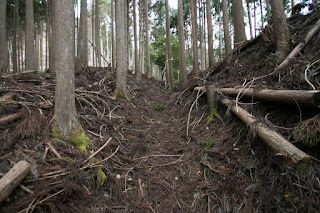 The northward of Kyoto city was mountainous area and not appropriate for movement of large army, and enemies of this direction such as Takeda clan of Wakasa province (western part of Fukui prefecture) or Issiki clan of Tango province (north part of Kyoto prefecture) were already defeated by Oda army and subordinated to Nobunaga. 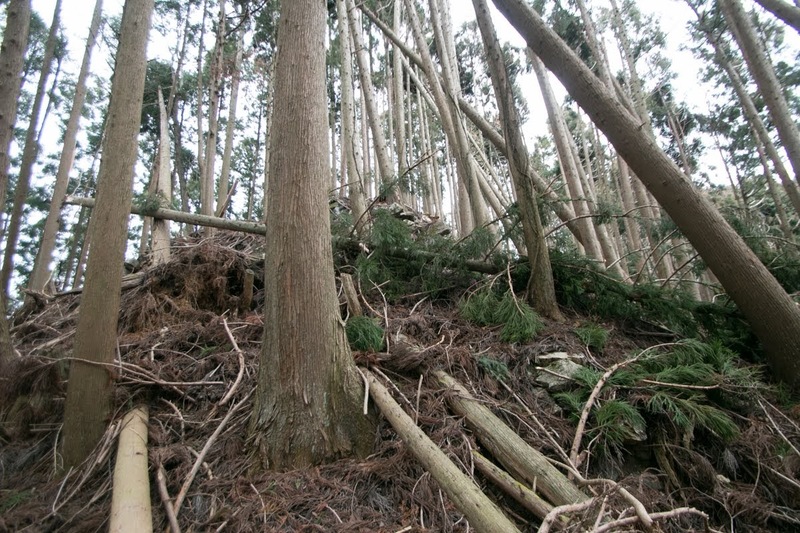 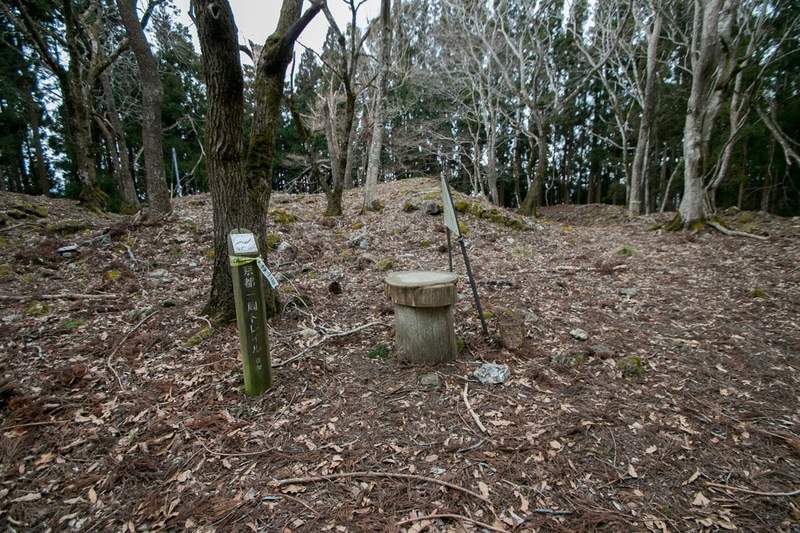 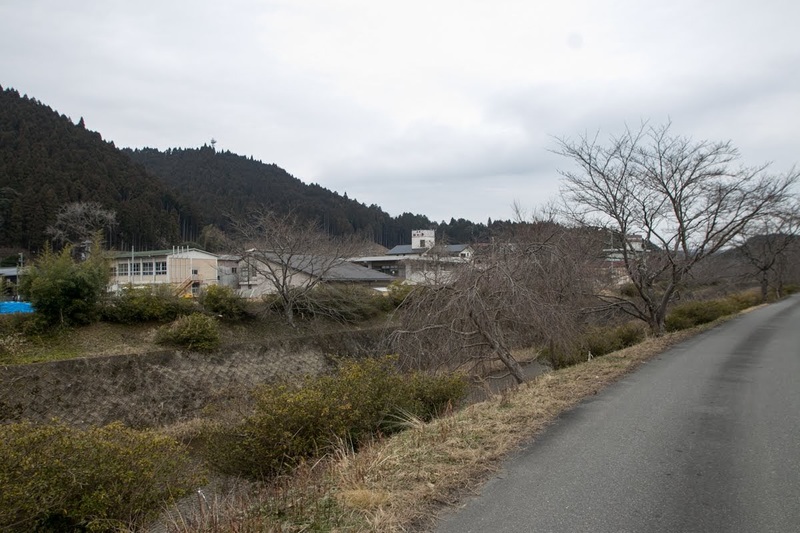 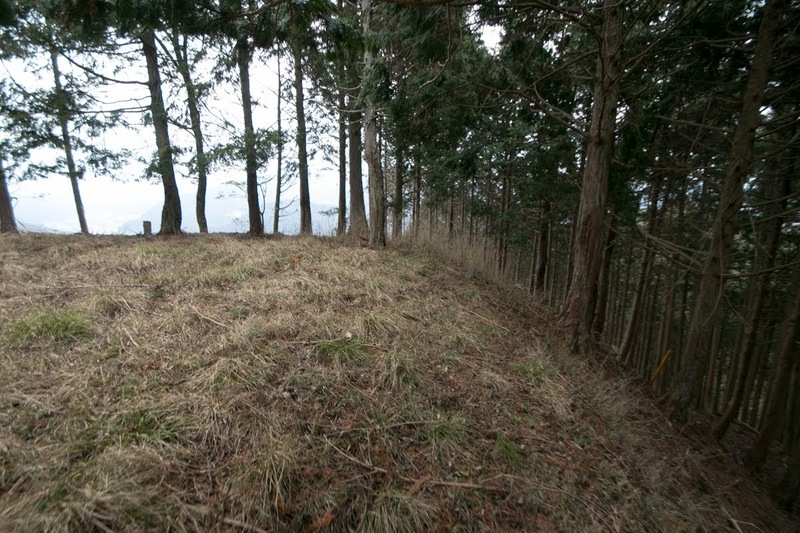 But in any case defense base was necessary, thus Mitsuhide who extinguished local lord Uzu clan in 1579 newly built Shuzan castle at the top of Shiroyama mountain. 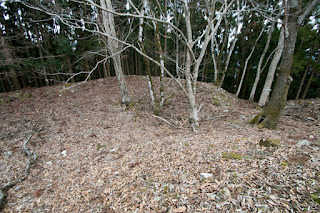 Shuzan castle mainly consist of central area at the peak of the mountain and outer areas spread along with three ridges, and the basic structure resembles to Takeda castle (Hyogo prefecture), even though a bit smaller. 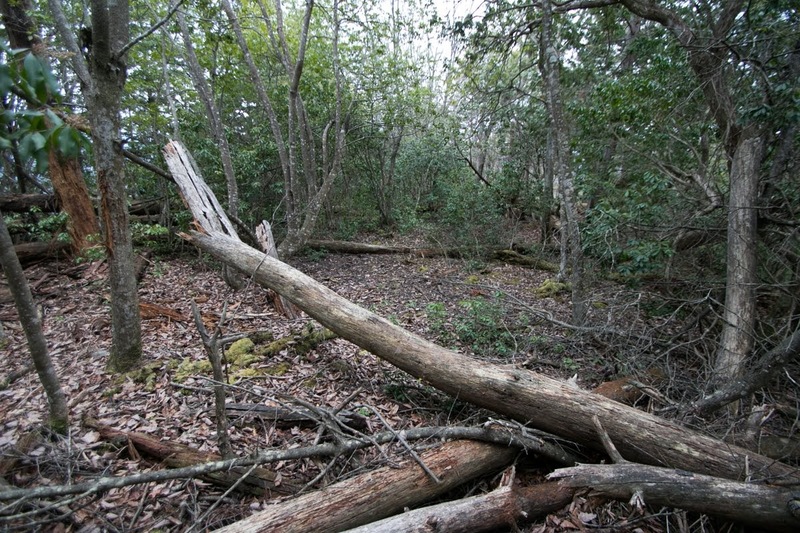 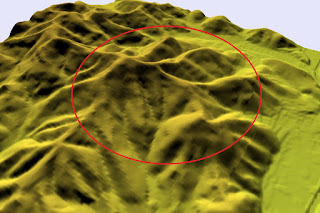 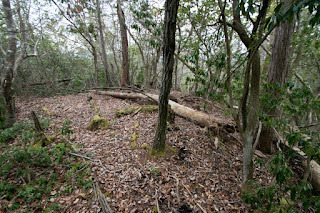 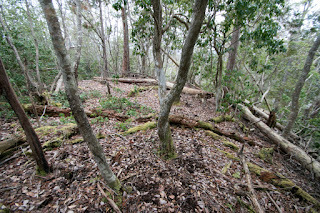 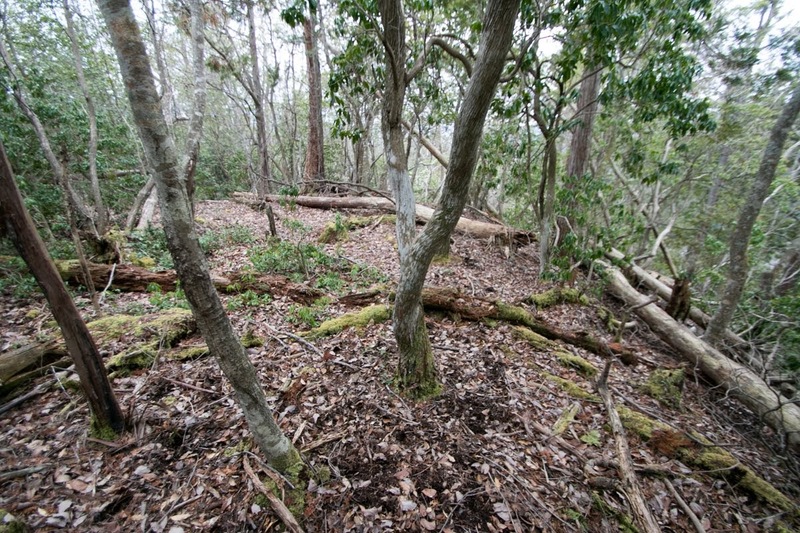 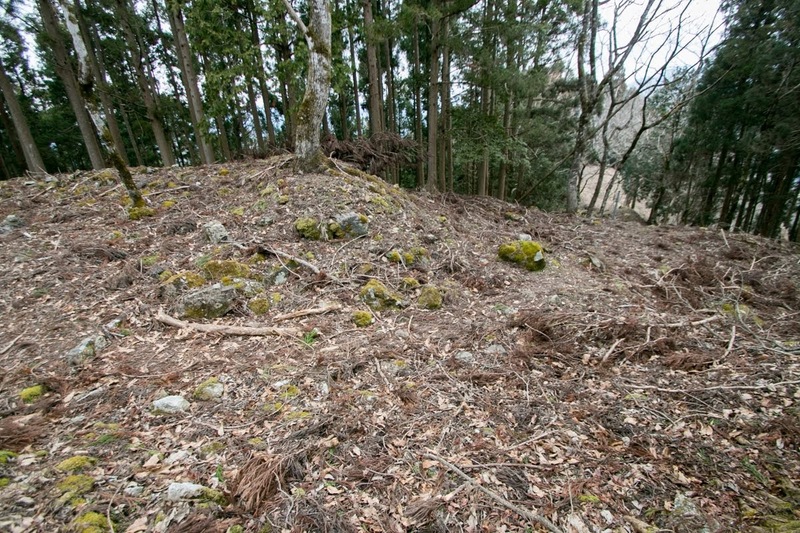 Central area is a 50 meter squared area, and a small height of about five meter long square with a hollow which might be a ruin of basement of main tower exists at the center. 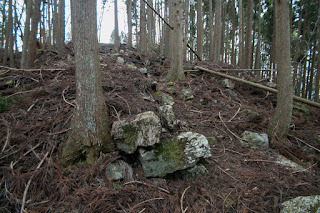 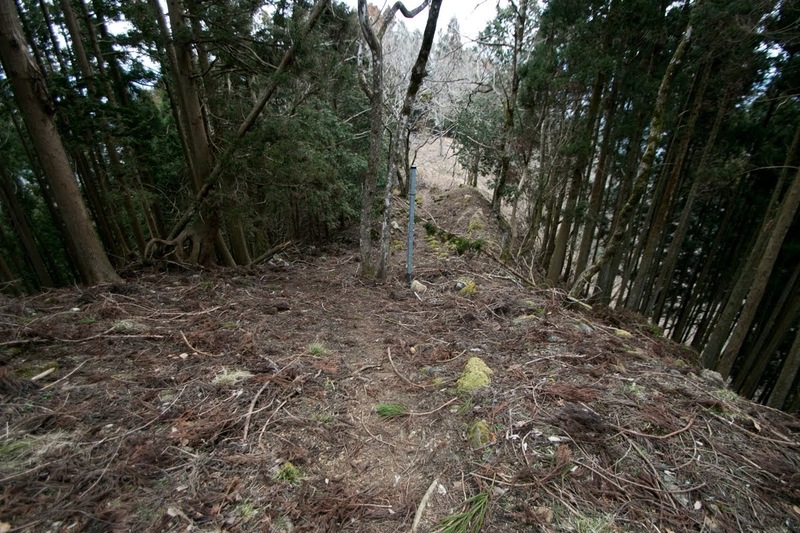 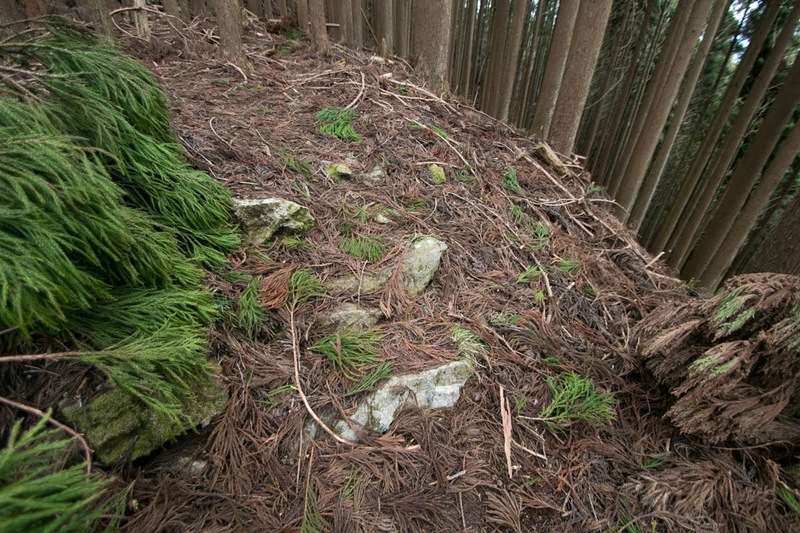 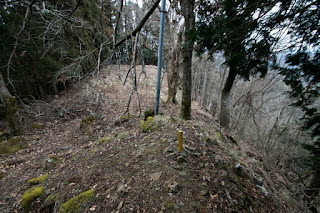 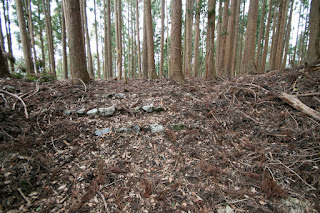 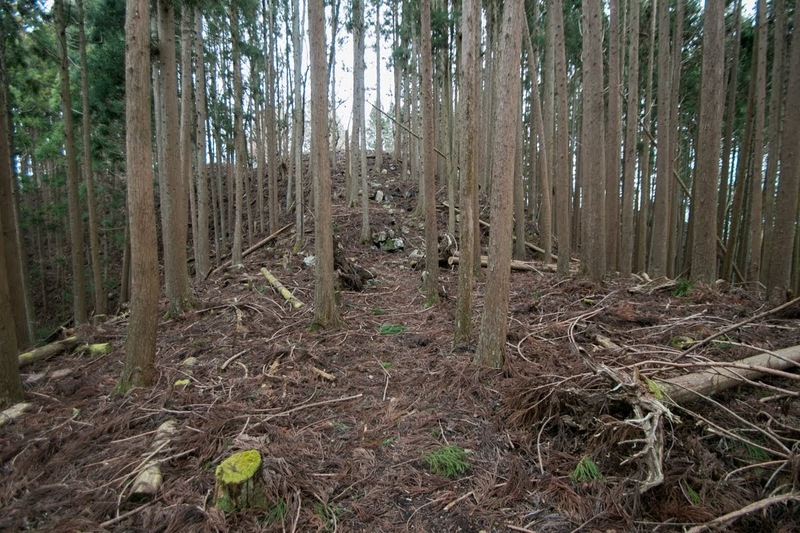 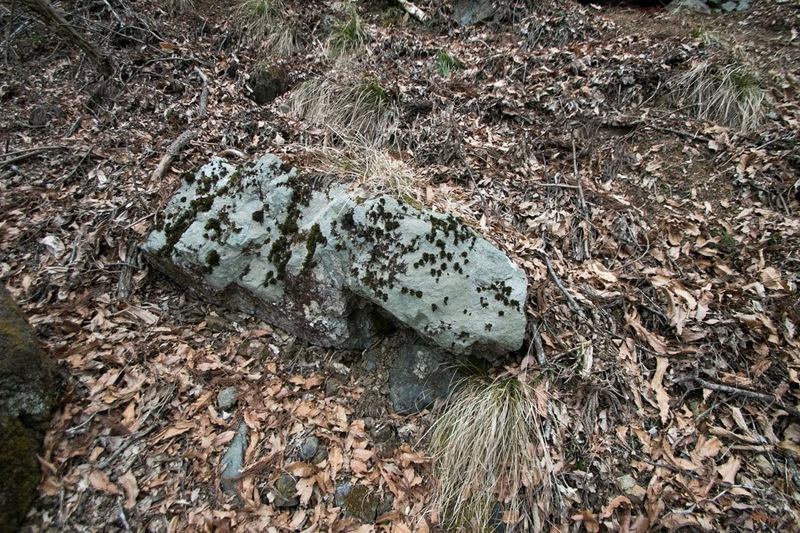 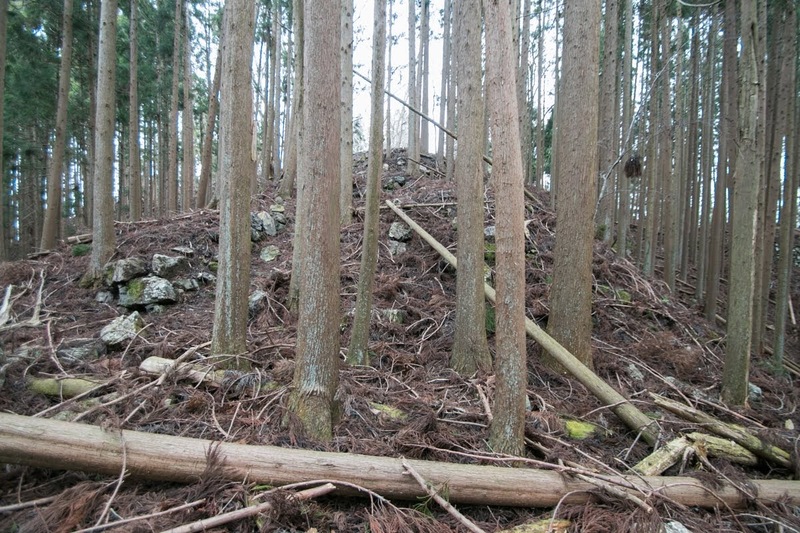 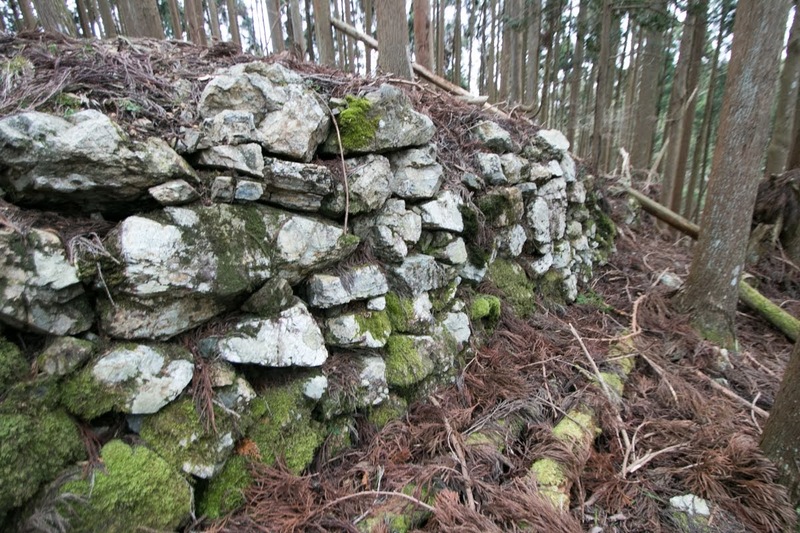 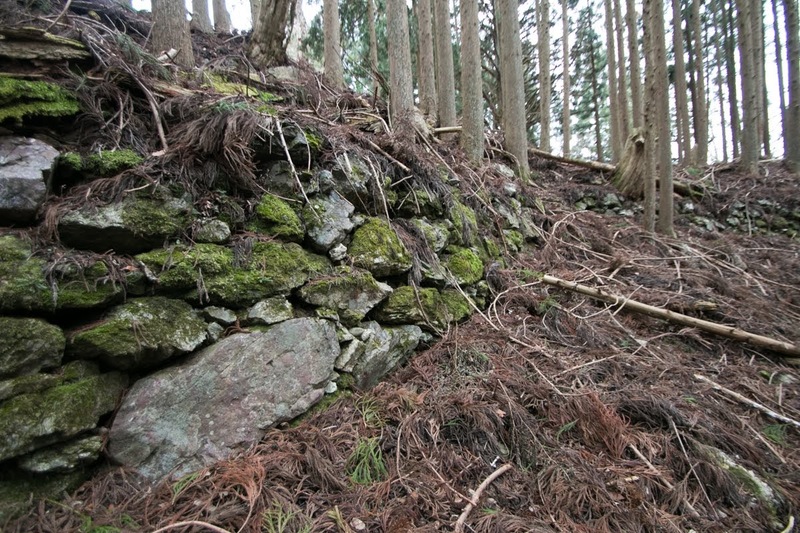 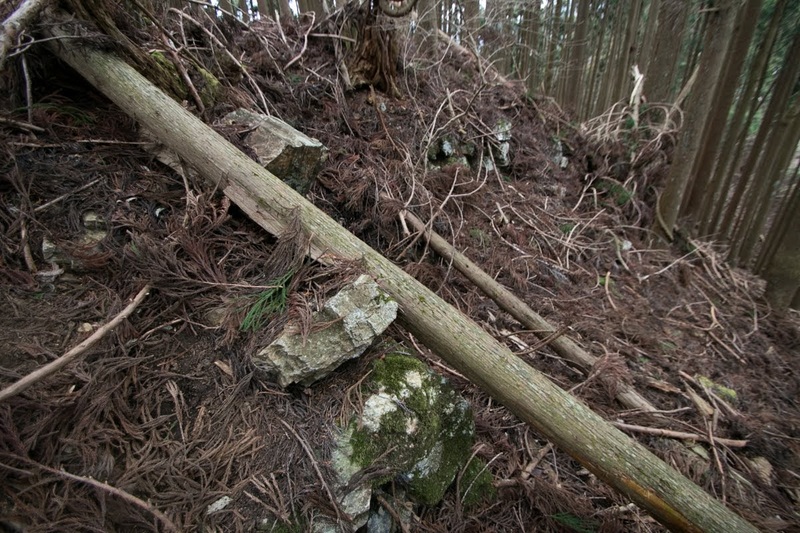 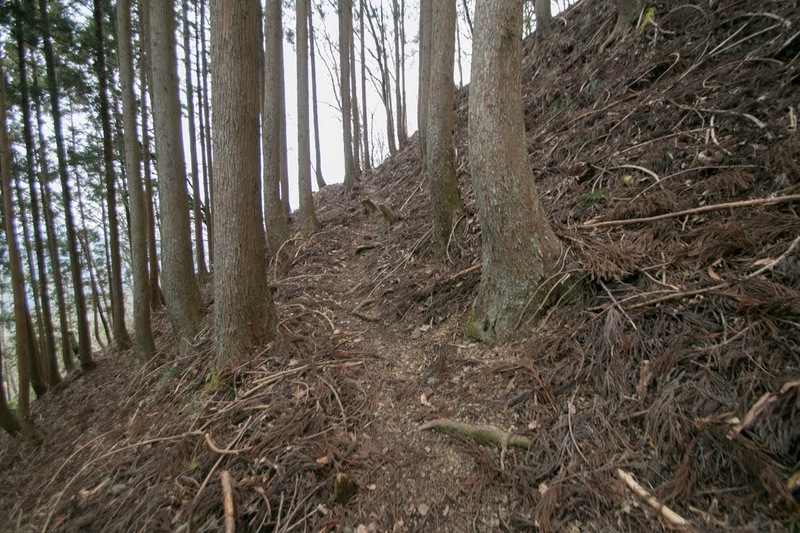 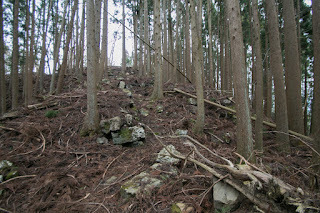 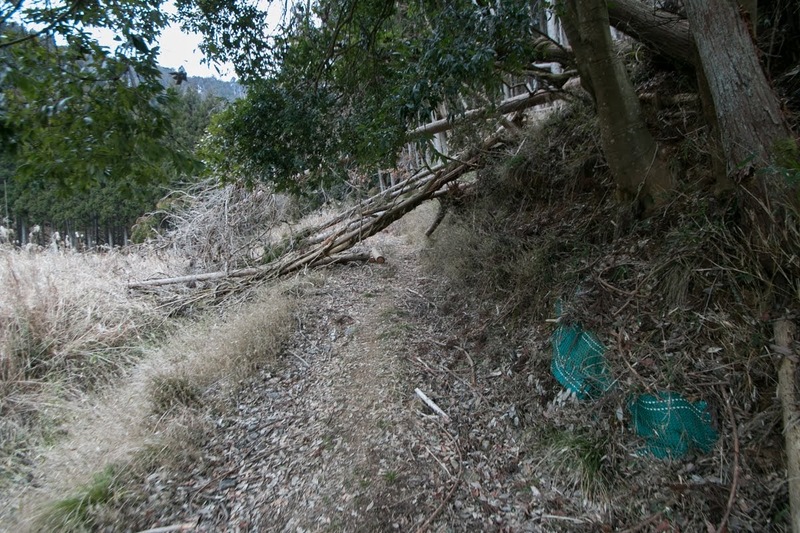 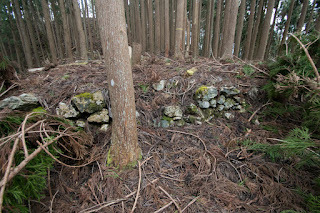 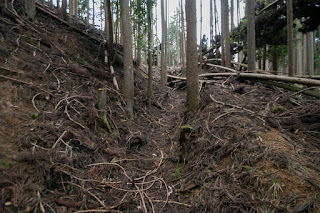 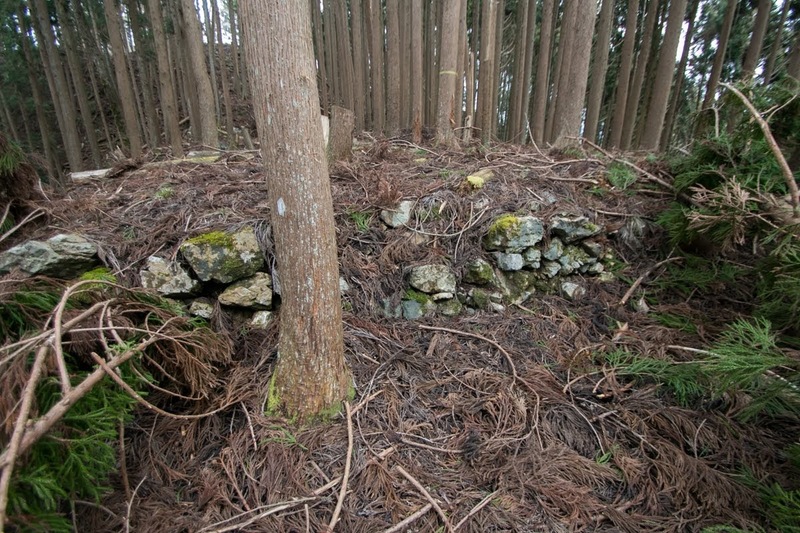 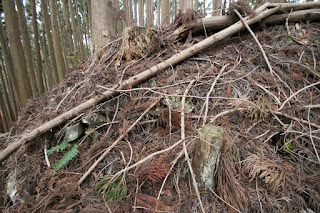 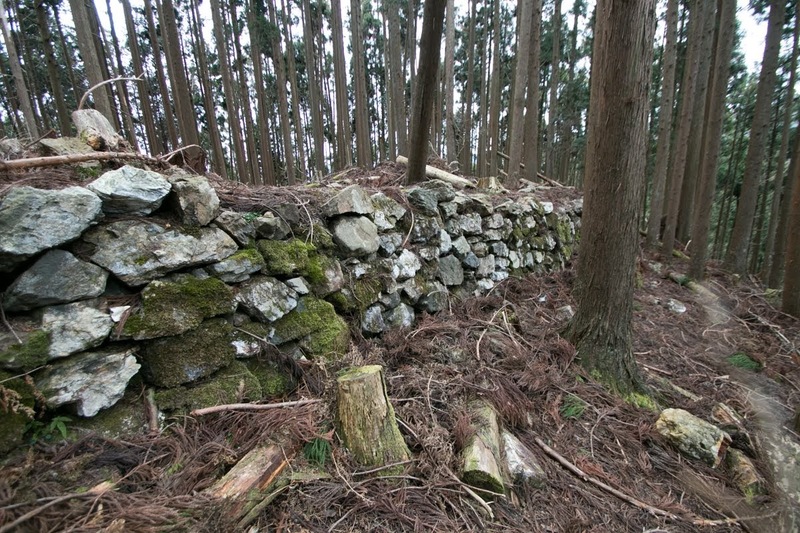 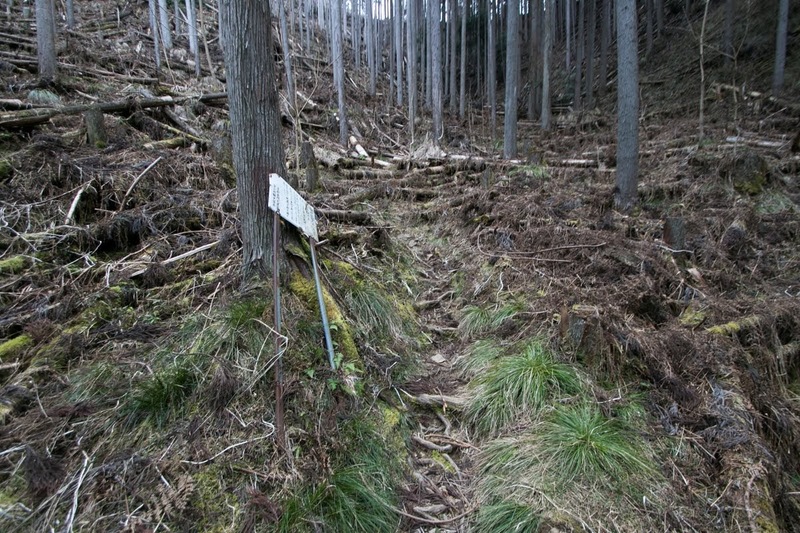 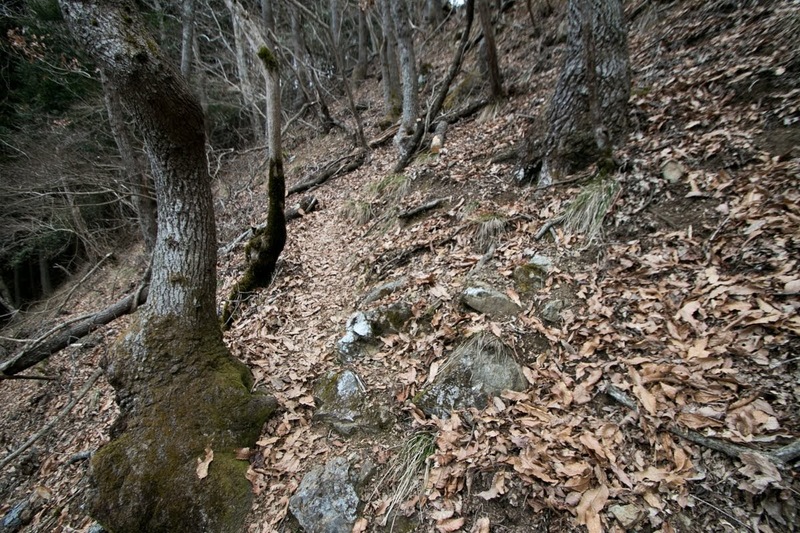 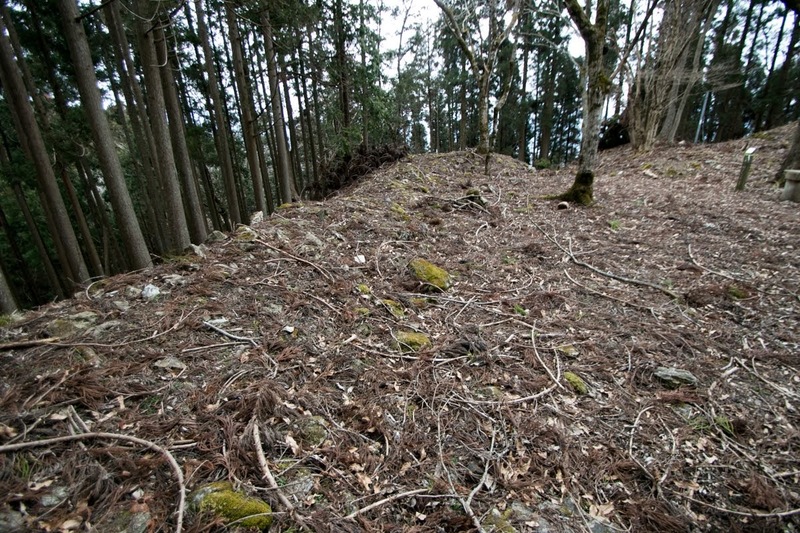 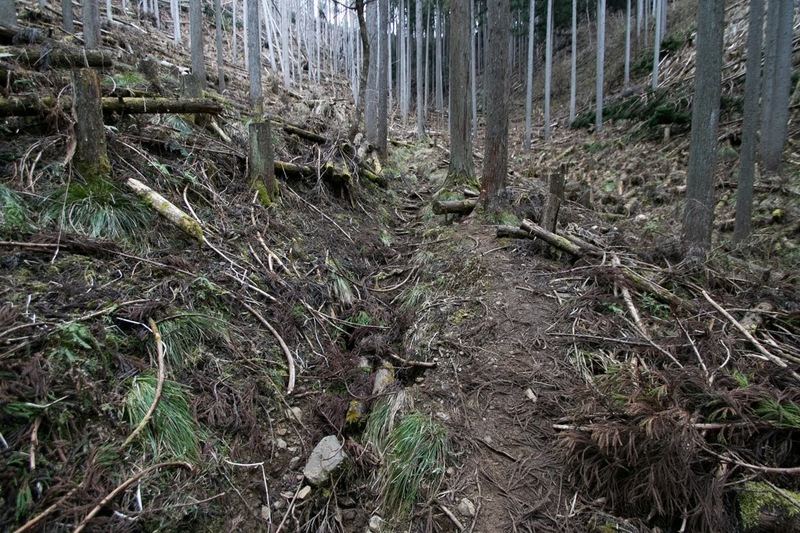 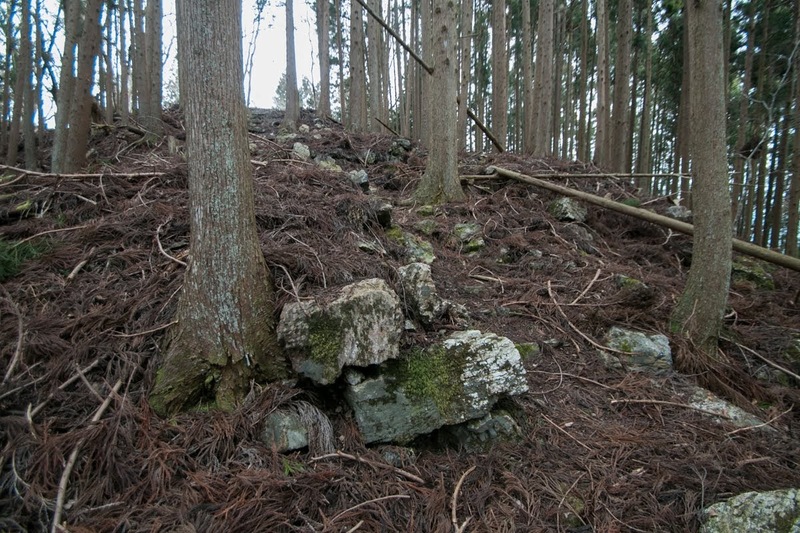 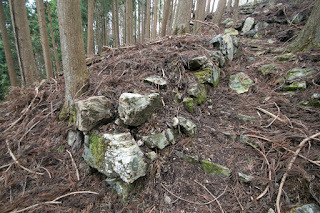 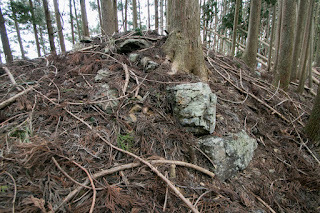 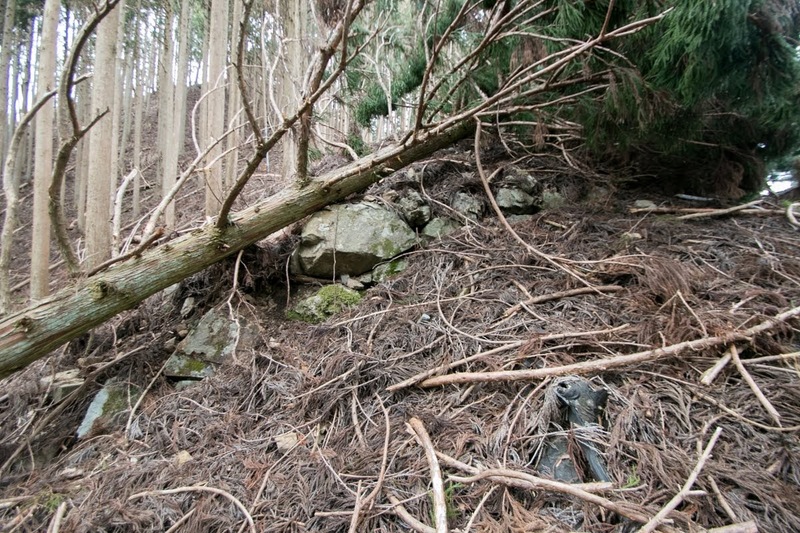 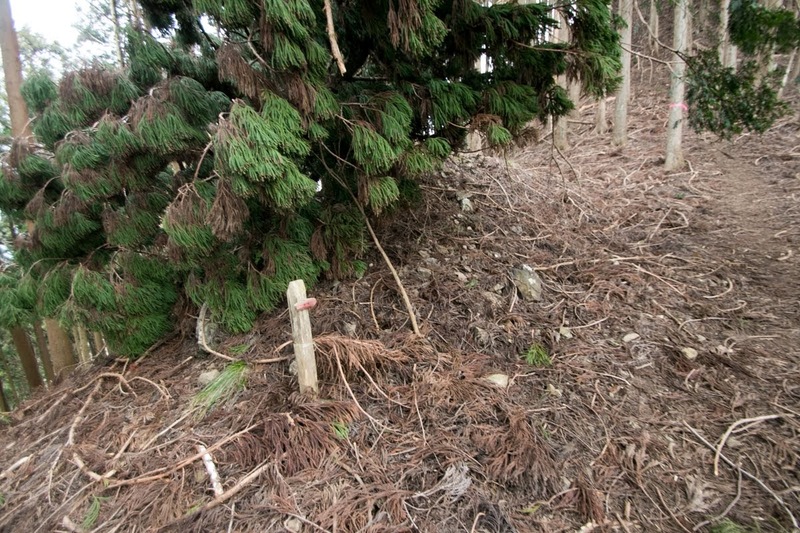 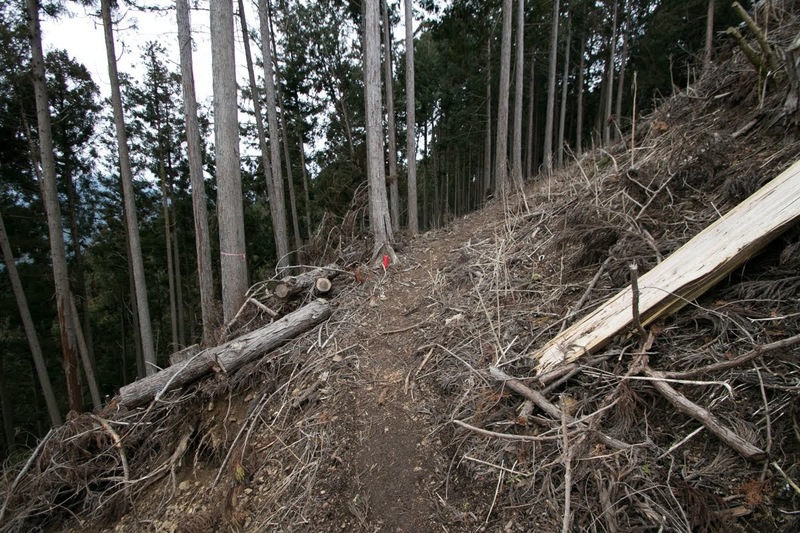 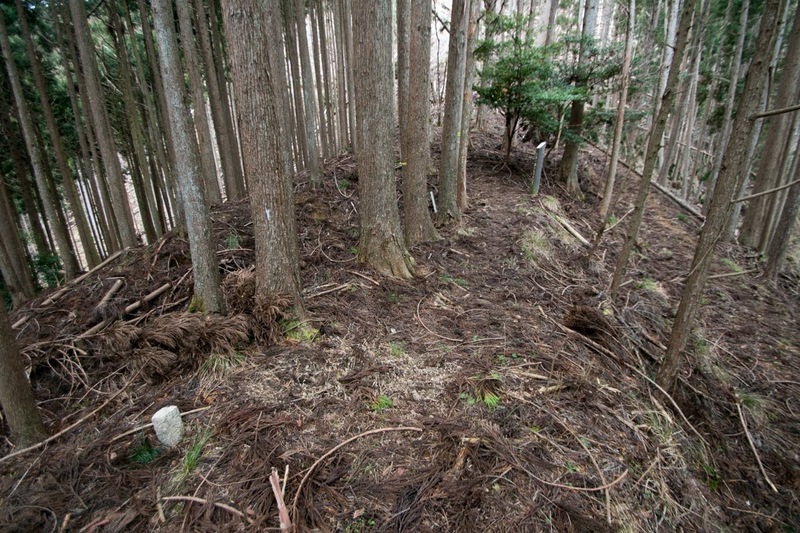 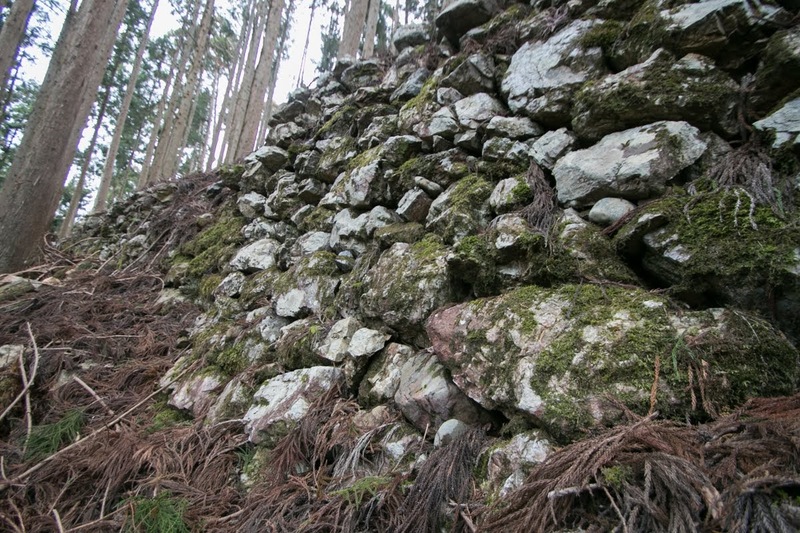 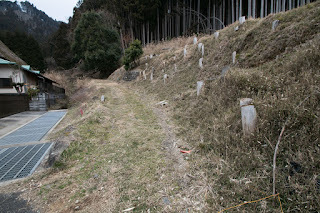 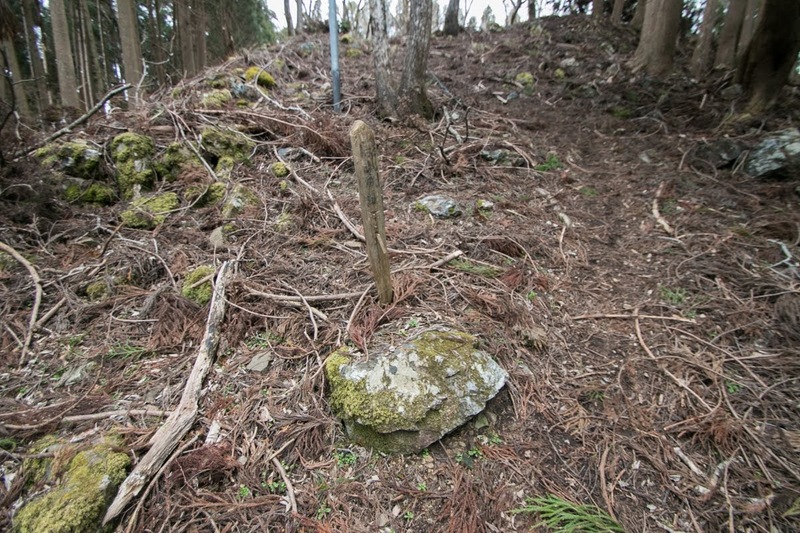 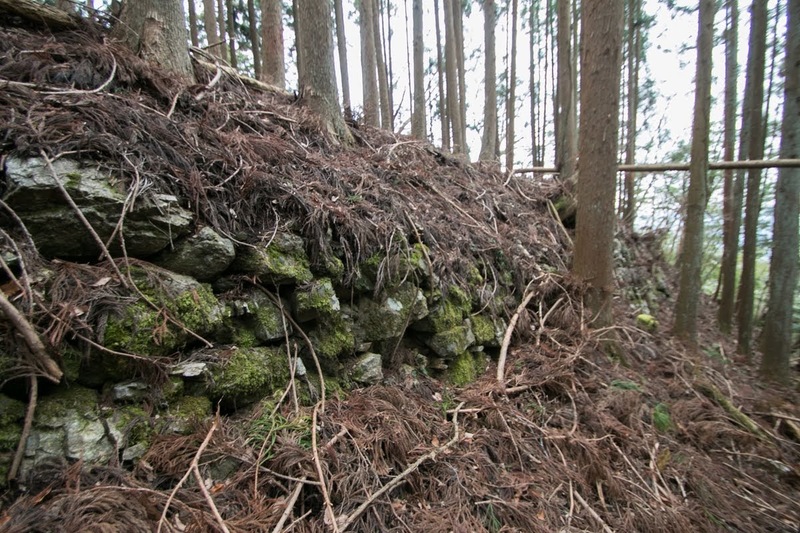 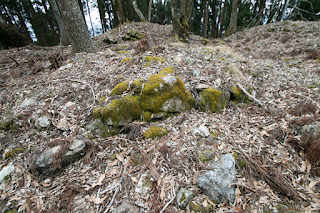 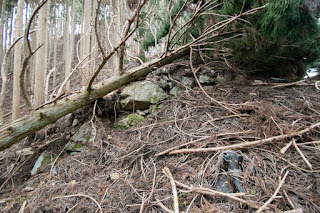 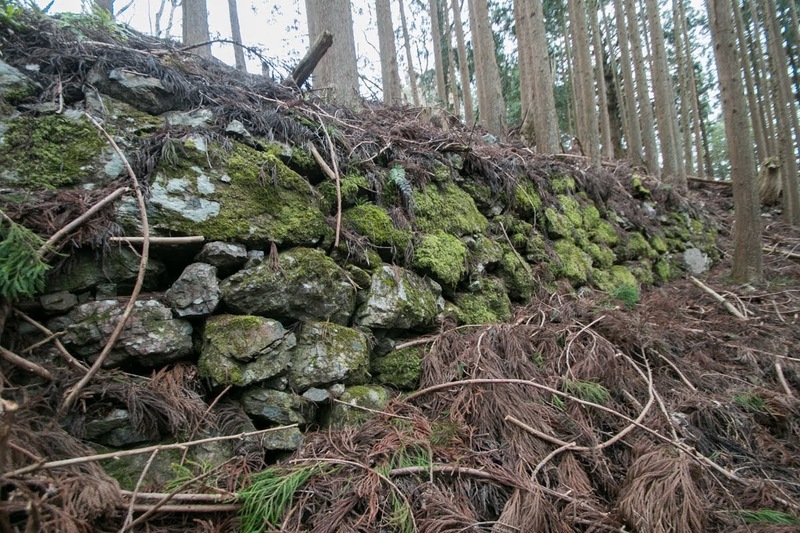 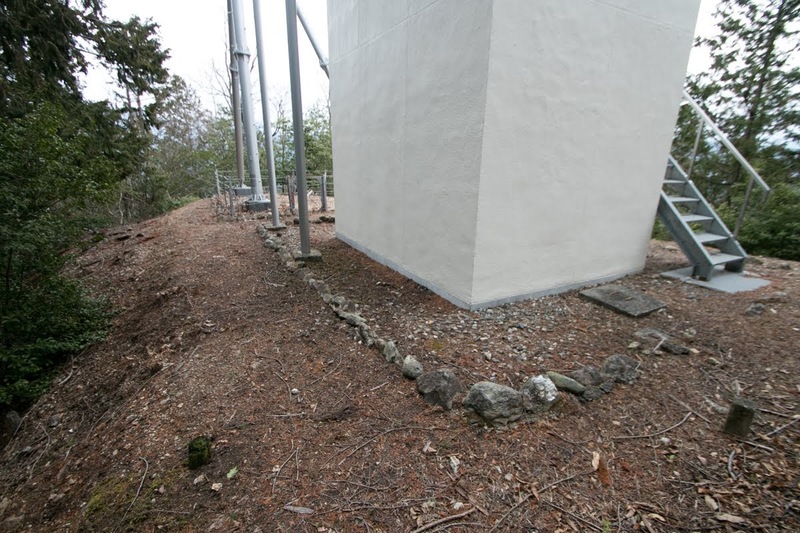 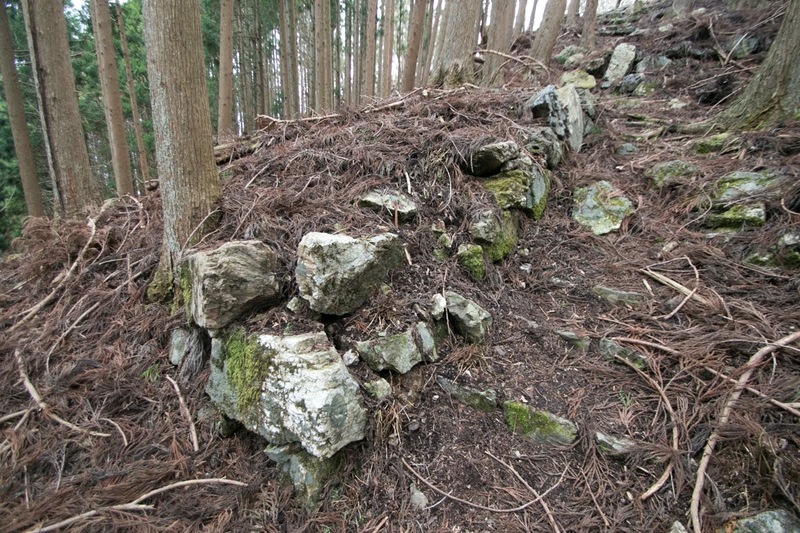 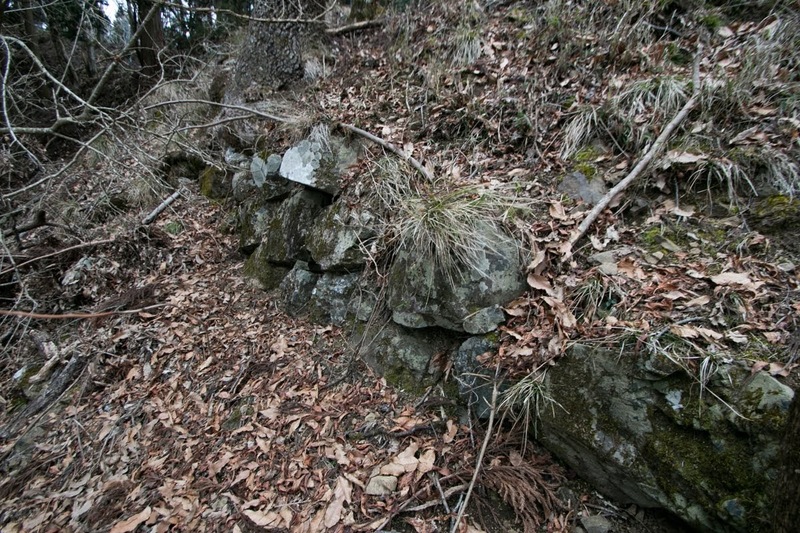 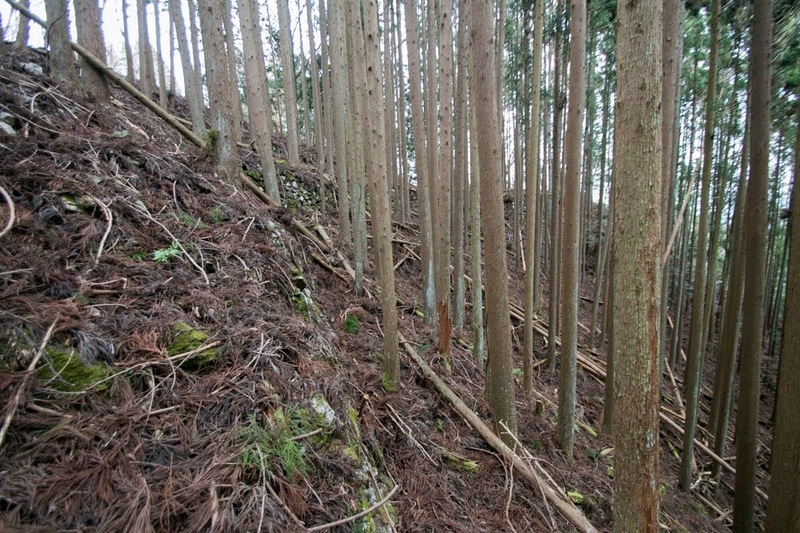 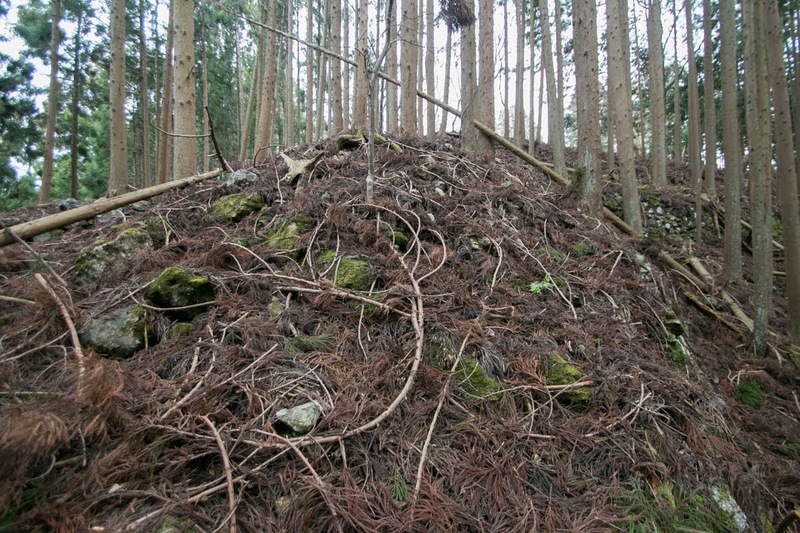 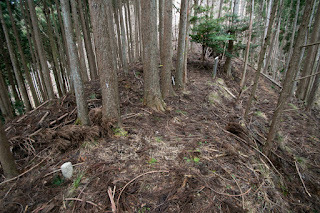 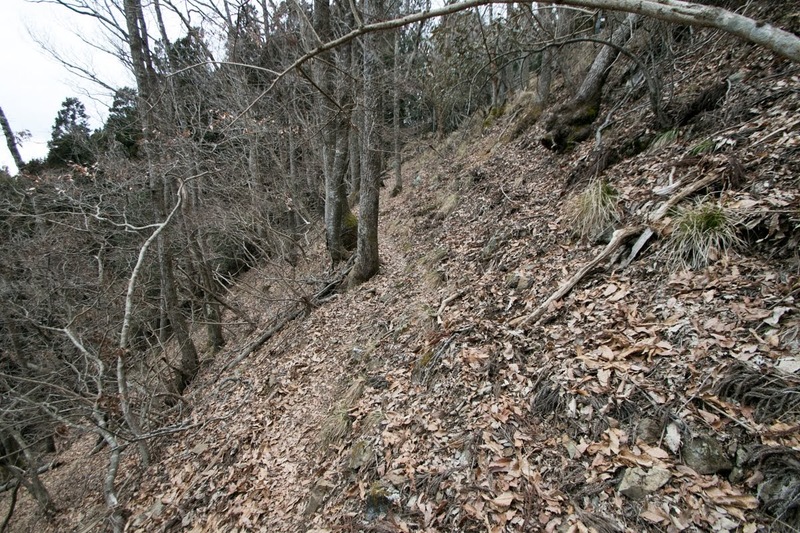 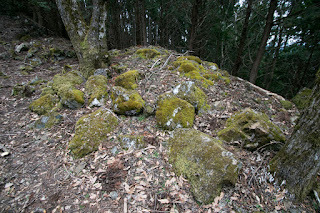 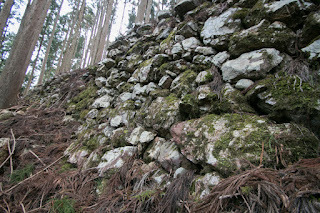 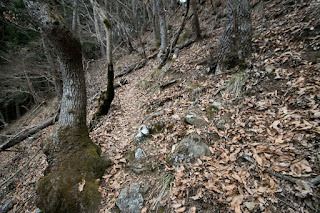 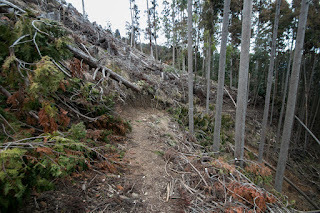 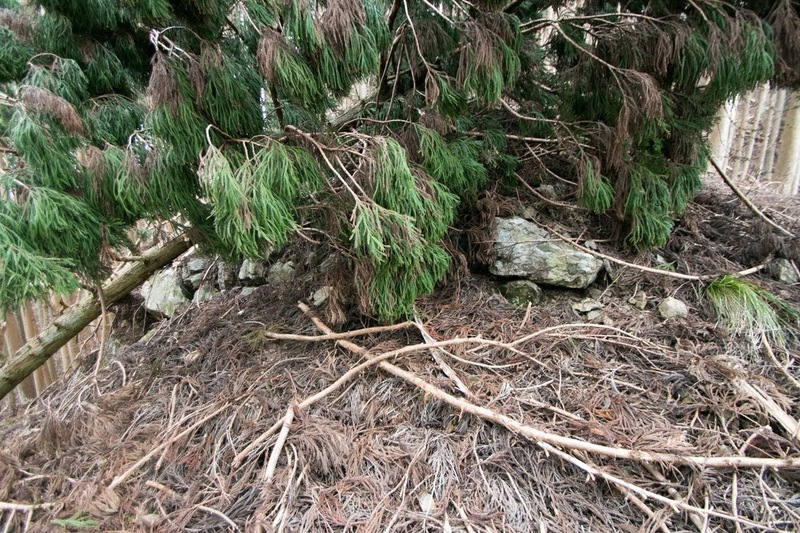 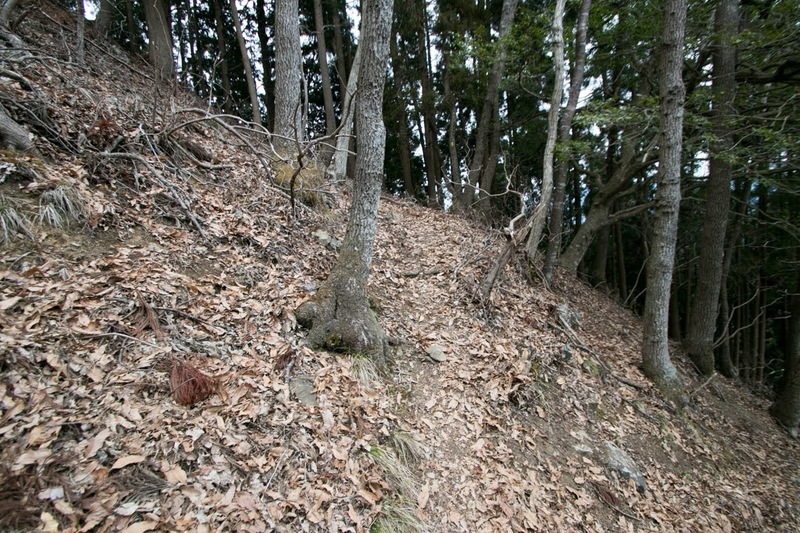 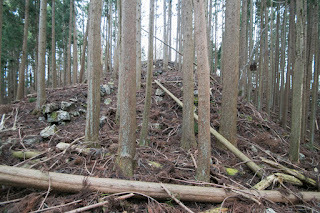 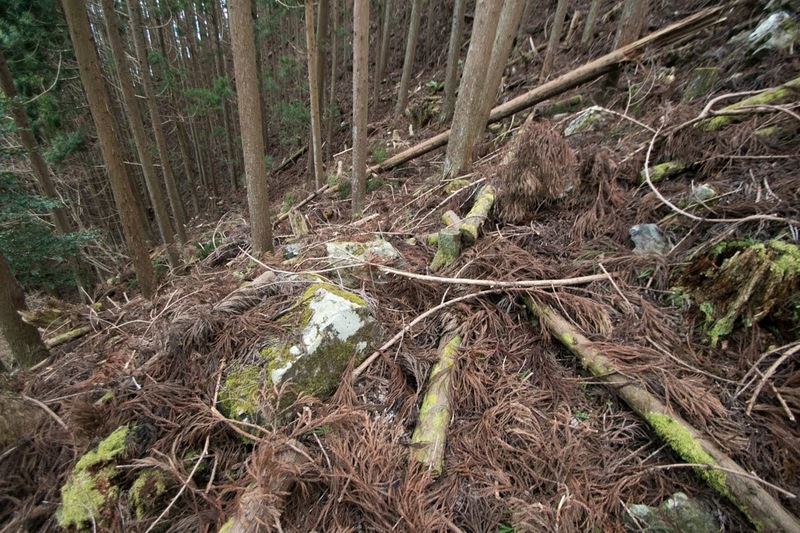 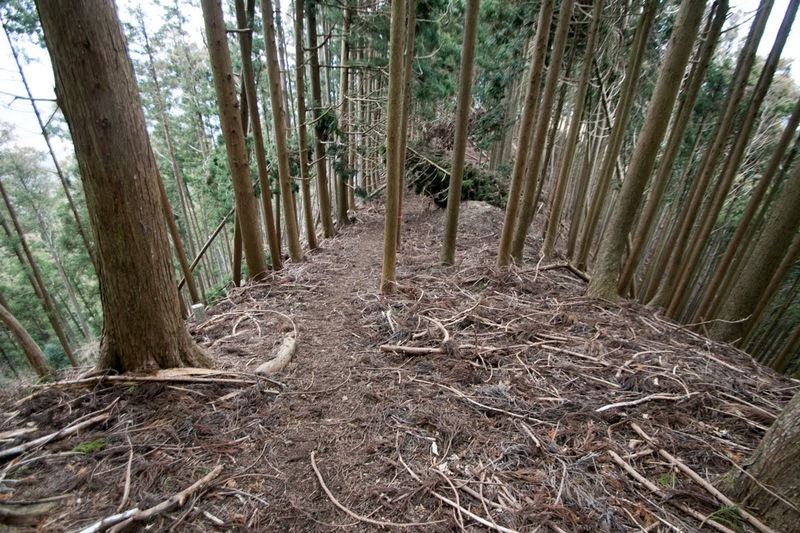 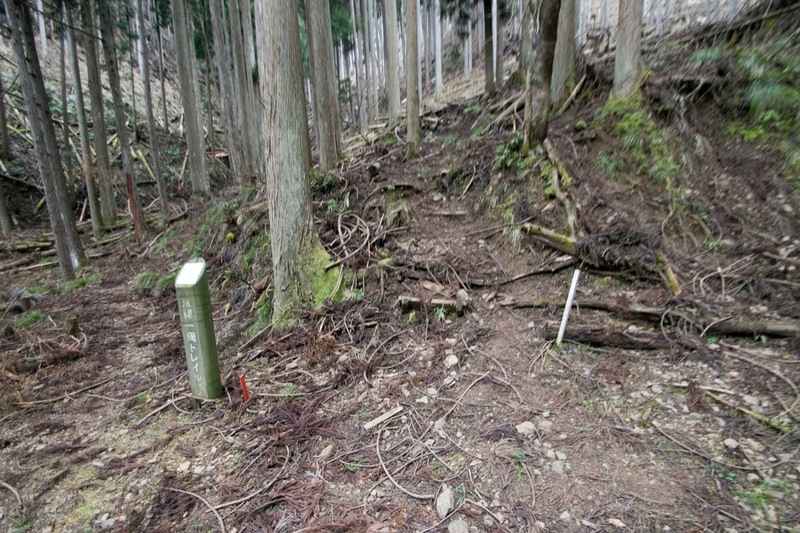 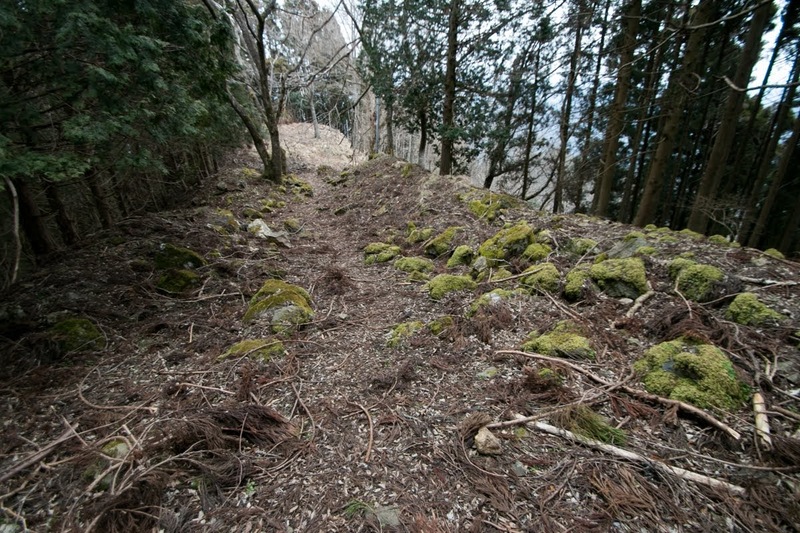 Three connecting areas are about 100 meter length and have stone walls at its side and edge, and roads from hillside connect to each area. 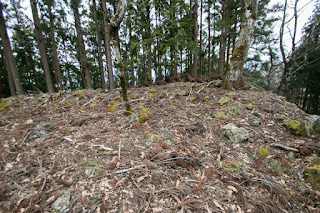 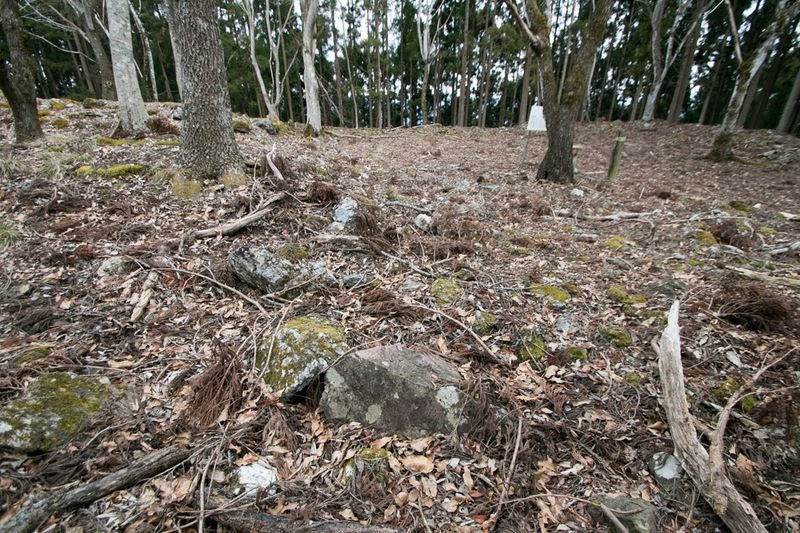 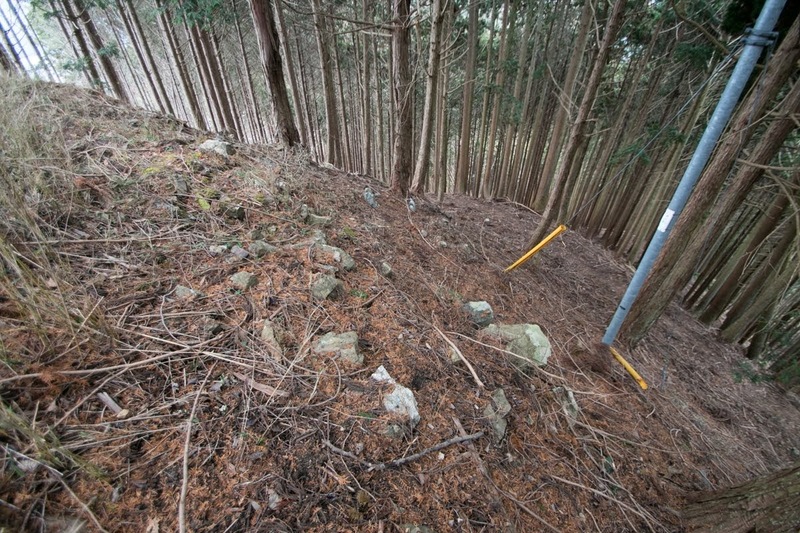 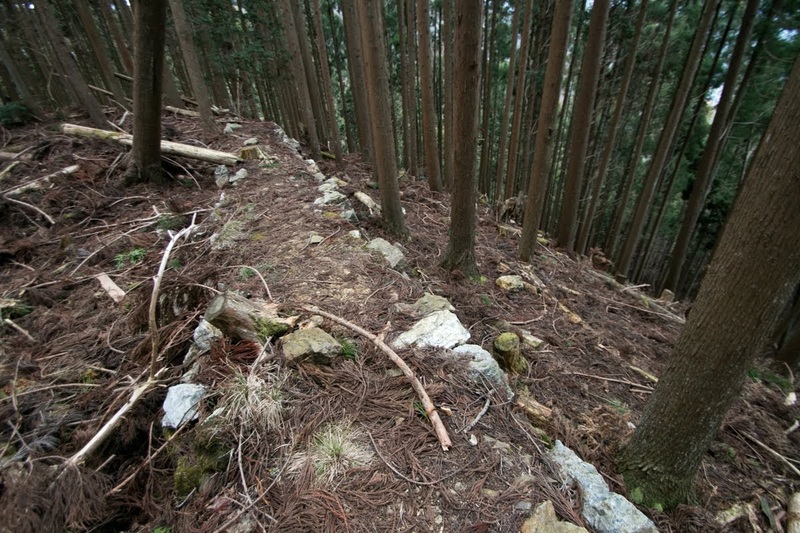 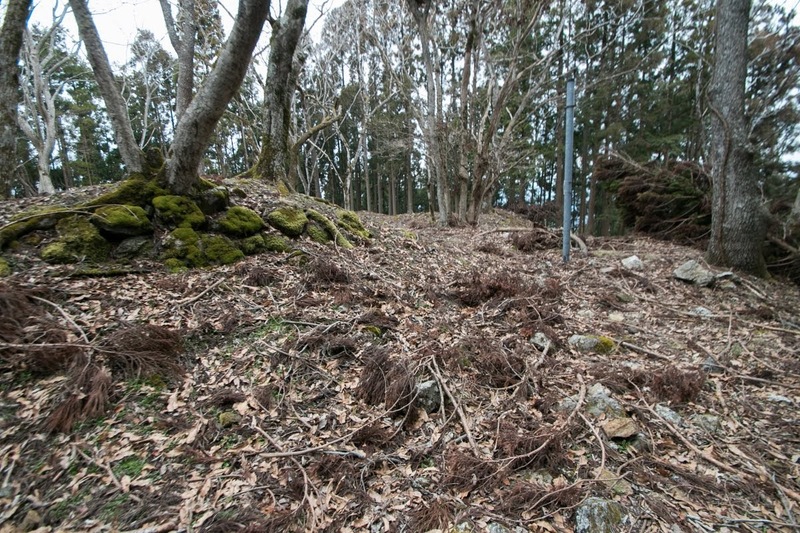 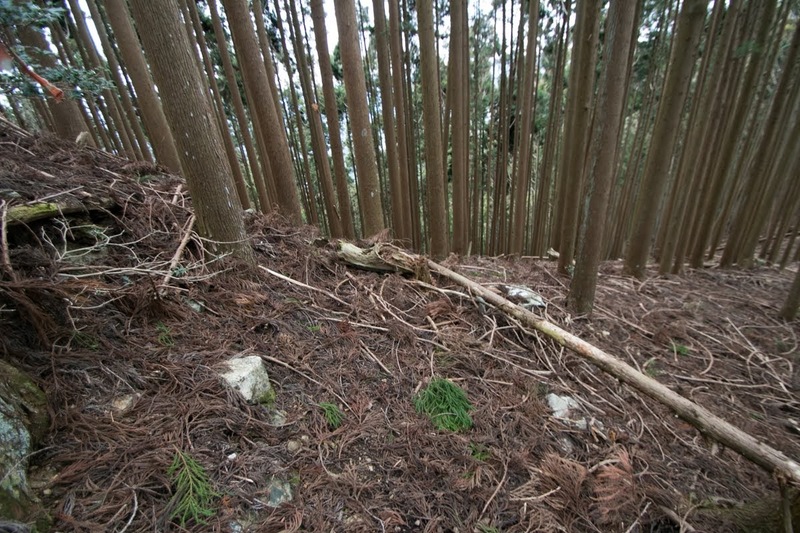 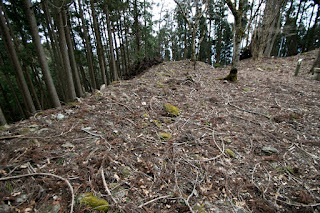 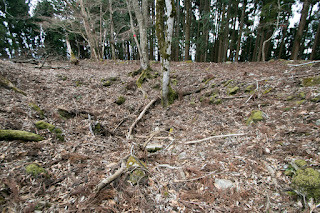 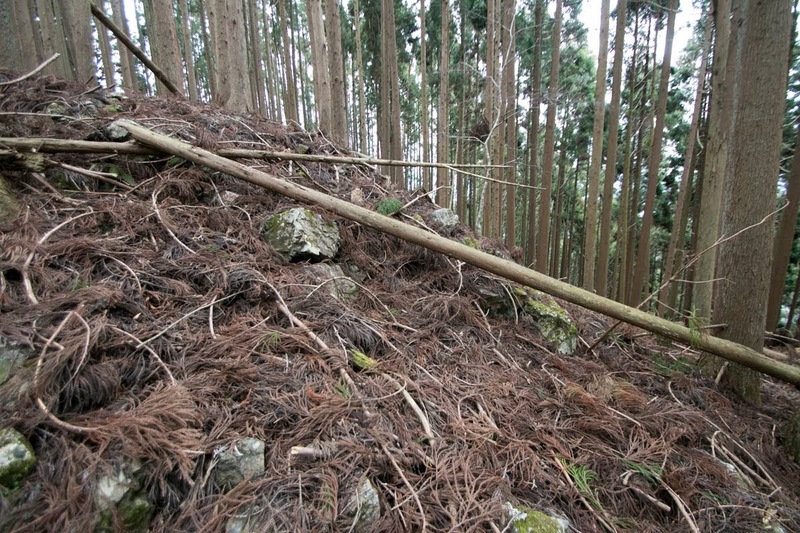 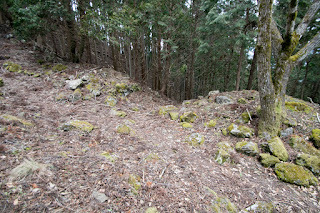 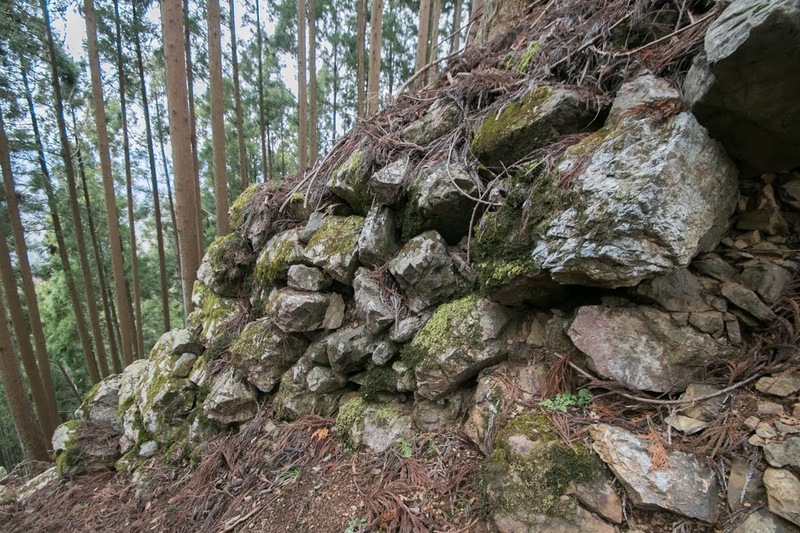 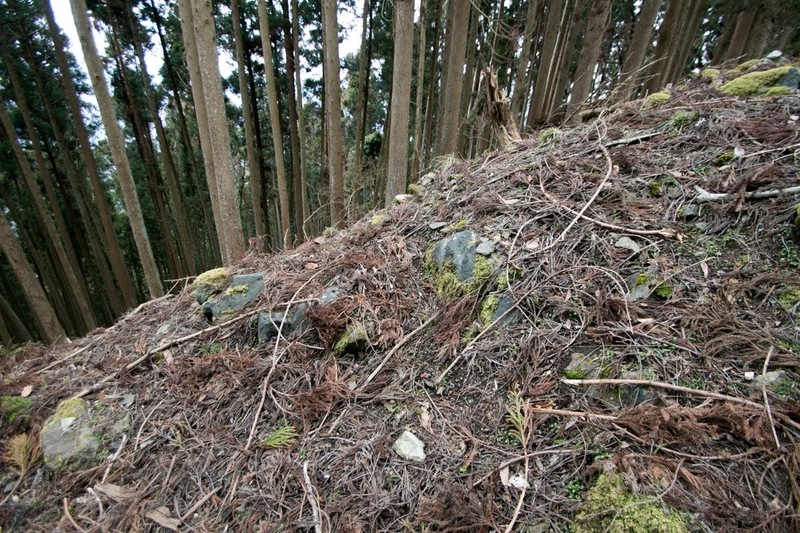 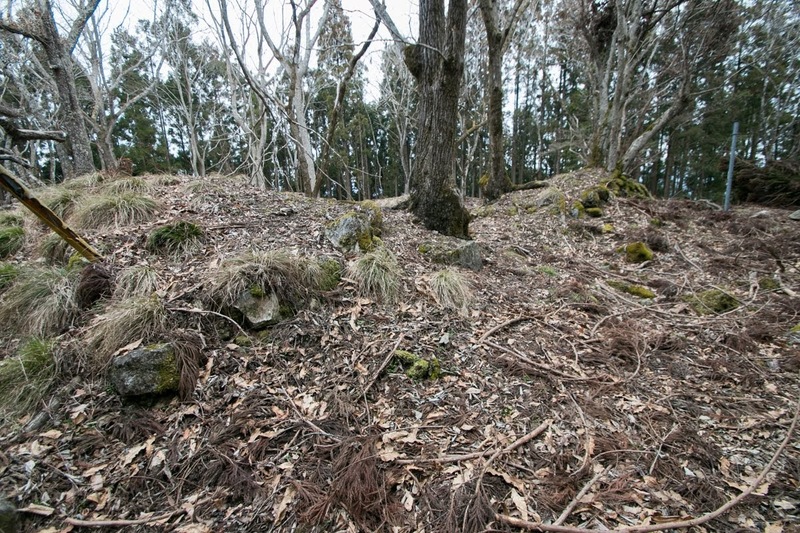 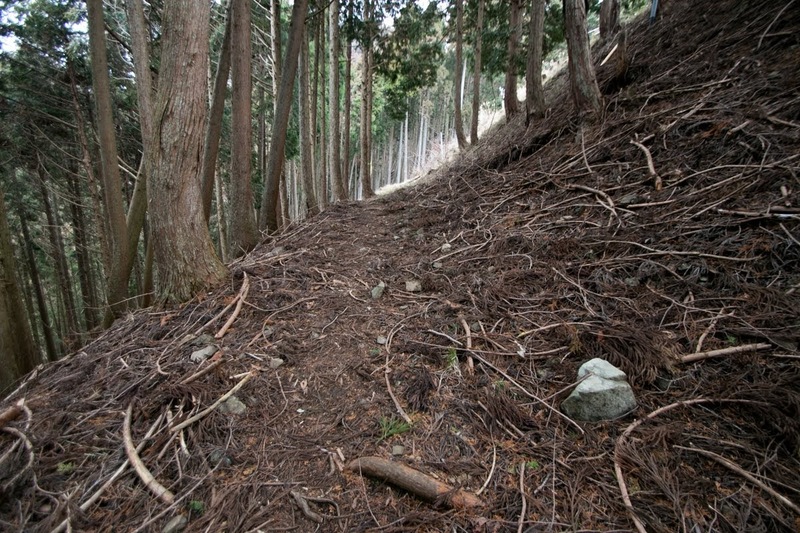 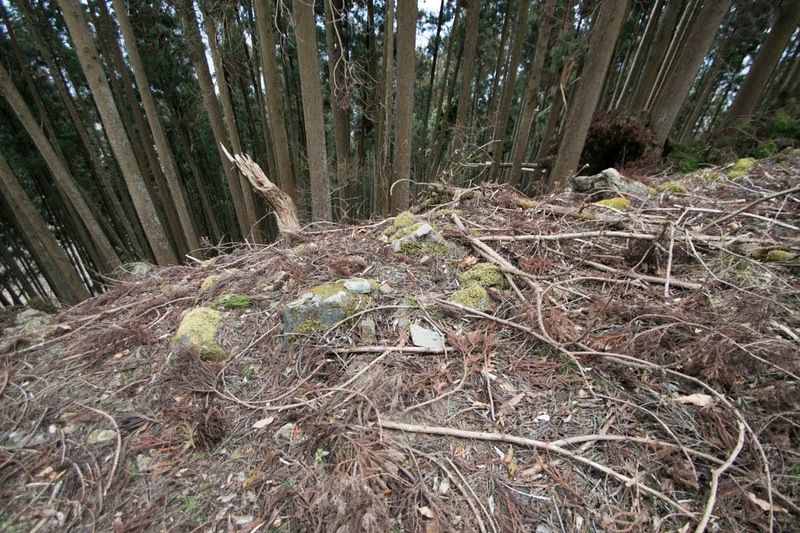 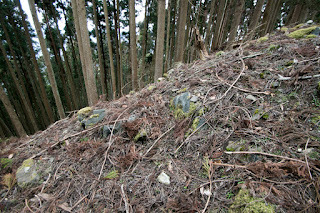 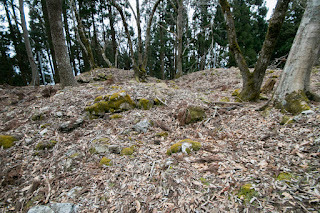 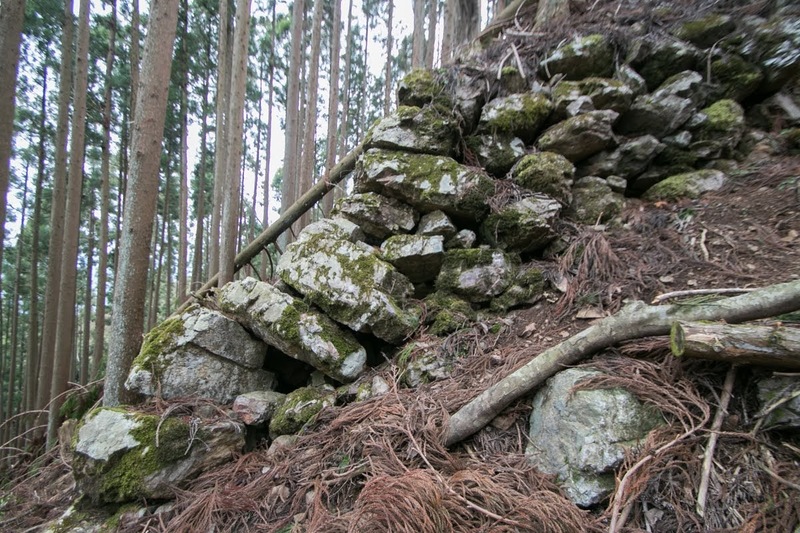 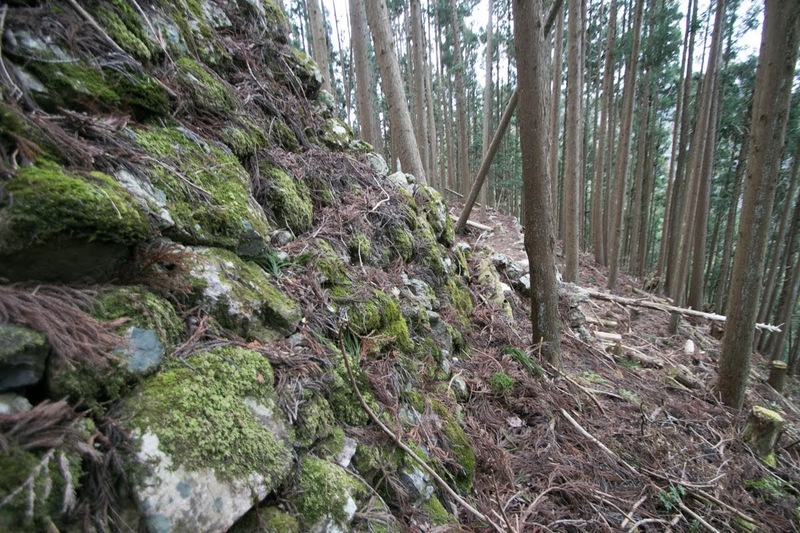 Eastern slope from central area is a main route from hillside town, and about 100 meter long slope was decorated by two lines of magnificent stone walls. 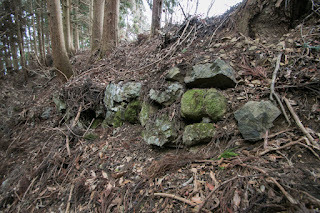 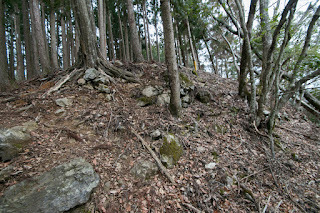 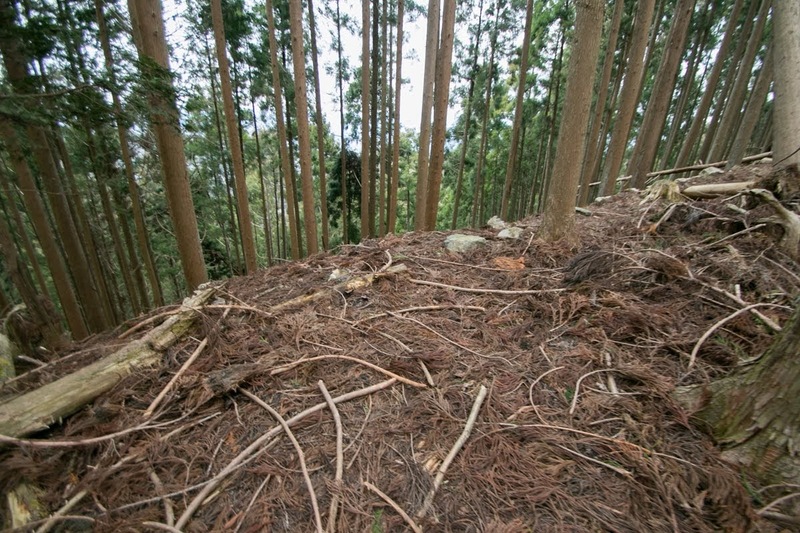 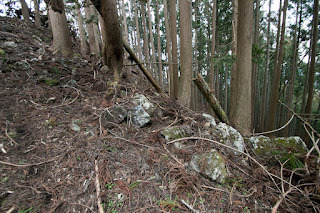 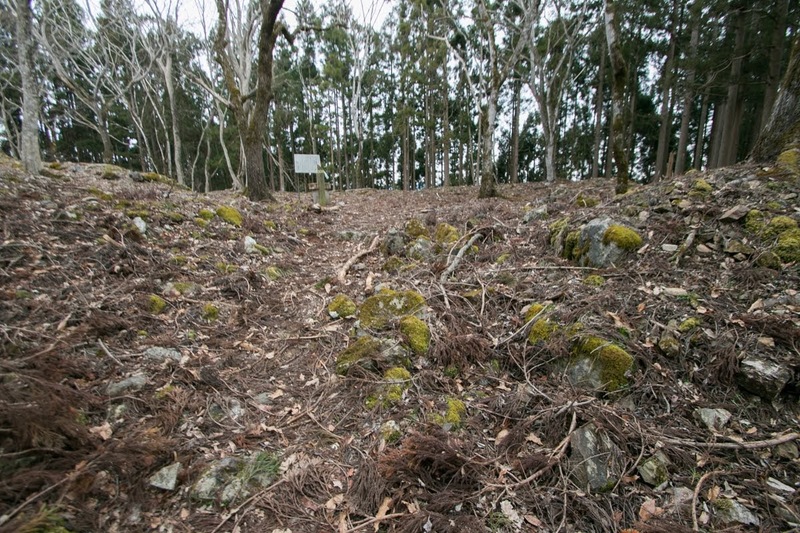 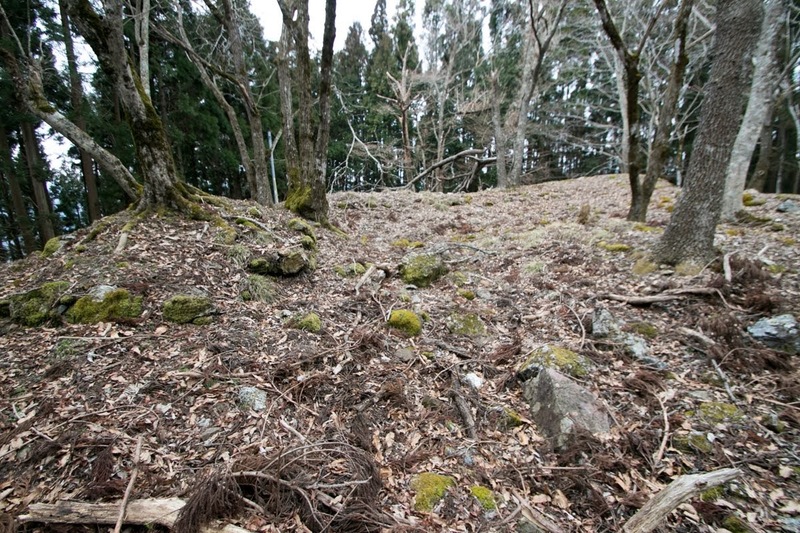 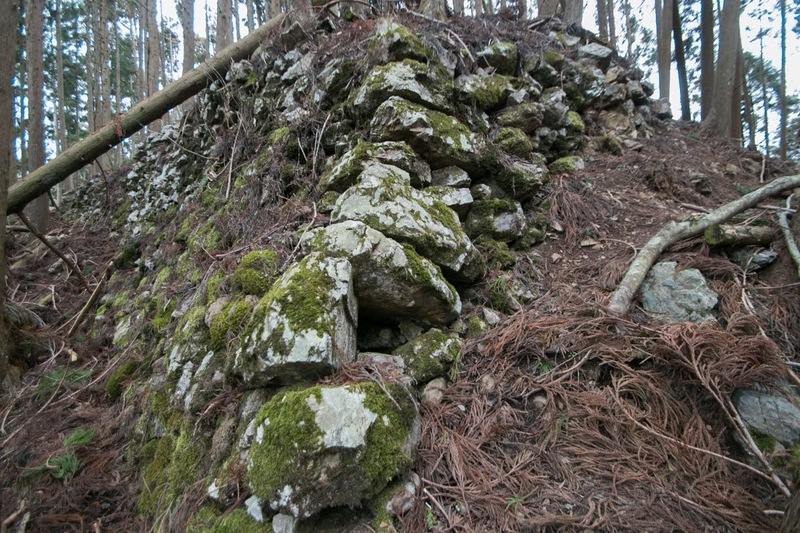 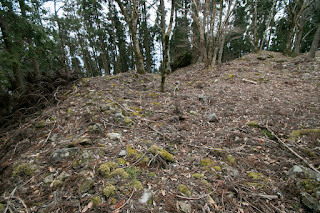 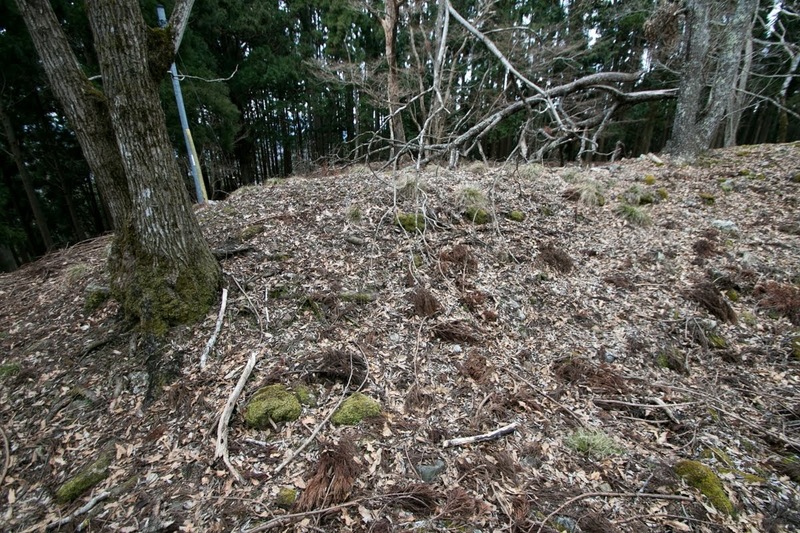 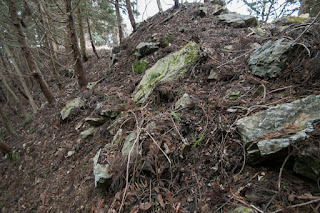 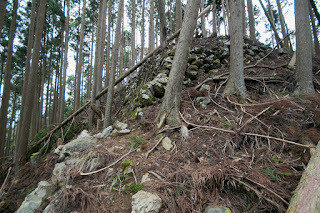 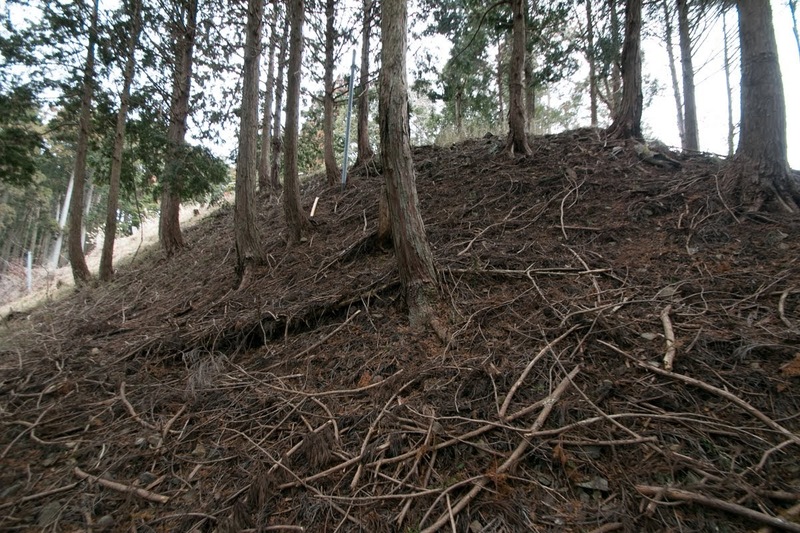 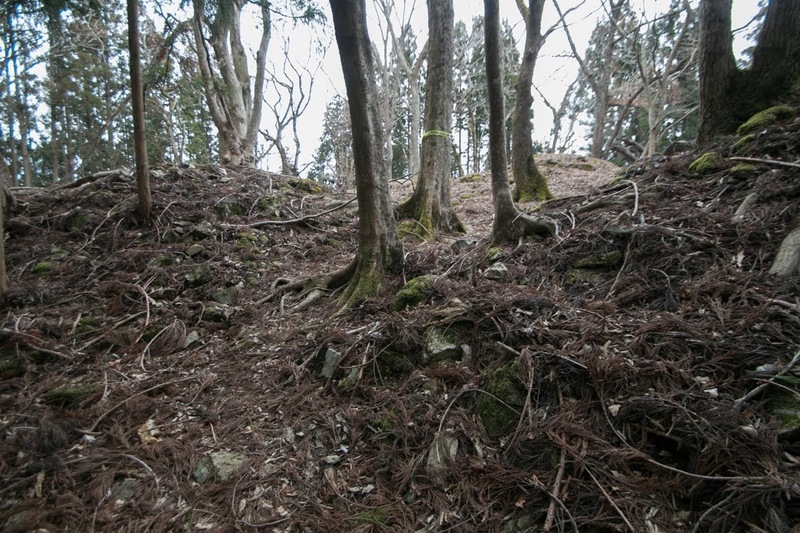 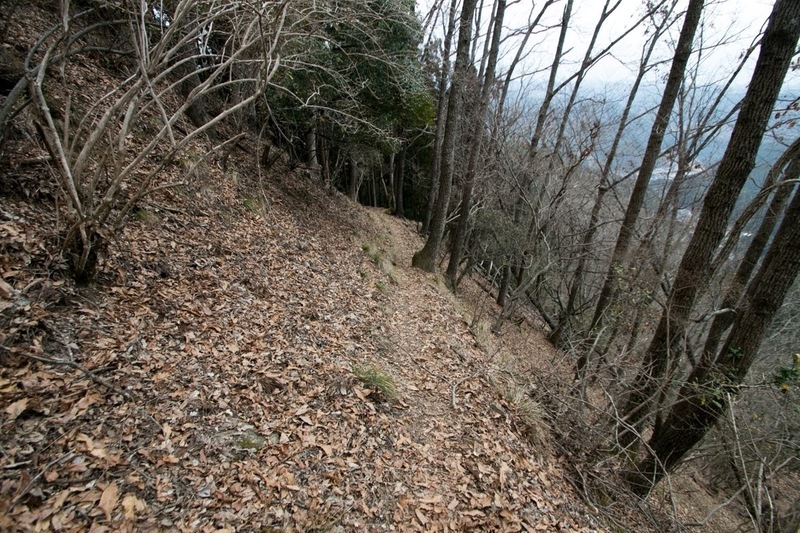 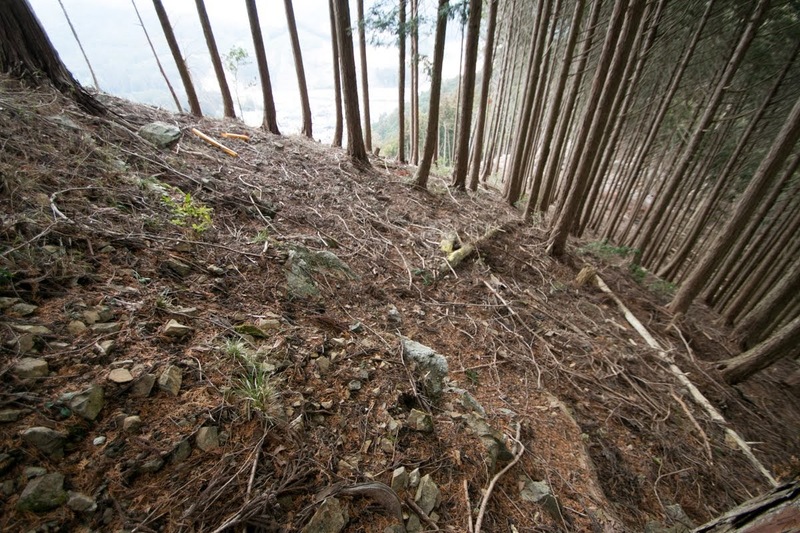 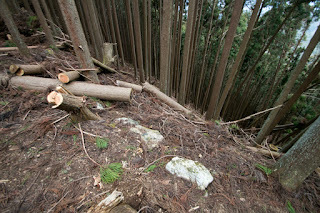 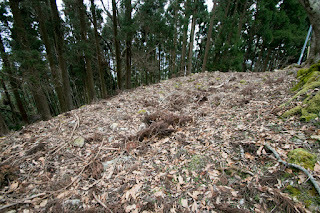 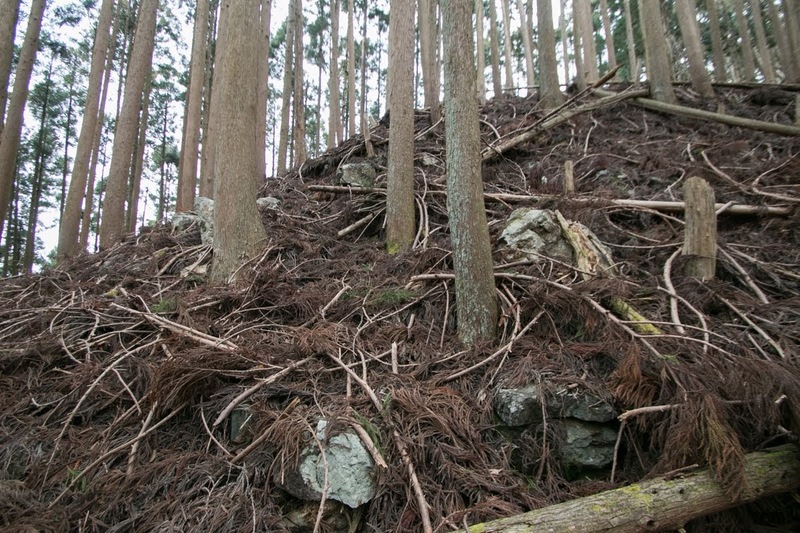 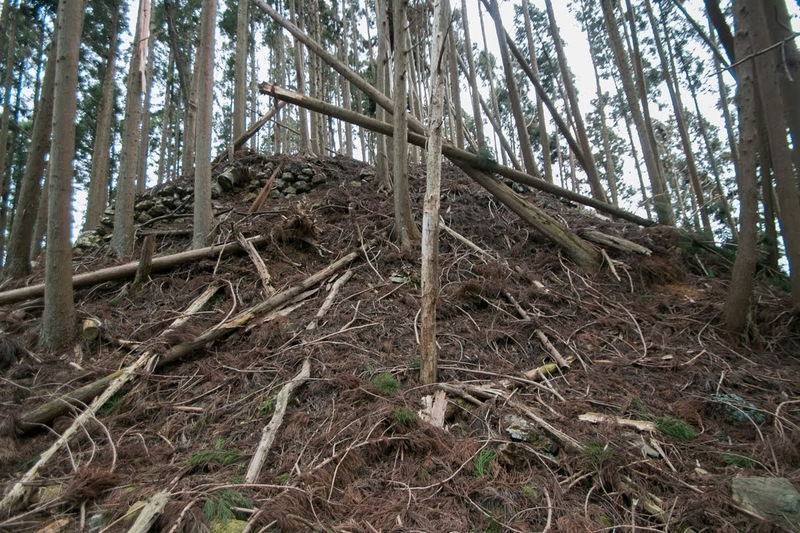 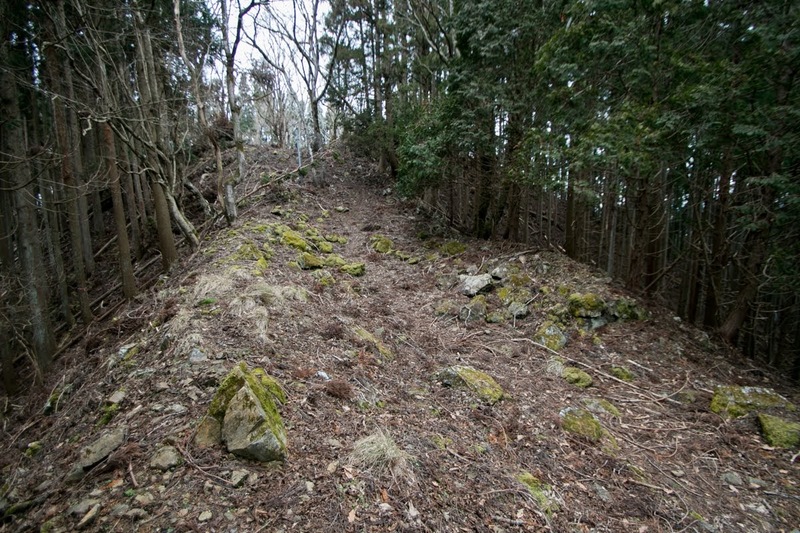 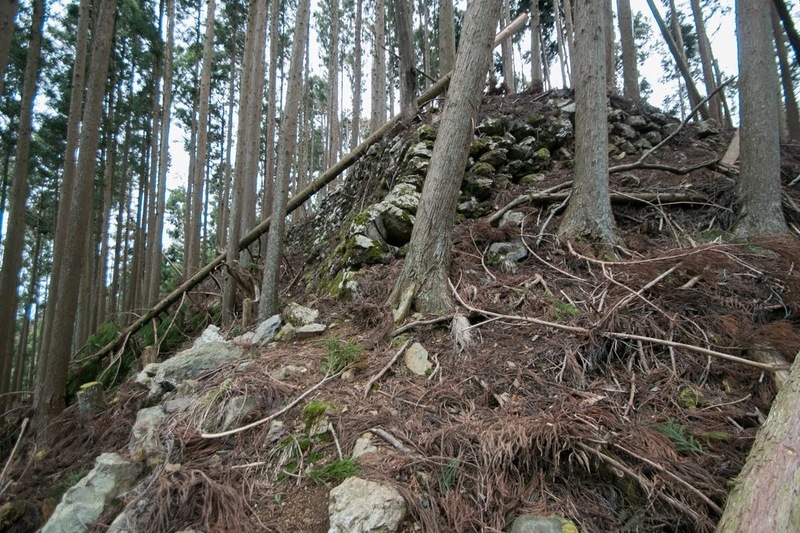 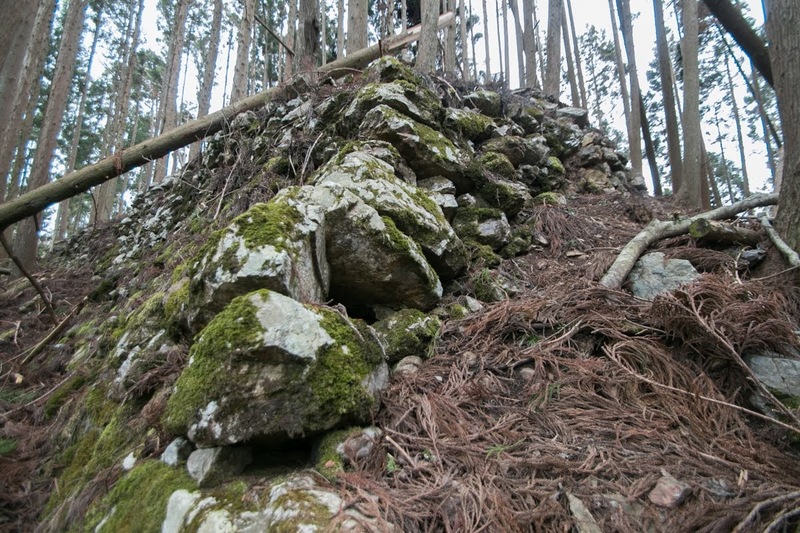 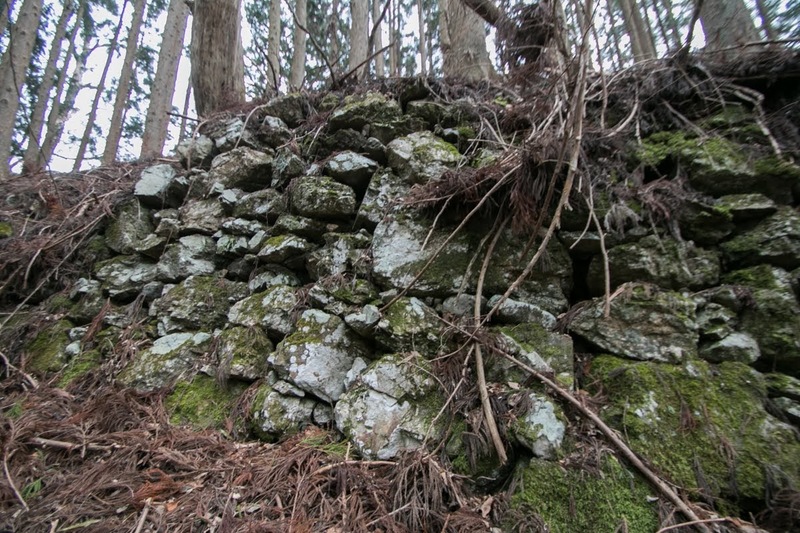 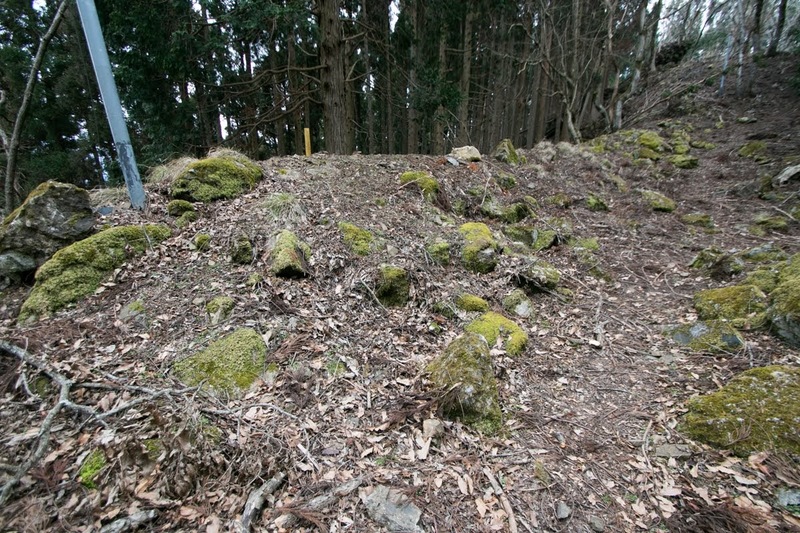 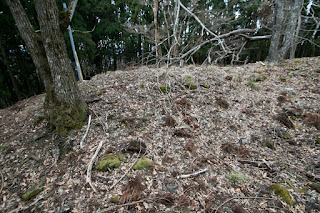 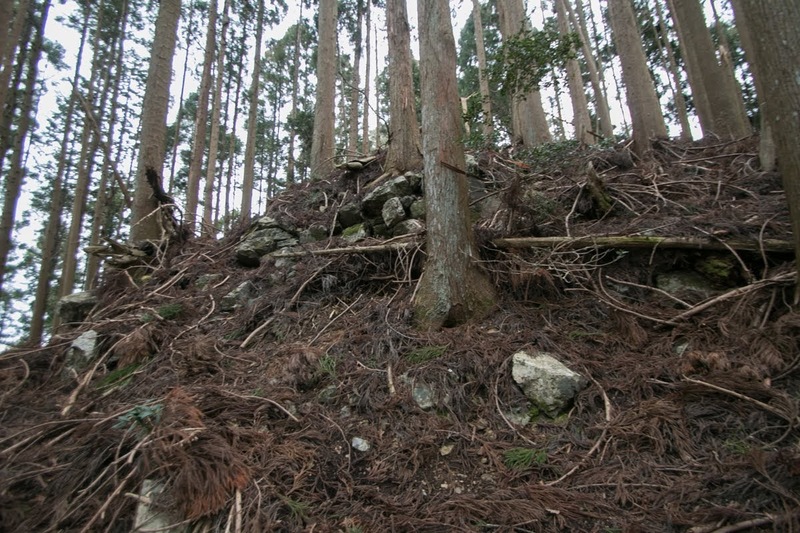 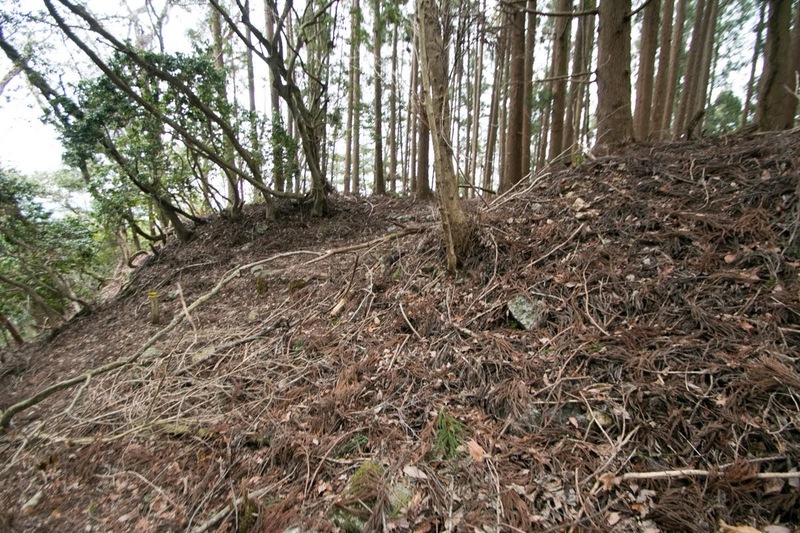 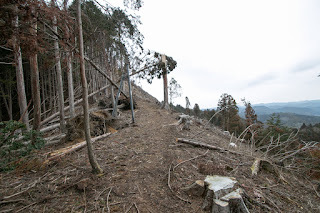 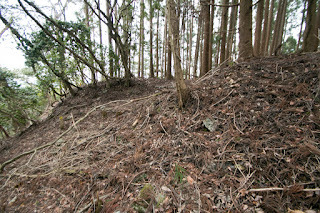 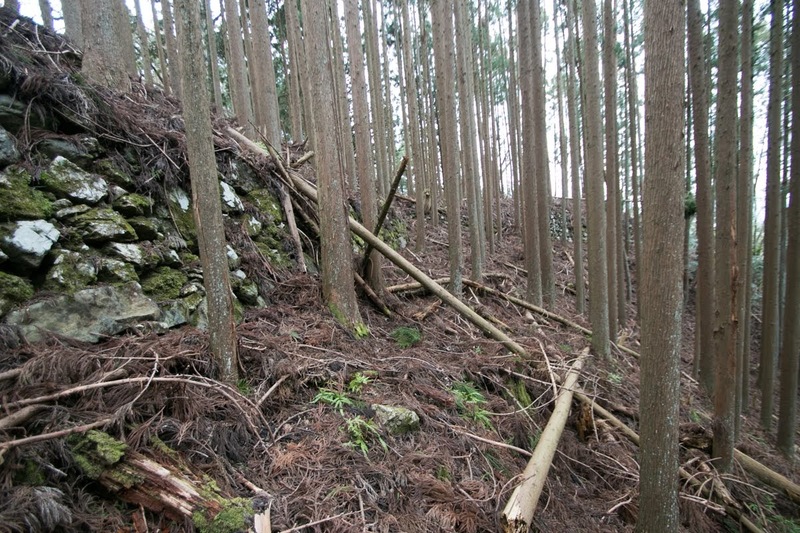 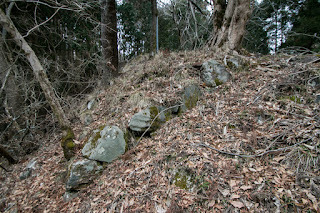 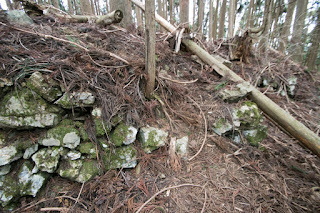 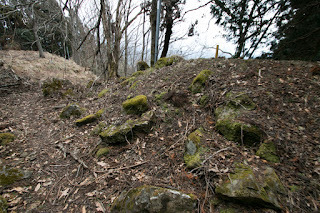 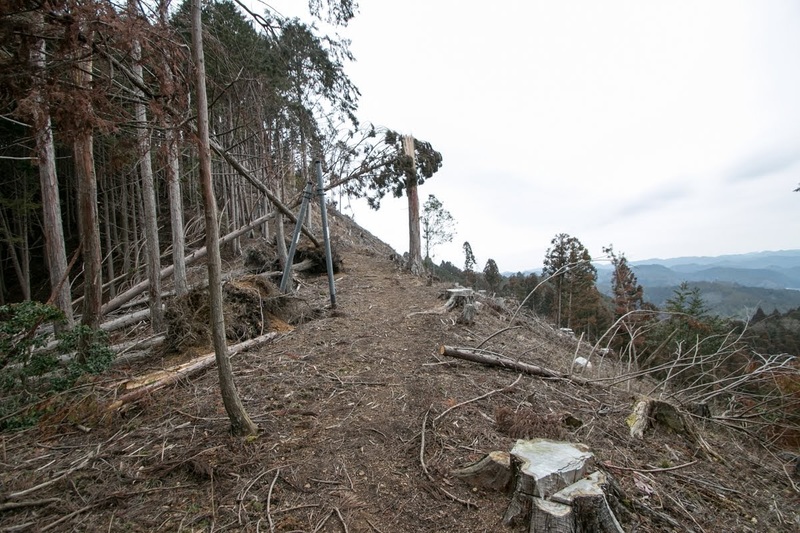 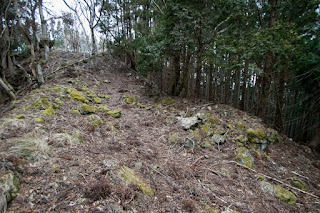 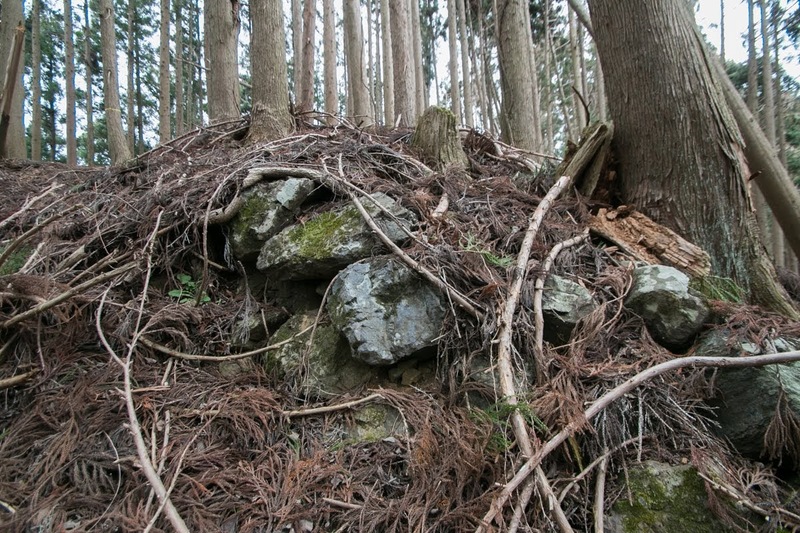 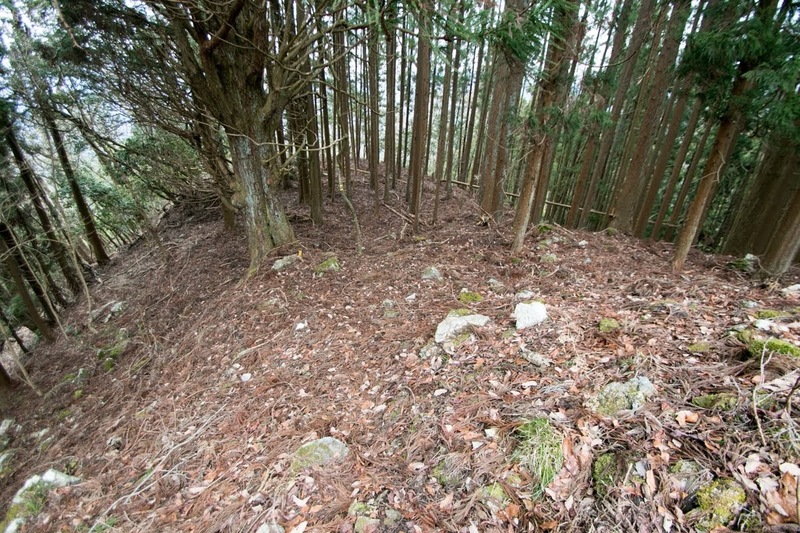 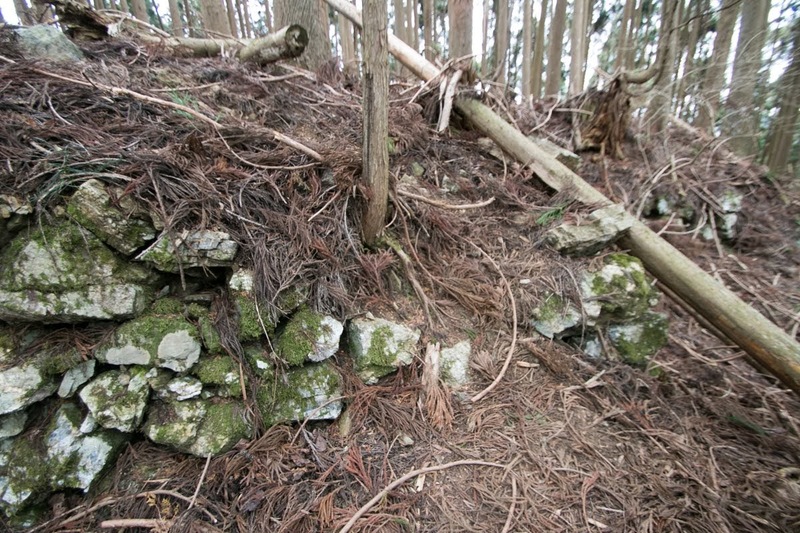 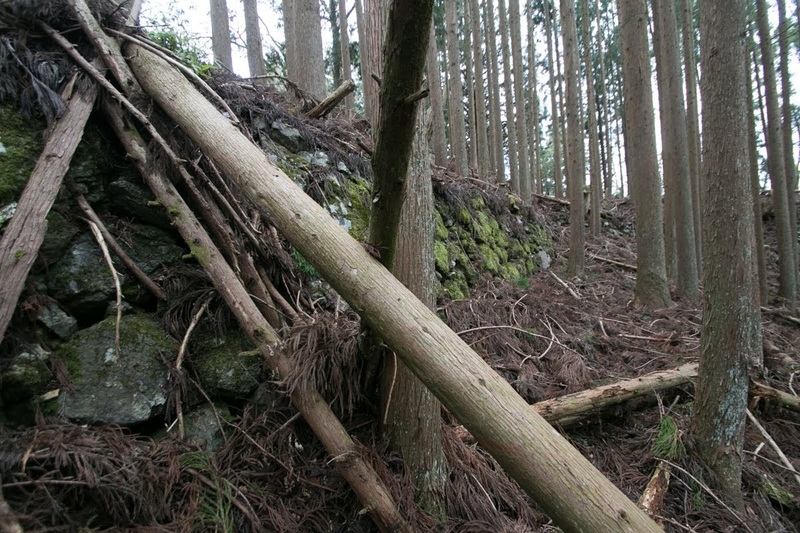 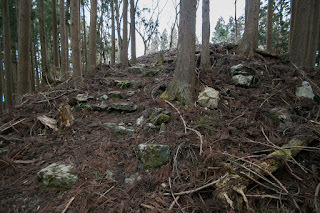 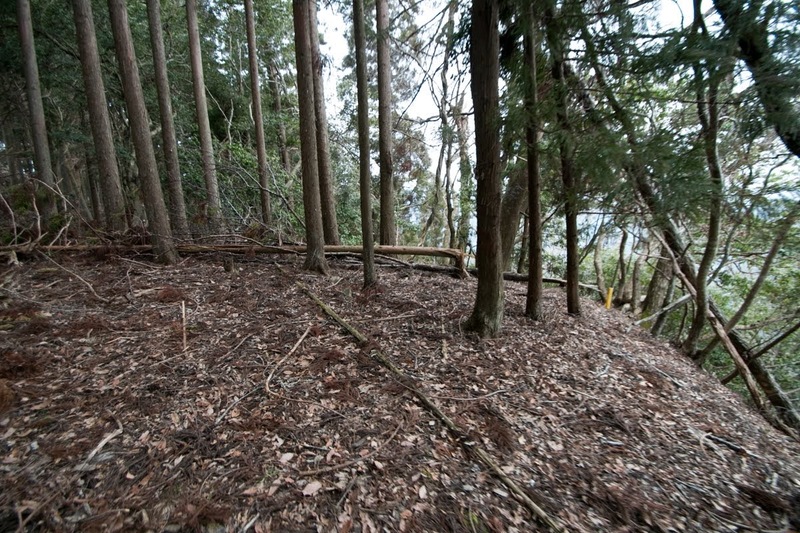 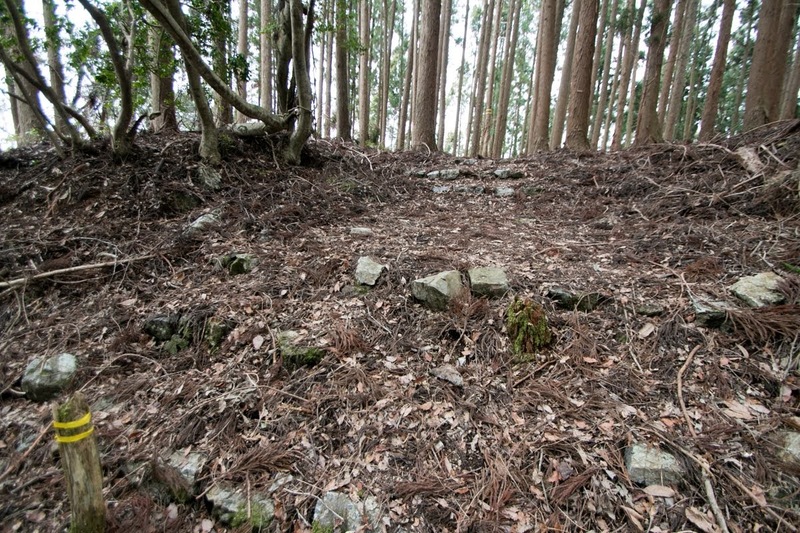 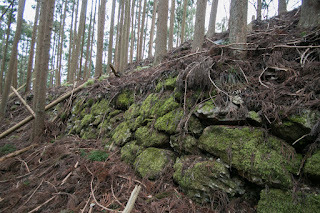 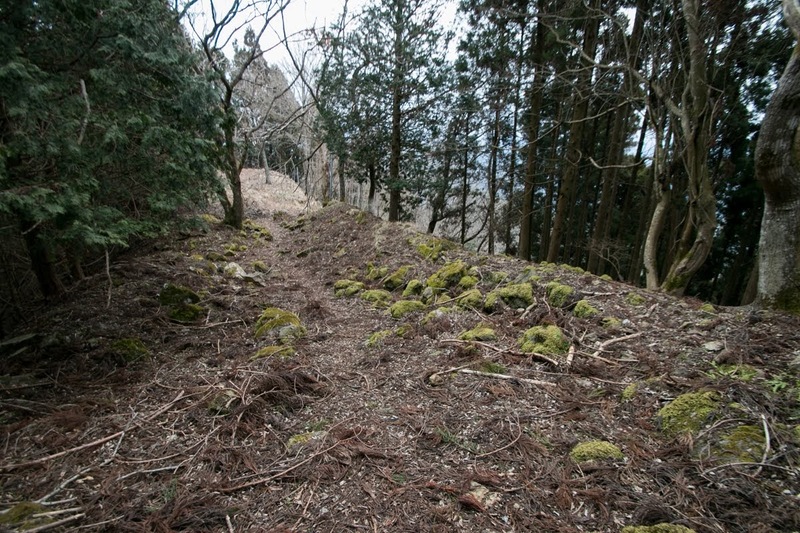 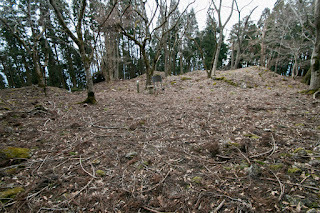 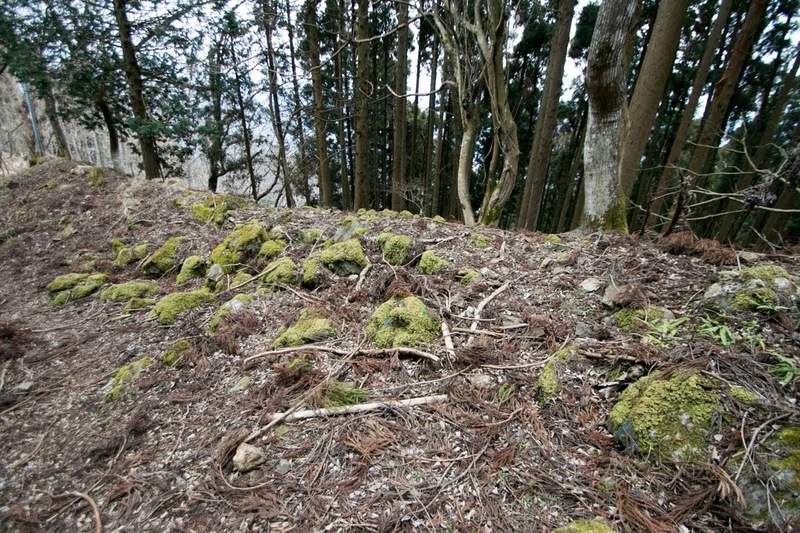 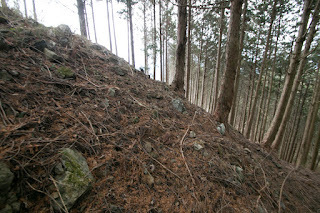 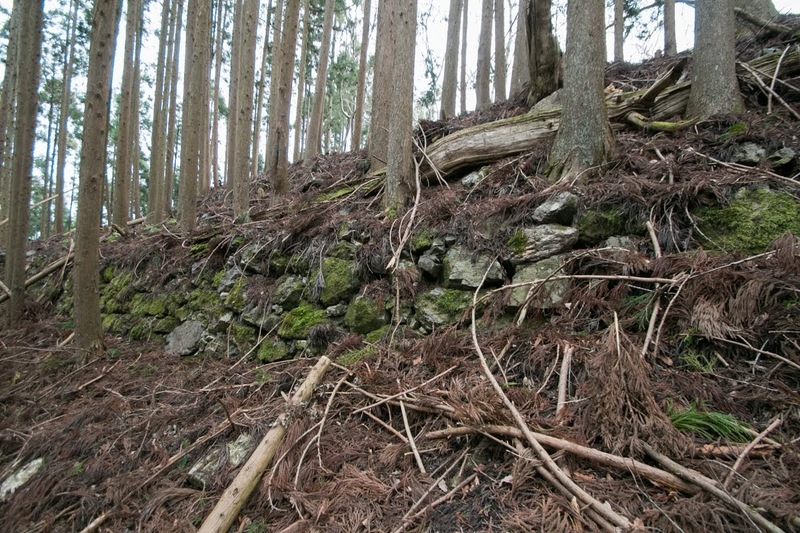 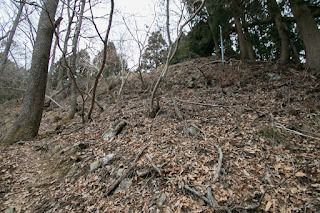 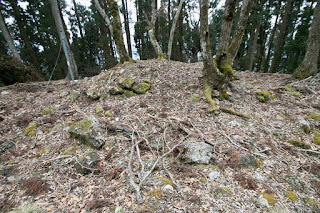 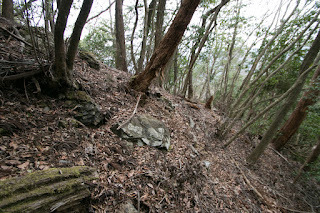 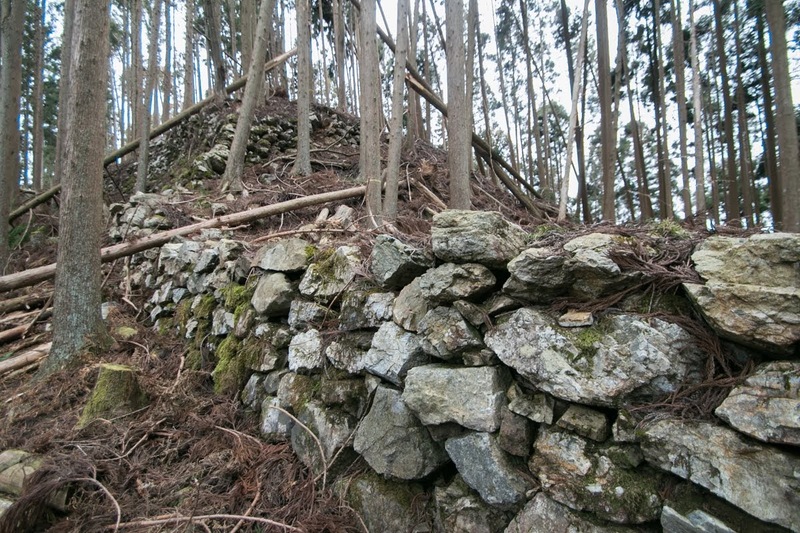 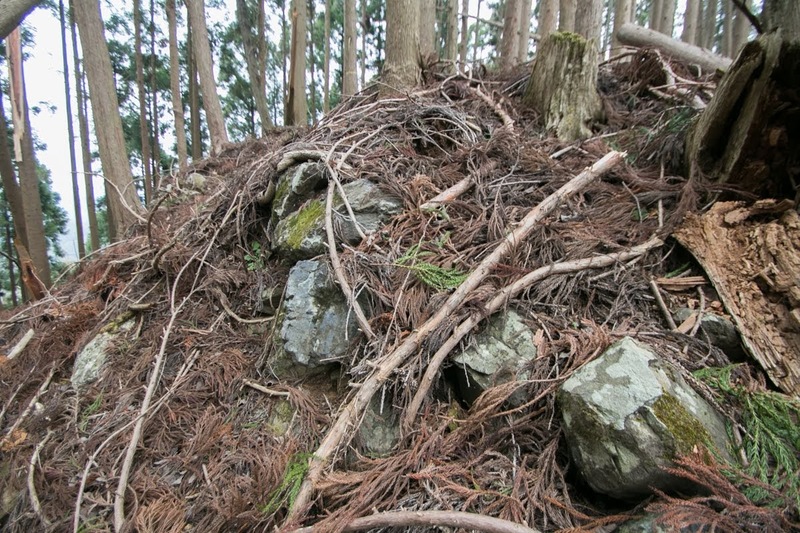 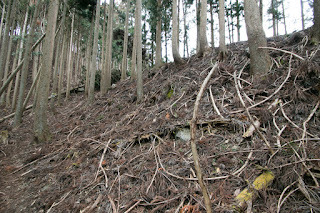 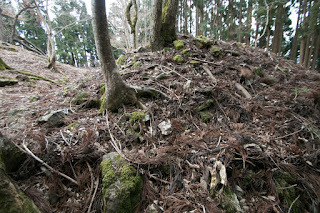 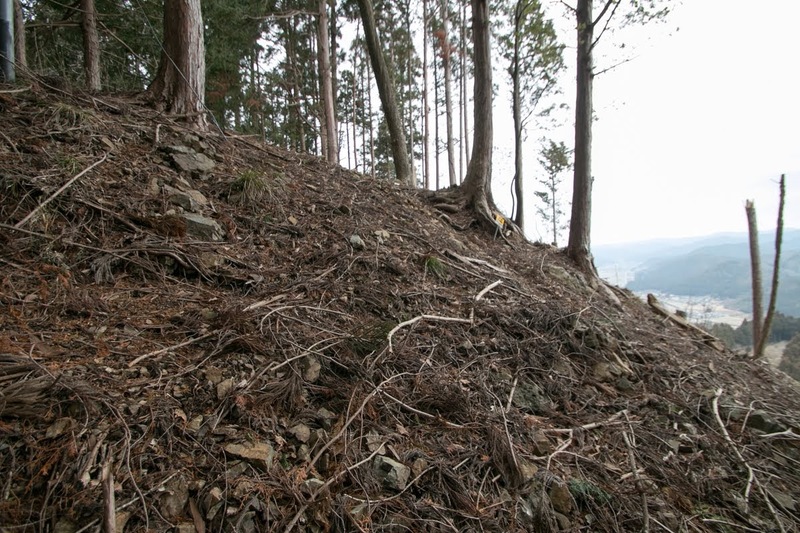 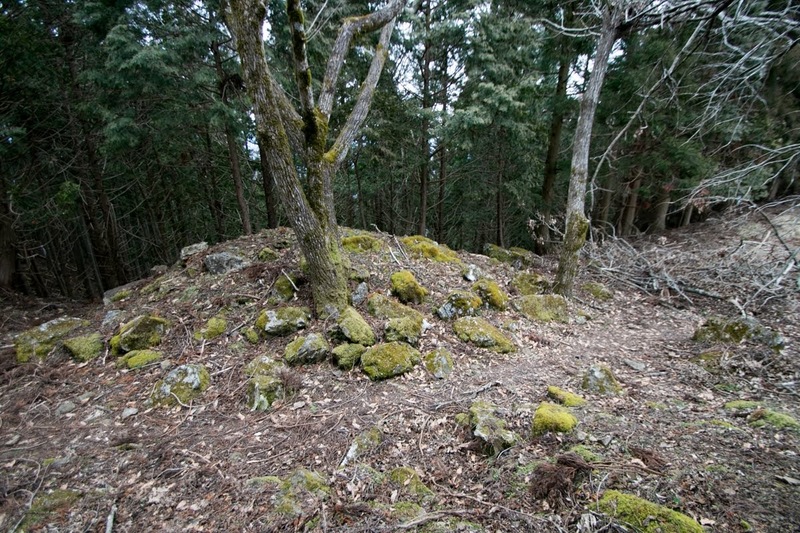 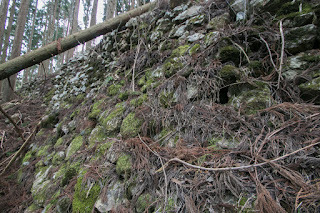 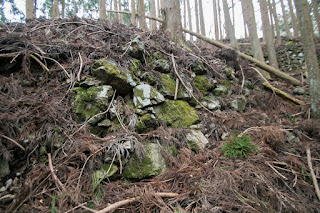 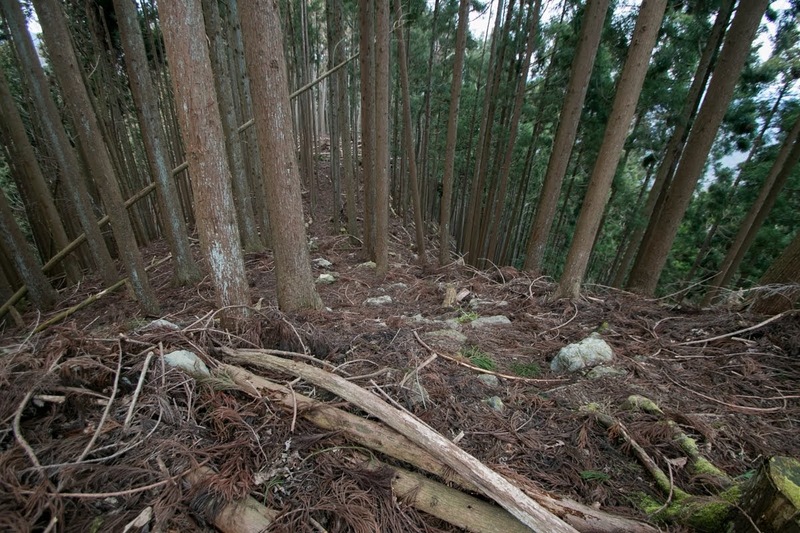 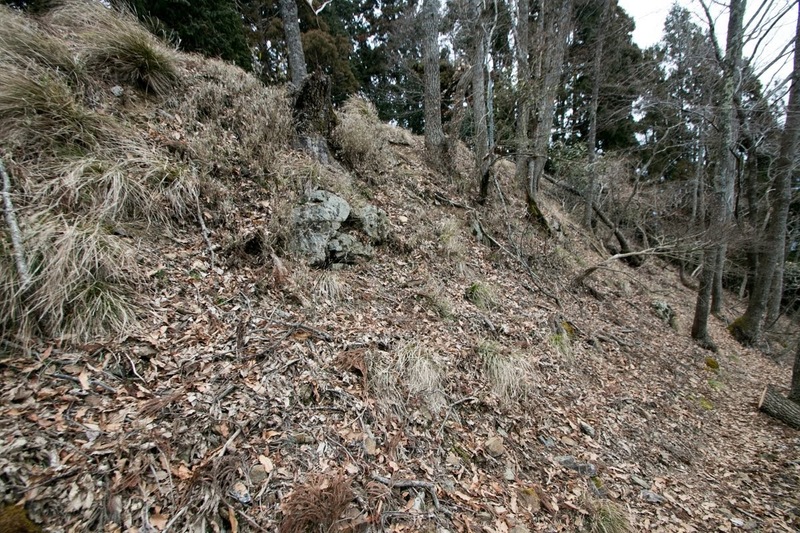 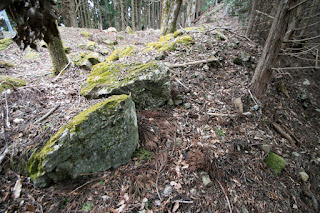 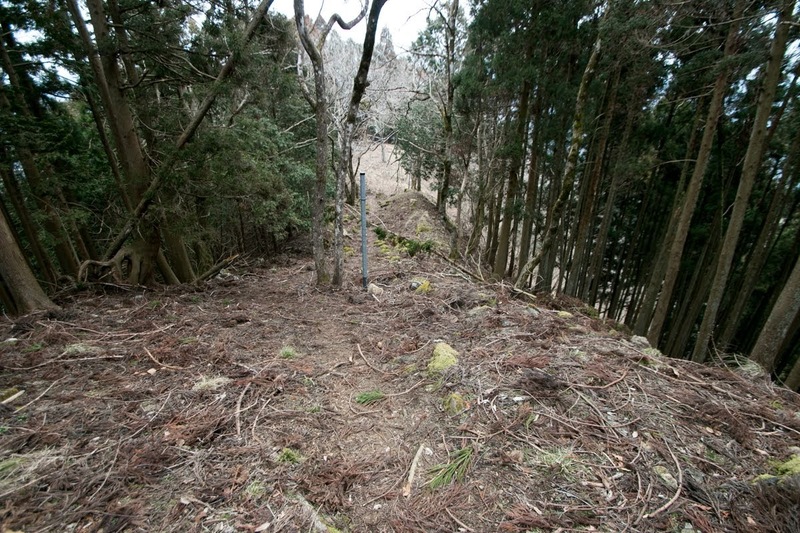 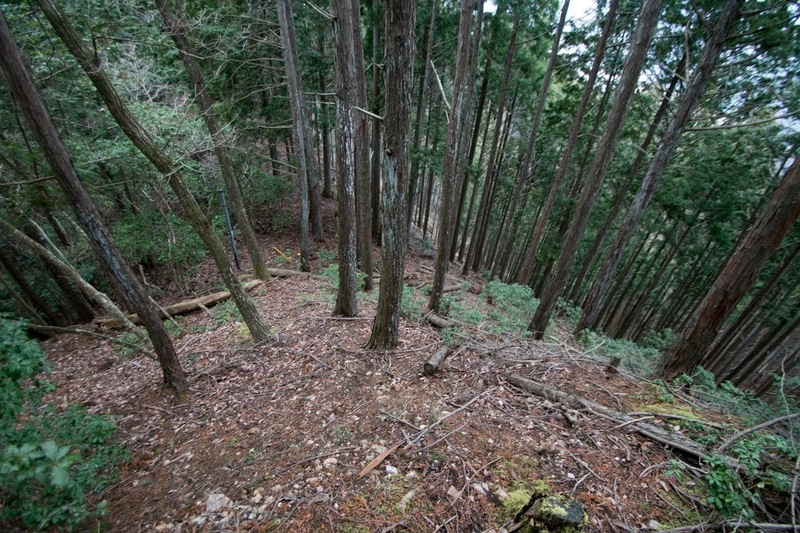 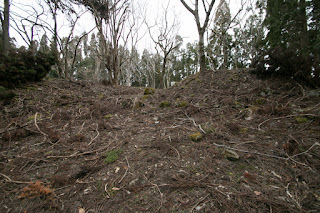 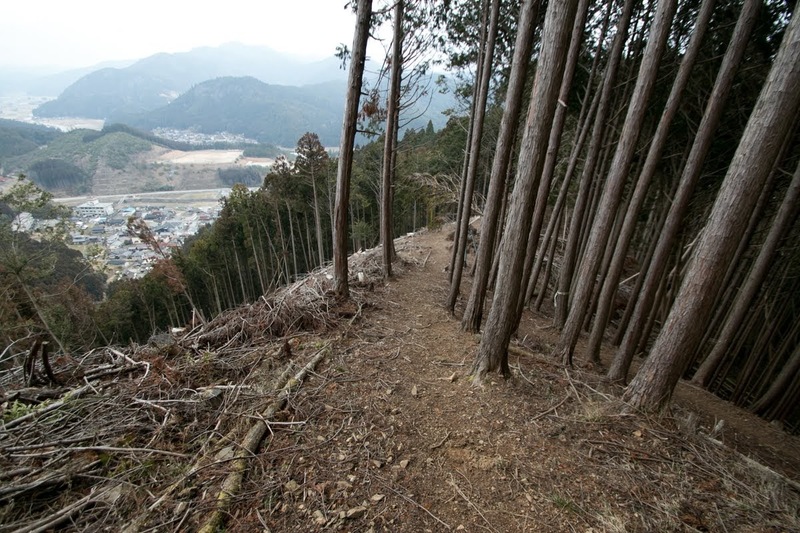 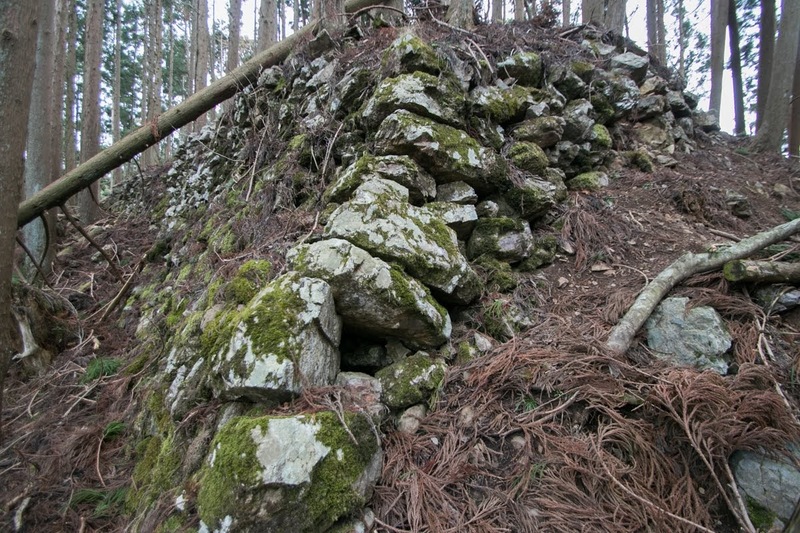 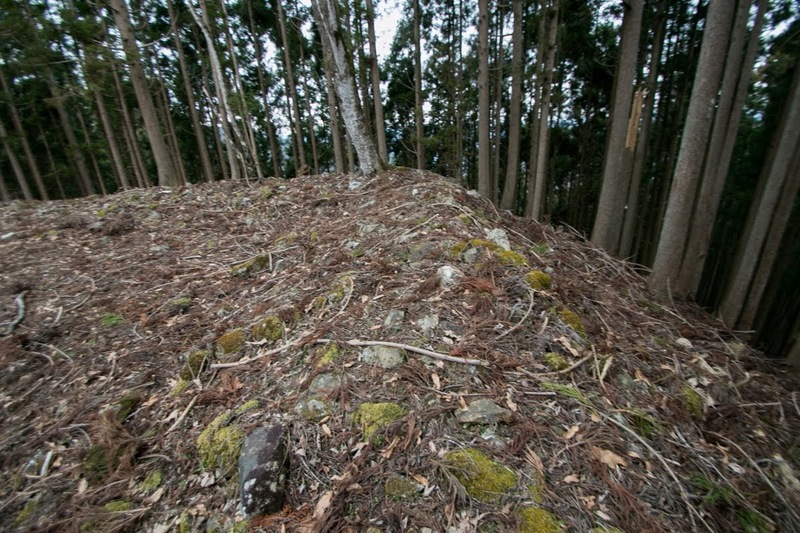 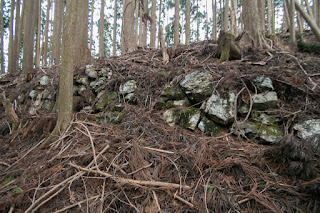 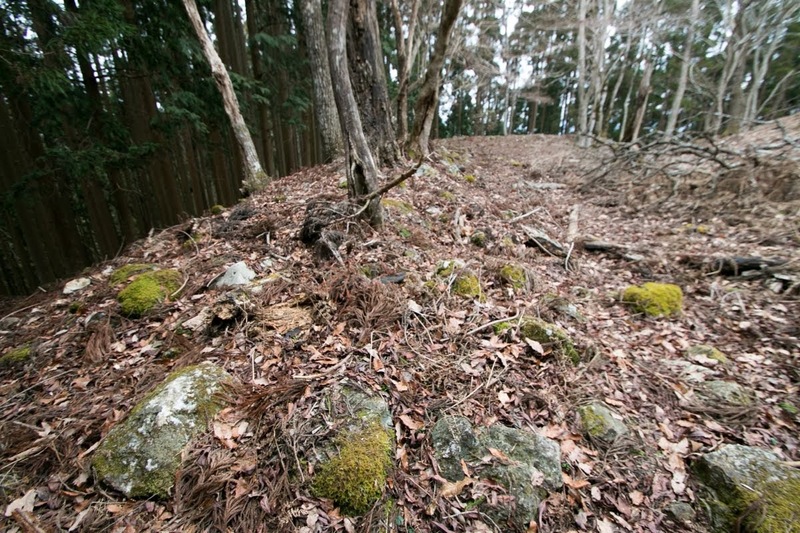 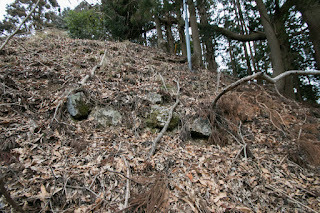 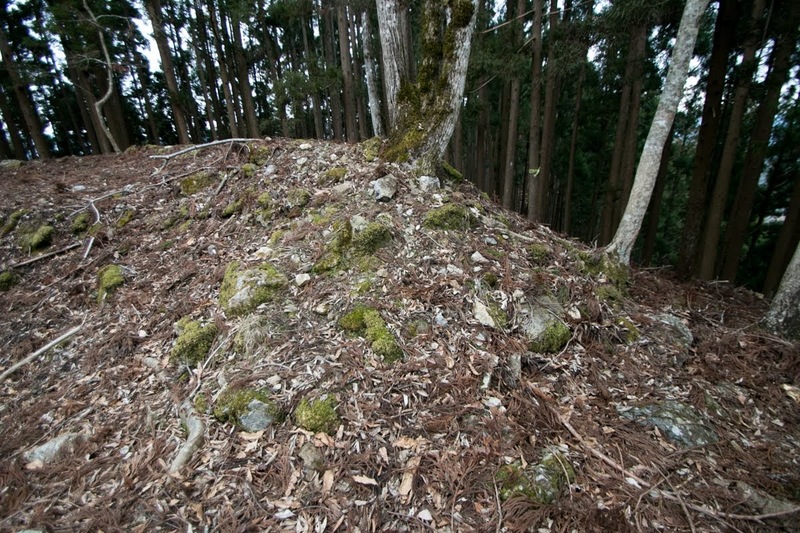 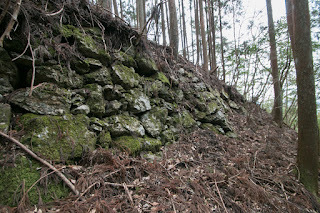 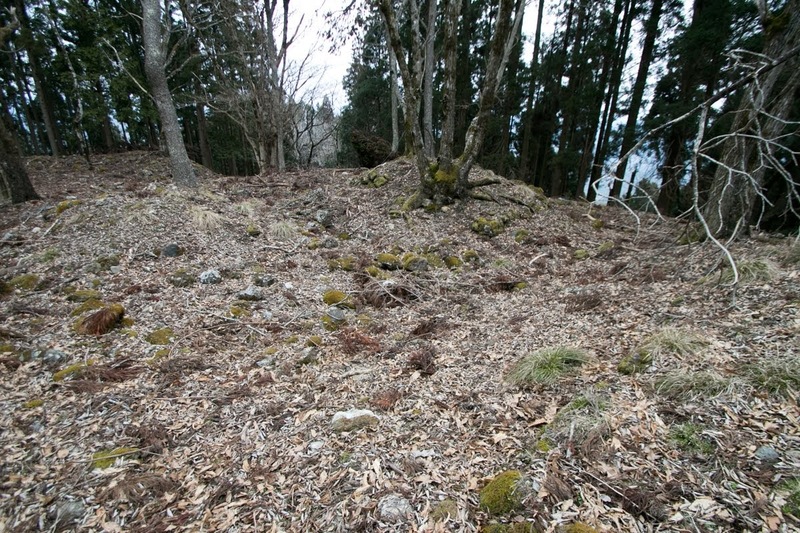 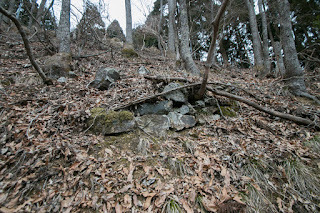 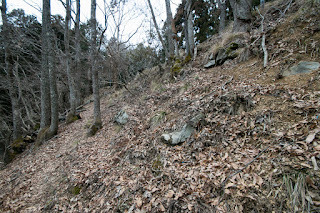 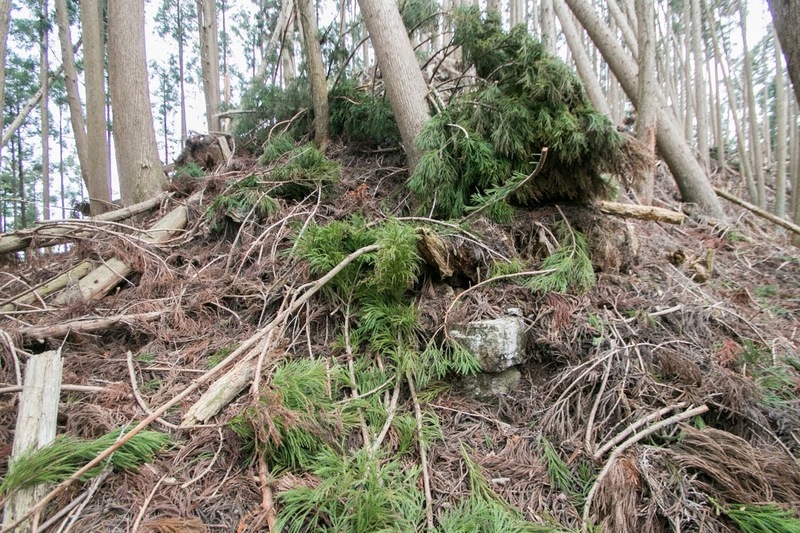 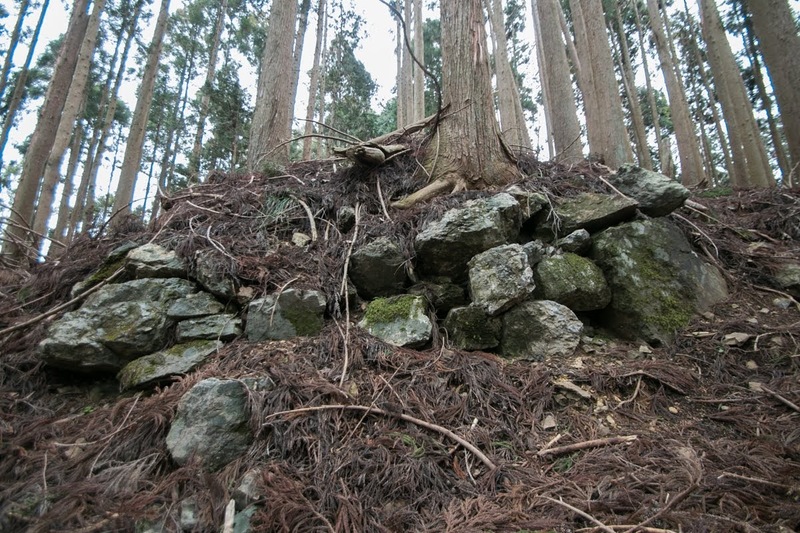 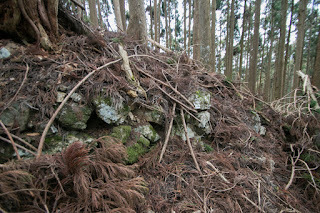 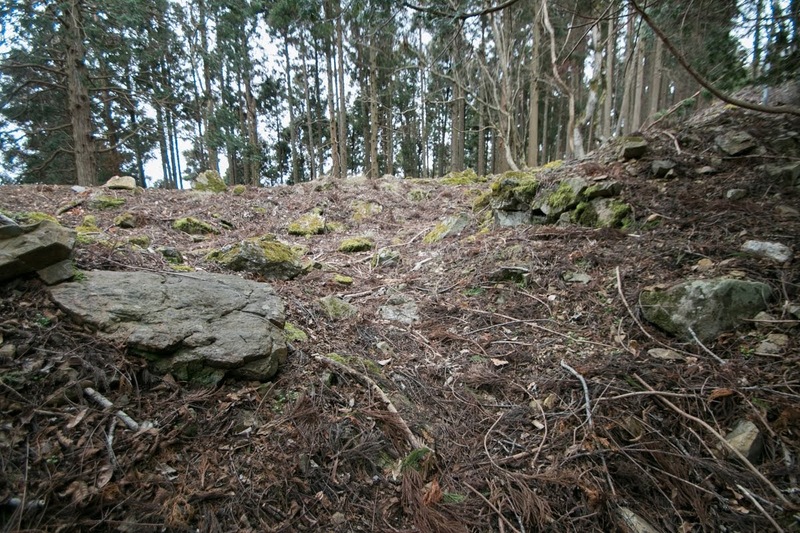 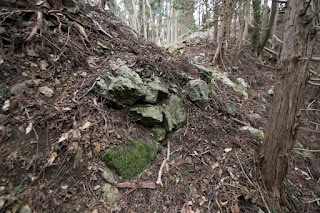 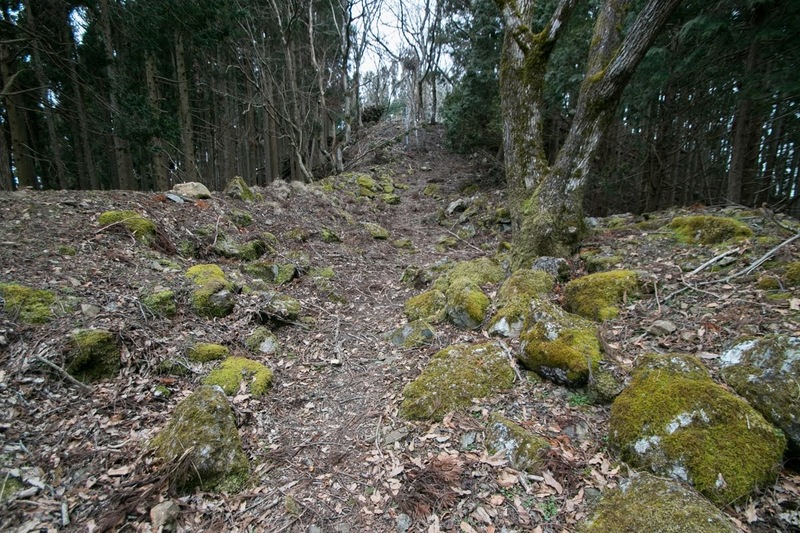 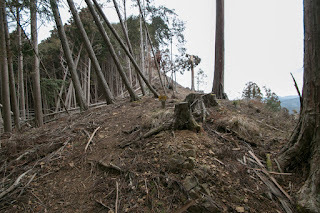 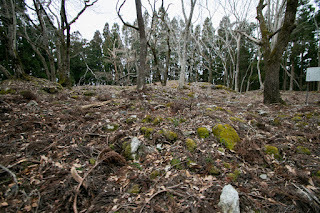 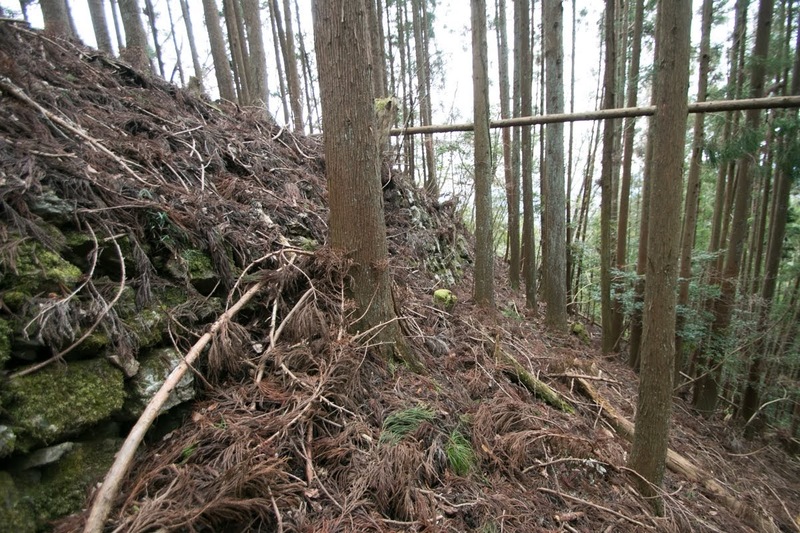 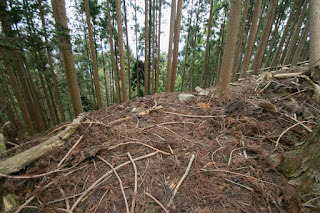 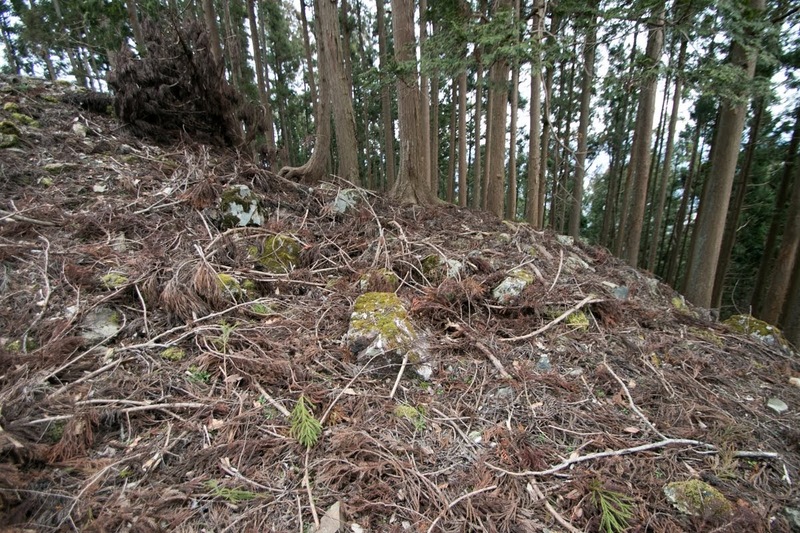 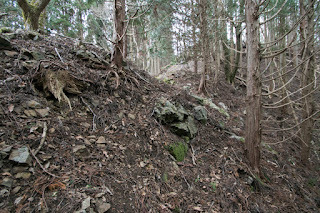 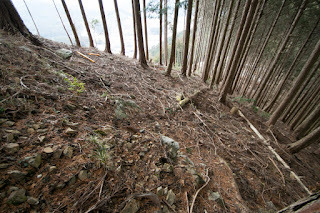 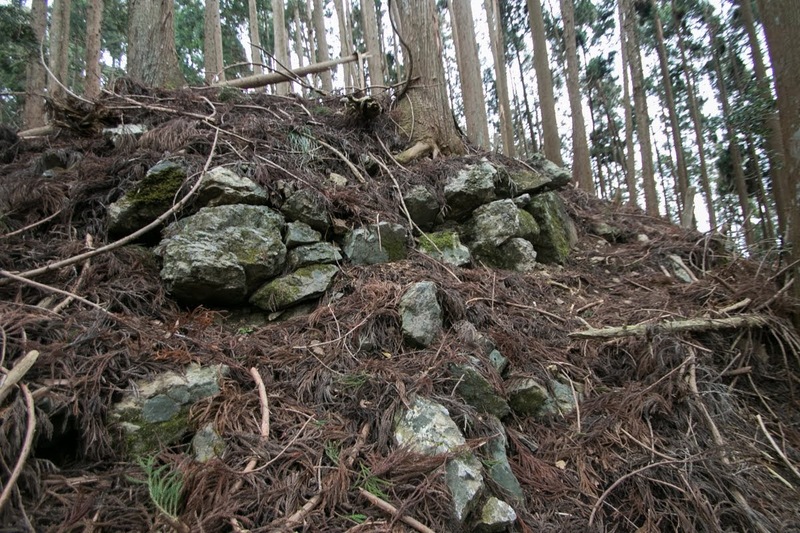 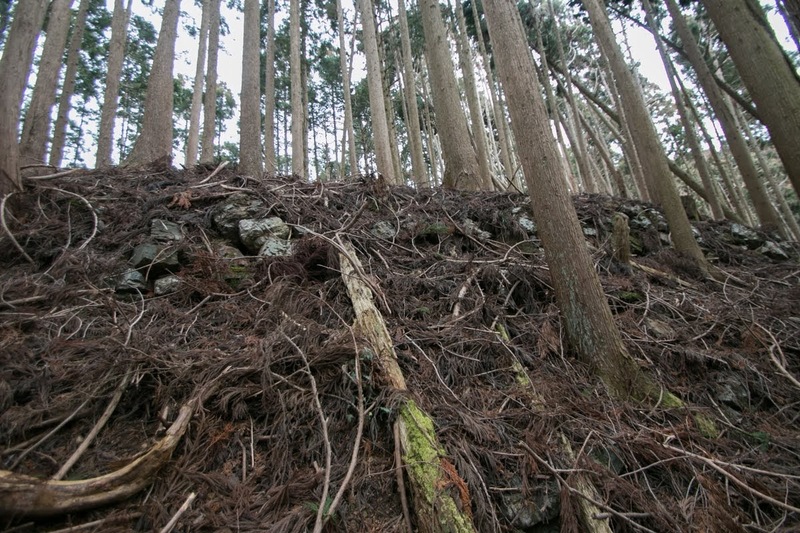 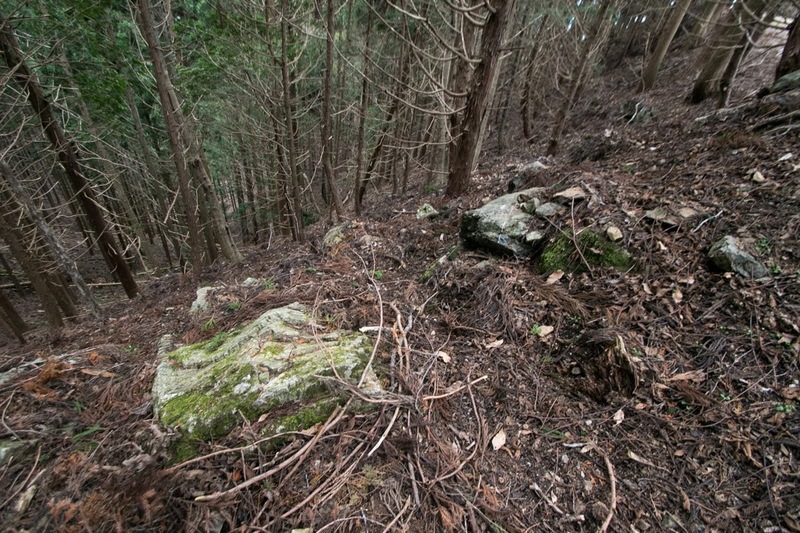 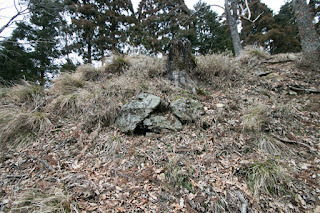 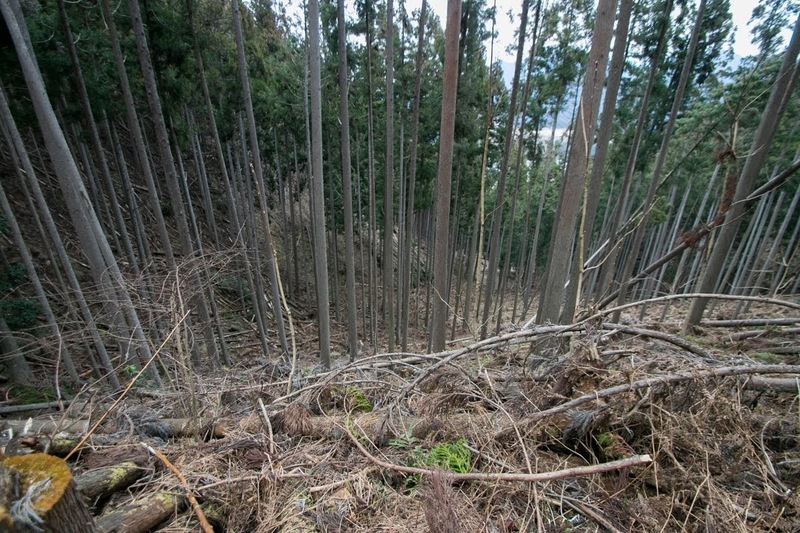 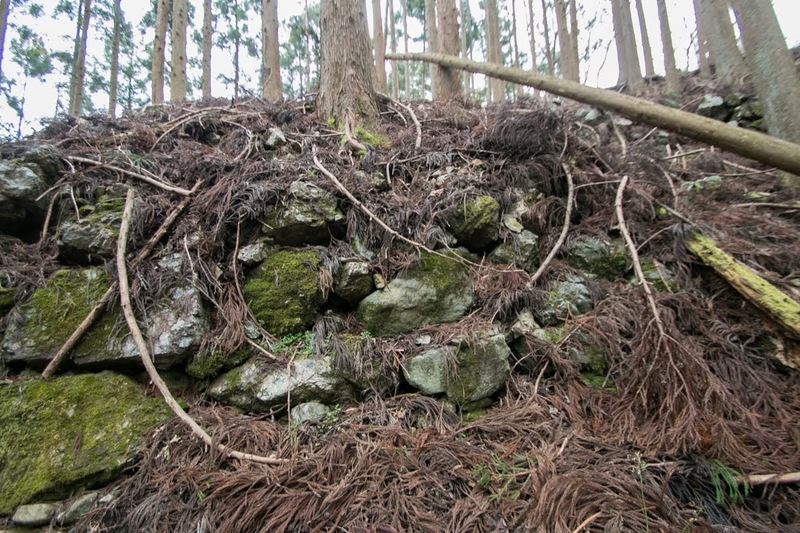 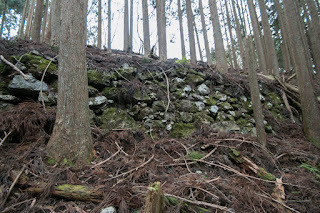 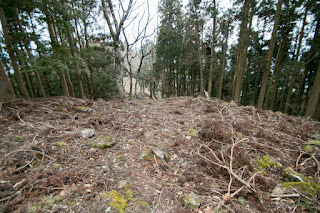 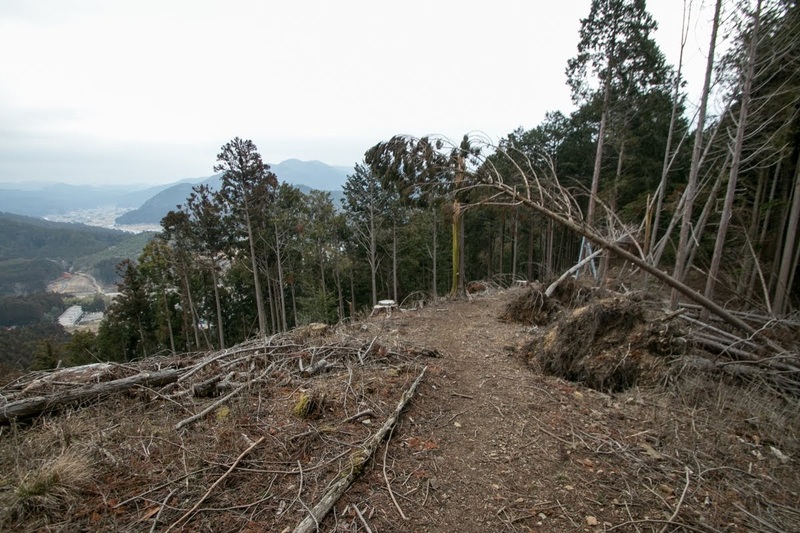 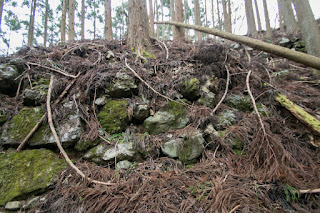 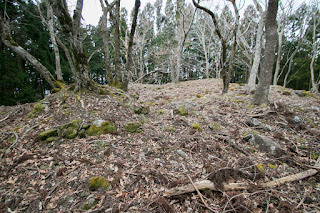 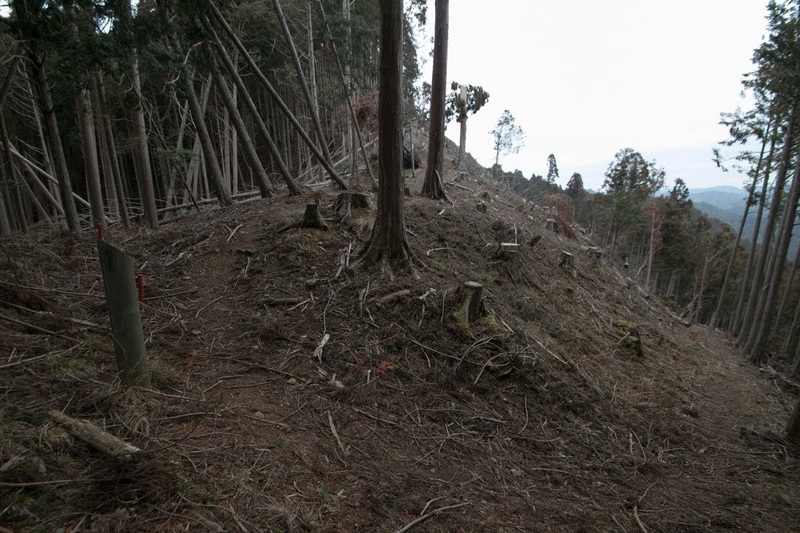 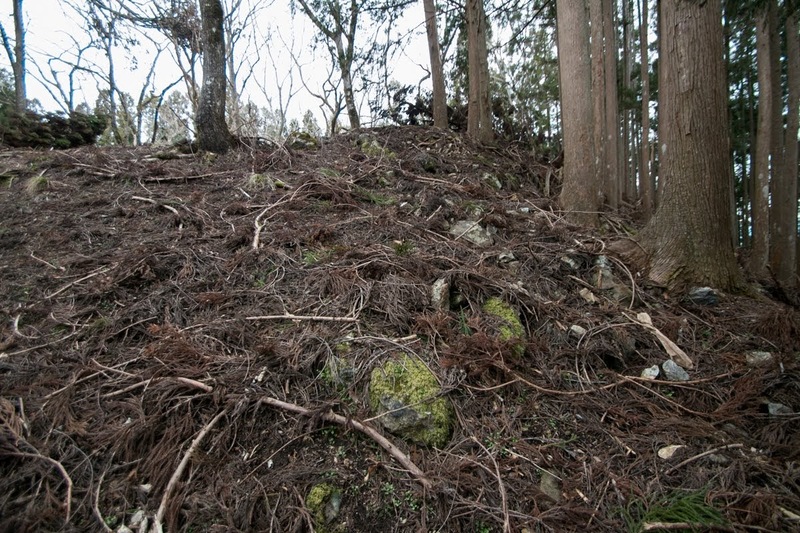 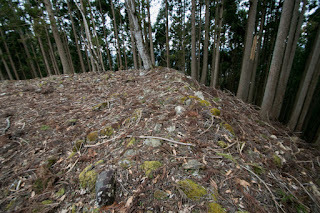 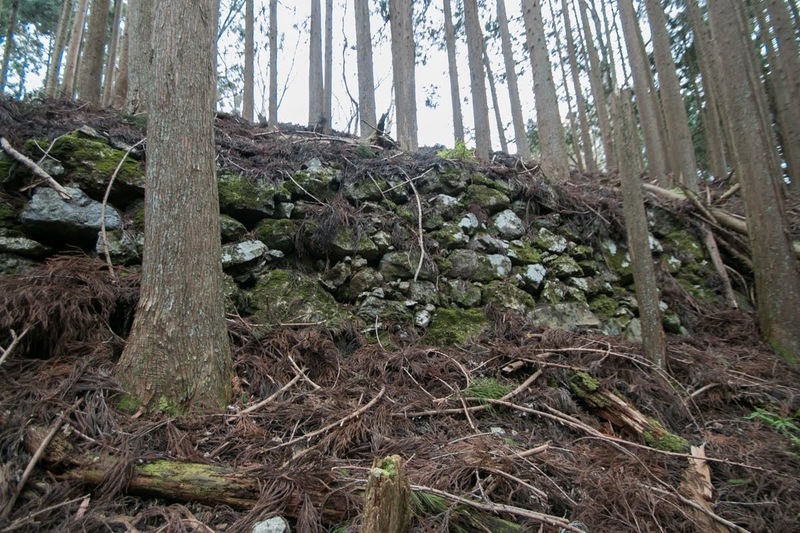 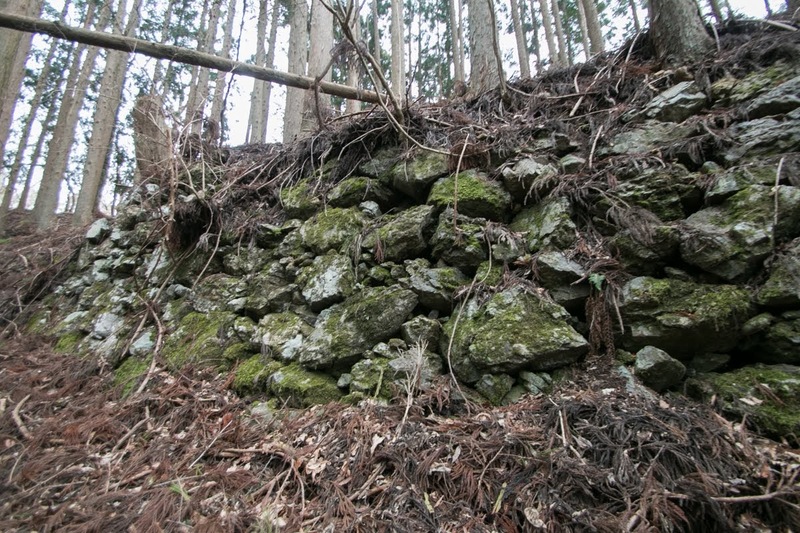 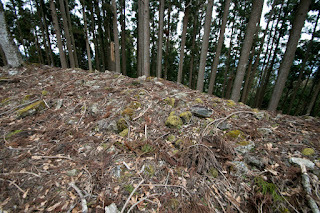 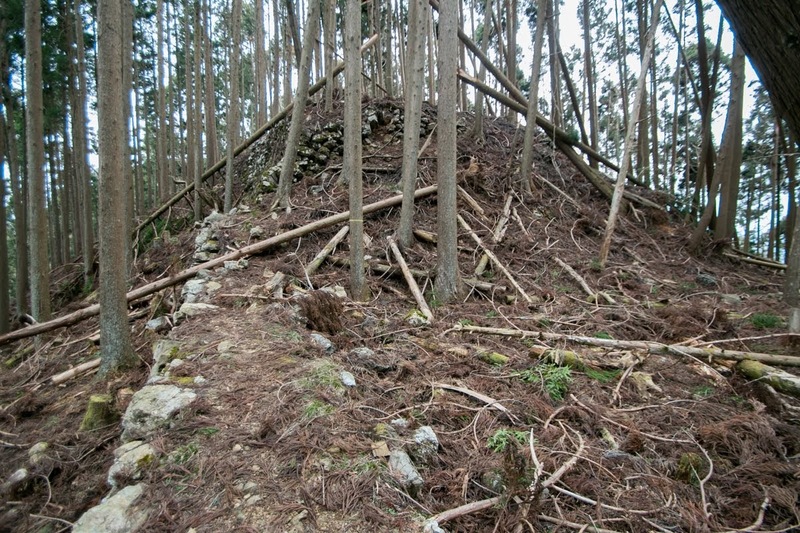 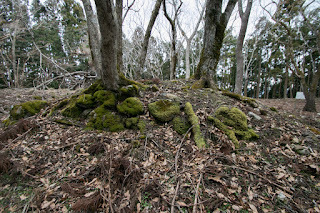 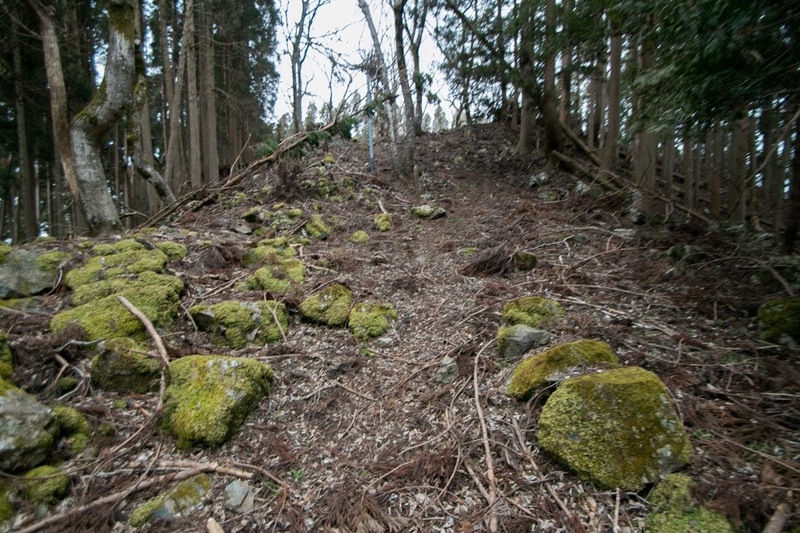 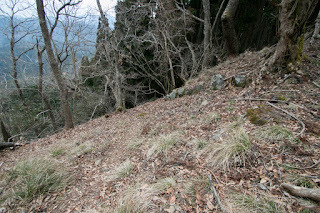 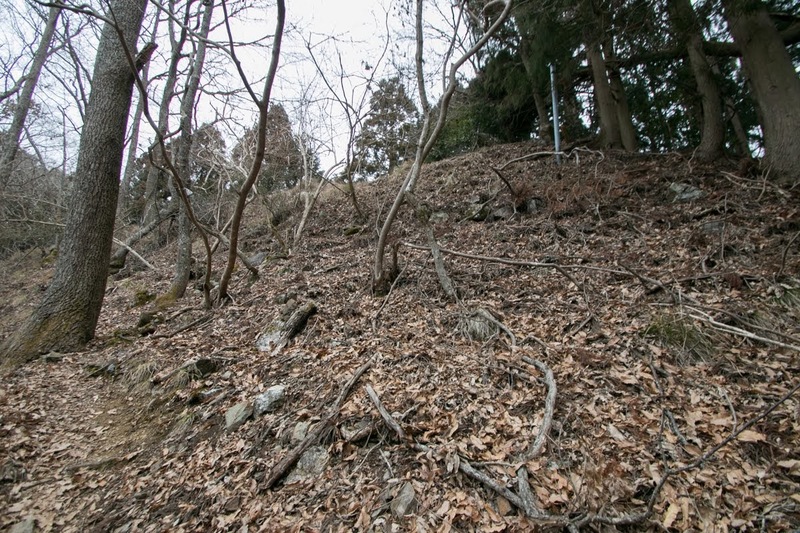 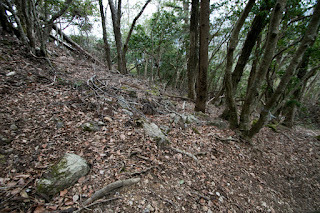 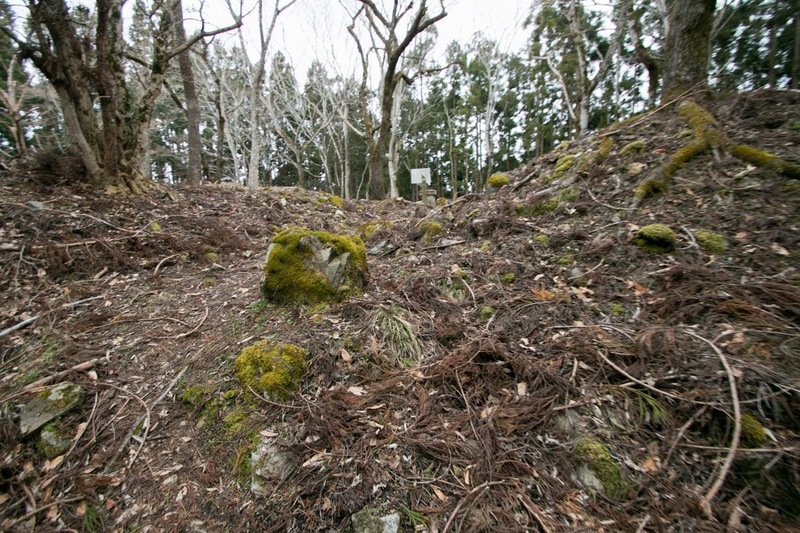 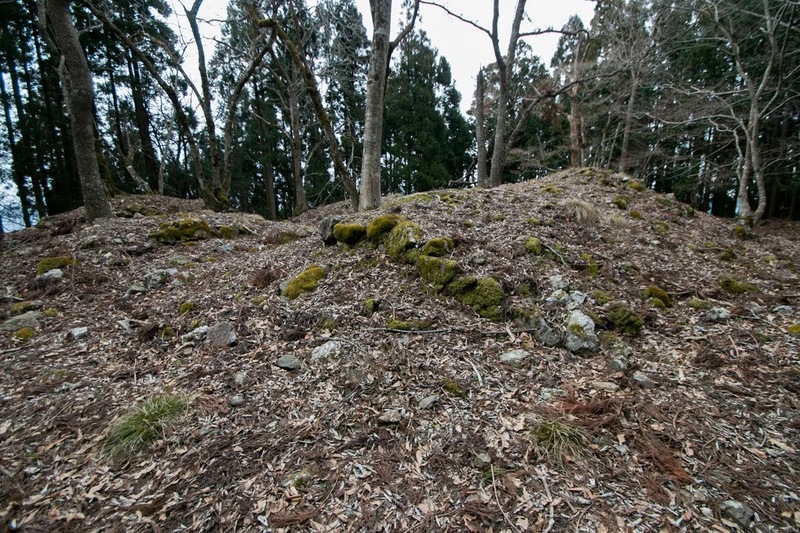 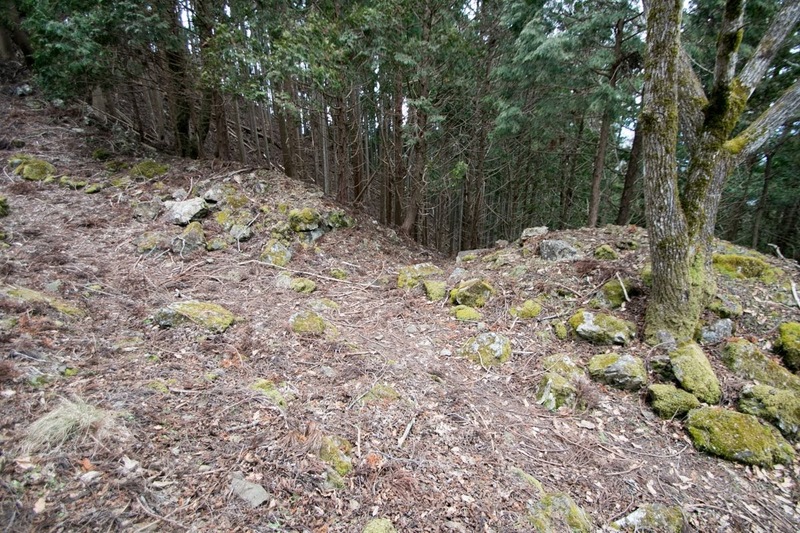 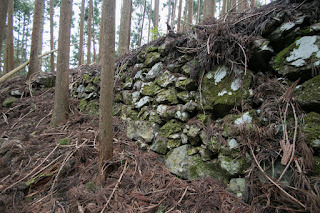 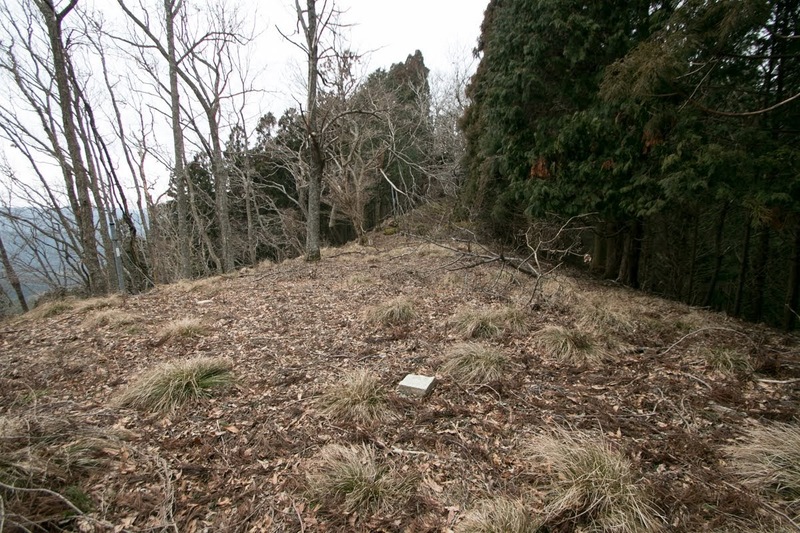 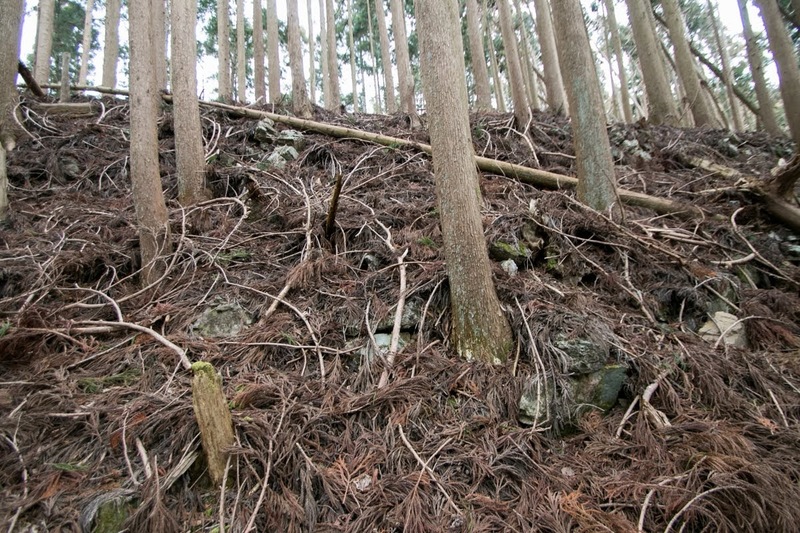 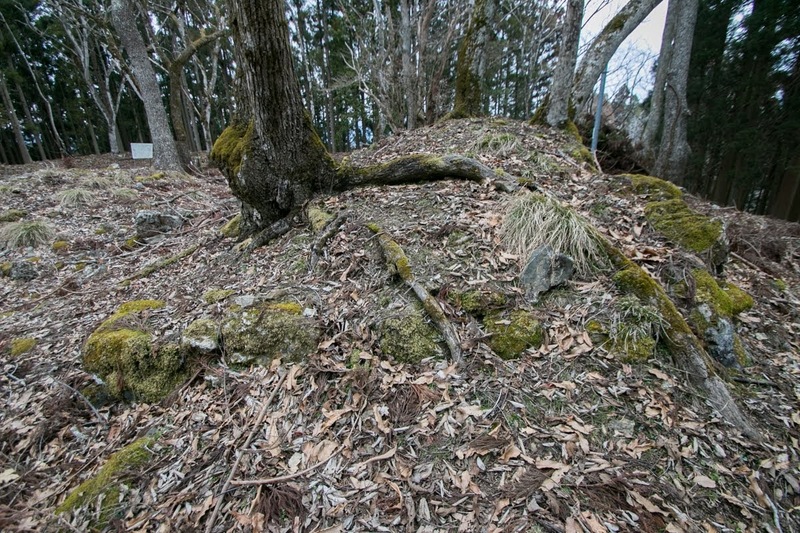 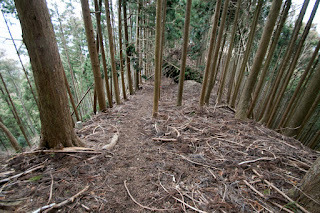 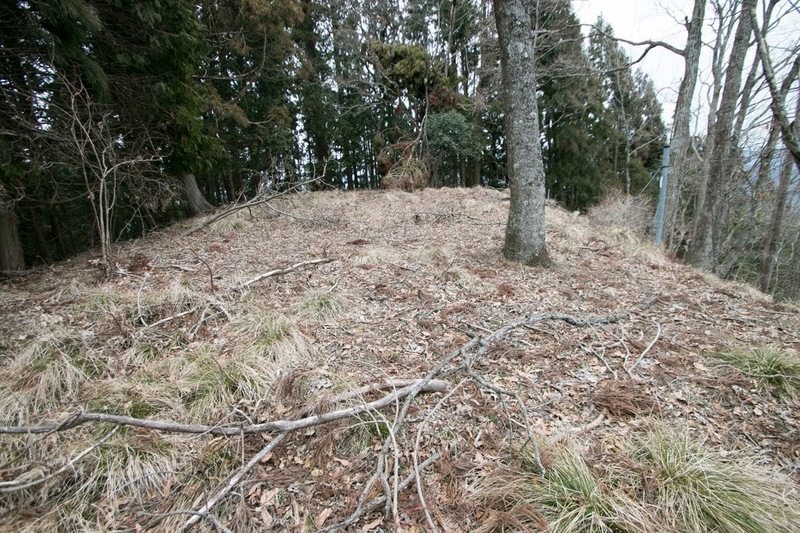 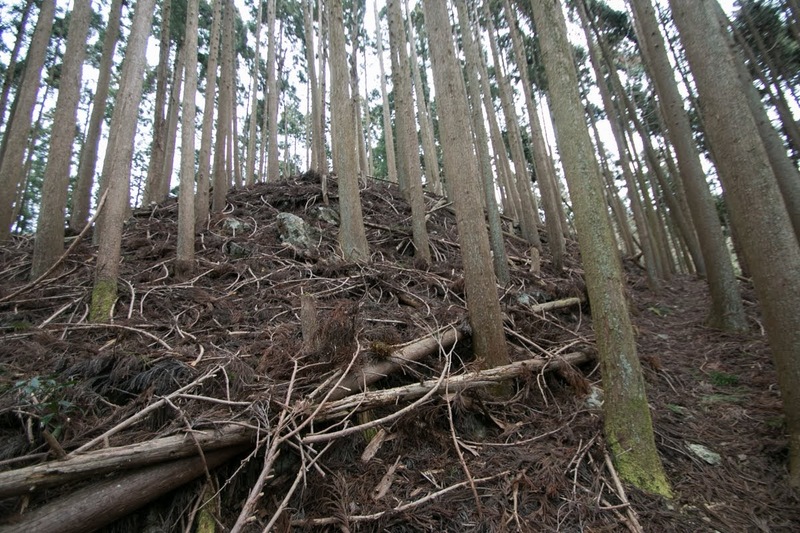 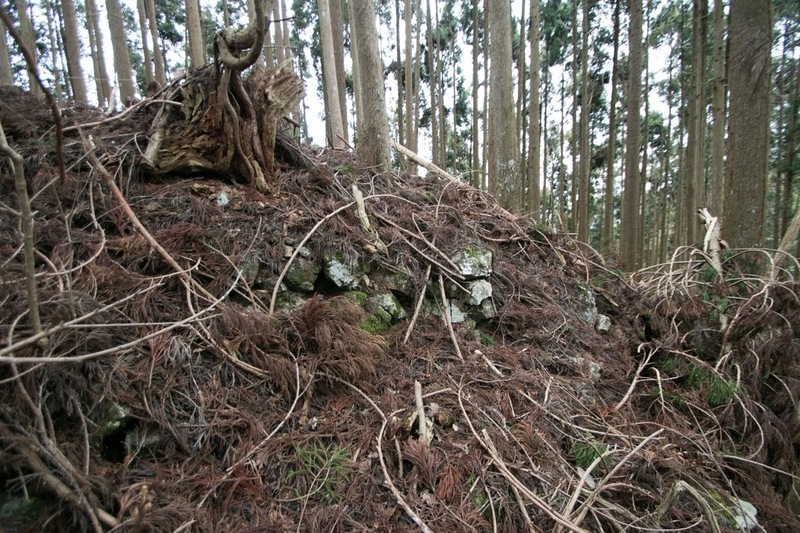 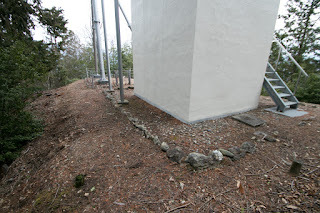 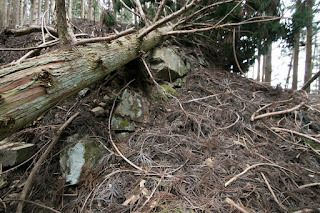 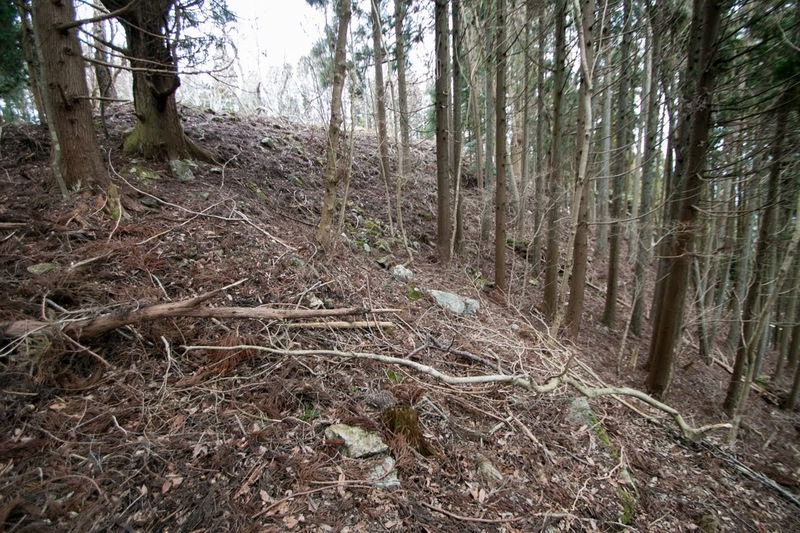 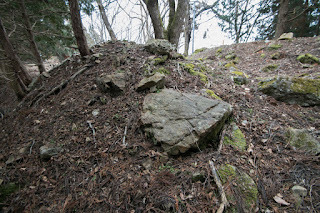 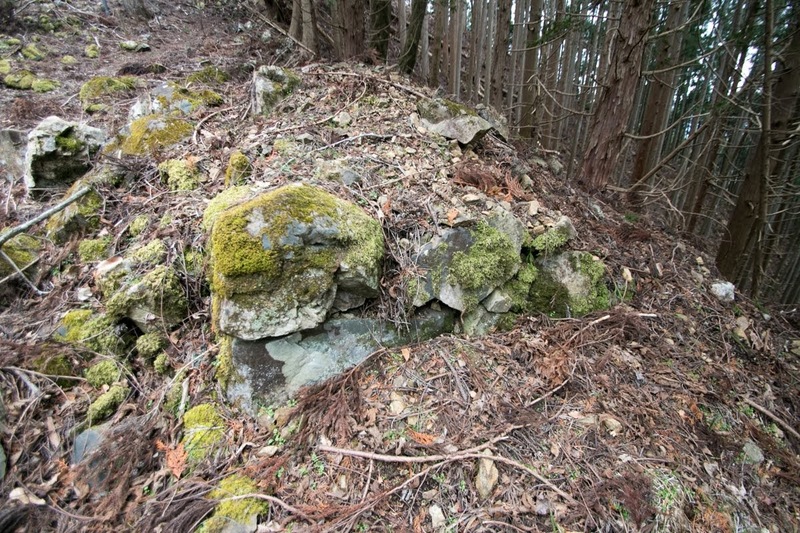 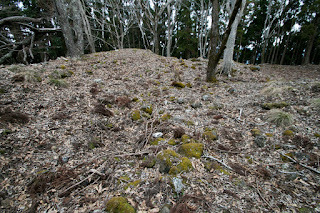 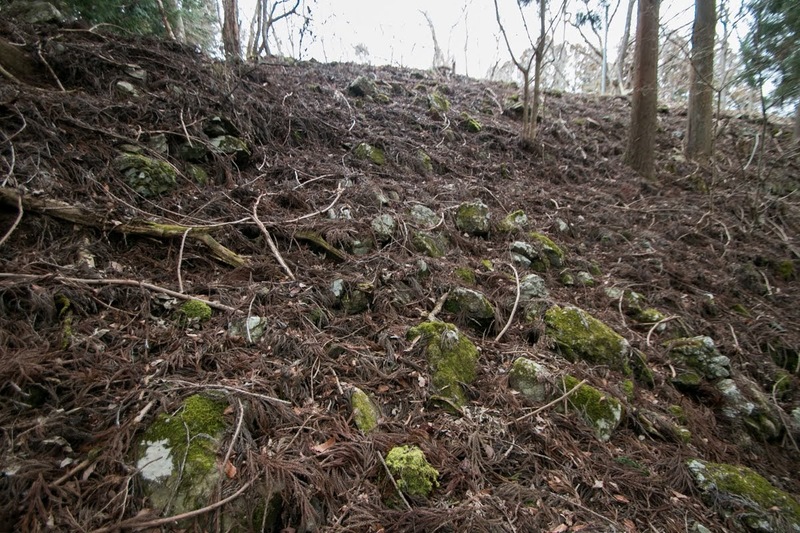 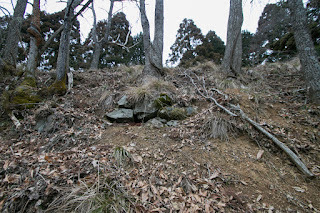 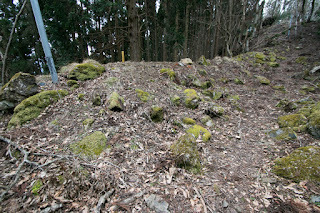 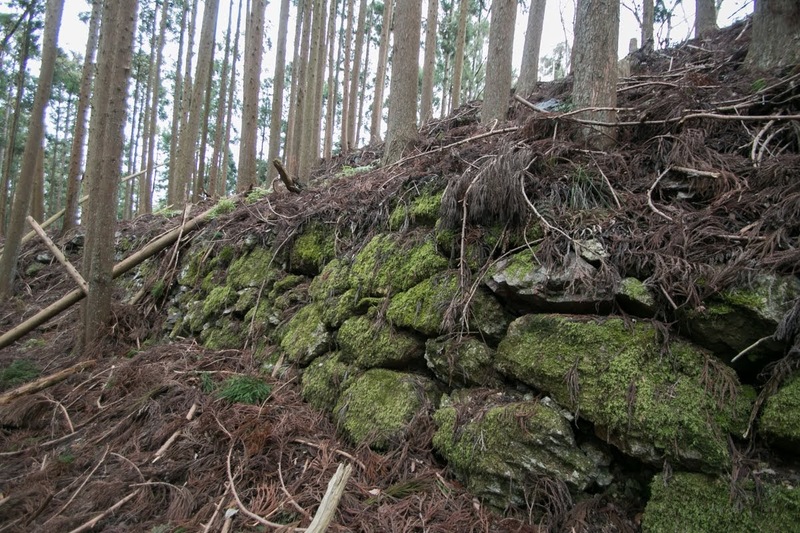 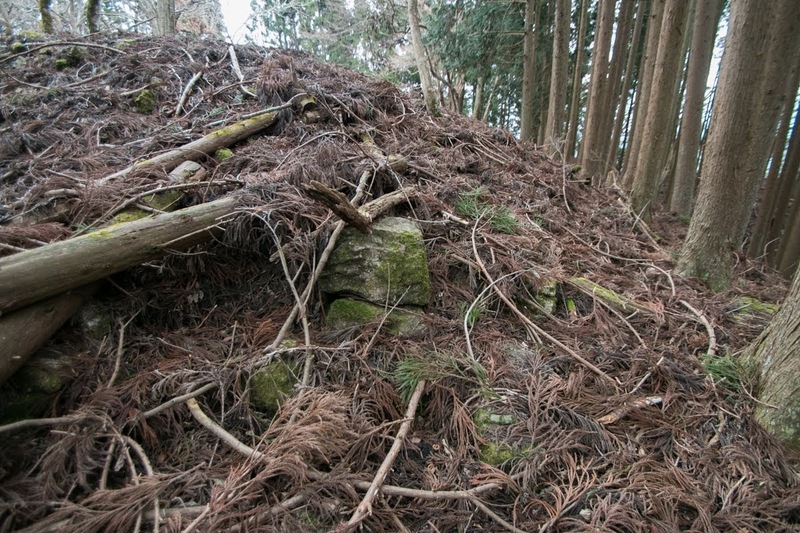 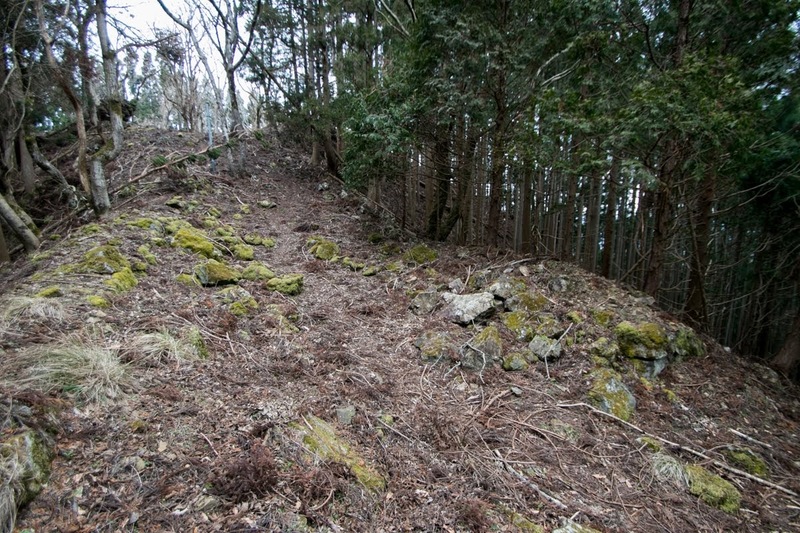 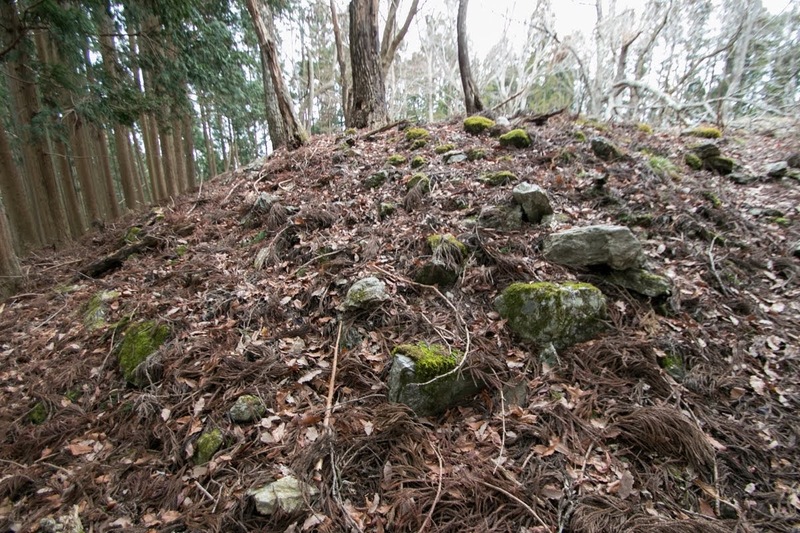 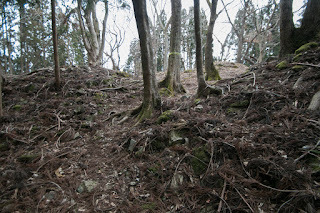 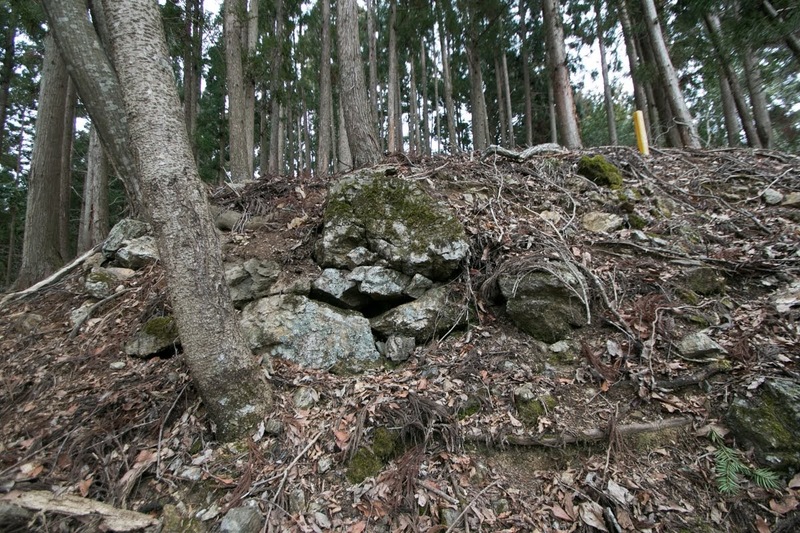 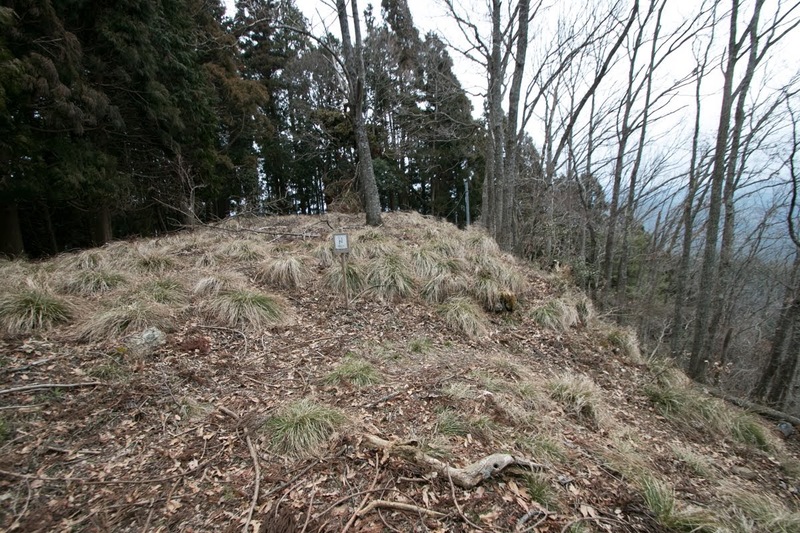 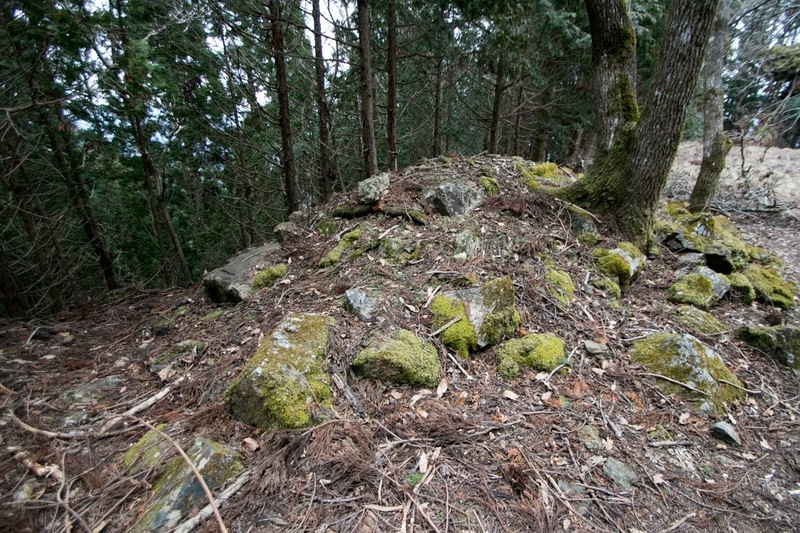 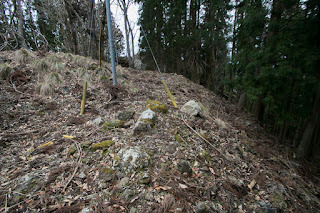 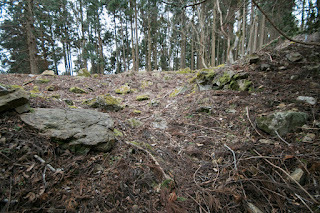 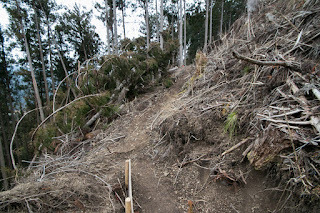 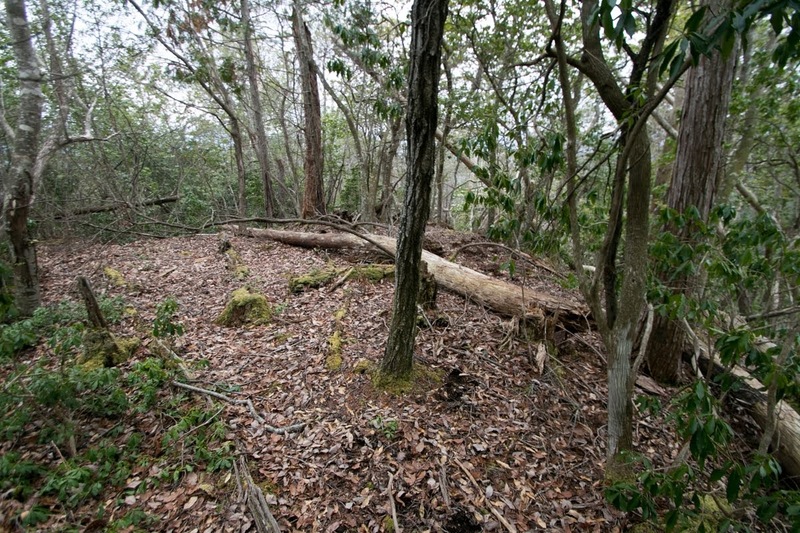 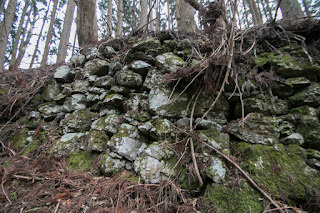 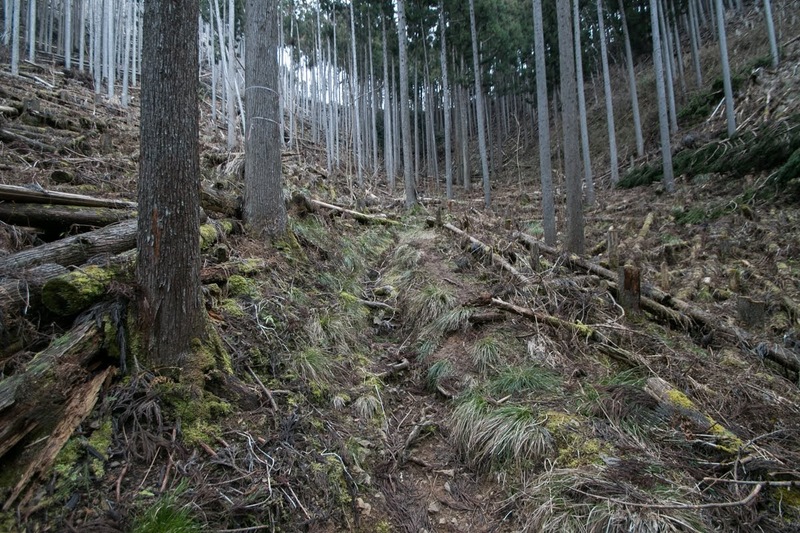 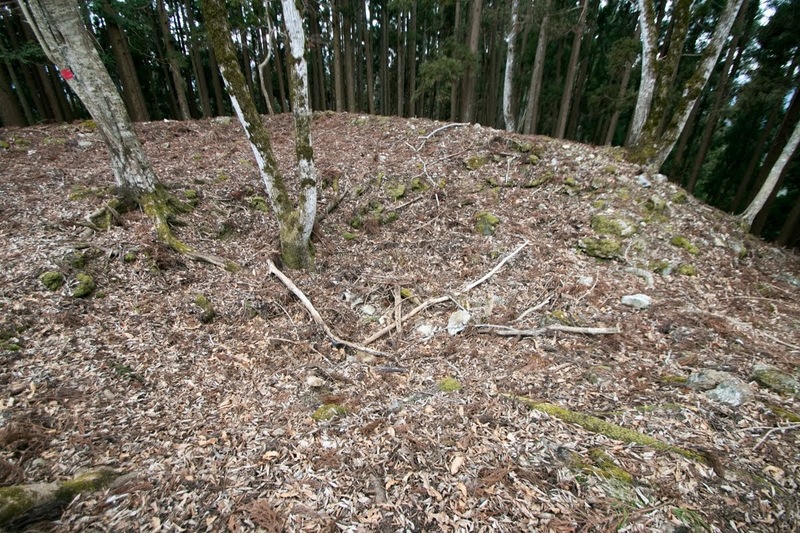 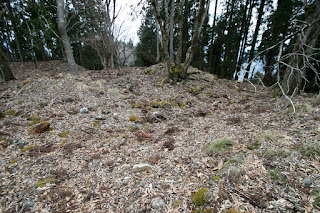 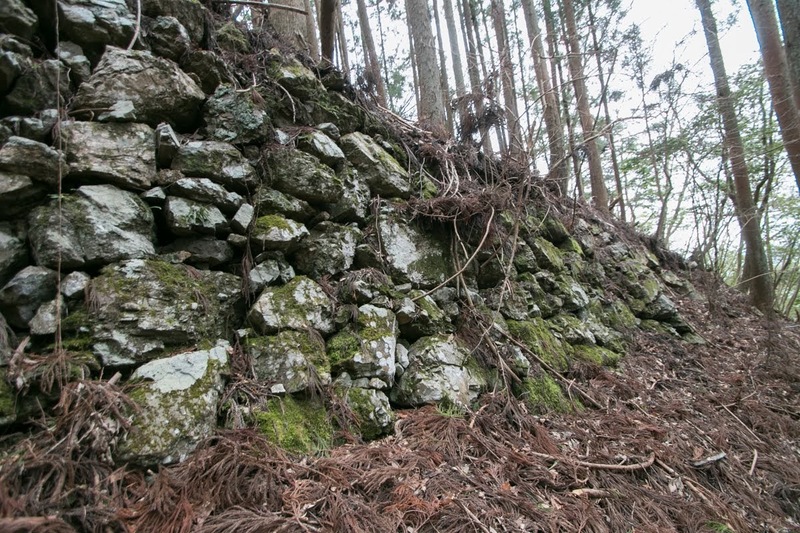 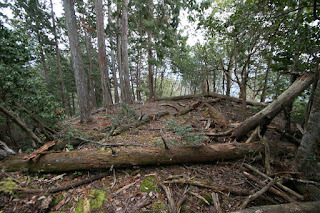 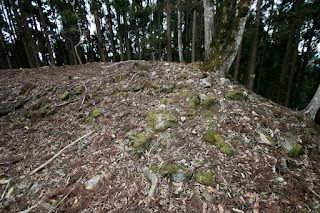 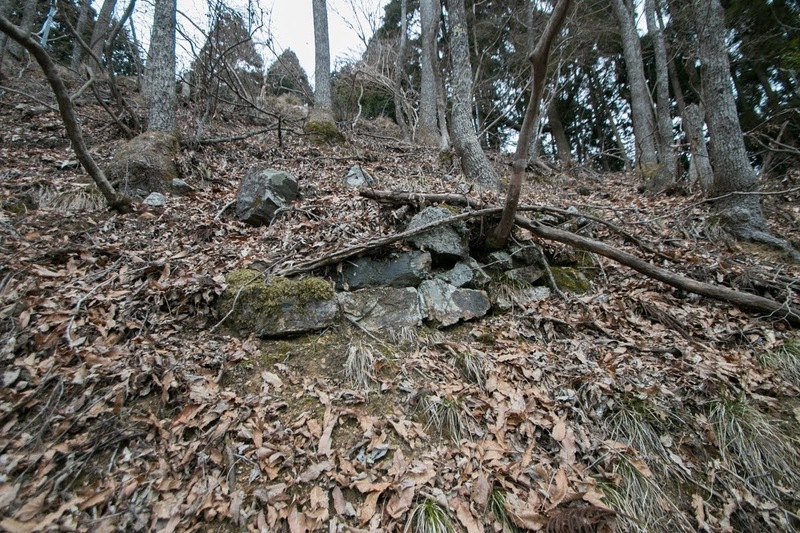 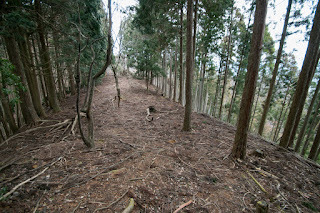 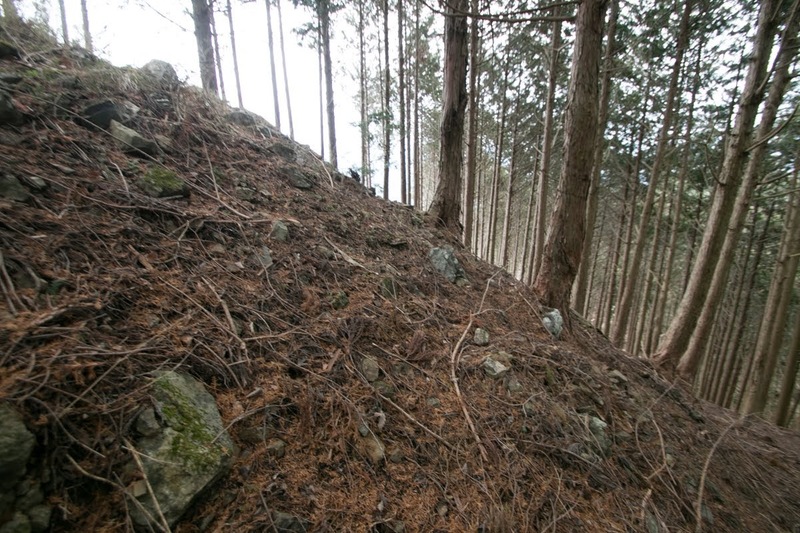 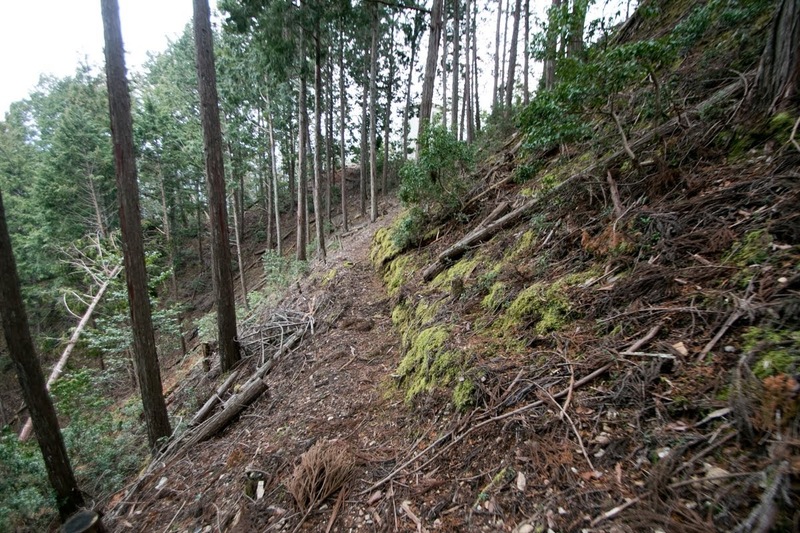 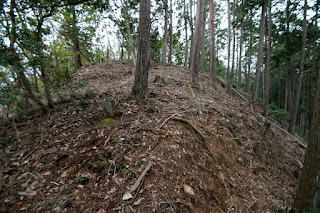 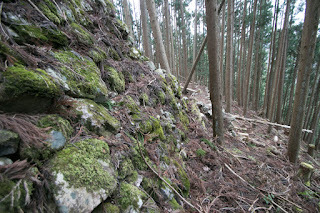 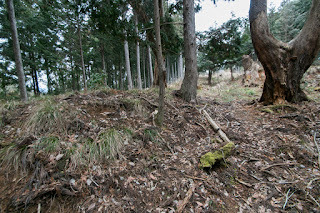 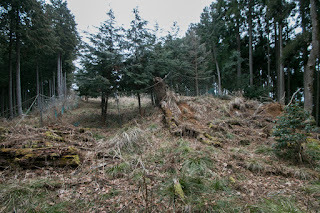 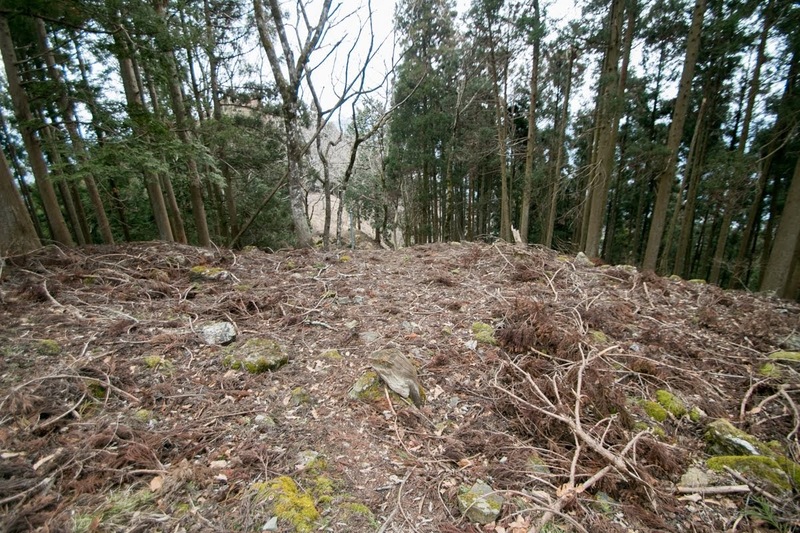 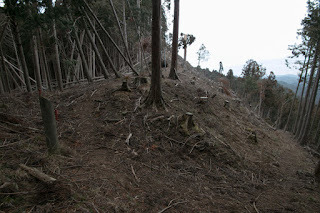 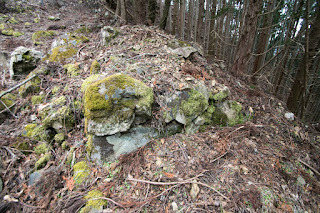 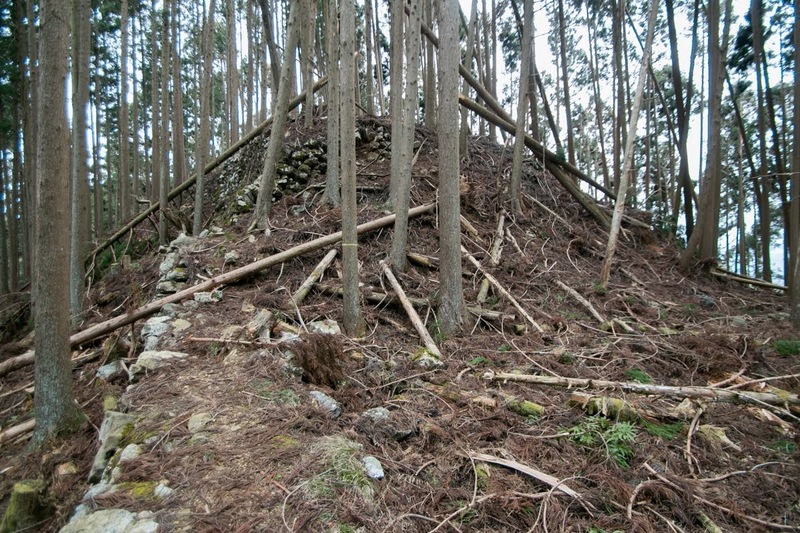 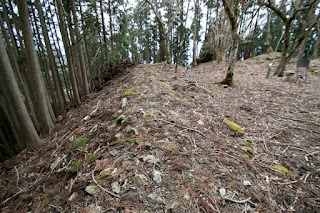 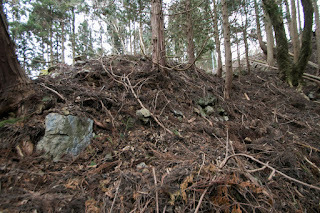 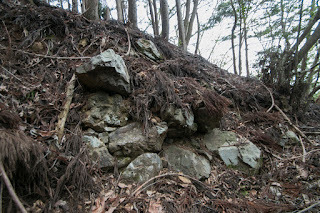 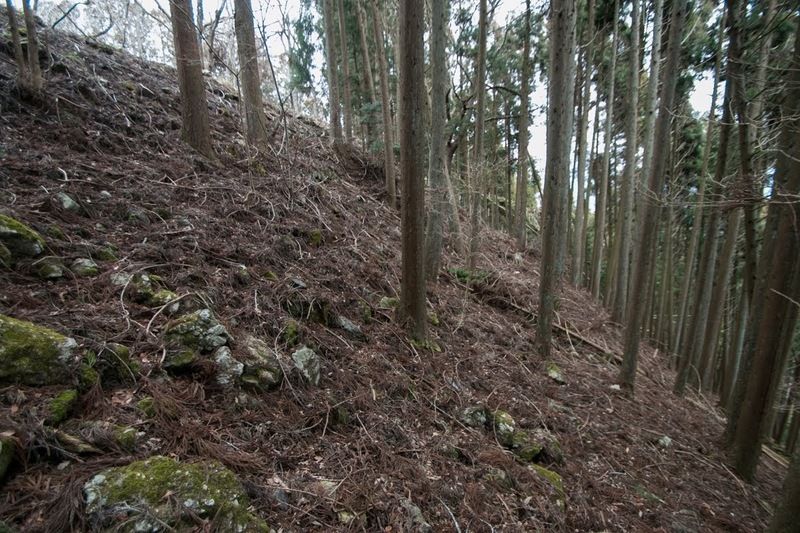 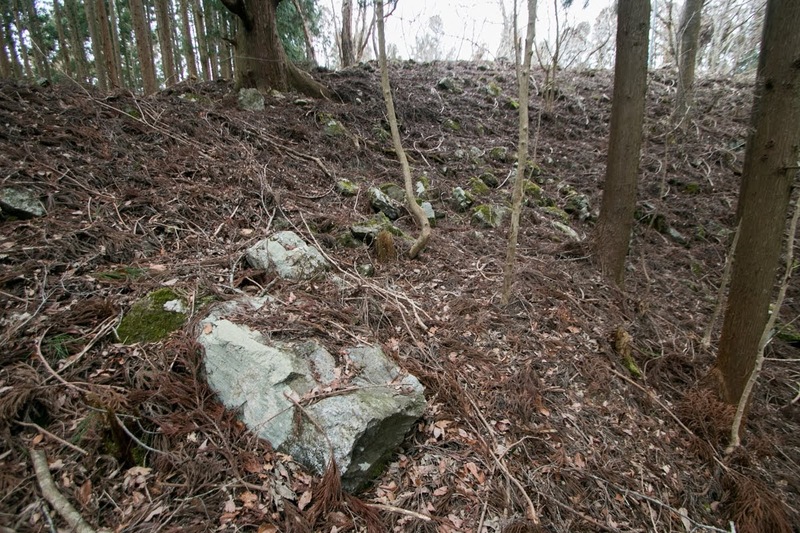 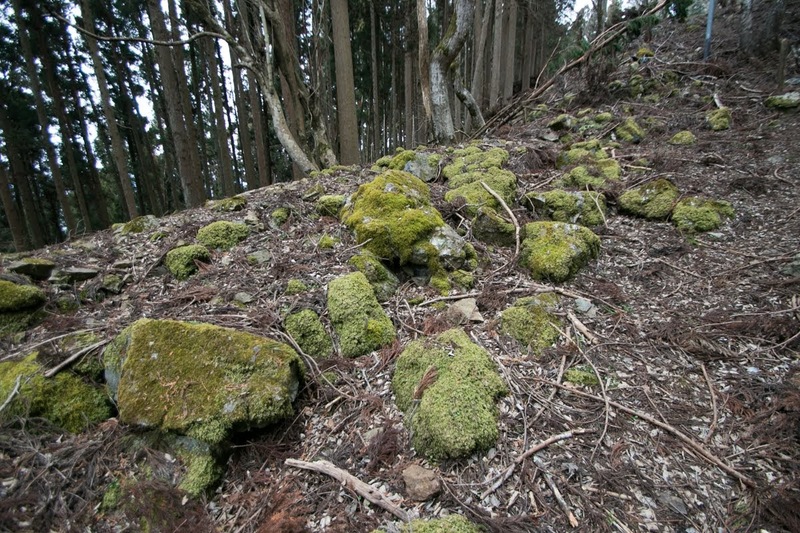 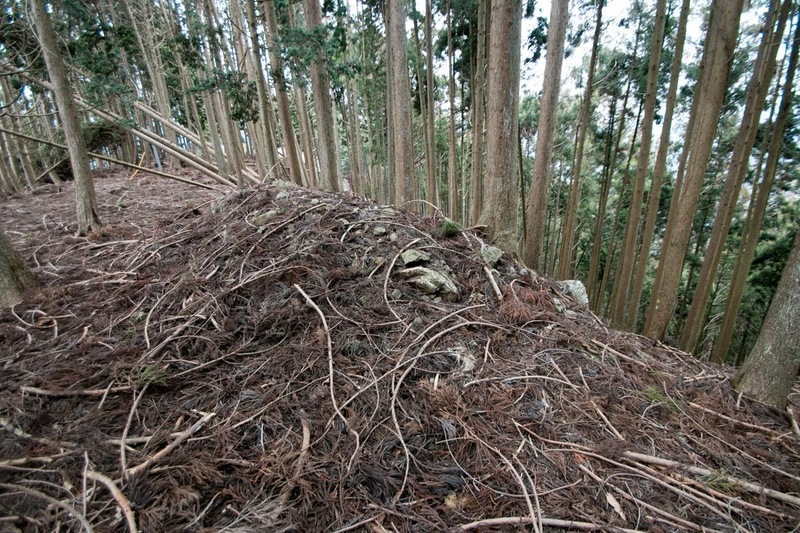 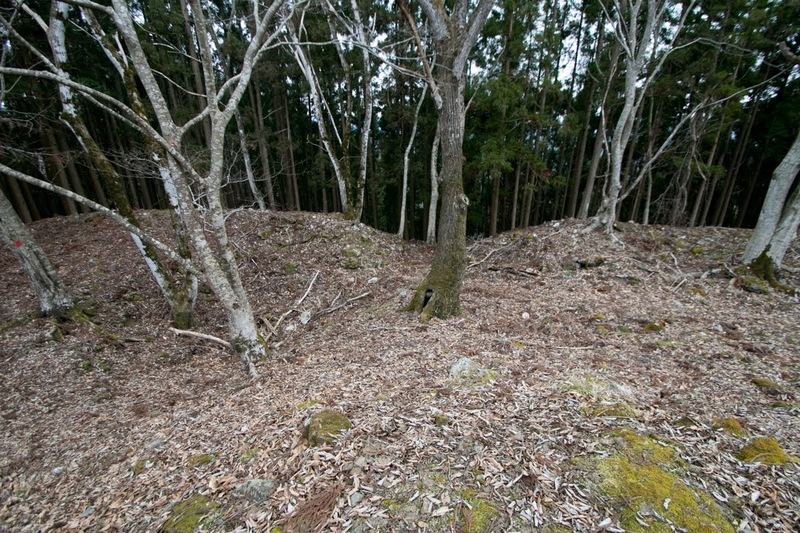 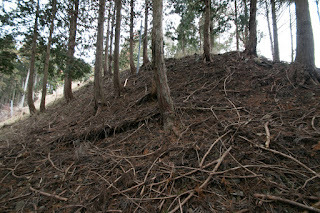 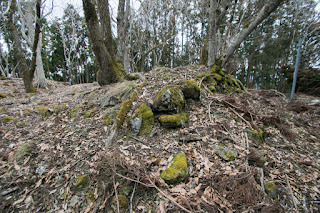 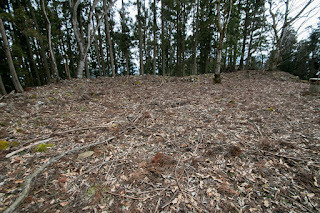 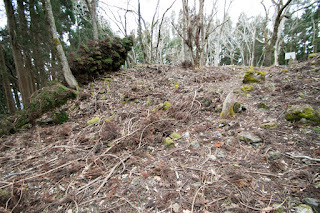 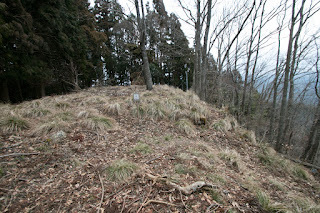 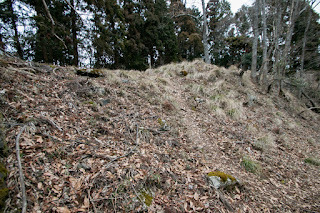 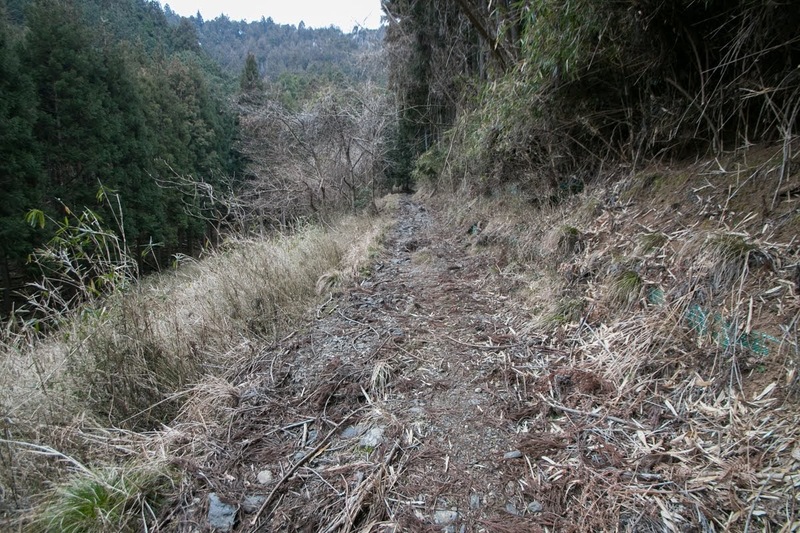 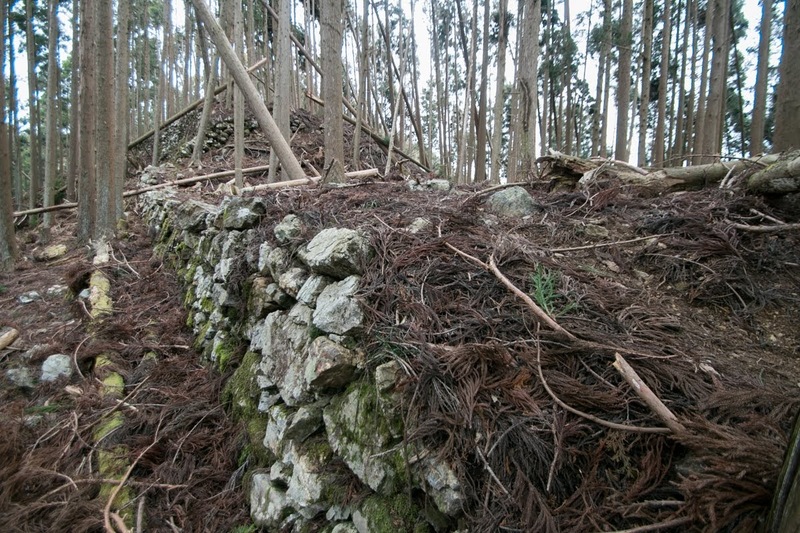 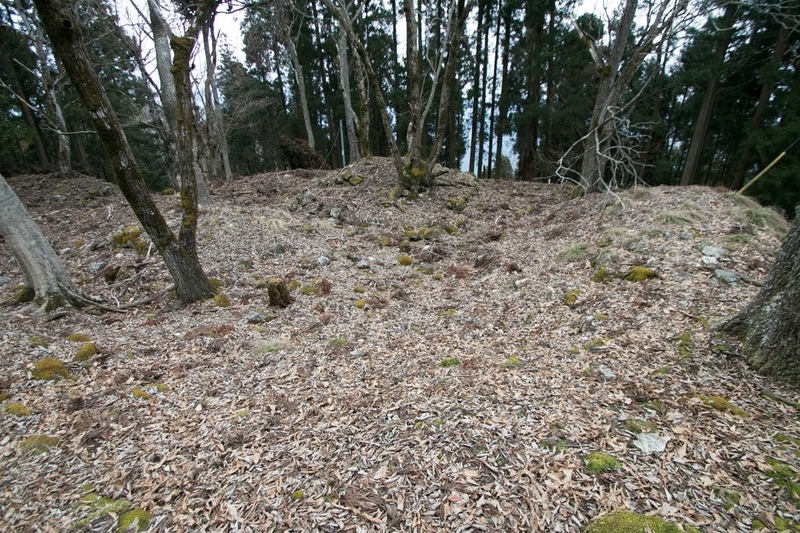 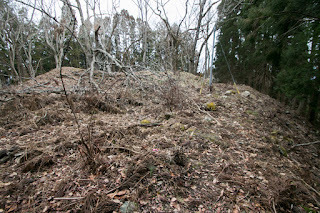 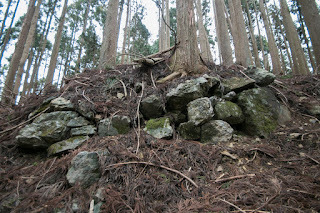 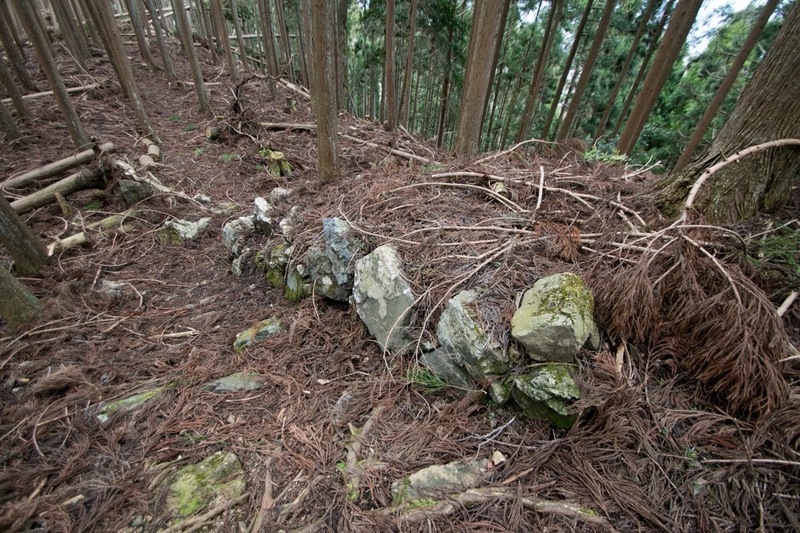 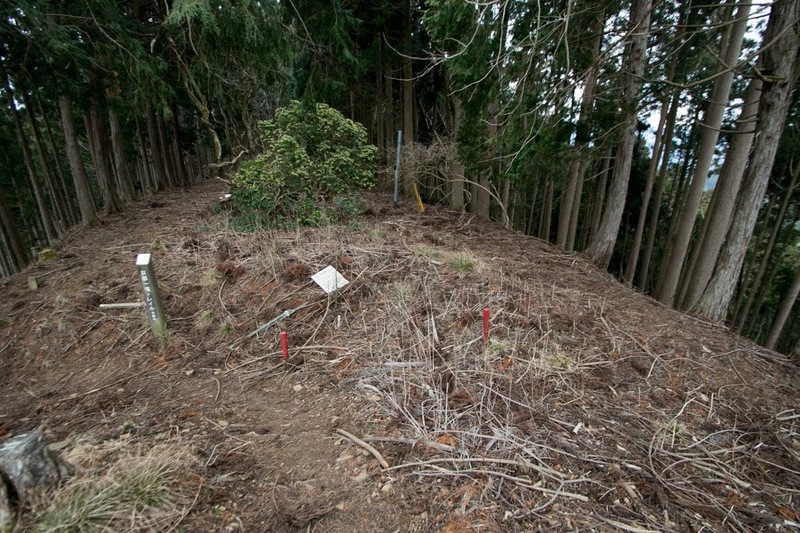 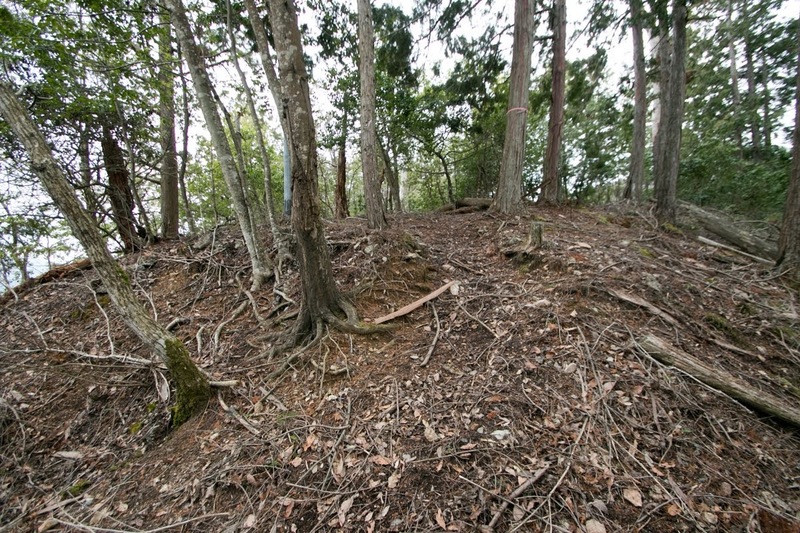 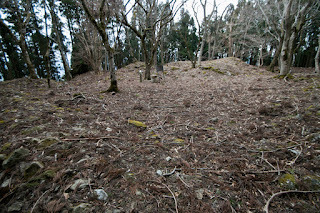 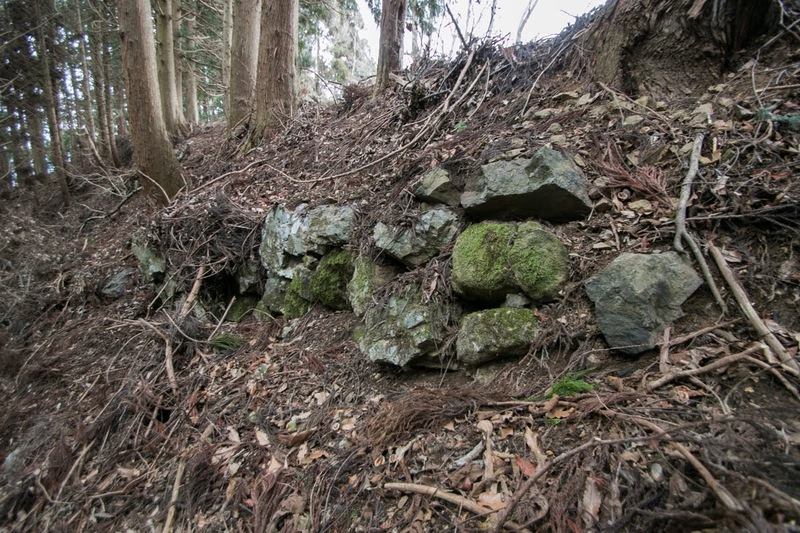 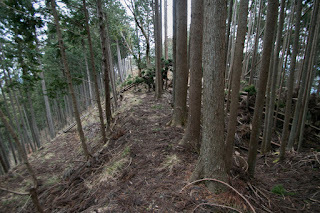 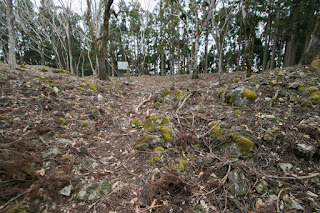 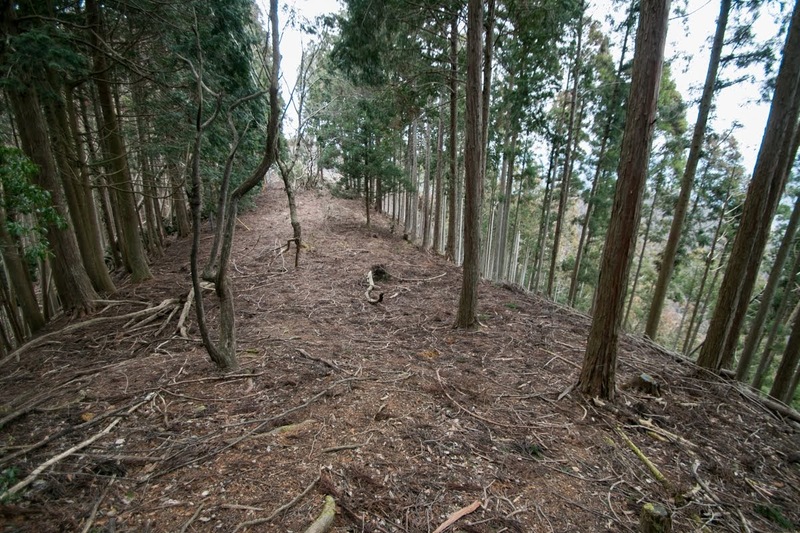 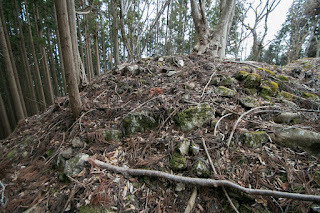 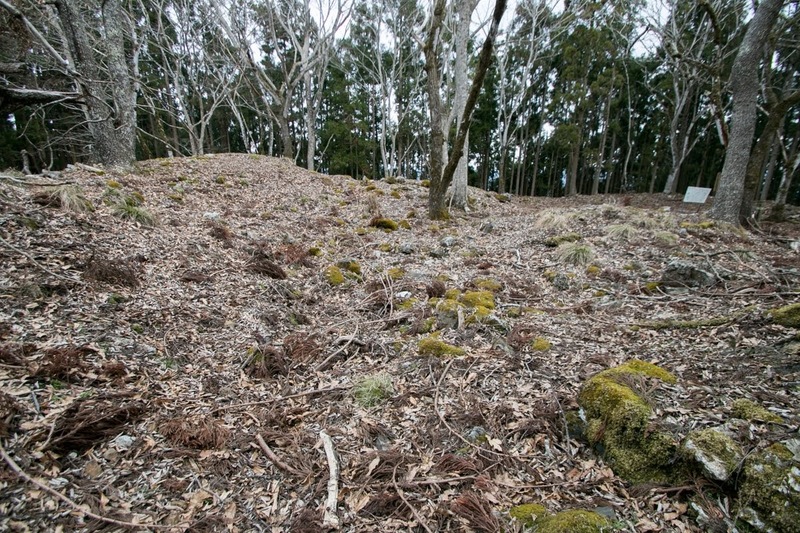 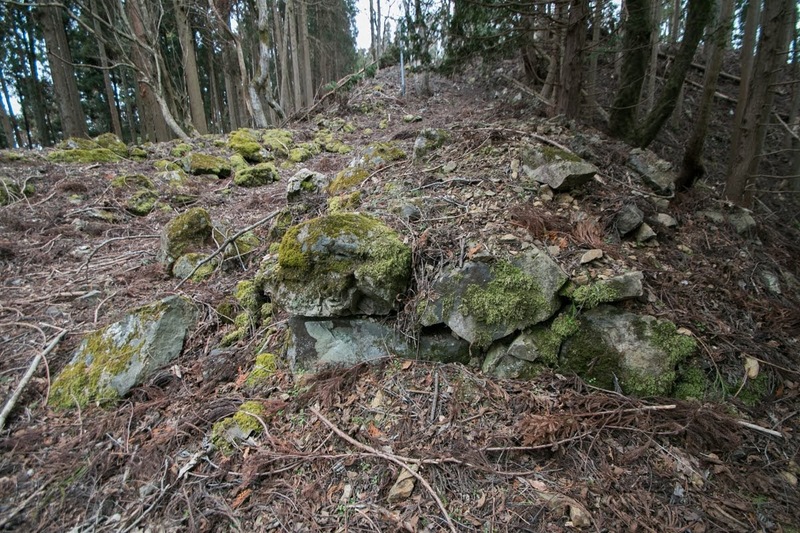 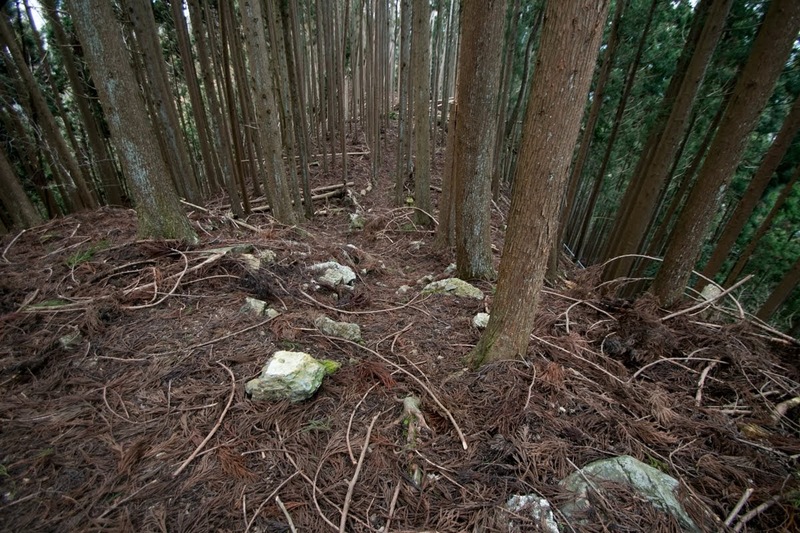 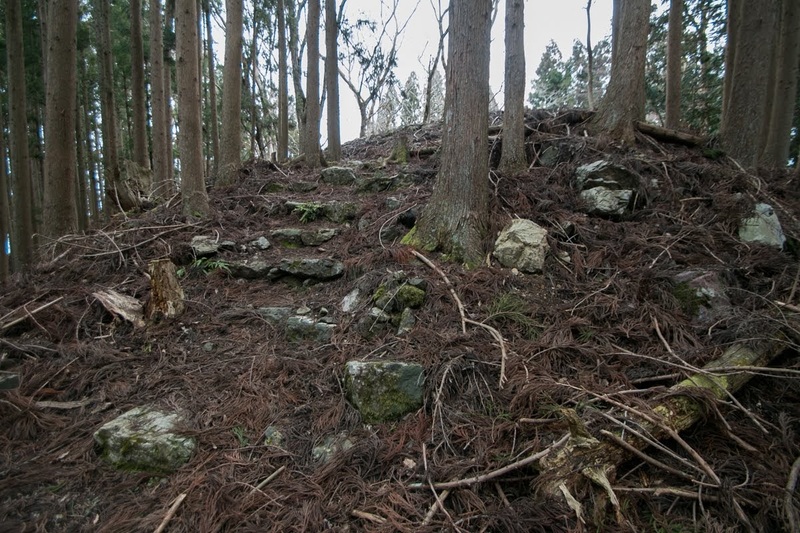 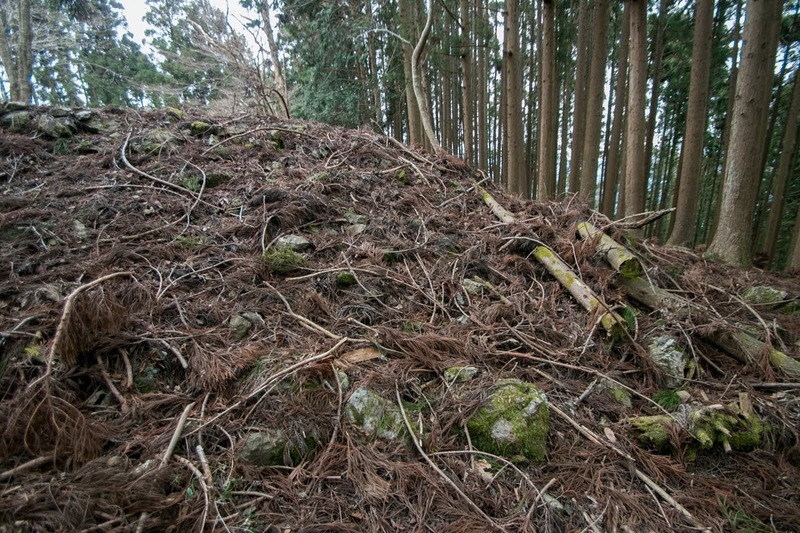 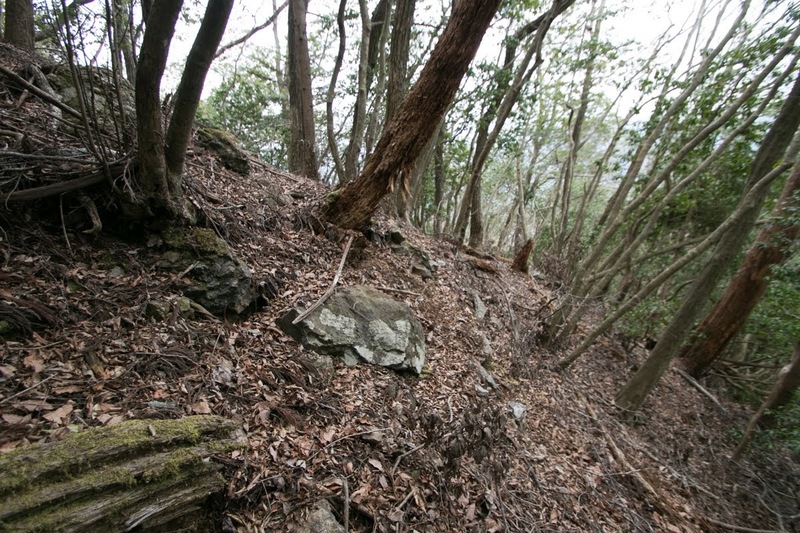 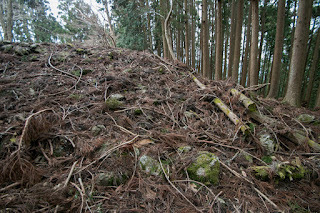 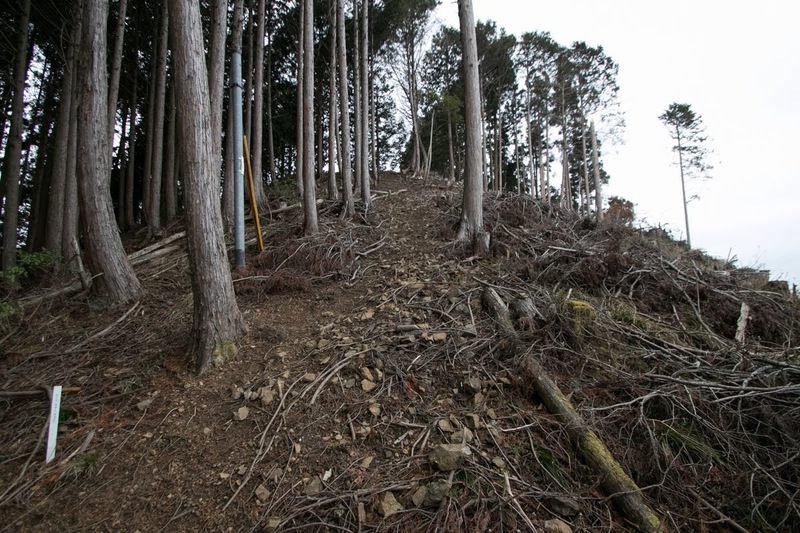 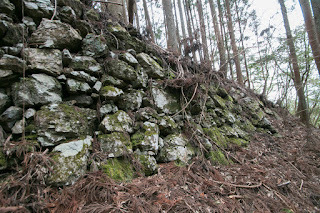 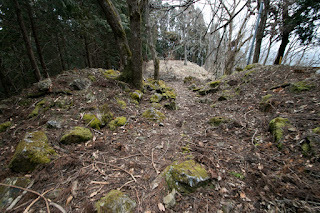 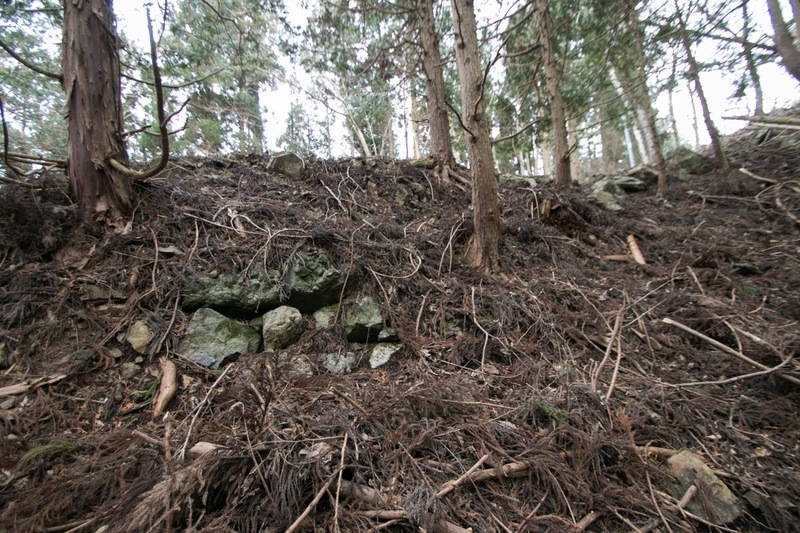 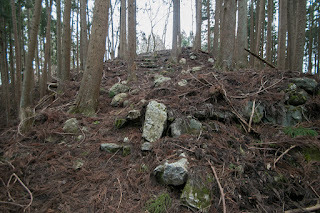 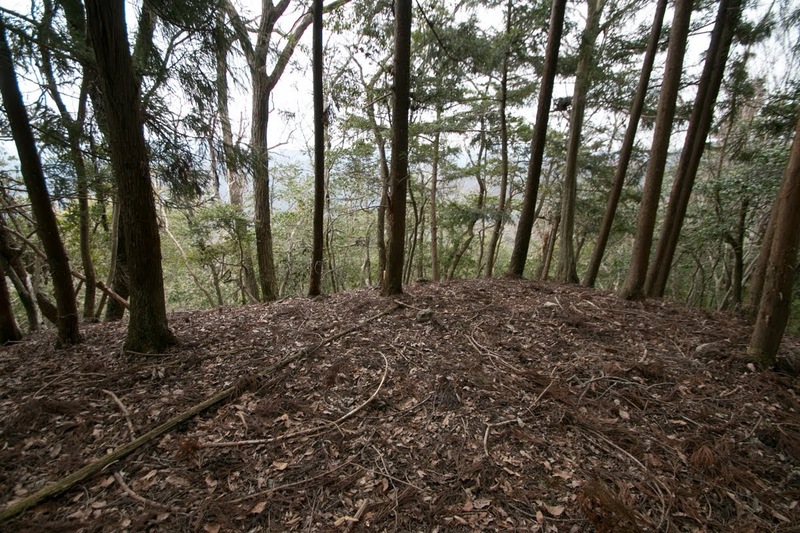 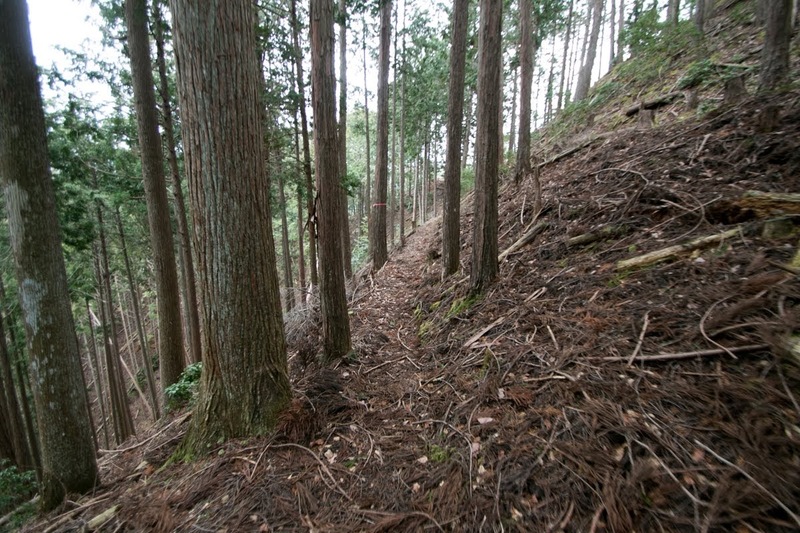 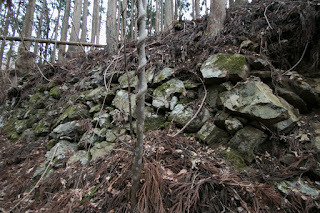 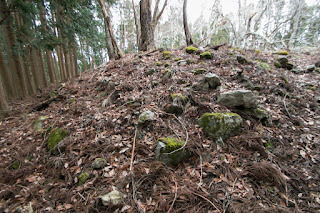 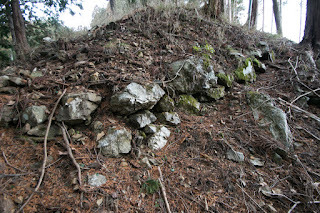 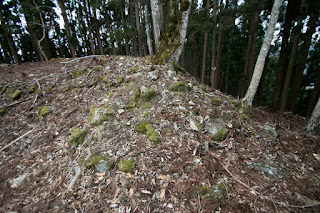 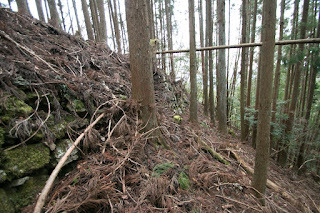 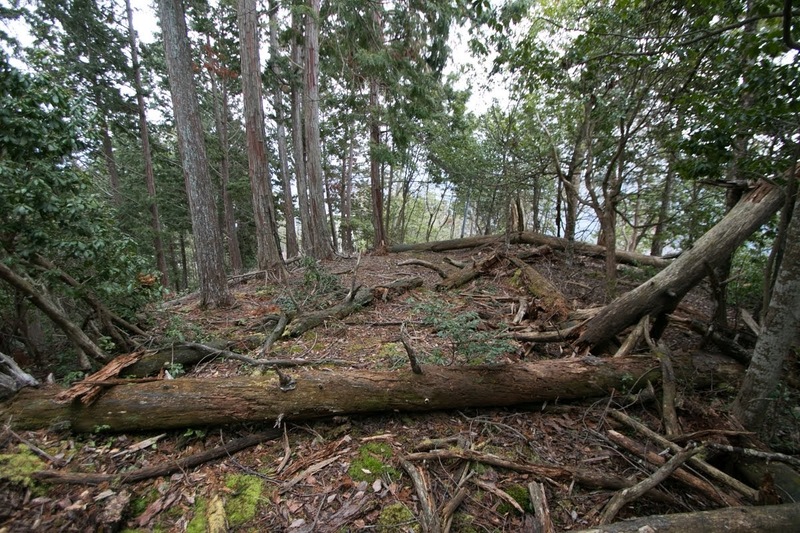 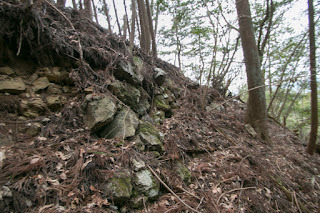 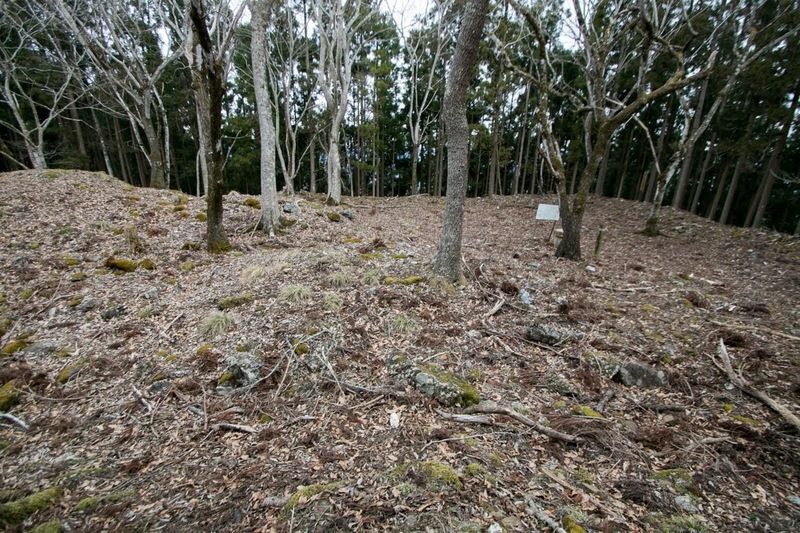 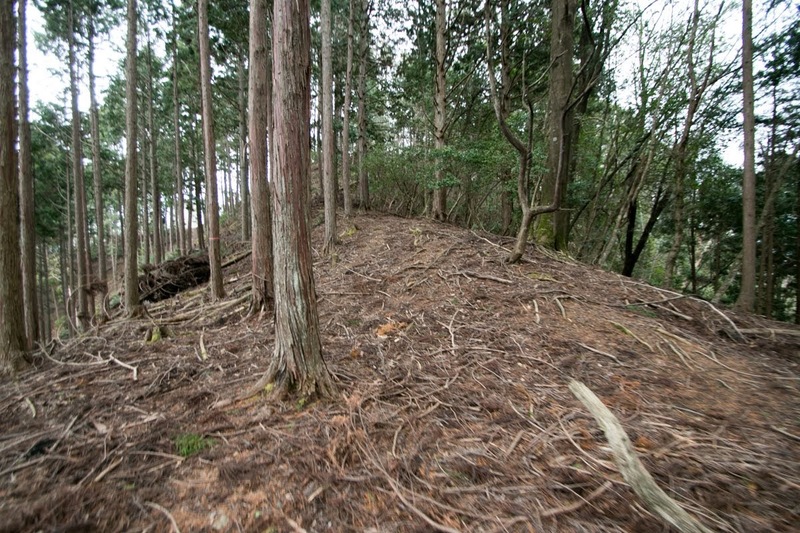 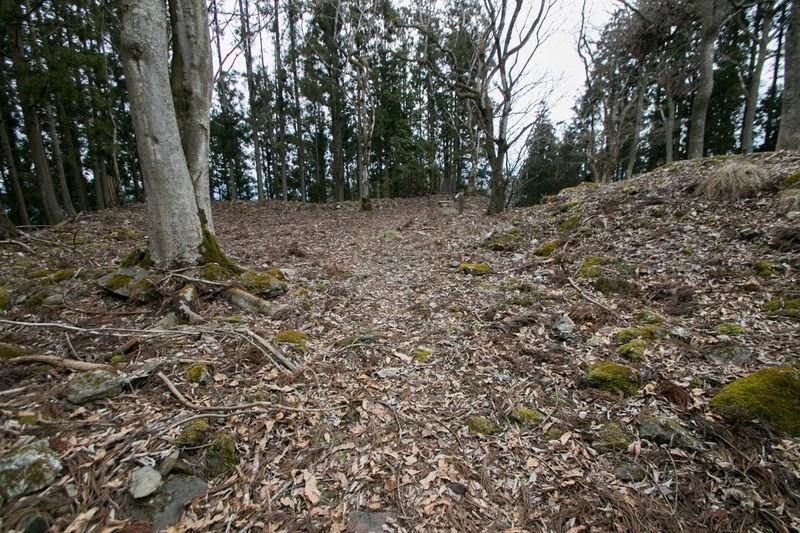 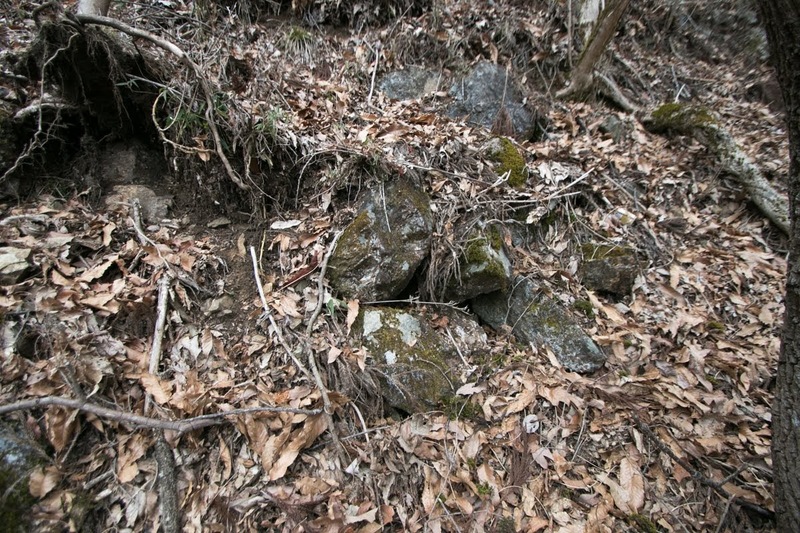 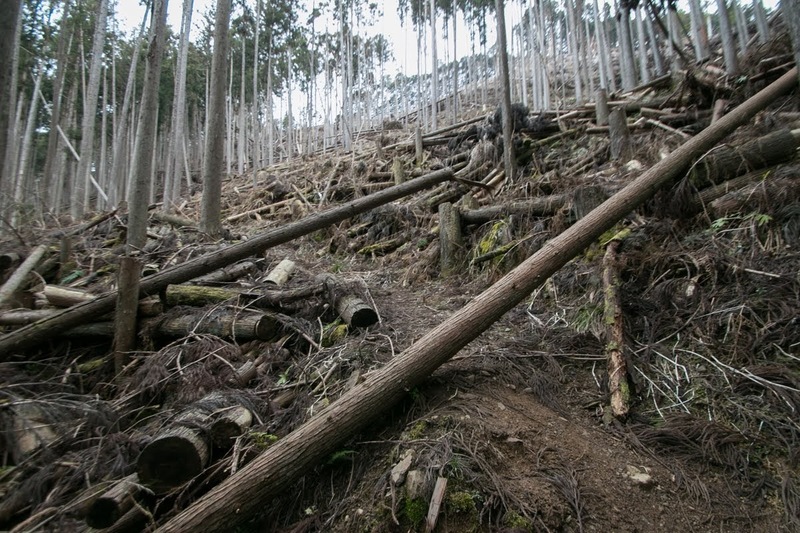 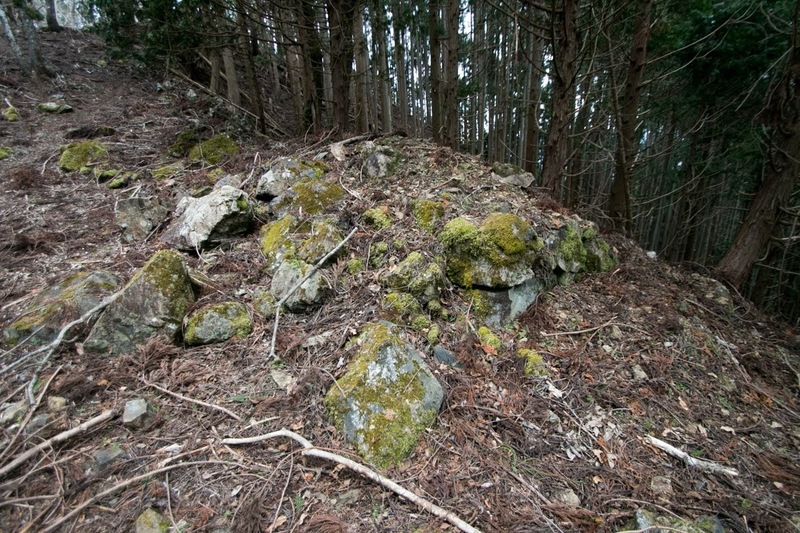 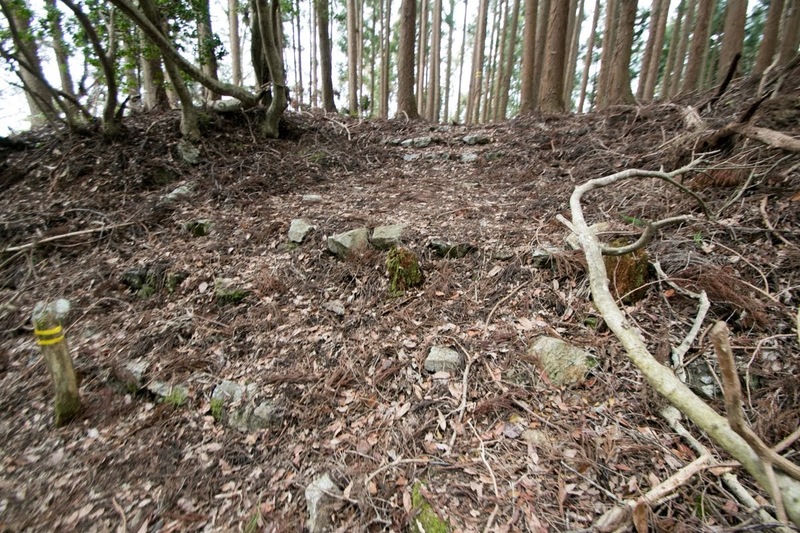 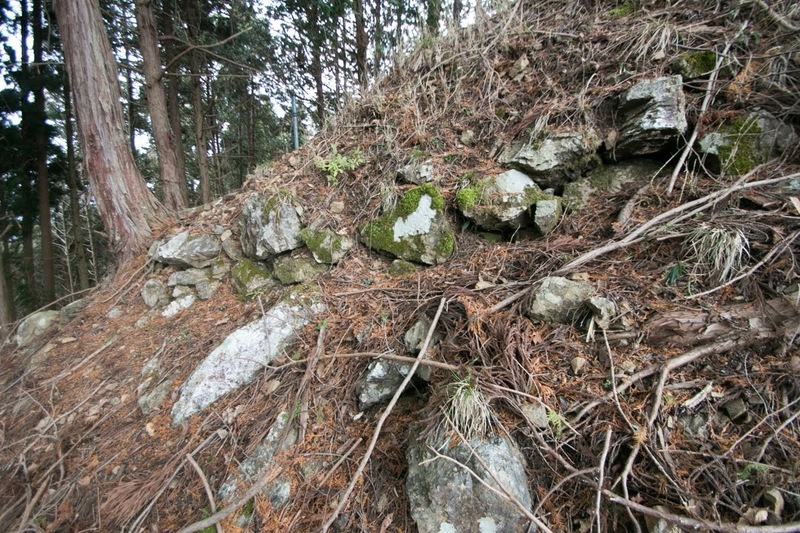 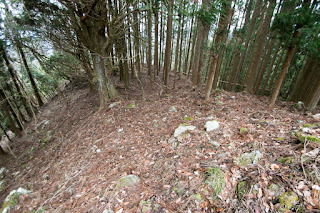 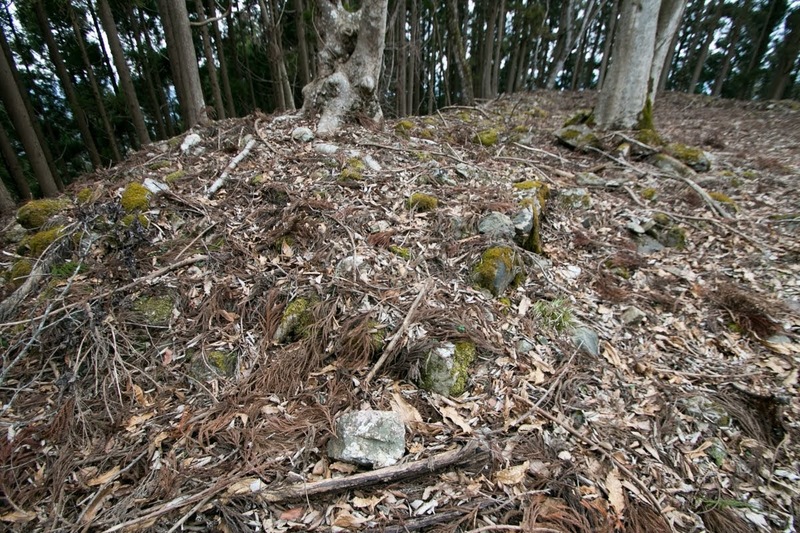 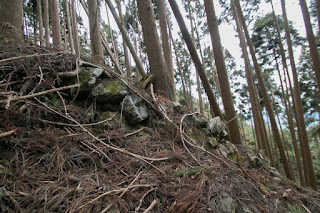 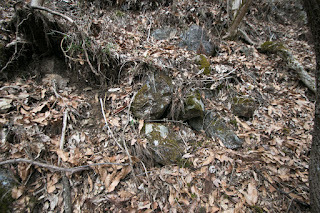 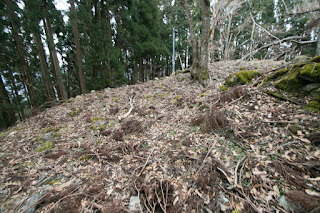 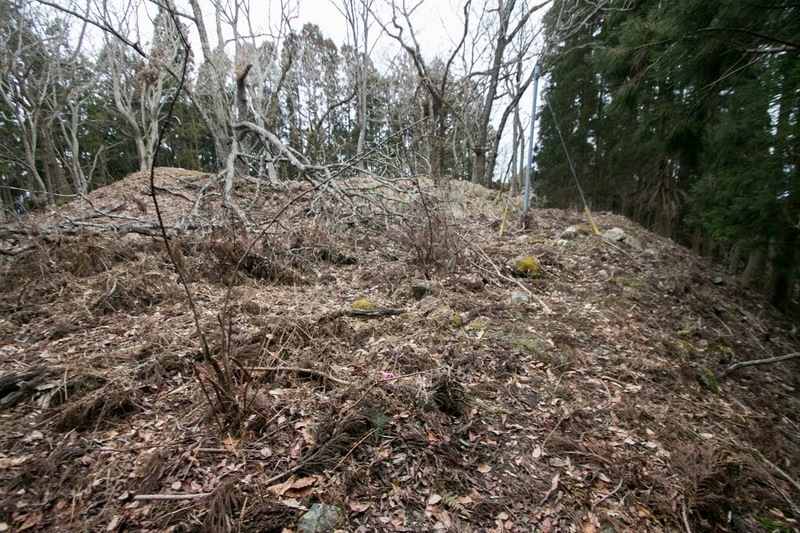 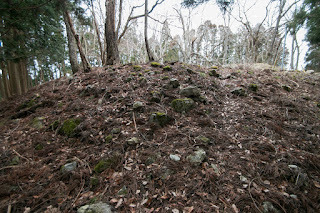 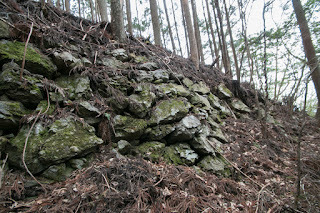 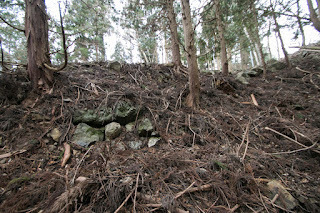 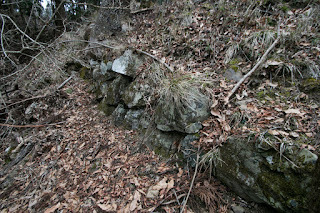 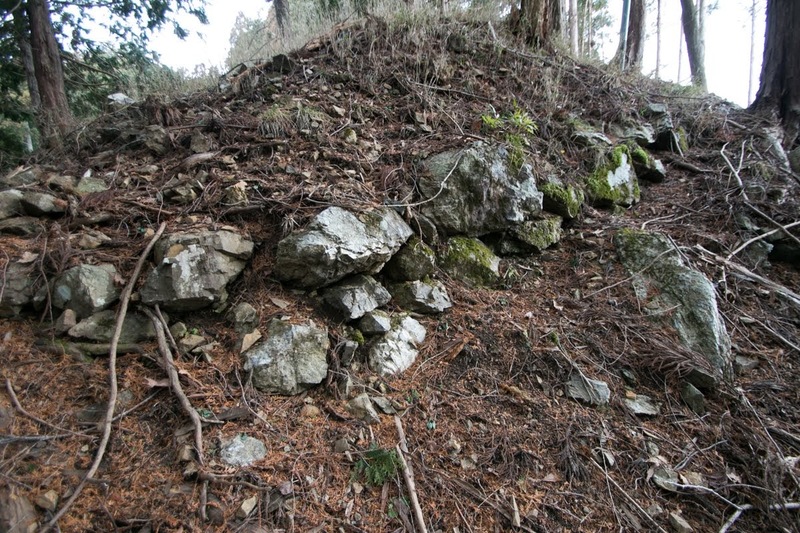 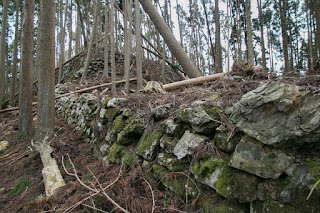 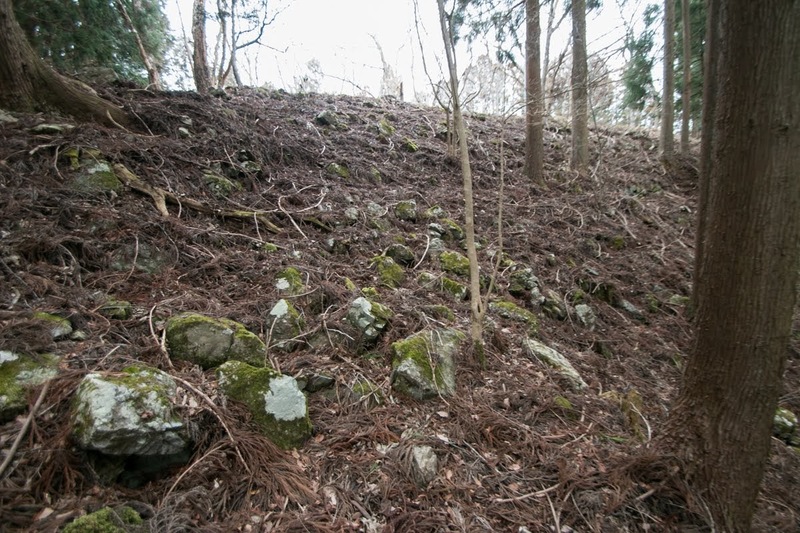 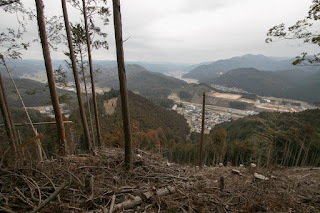 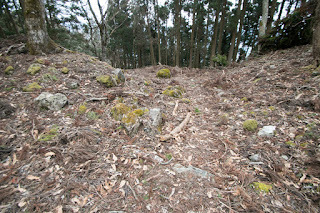 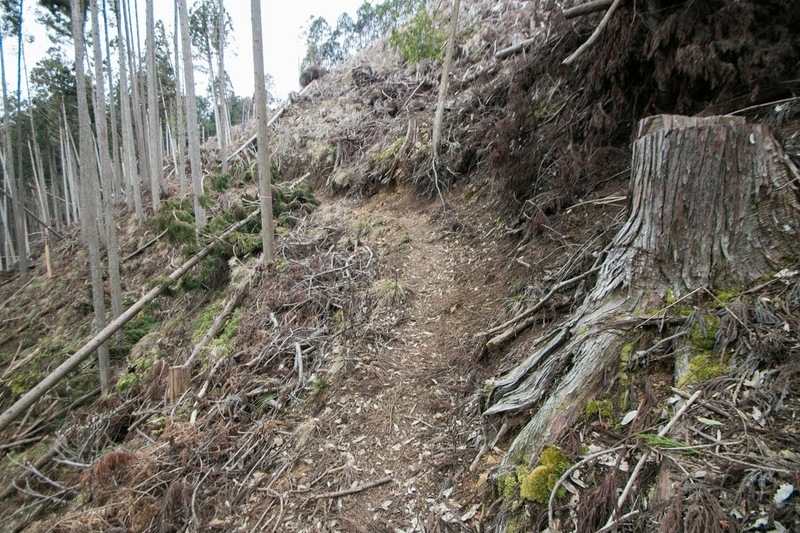 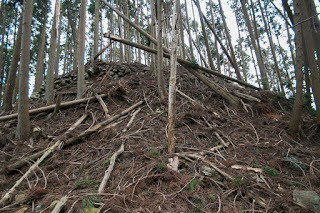 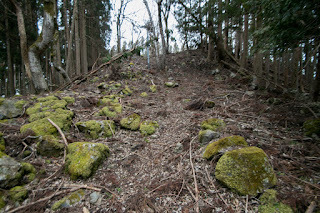 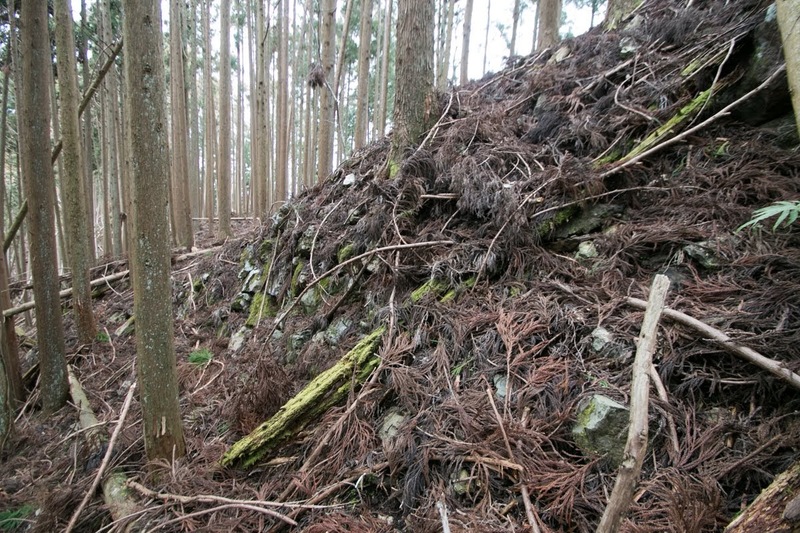 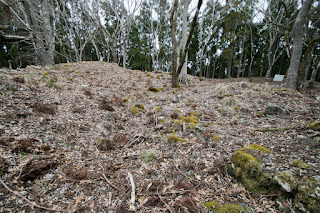 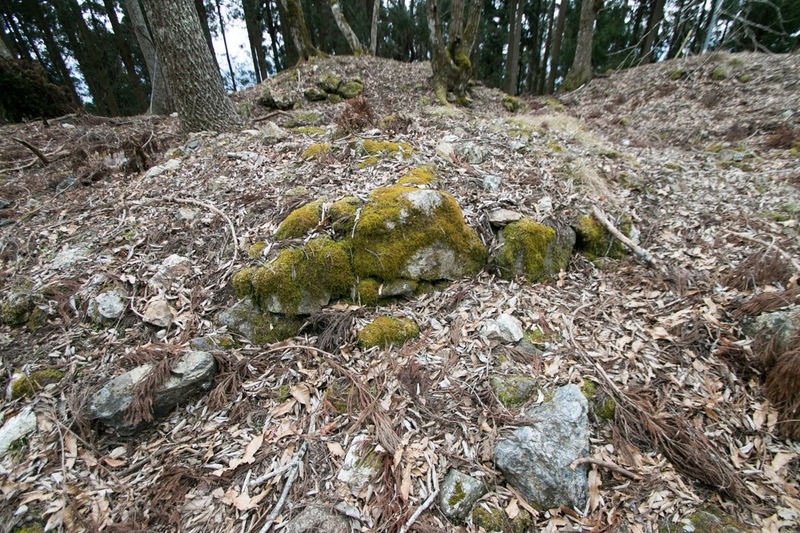 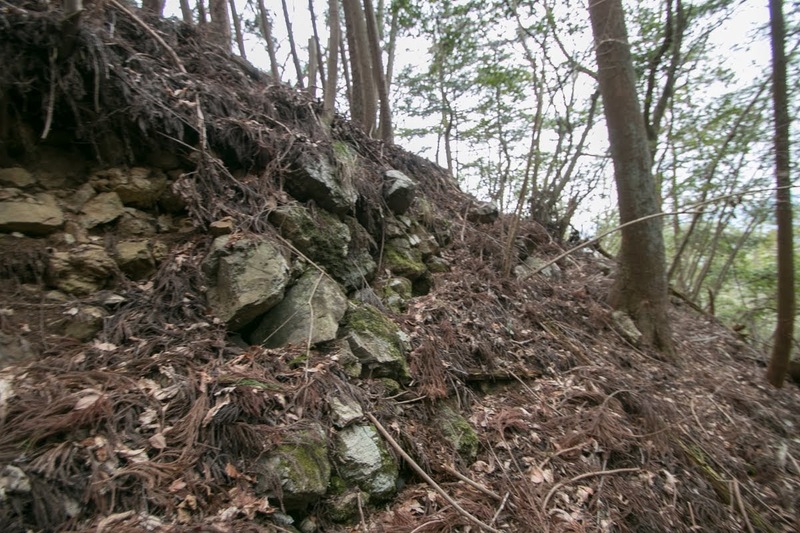 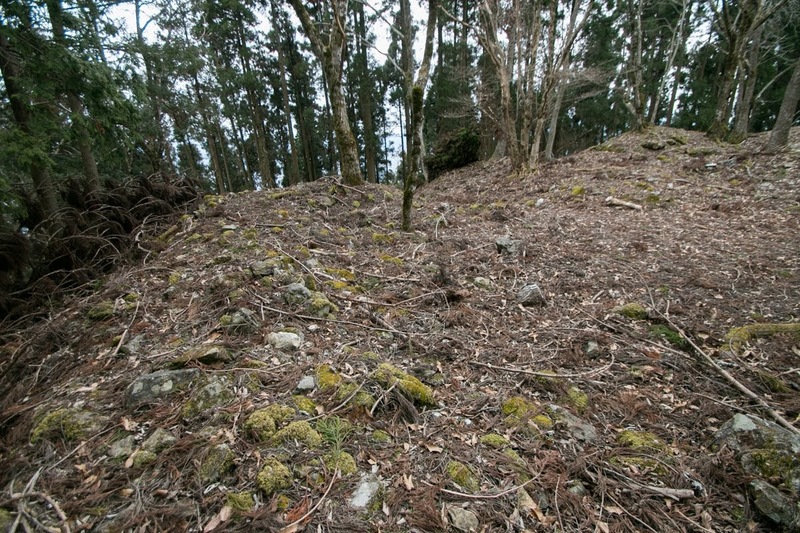 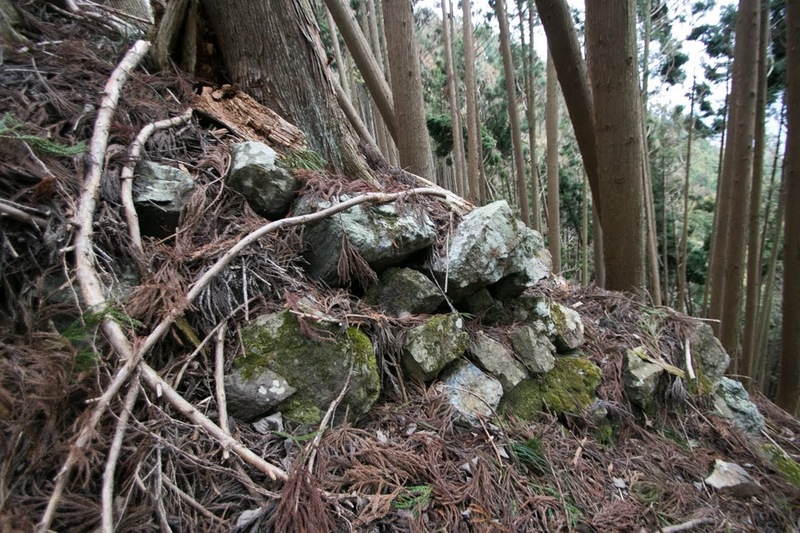 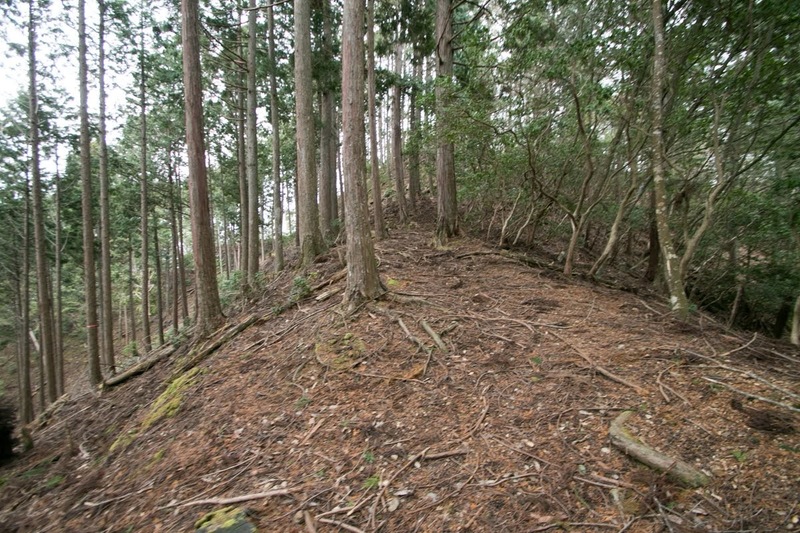 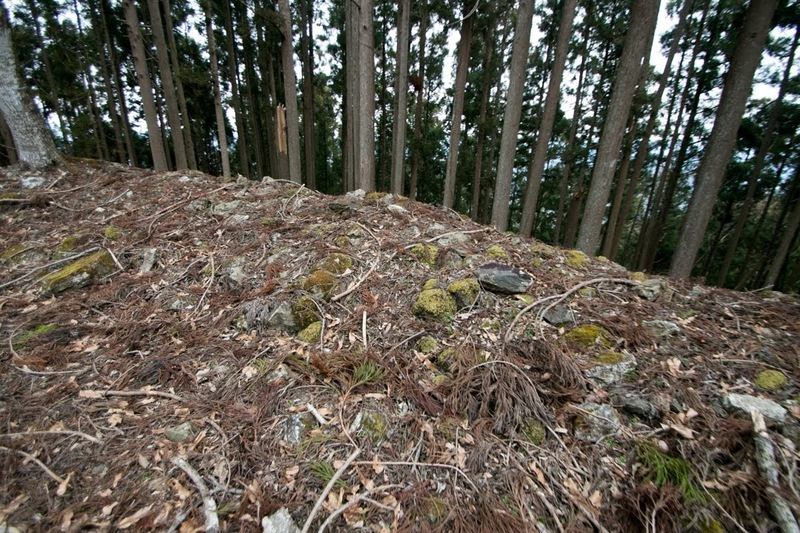 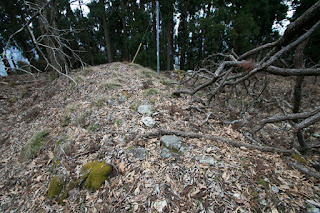 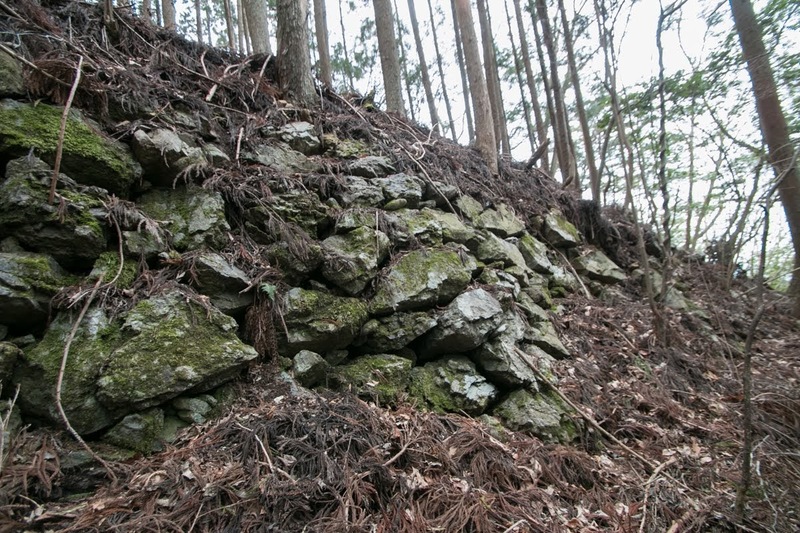 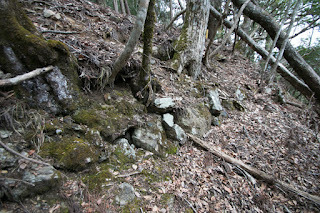 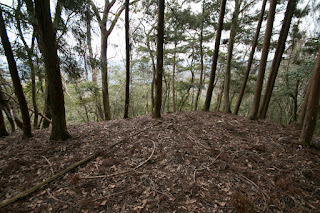 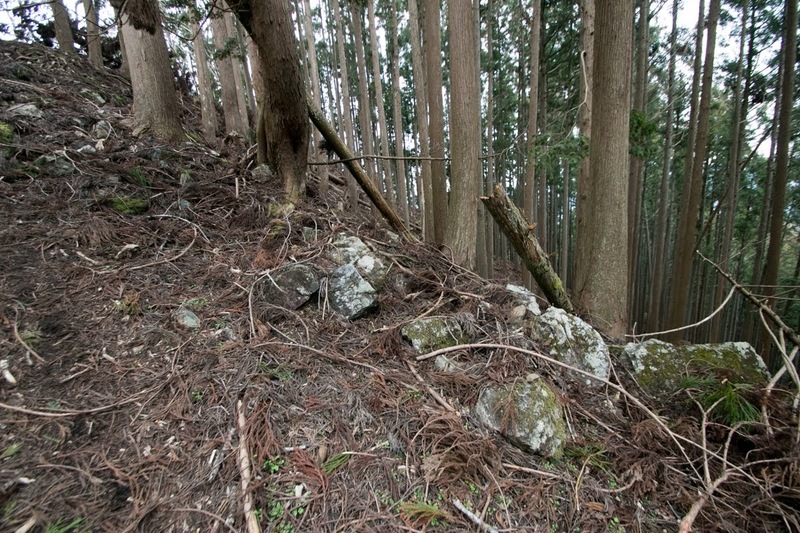 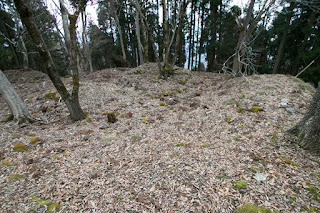 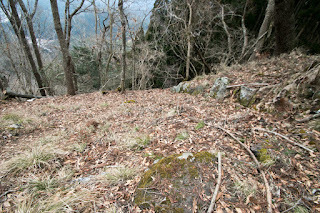 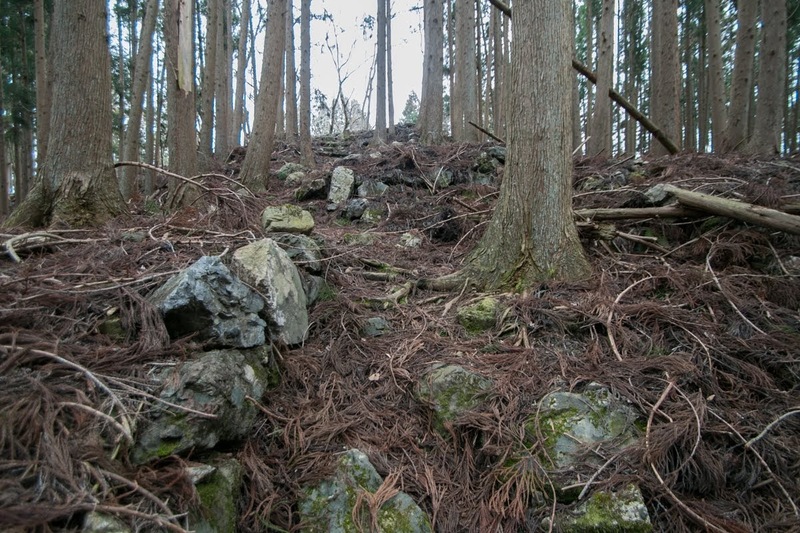 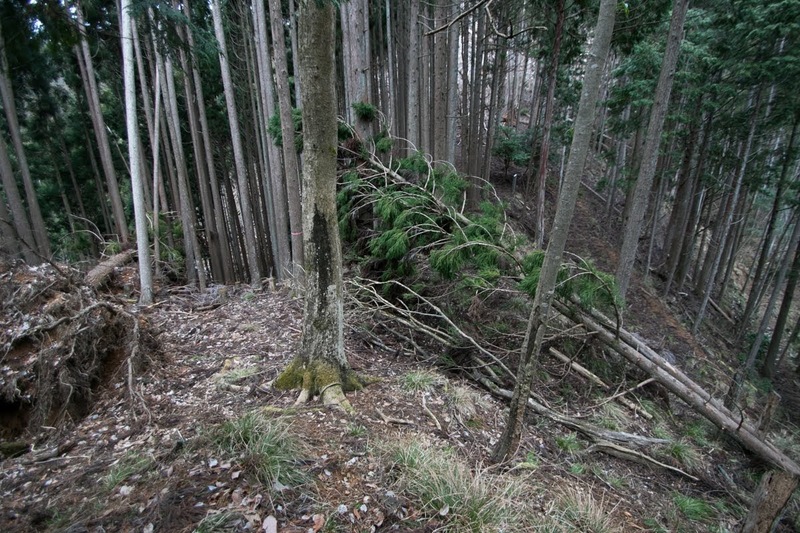 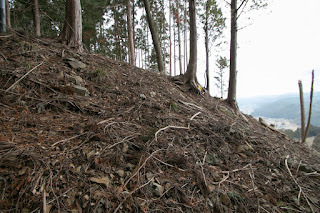 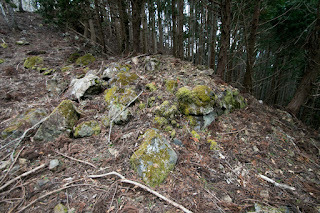 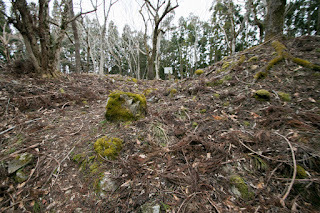 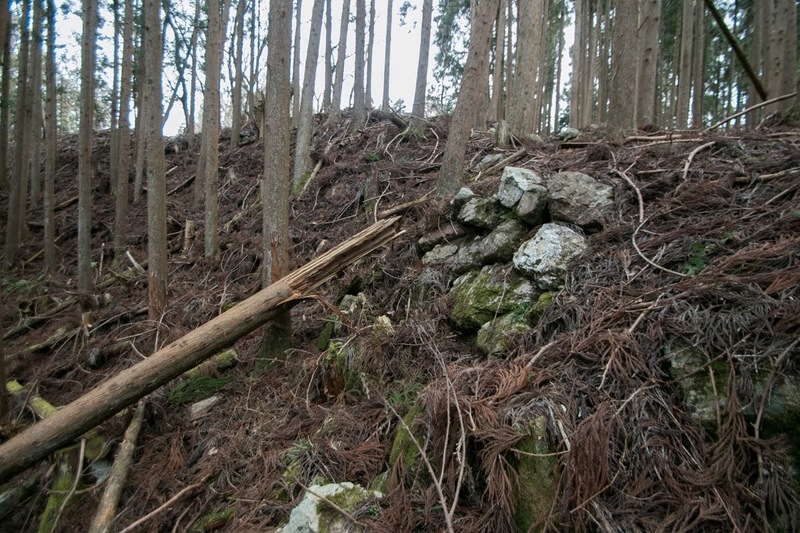 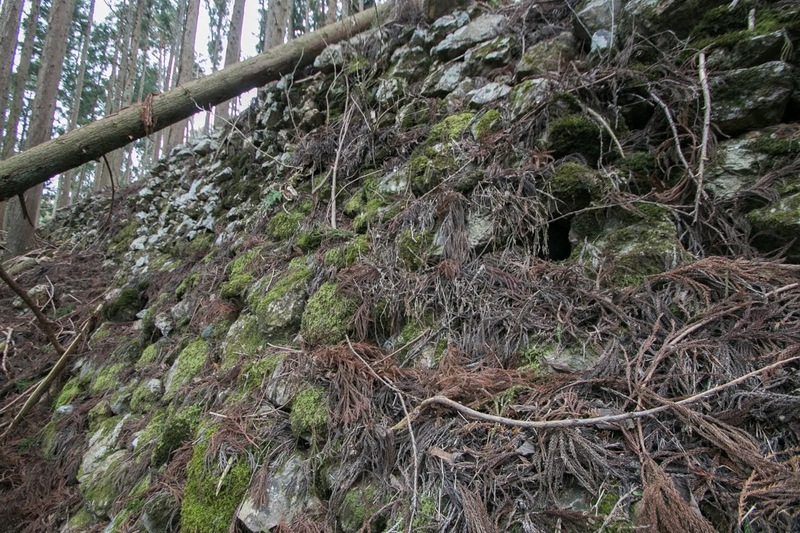 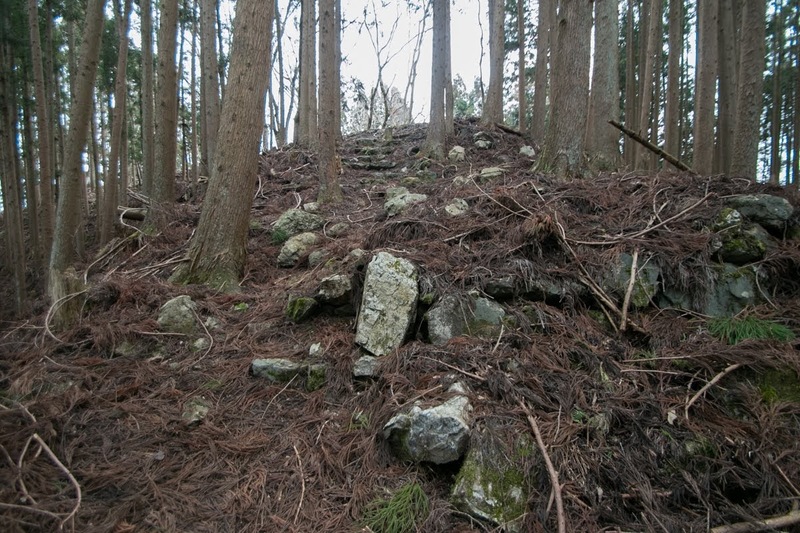 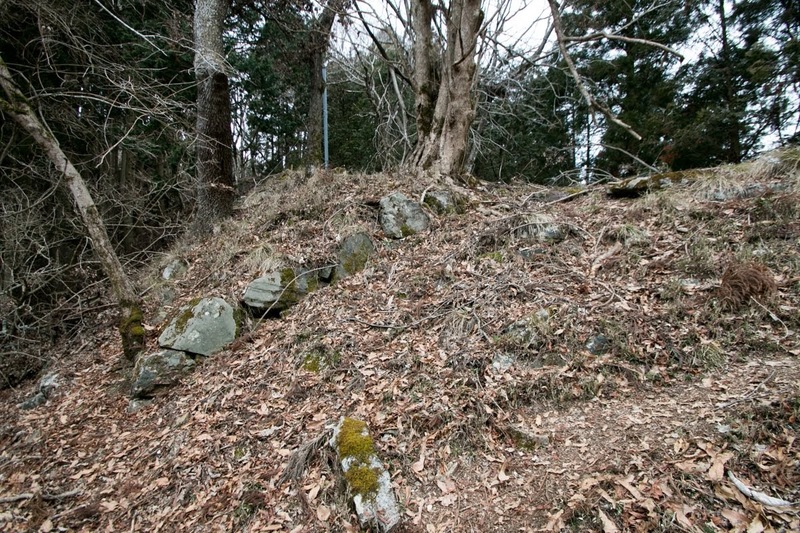 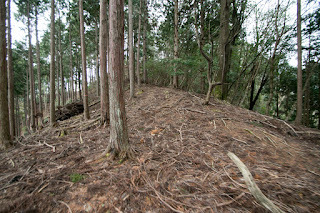 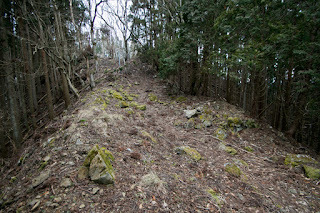 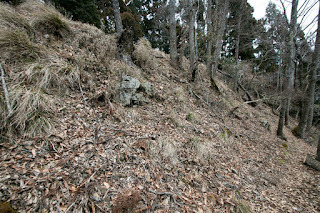 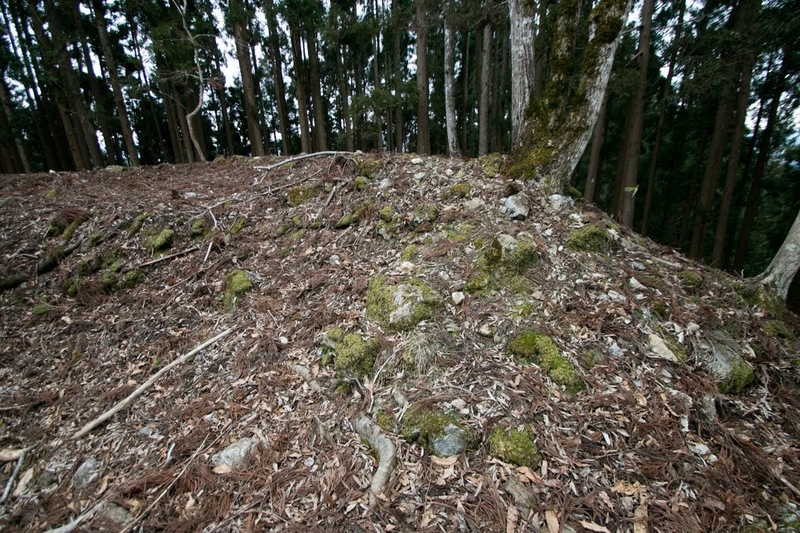 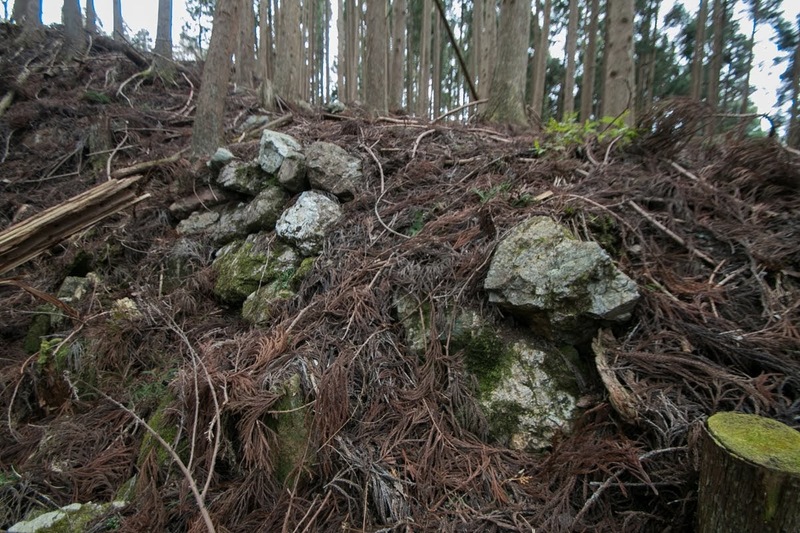 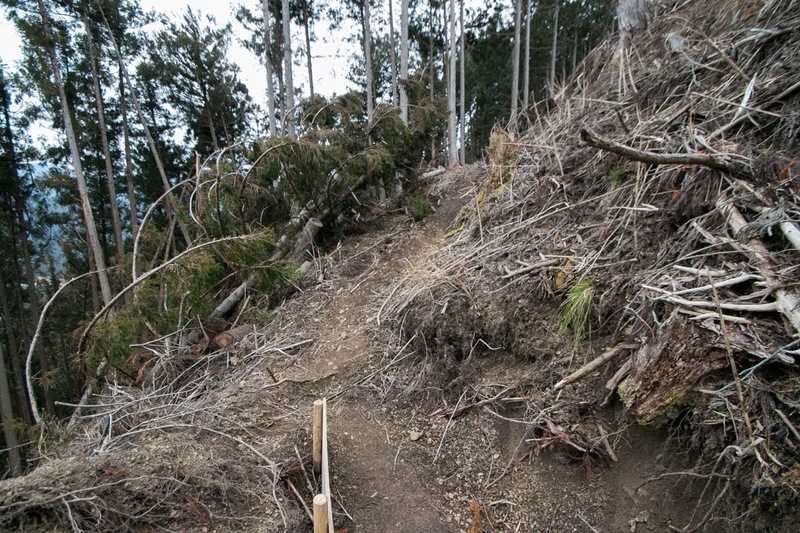 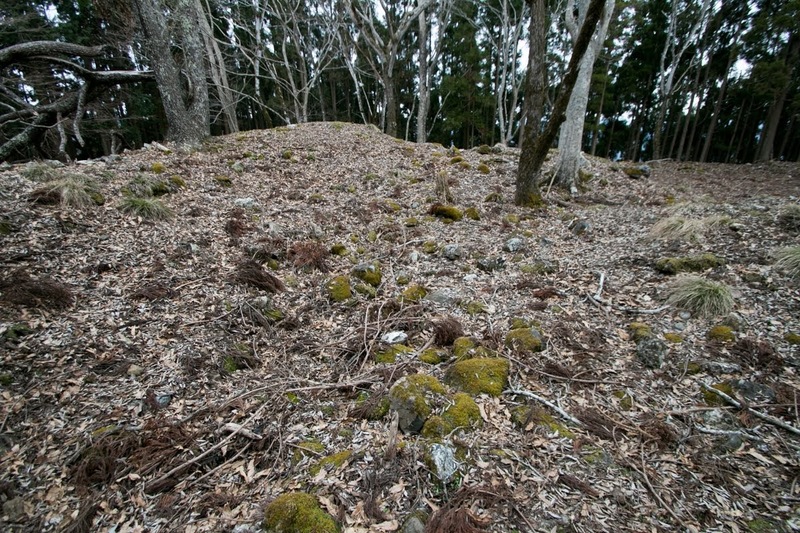 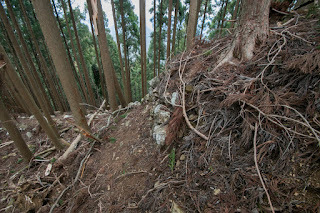 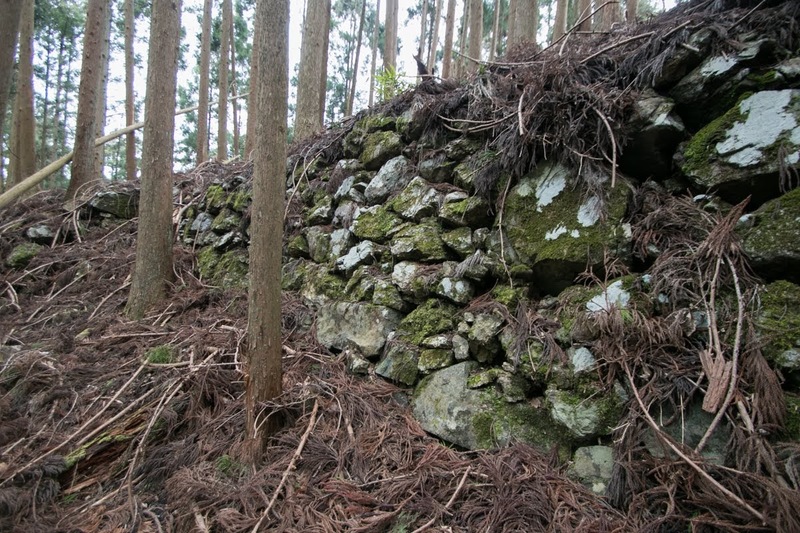 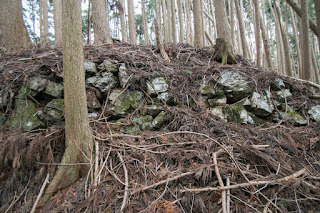 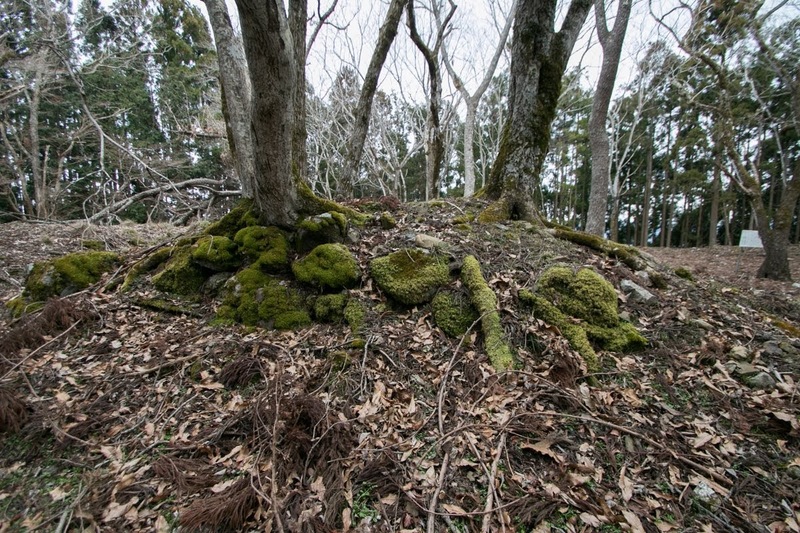 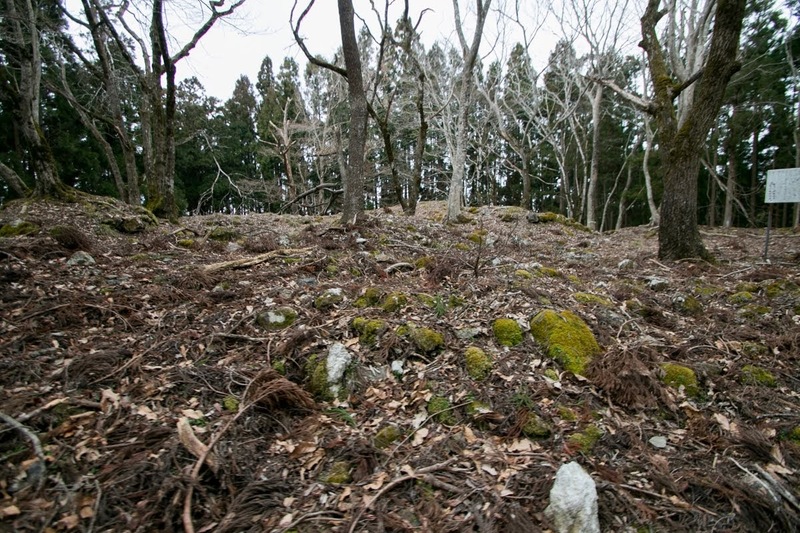 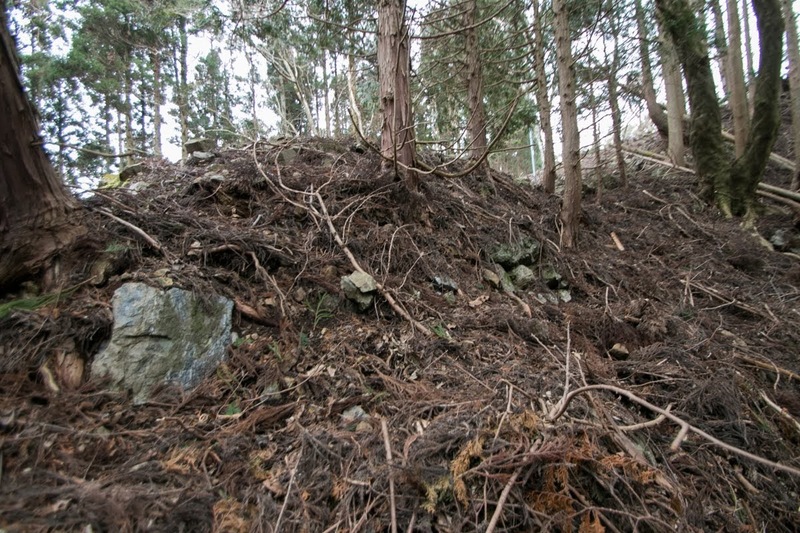 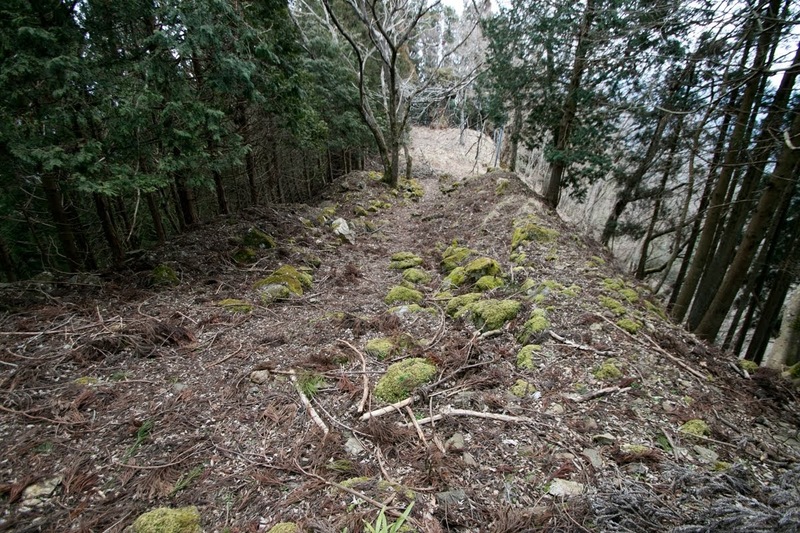 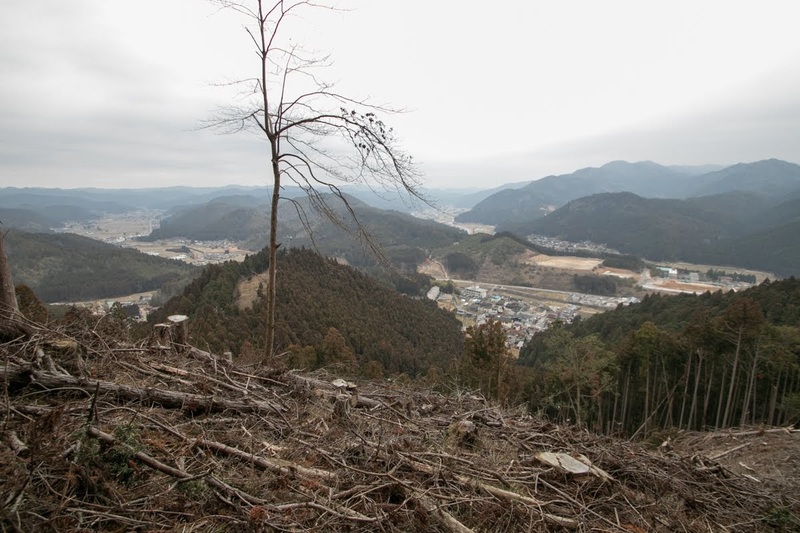 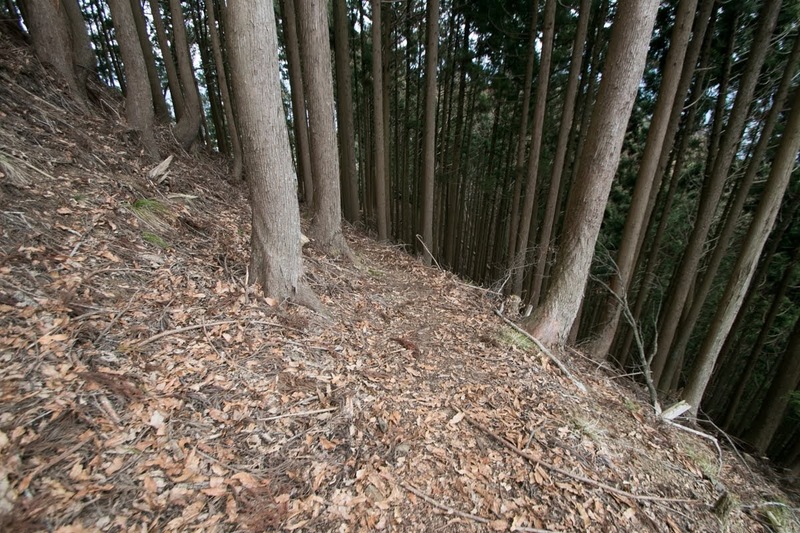 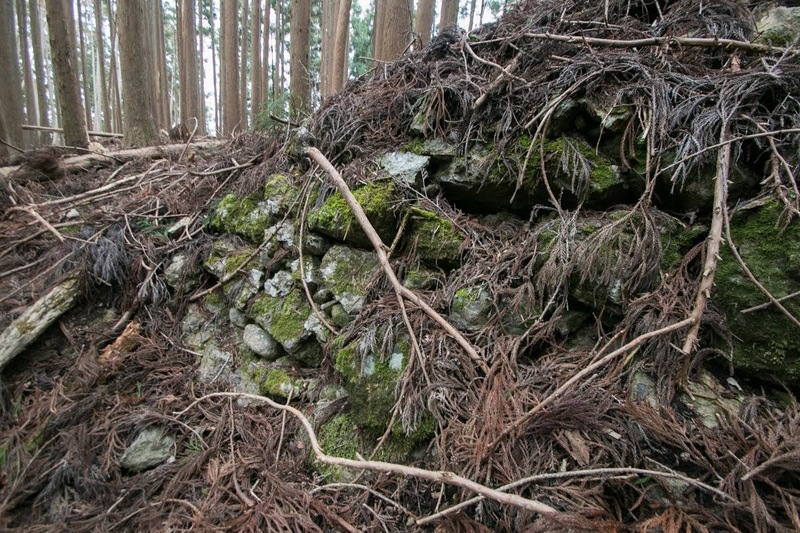 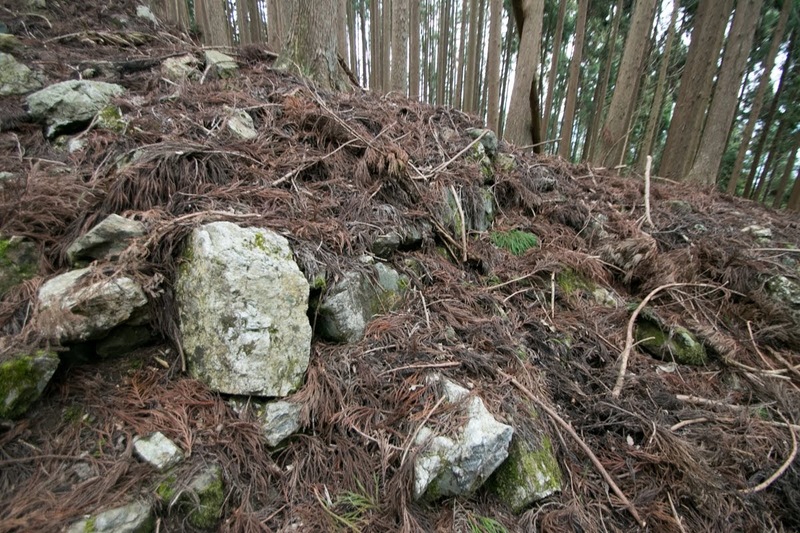 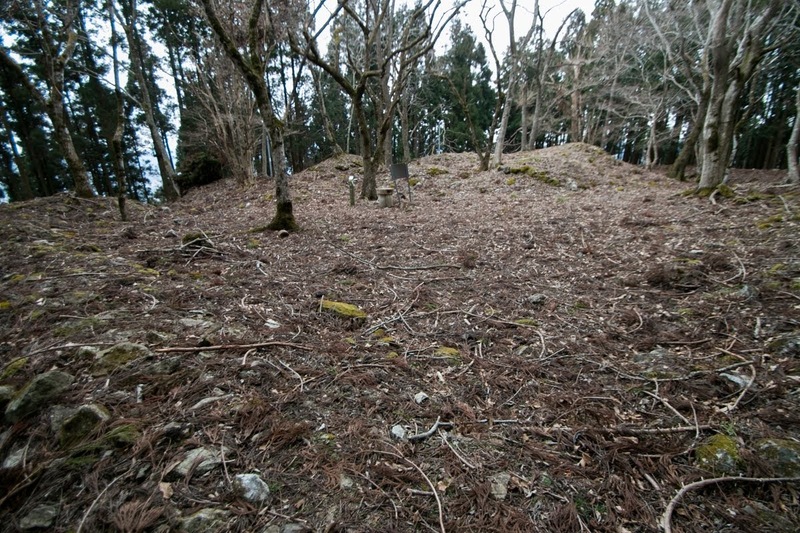 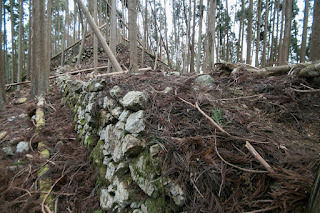 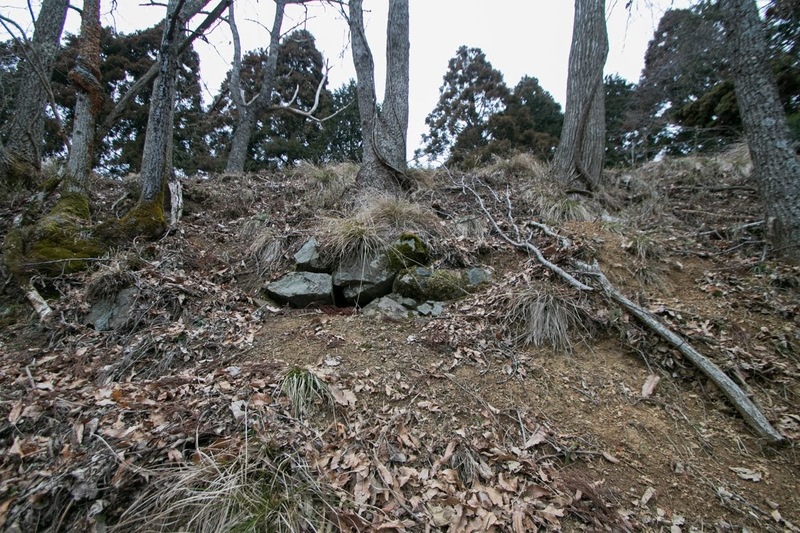 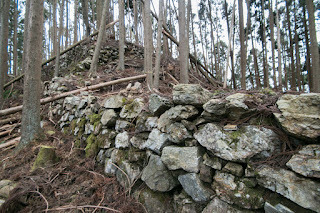 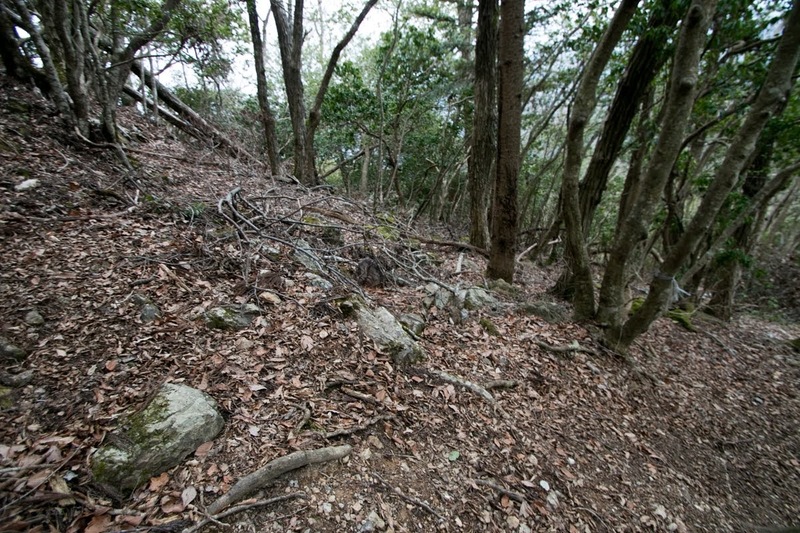 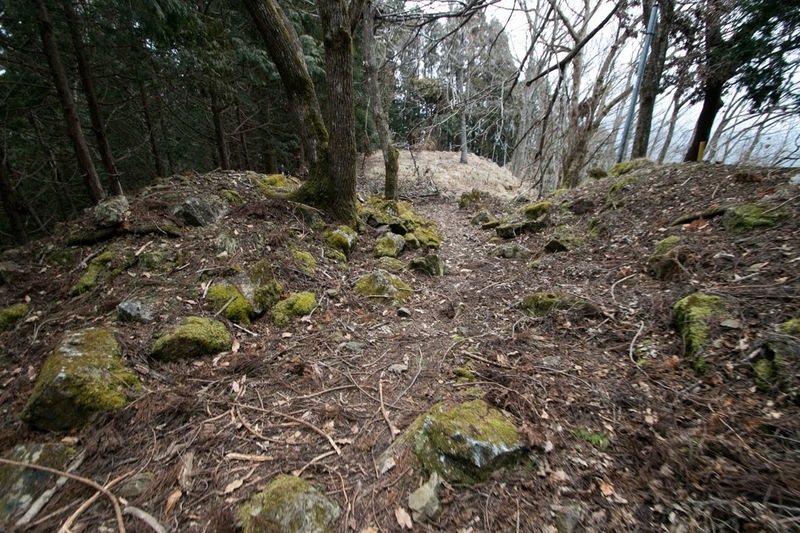 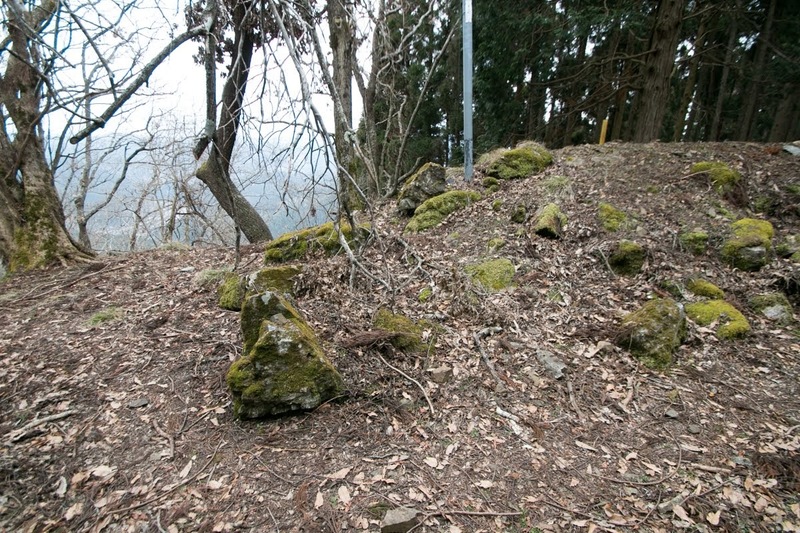 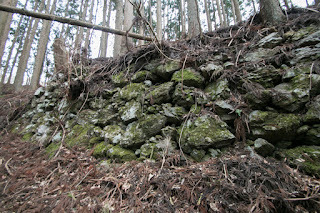 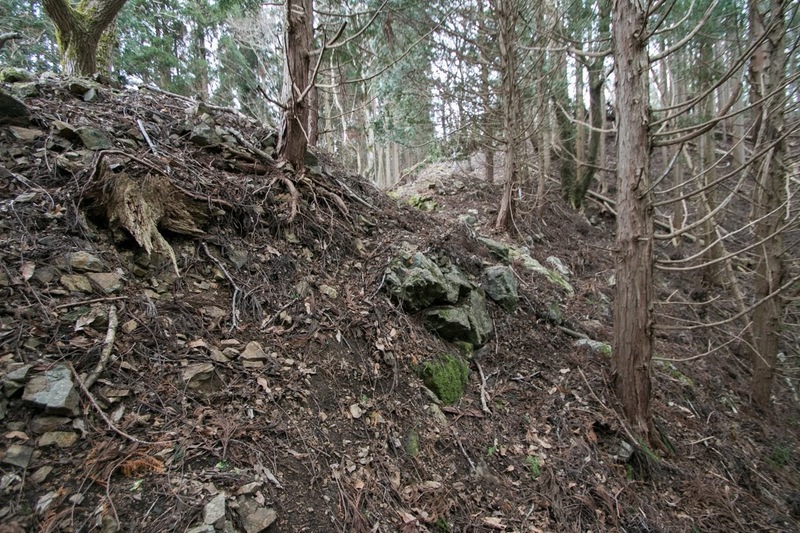 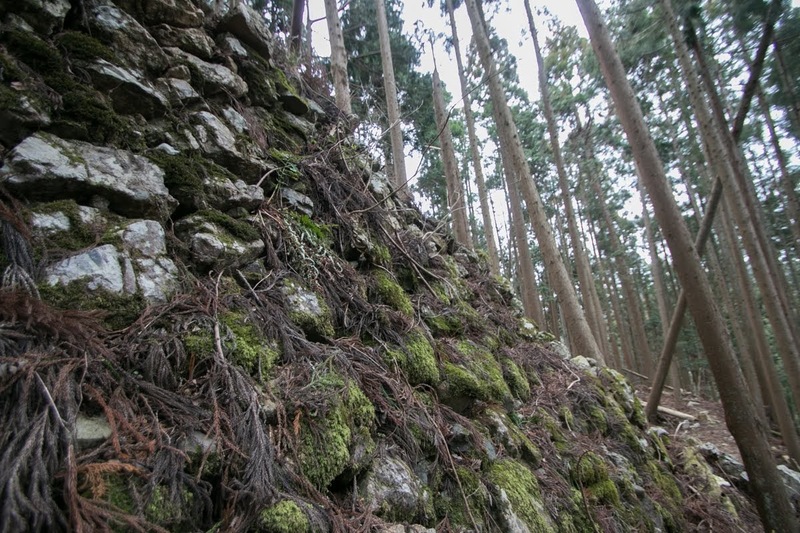 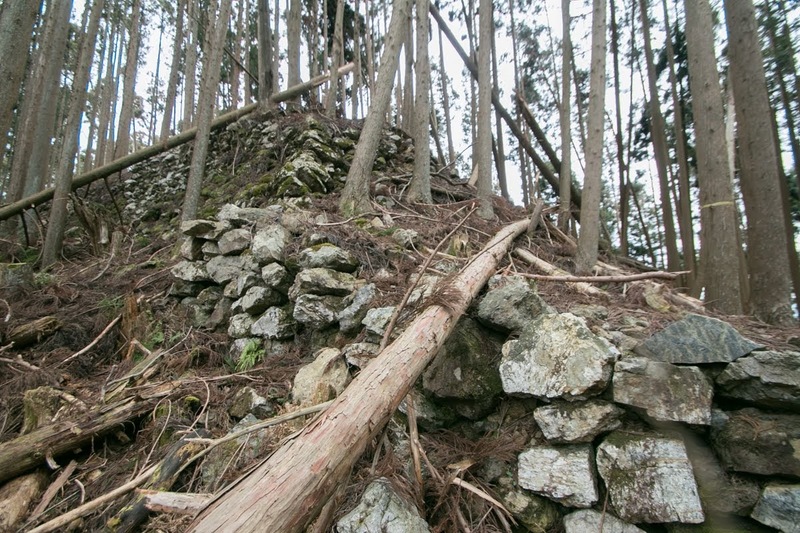 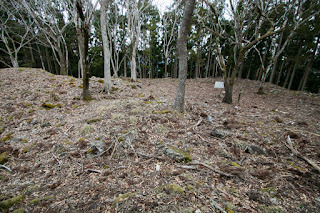 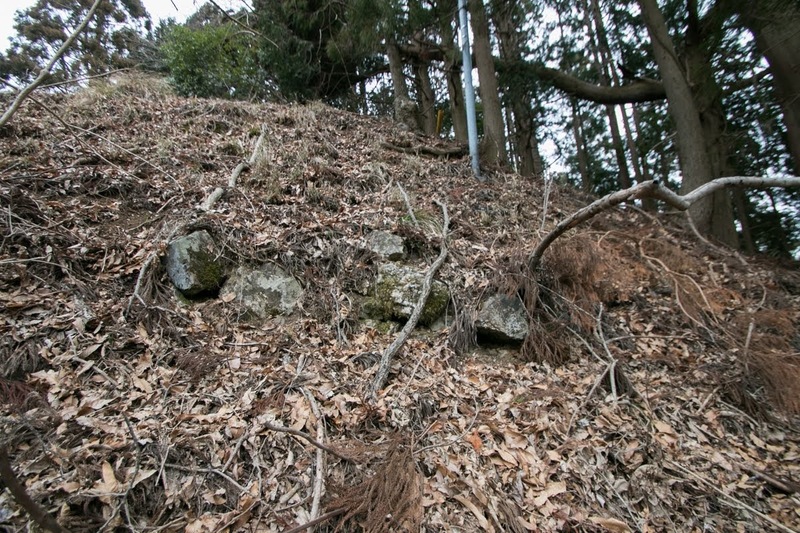 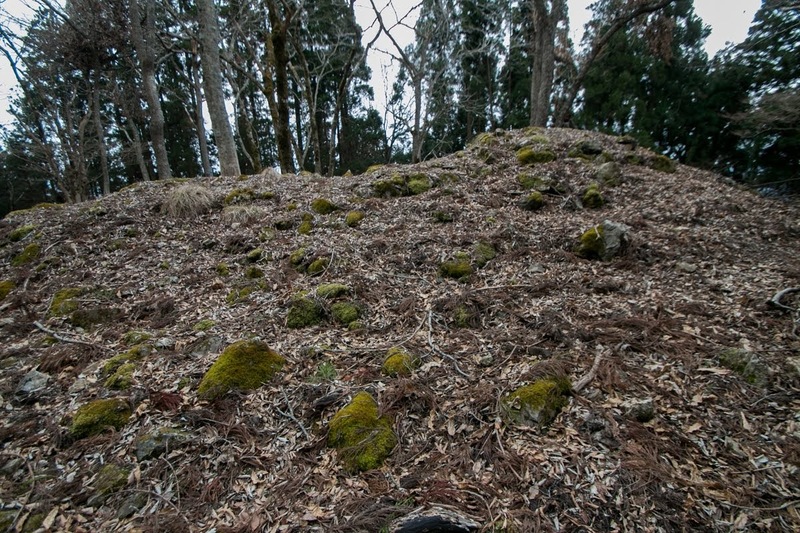 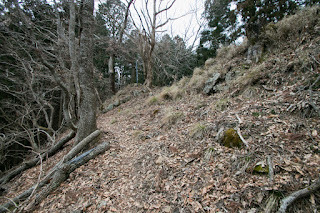 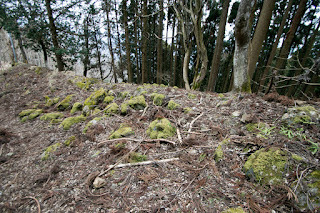 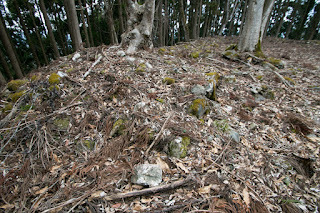 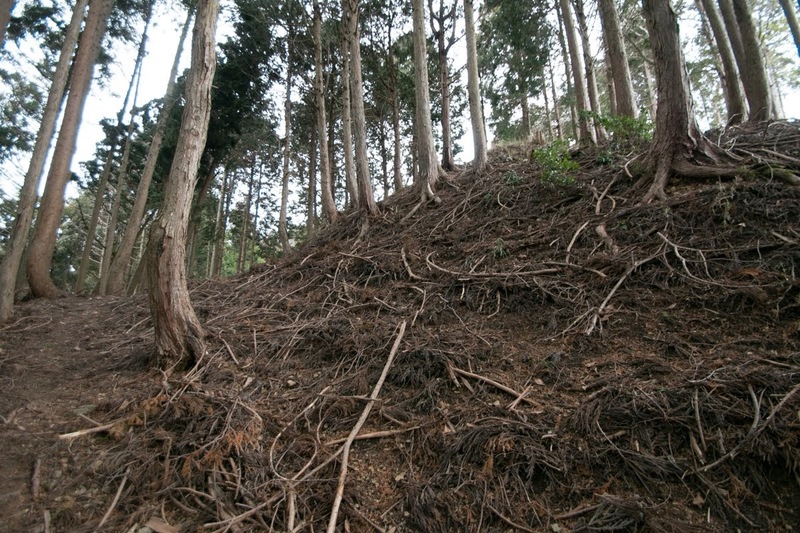 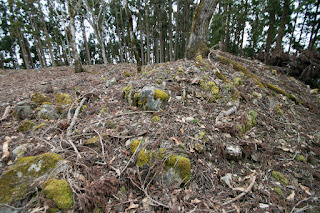 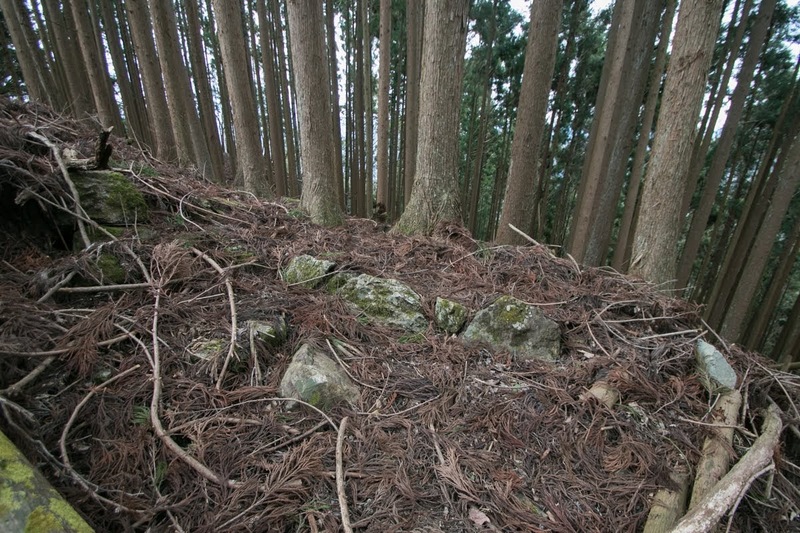 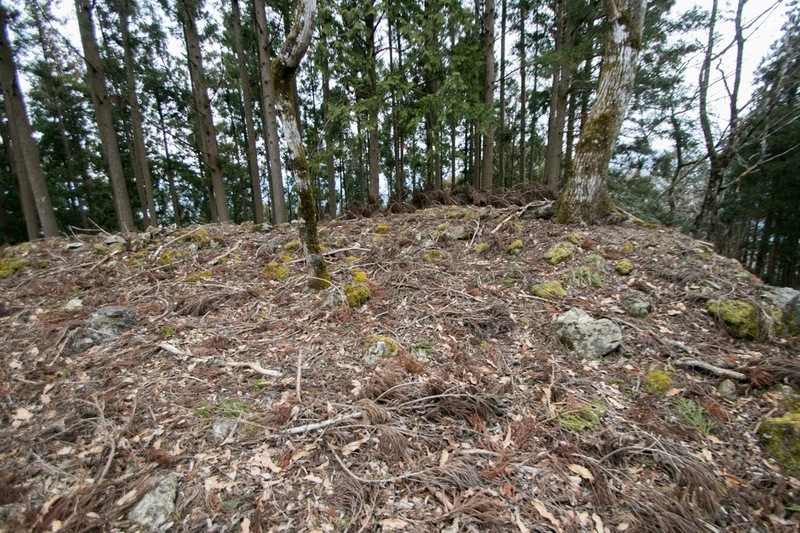 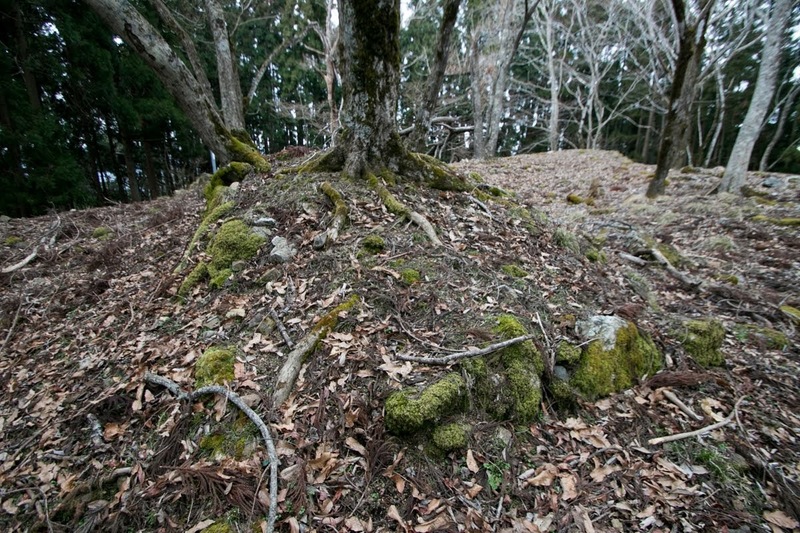 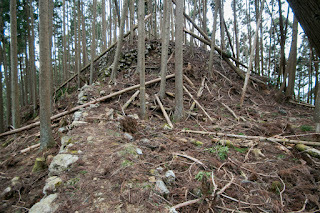 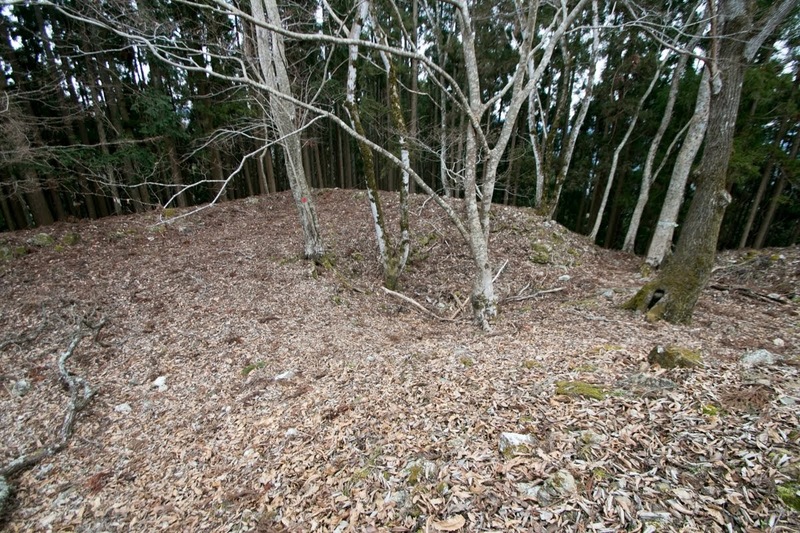 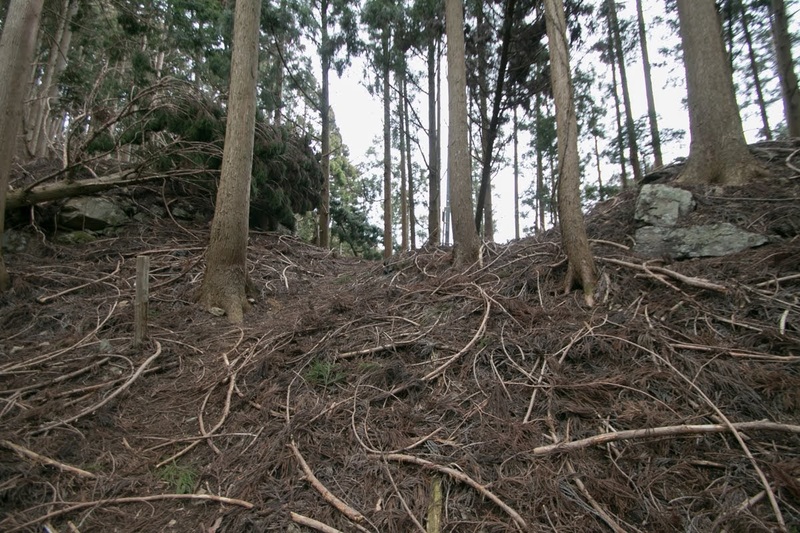 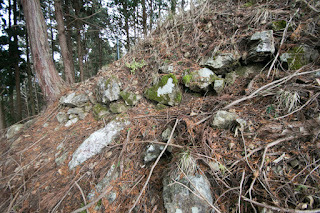 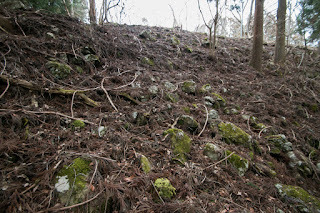 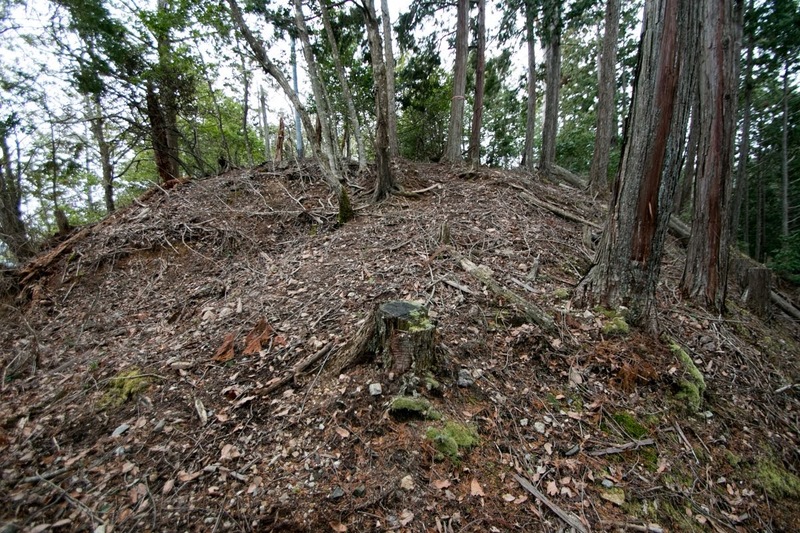 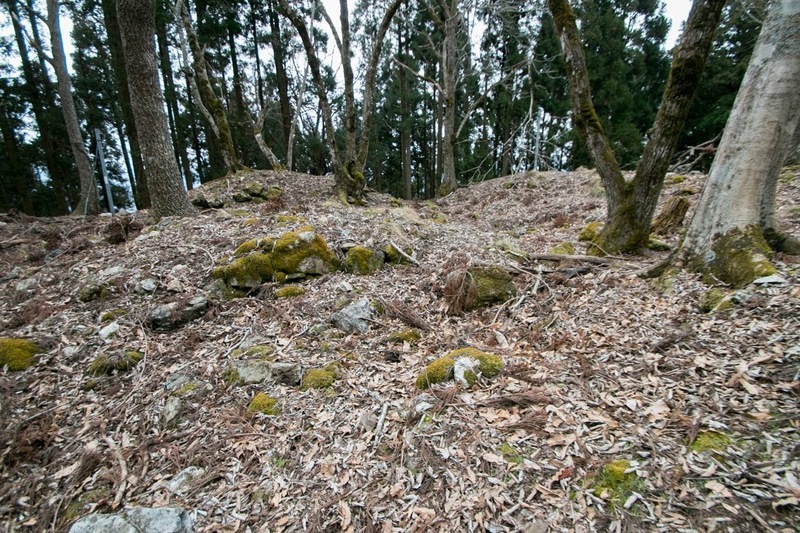 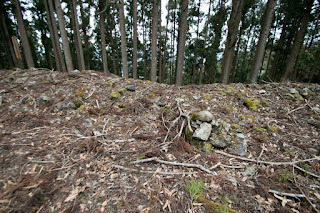 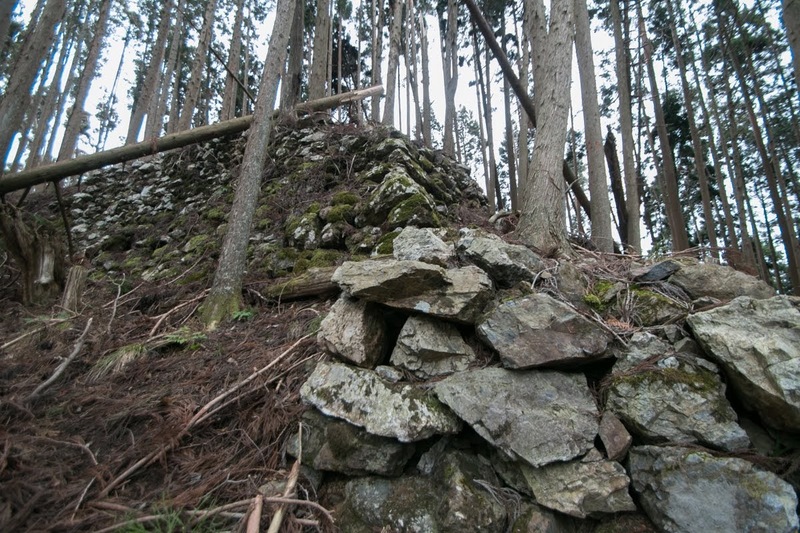 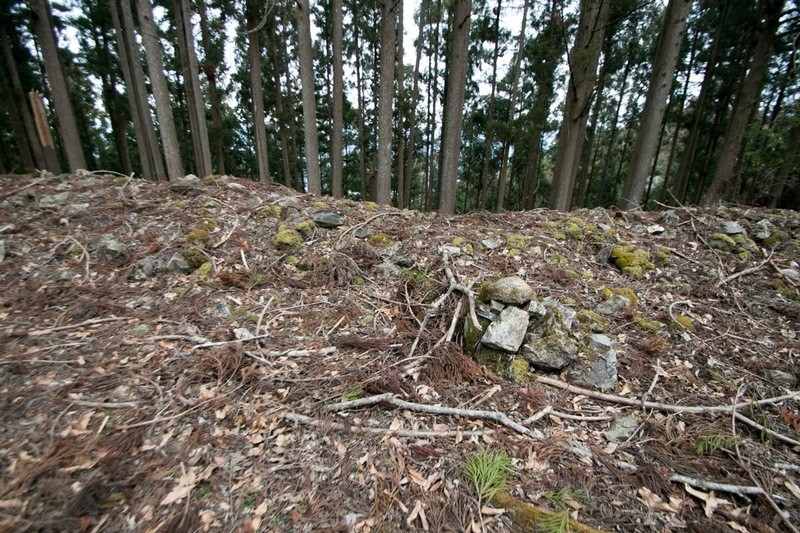 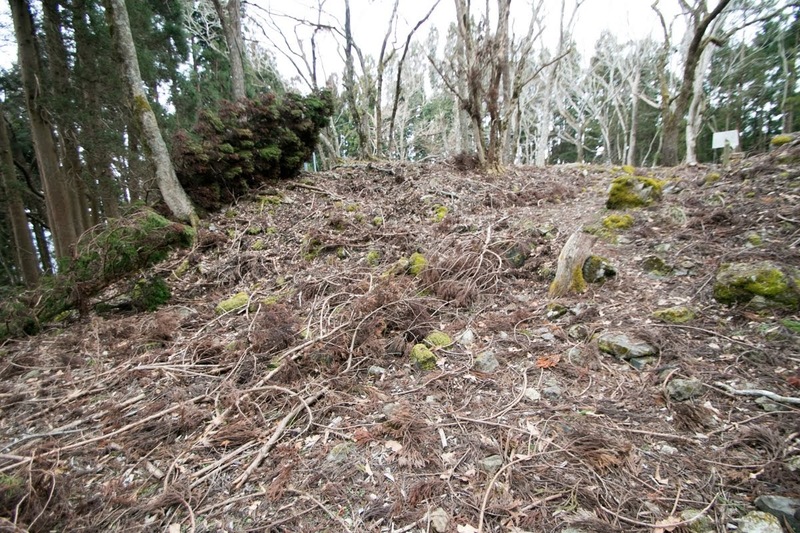 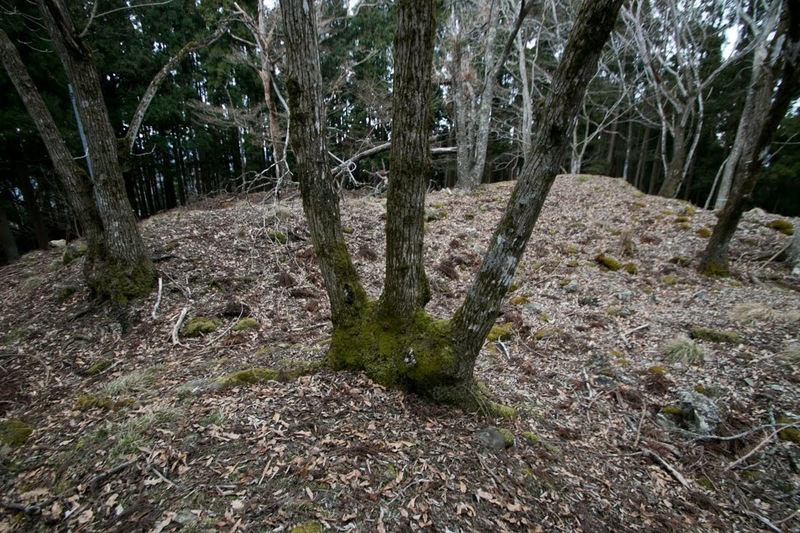 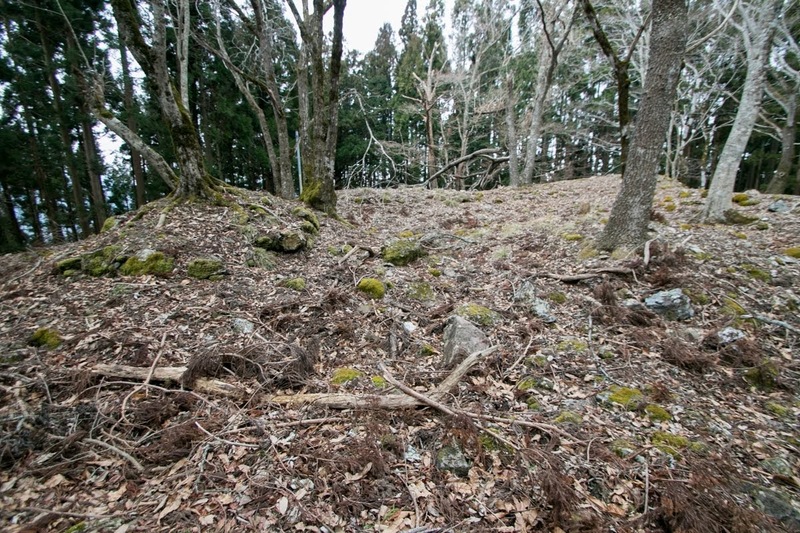 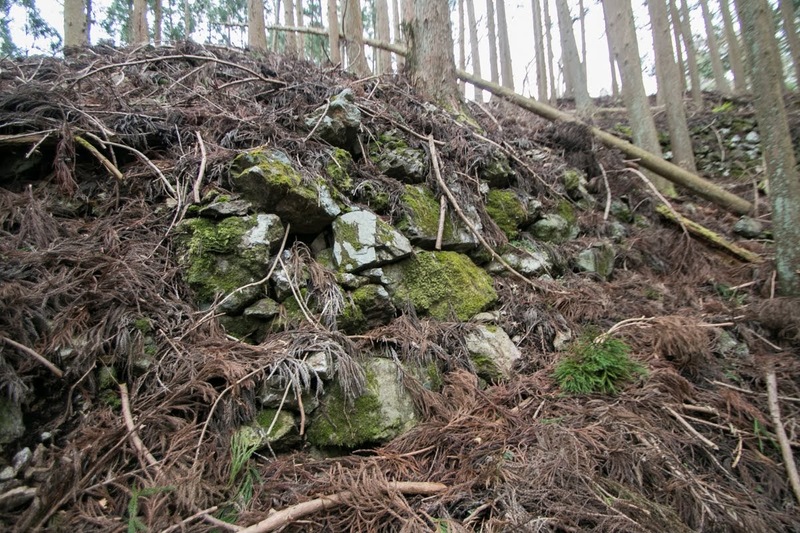 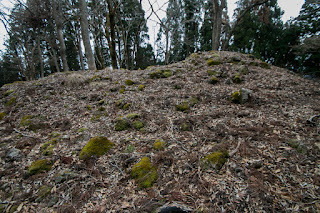 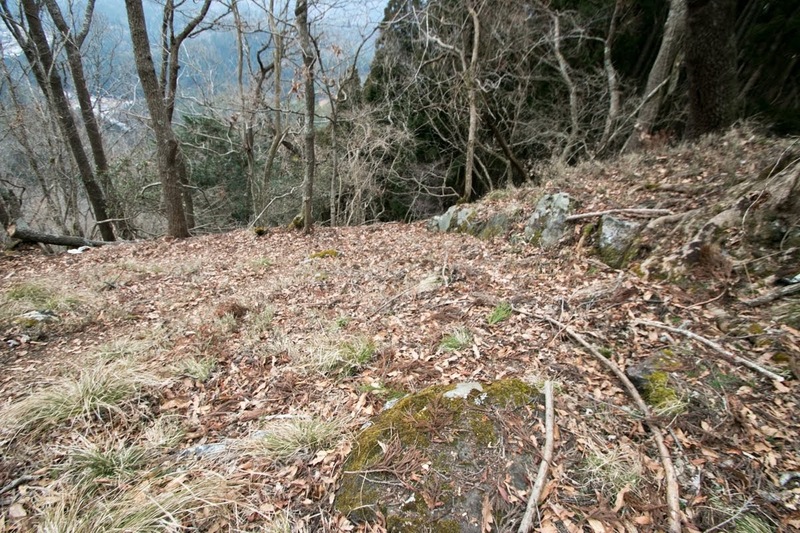 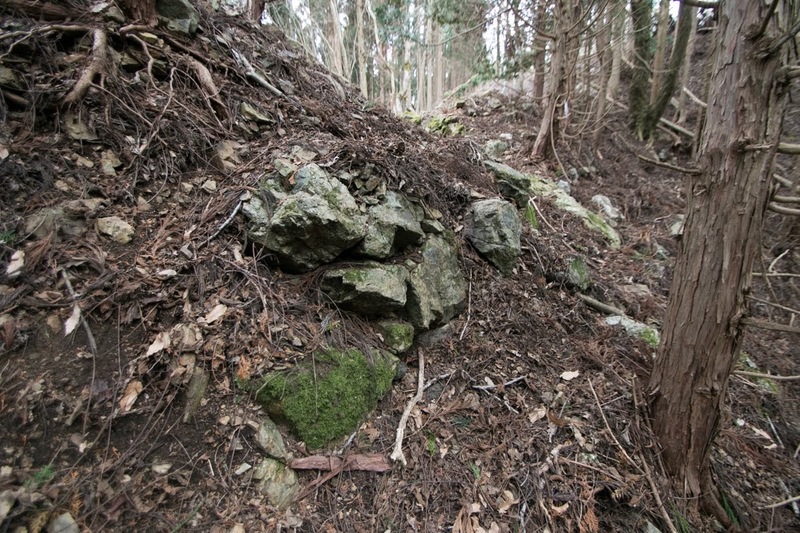 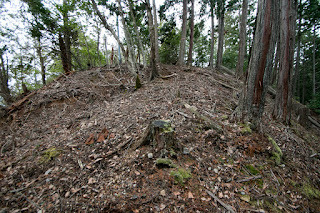 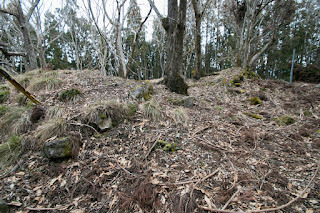 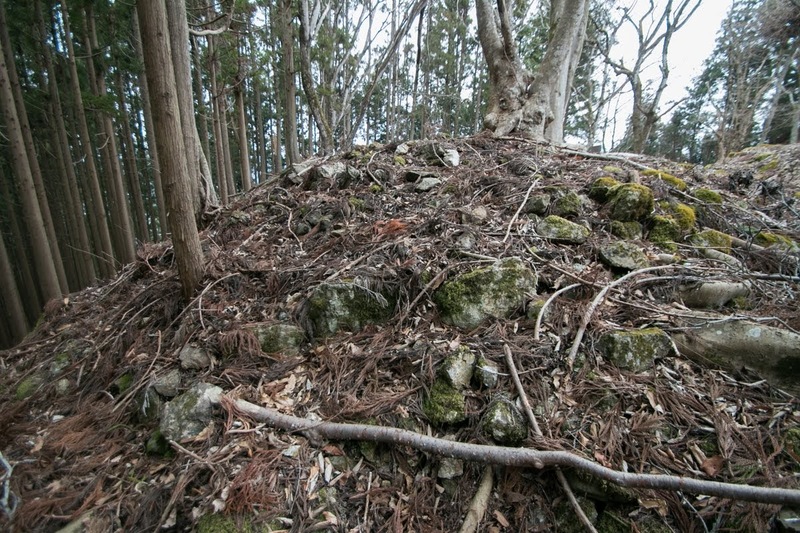 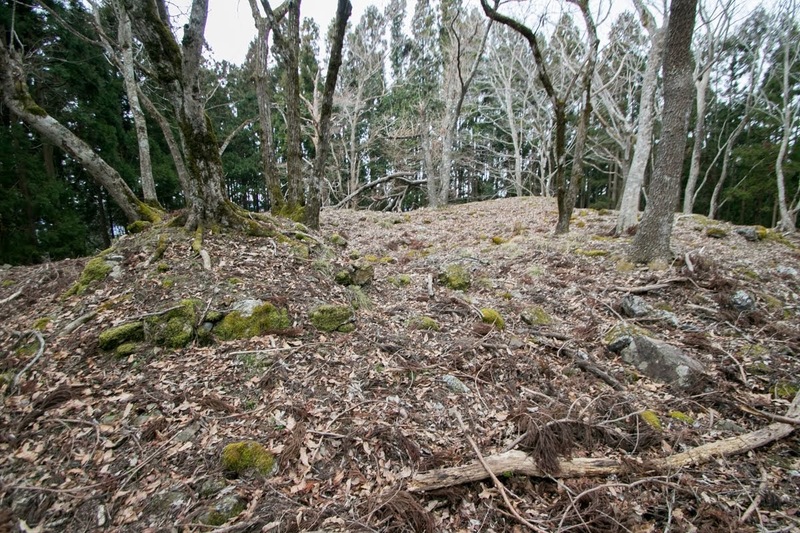 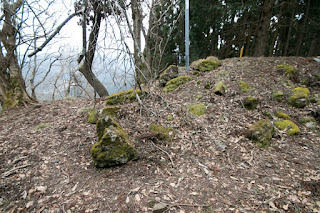 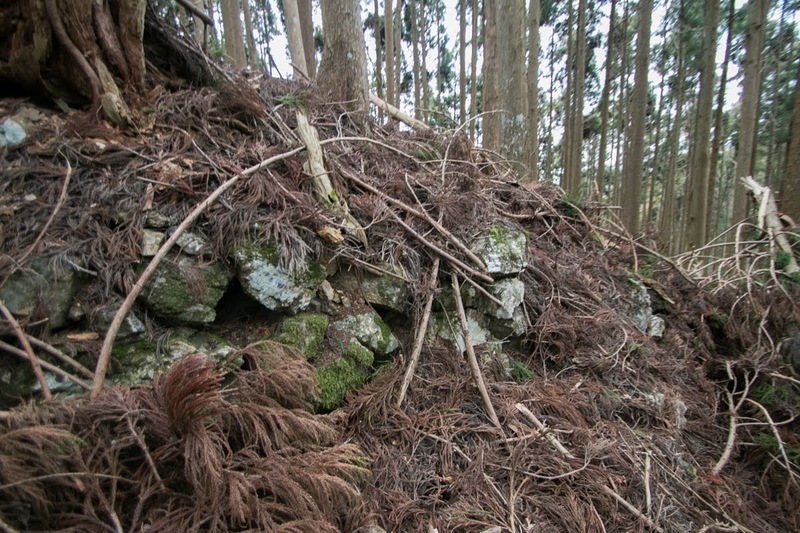 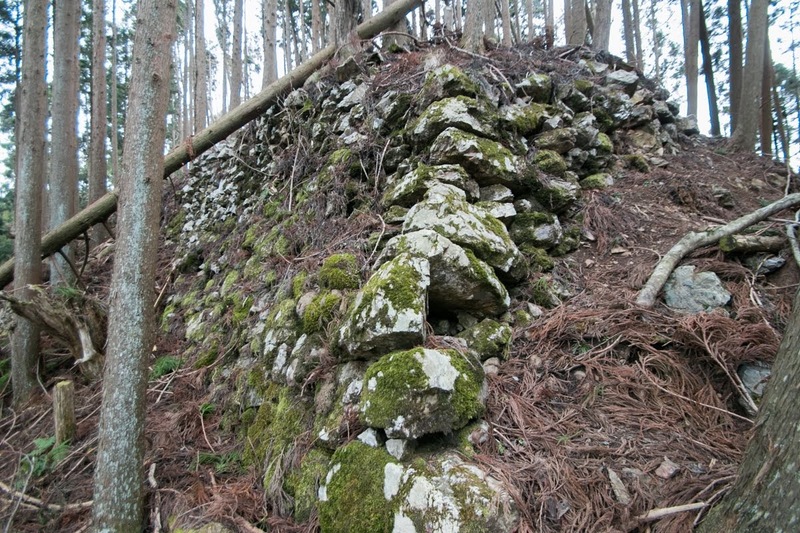 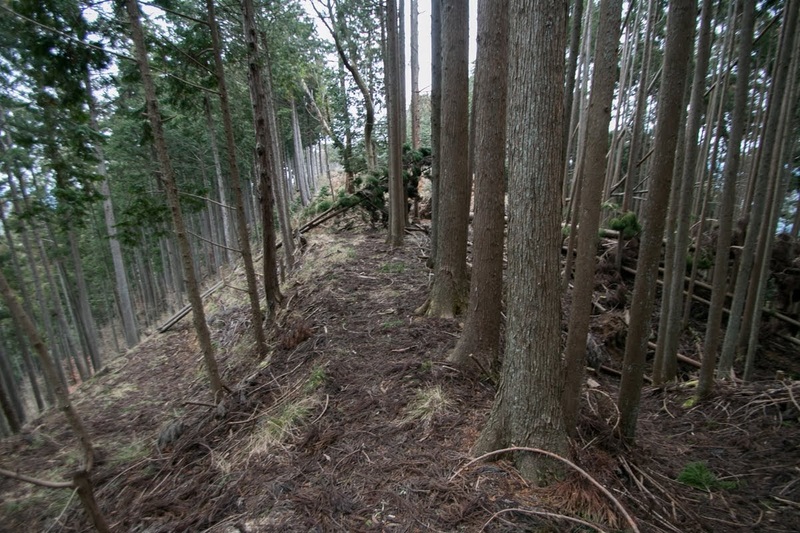 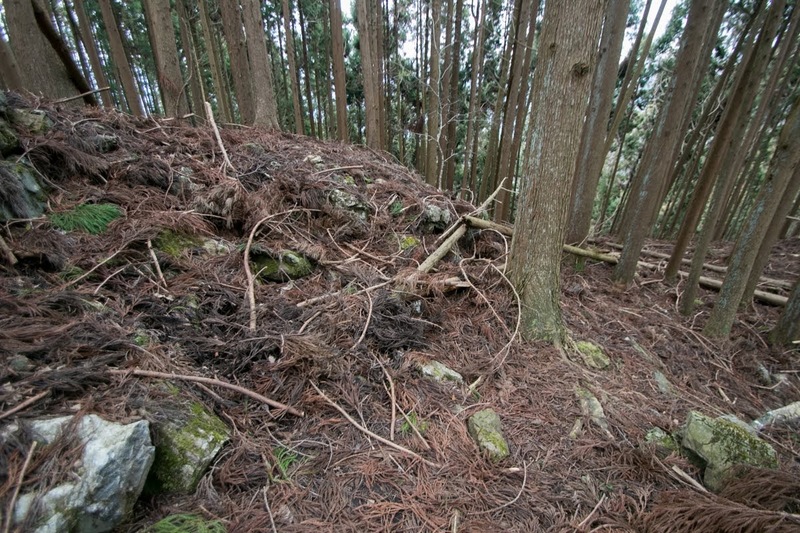 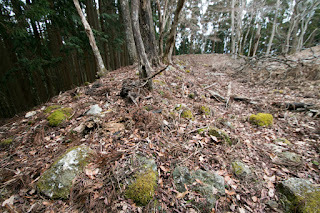 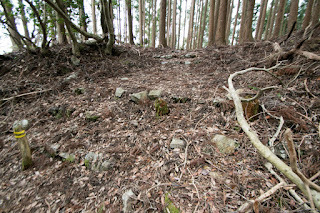 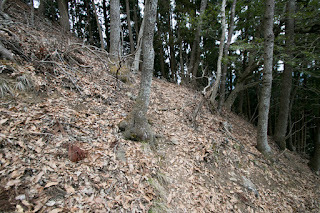 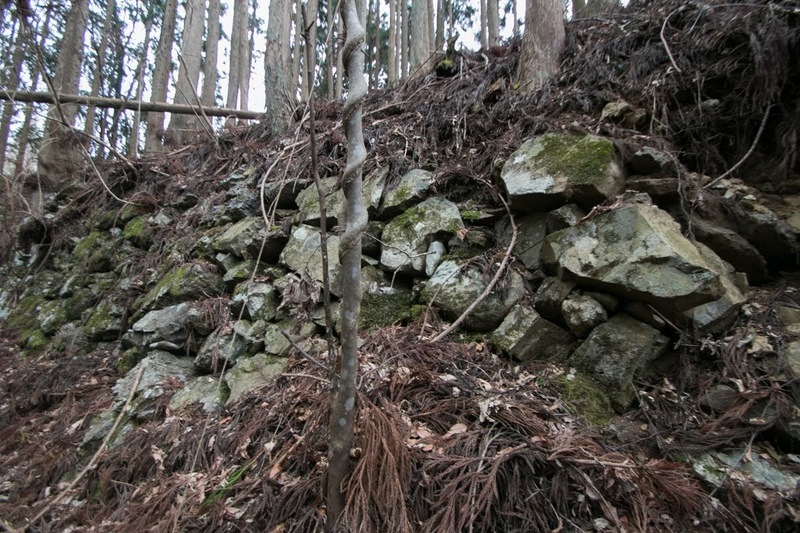 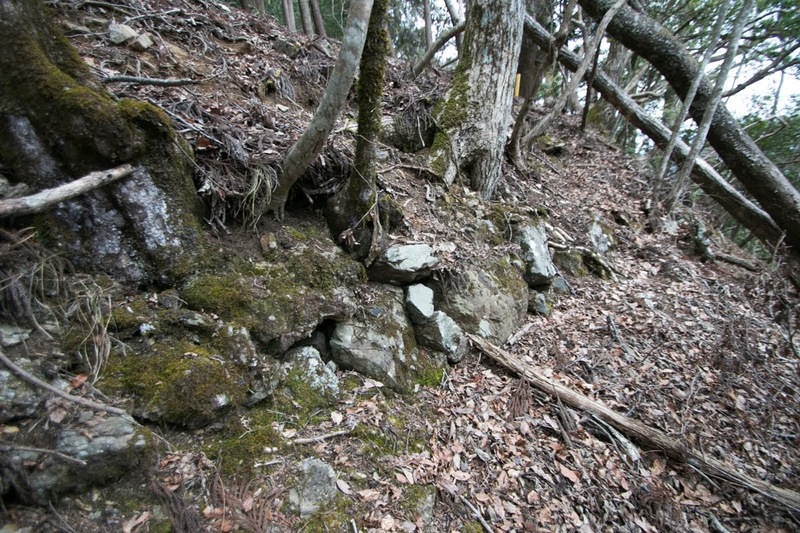 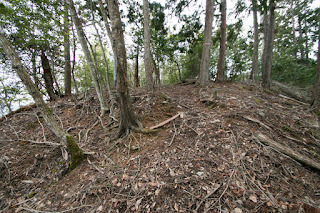 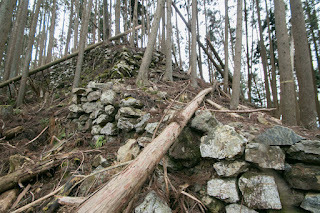 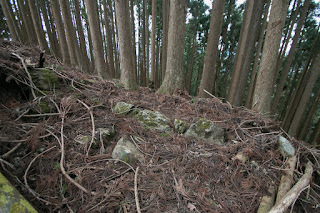 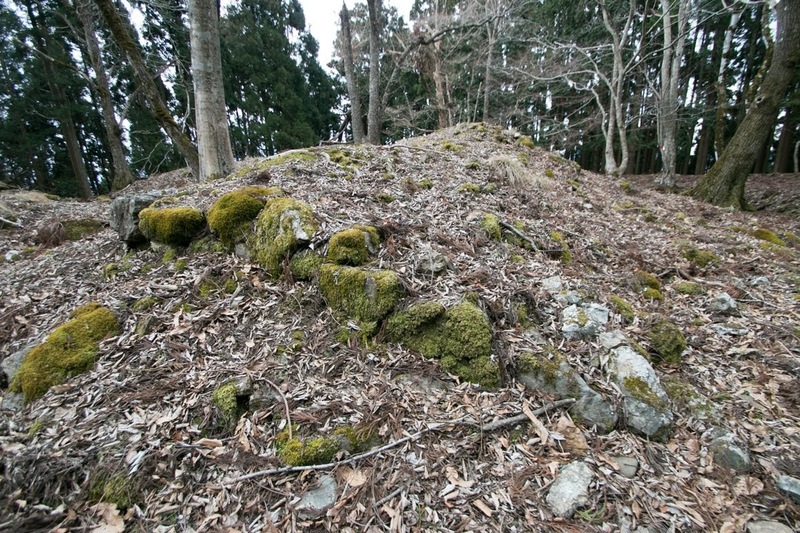 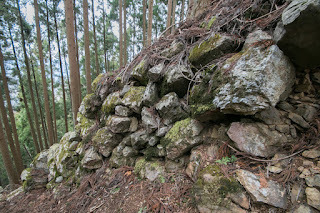 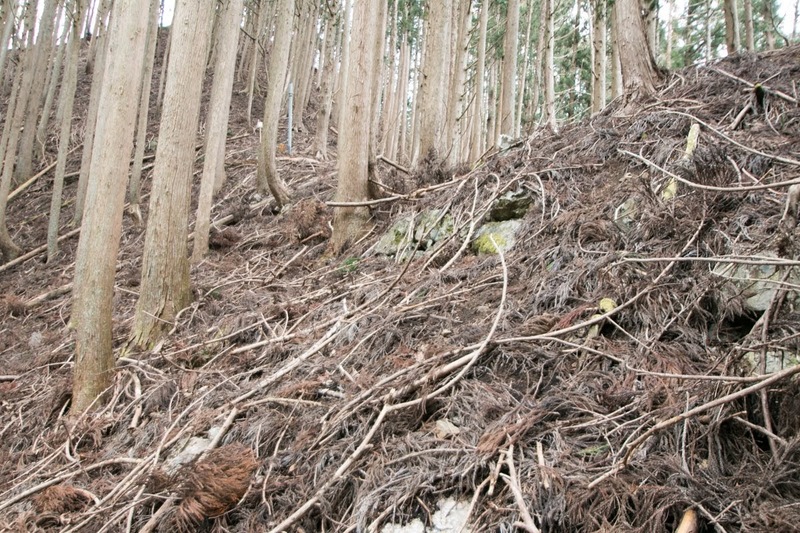 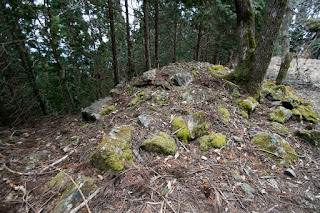 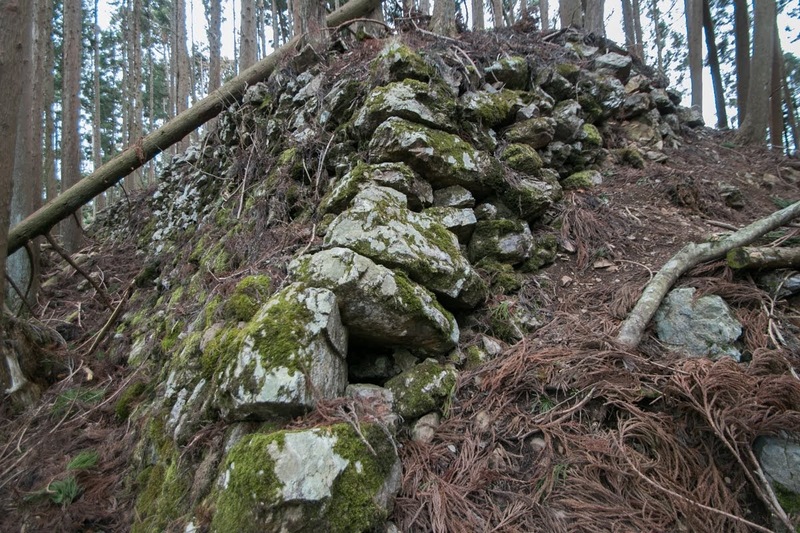 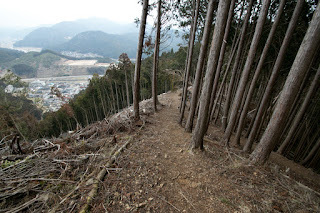 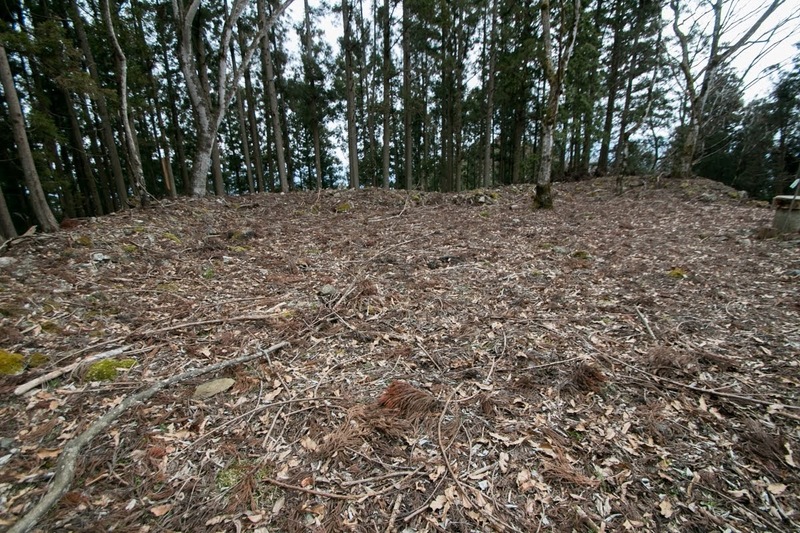 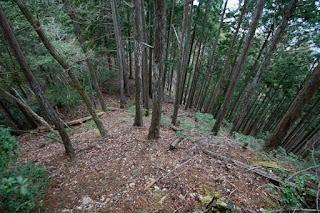 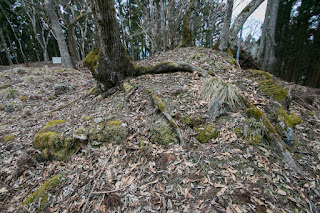 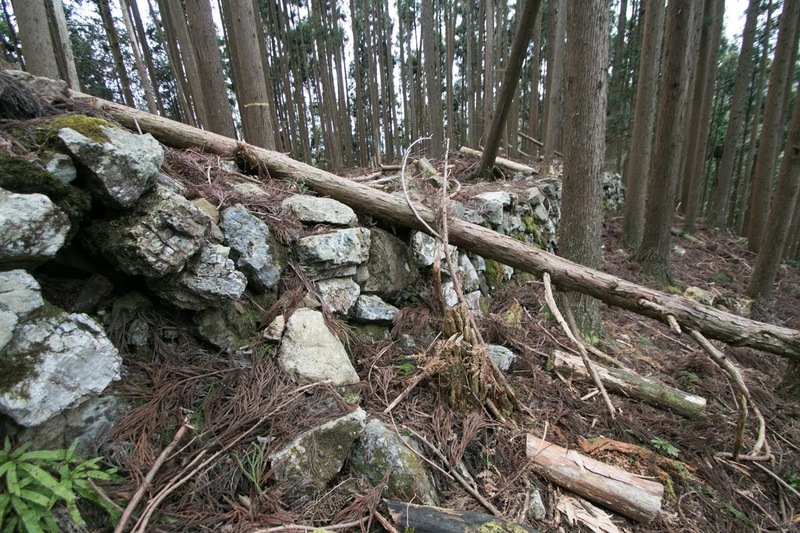 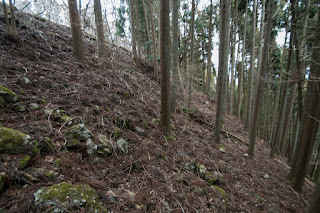 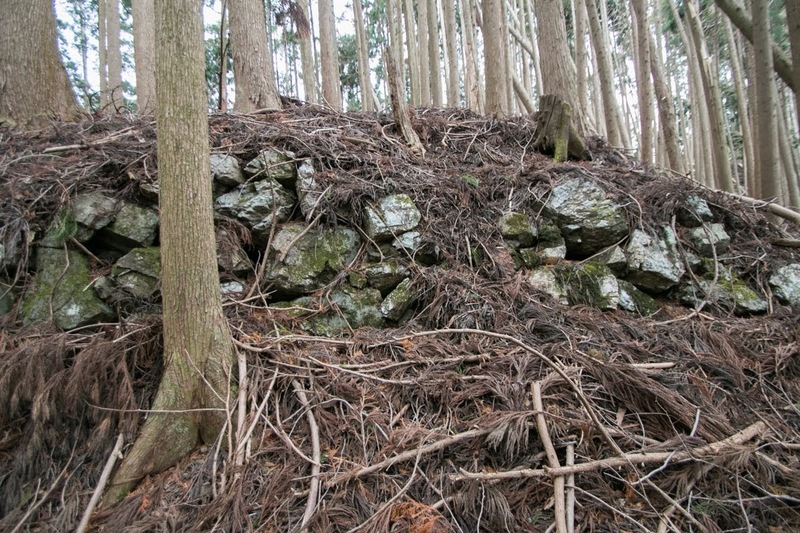 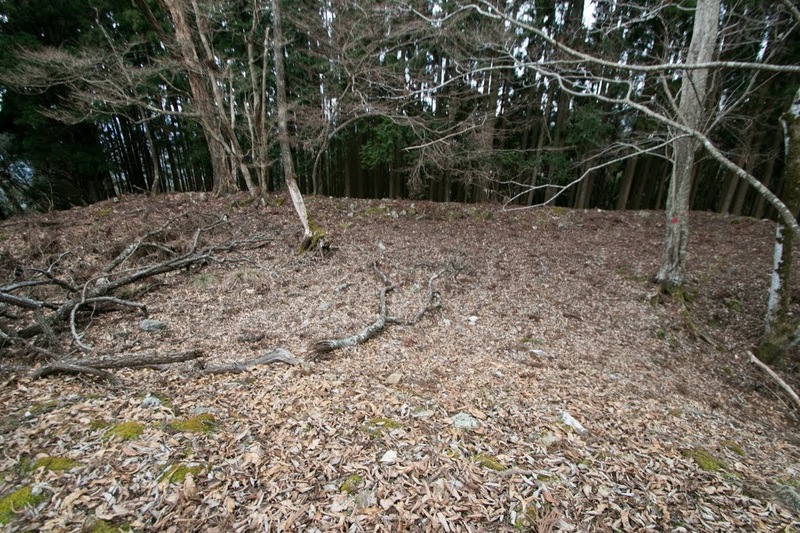 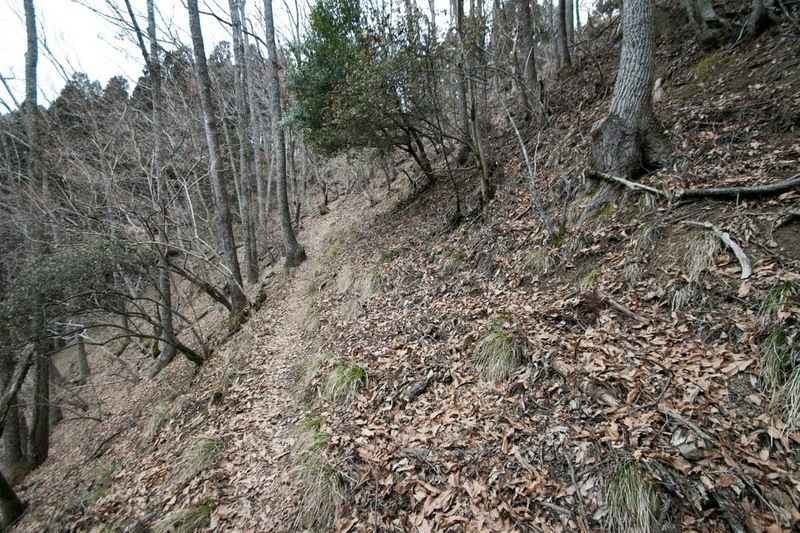 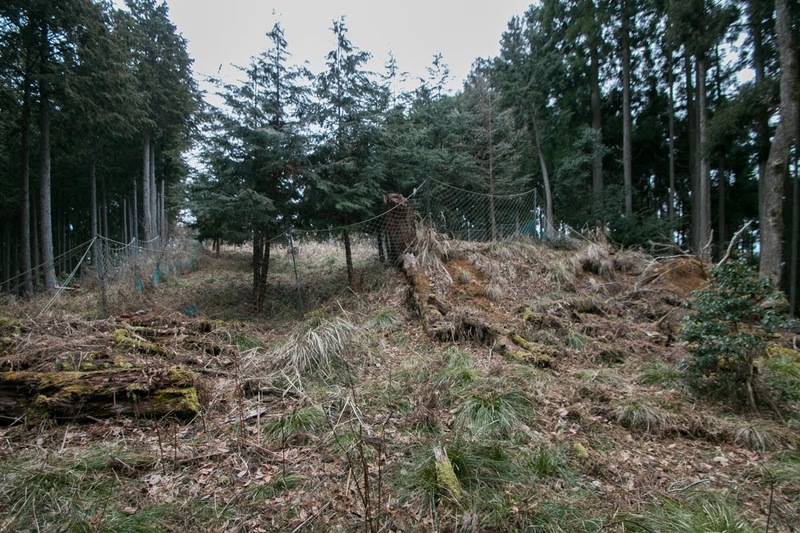 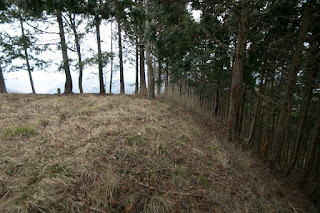 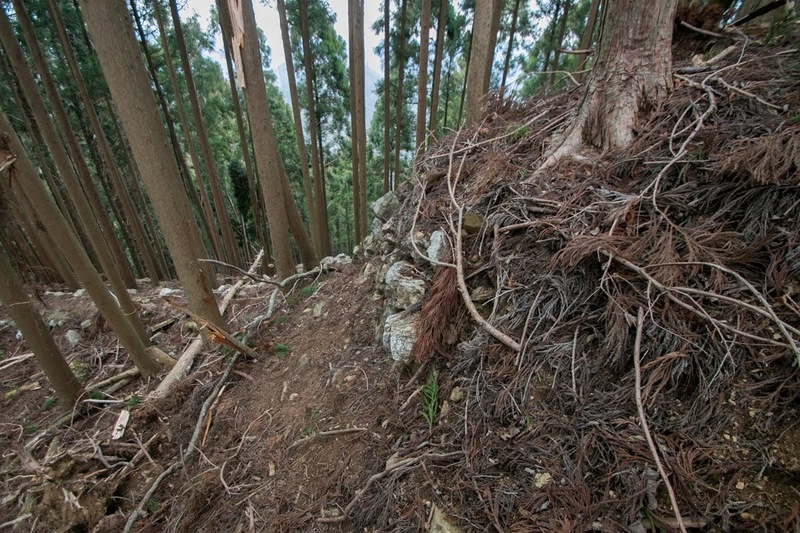 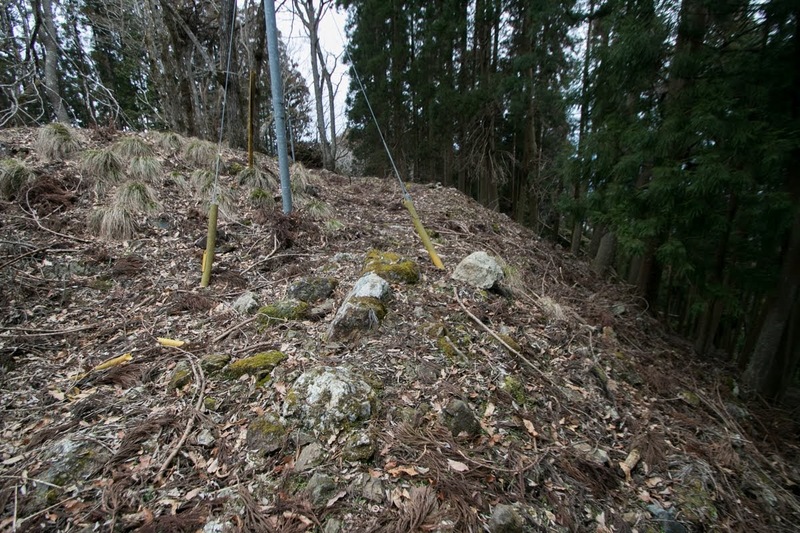 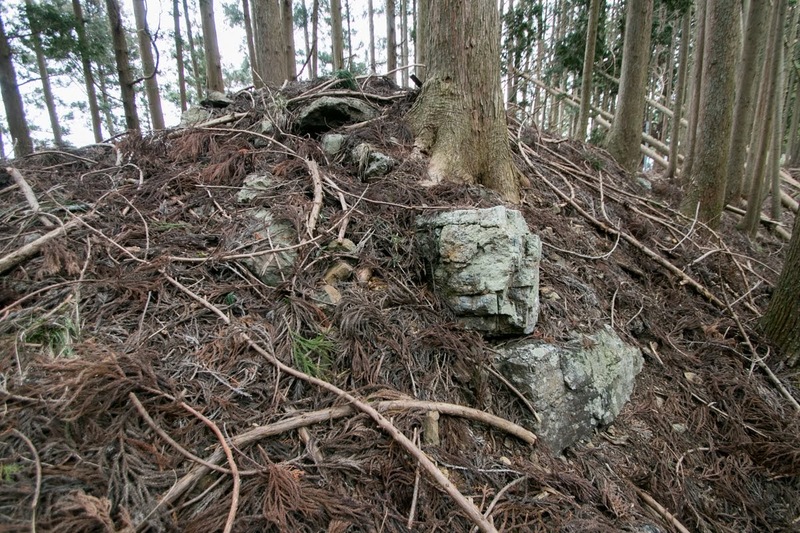 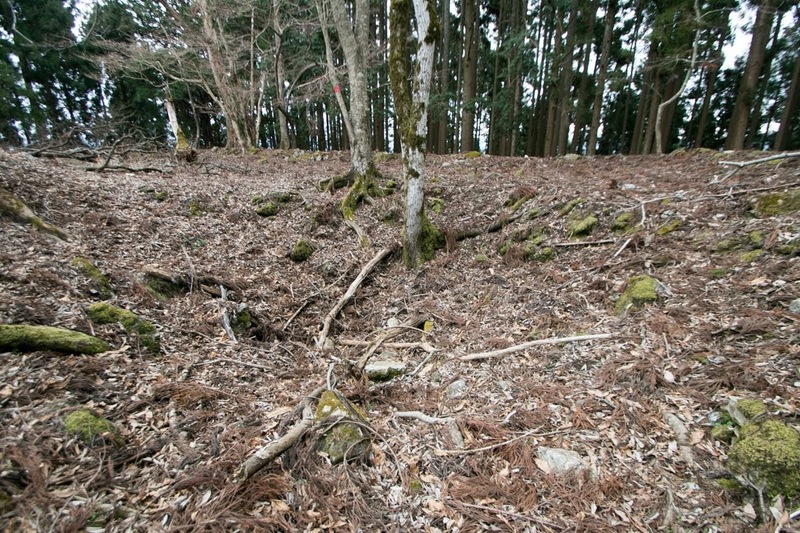 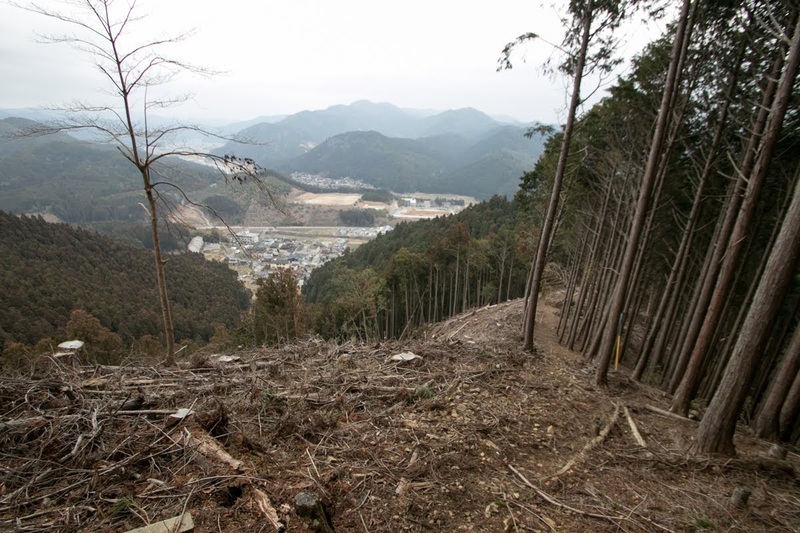 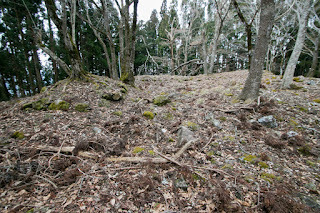 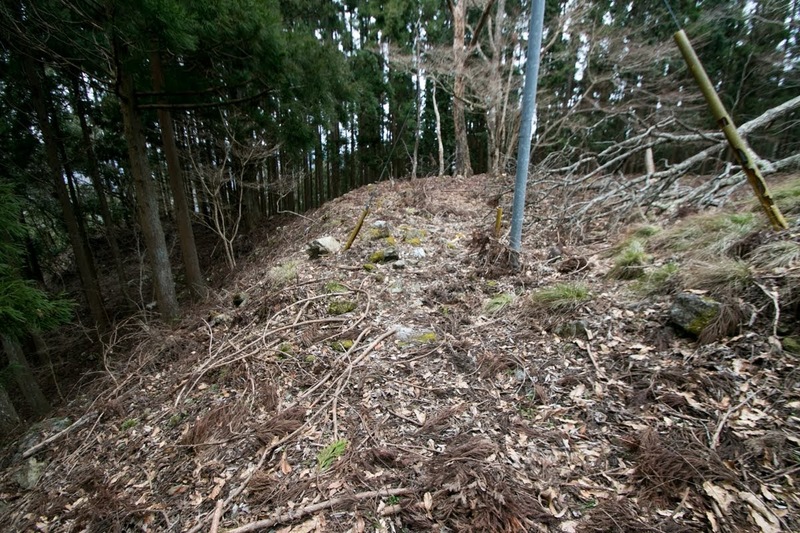 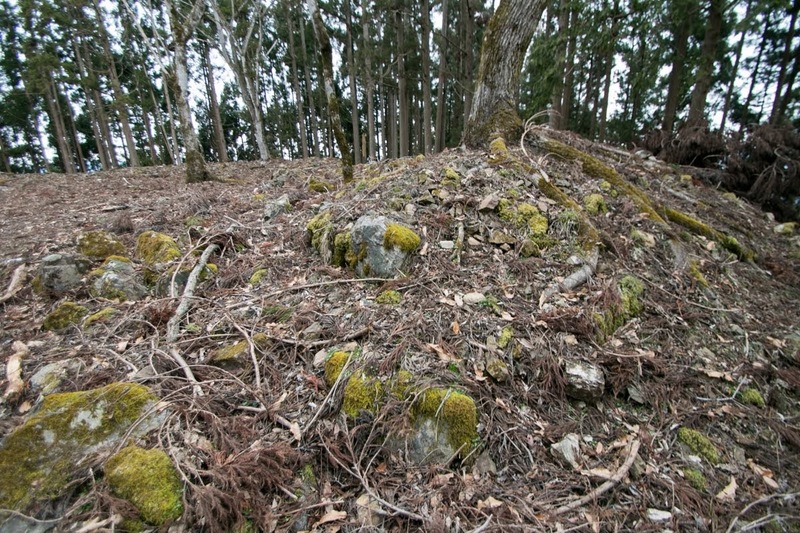 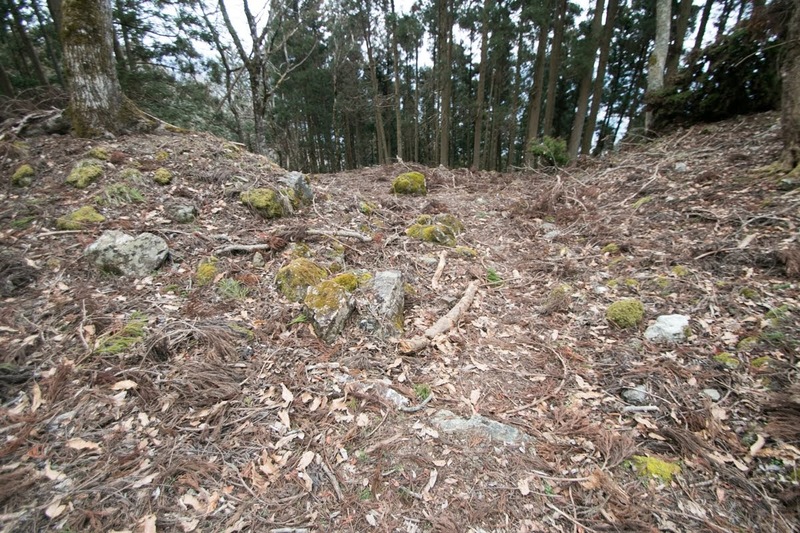 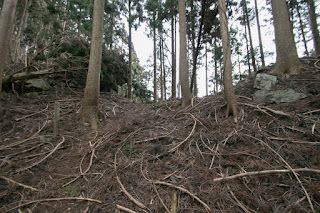 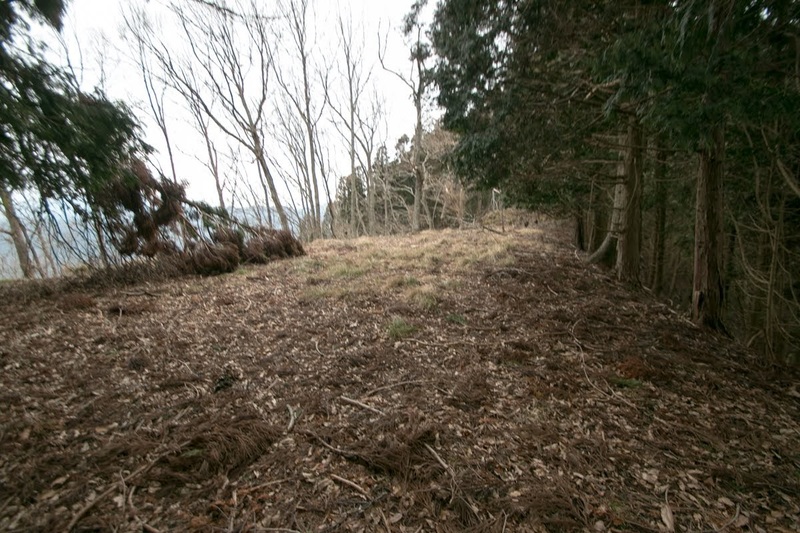 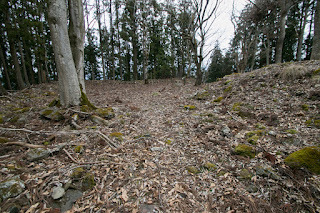 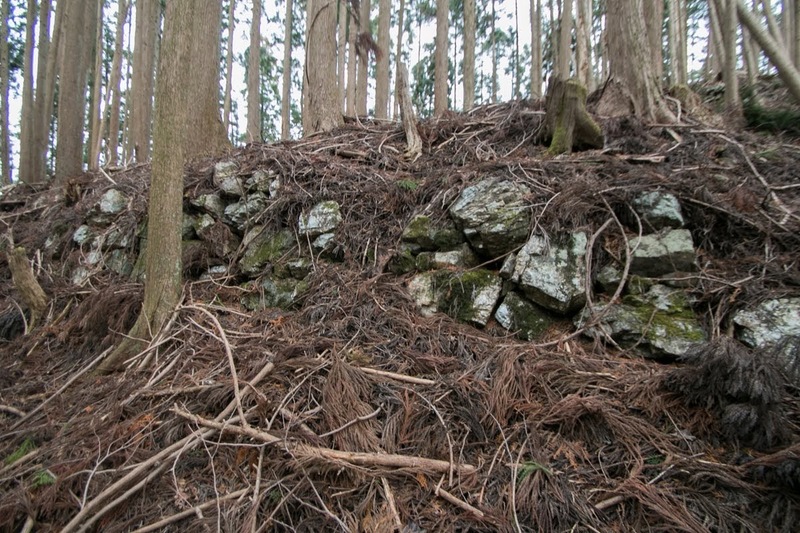 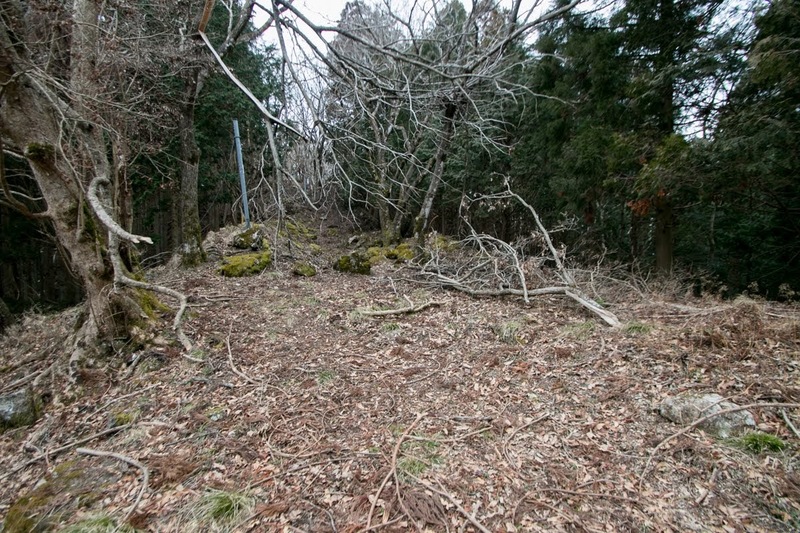 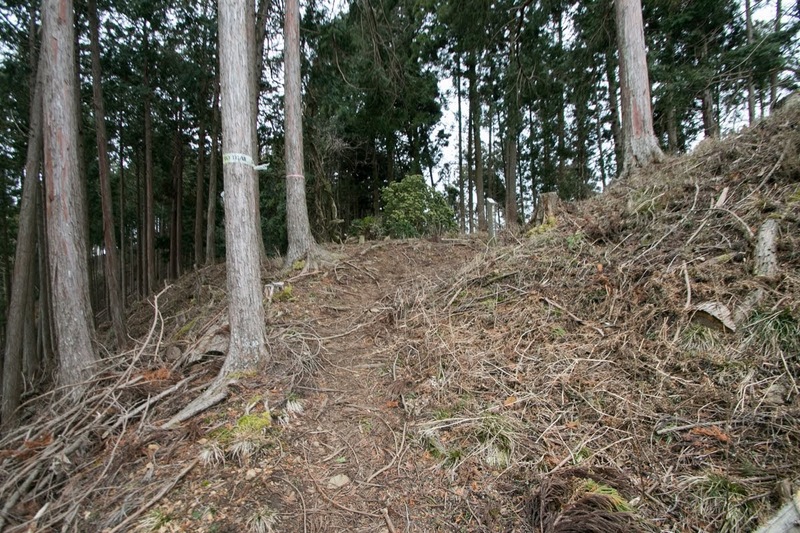 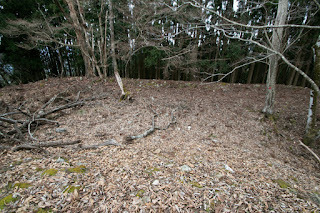 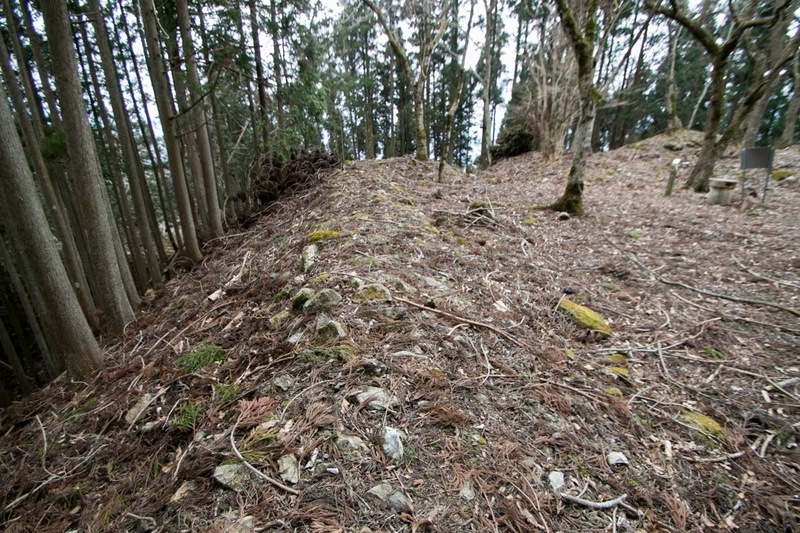 On the other hand, western ridge is a weak point of Shuzan castle directly connected to backside mountains, thus several terraces were built along with slope and were securely protected by vertical face of stone wall. The overall shape of the castle is a transitional style from medieval castle to modern castle, as it has stone walls but not so tall, and shape of each gate is a flat path without folded path. 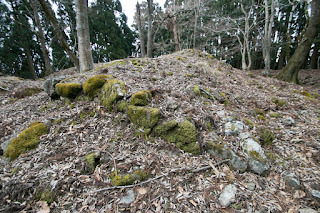 Mitsuhide placed his confident general Mitsutada Akechi (1540-1582) as a commander of Shuzan castle, to keep his two main bases Sakamoto castle and Tanba Kameyama castle connected. 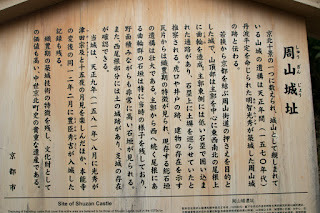 Shuzan castle was used as a regional military base, but after the incident of Honnoji in 1582, a coup d'etat of Mitsuhide against Nobunaga and succeeding defeat of Mitsuhide at the battle of Yamazaki, Shuzan castle was abolished. Edo Shogunate reformed or built Zeze castle (Shiga prefecture), Yodo castle and Tanba Kameyama castle (Kyoto prefecture) and Obama castle (Fukui prefecture) as a guarding base of Kyoto city. 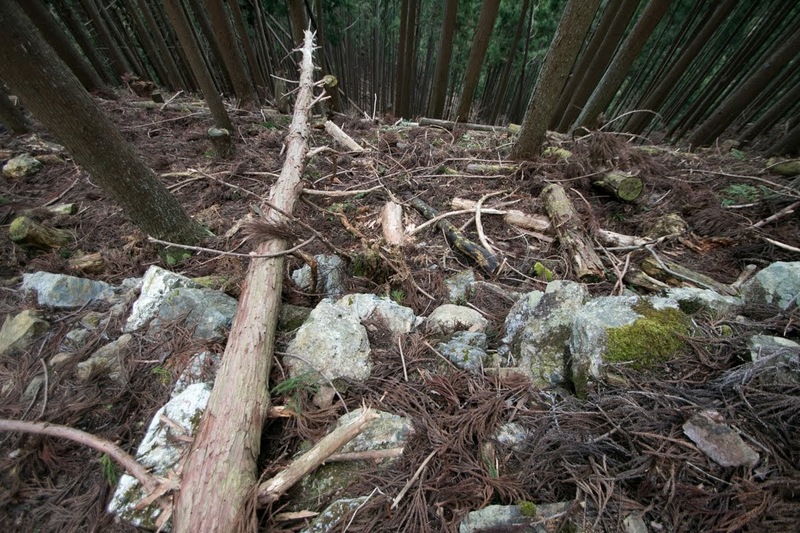 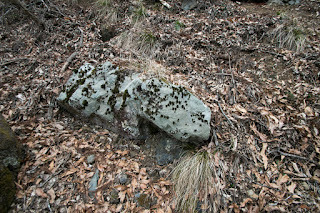 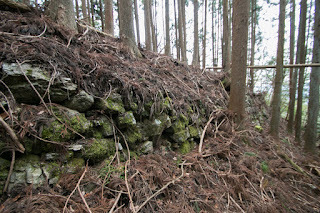 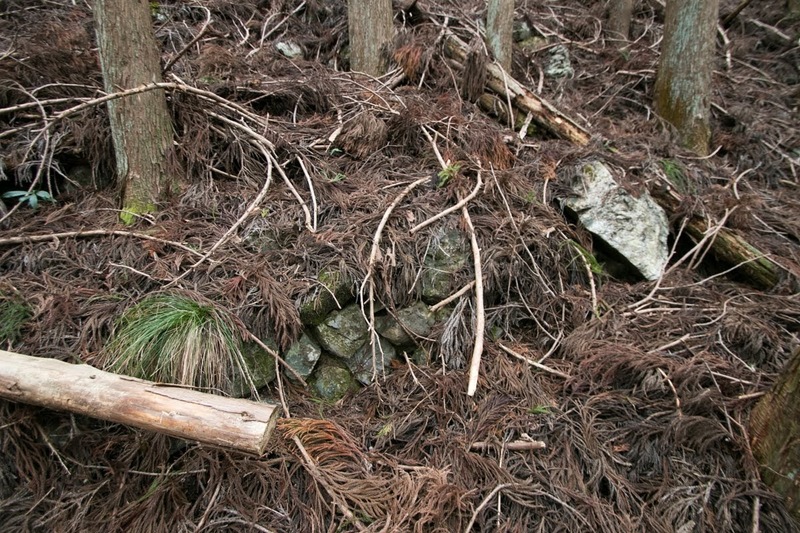 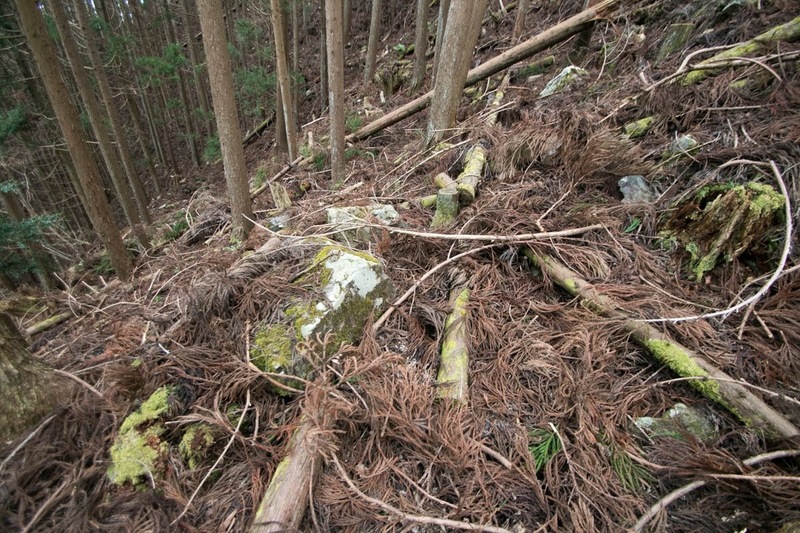 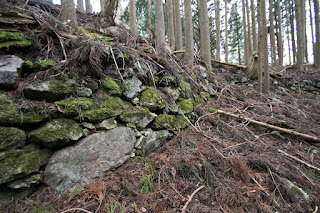 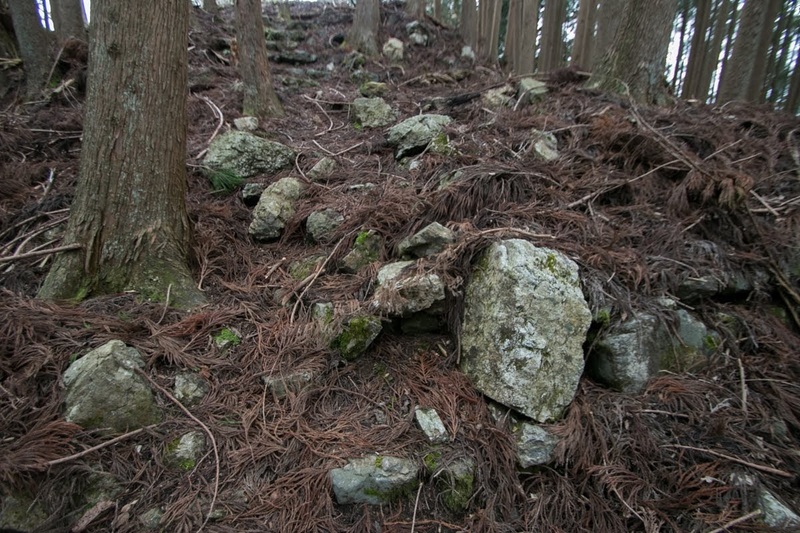 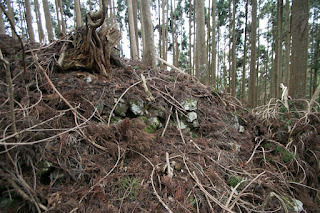 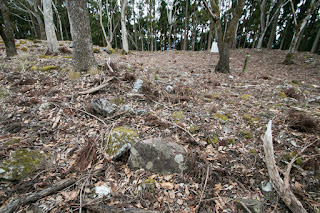 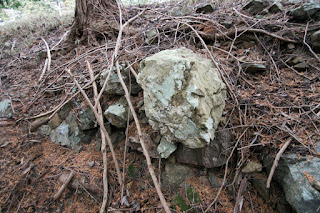 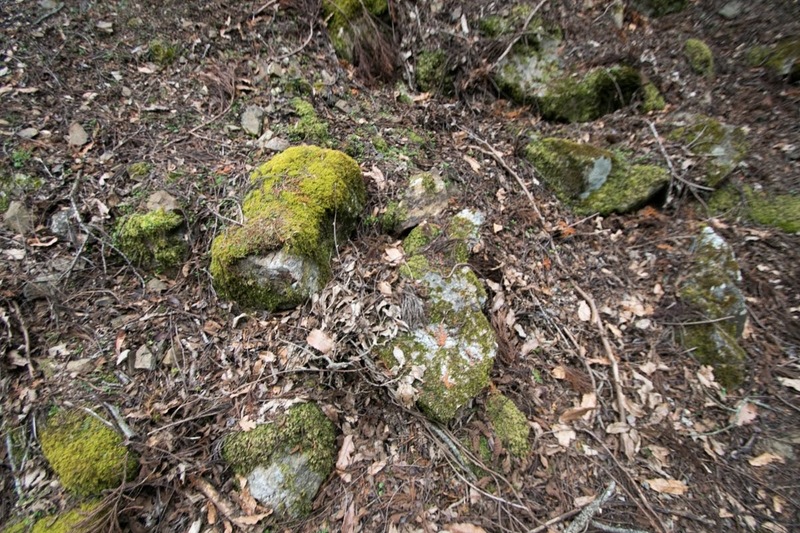 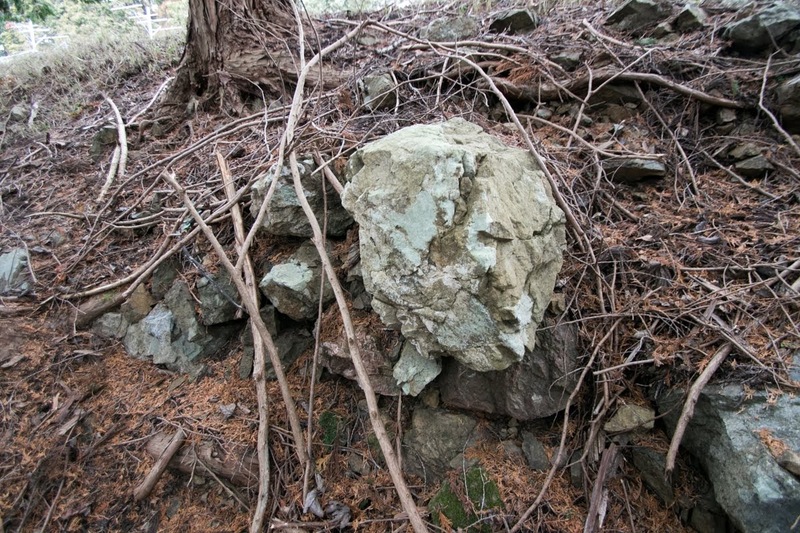 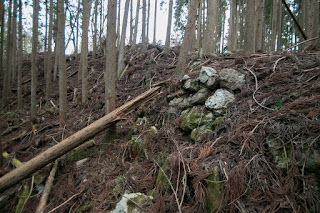 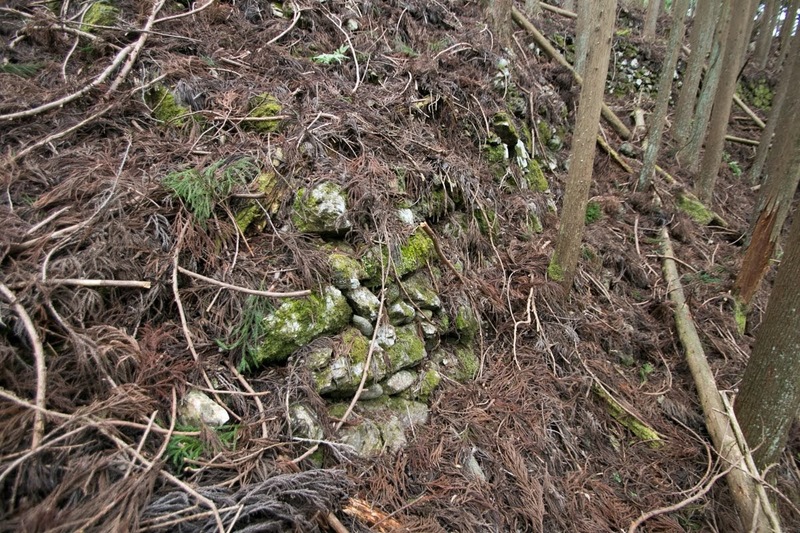 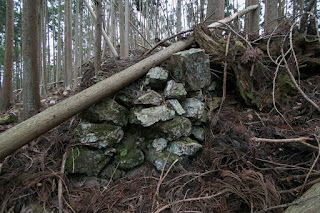 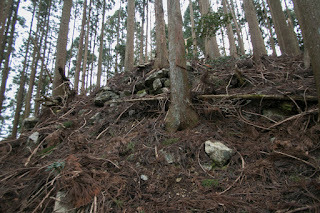 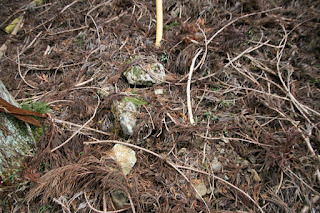 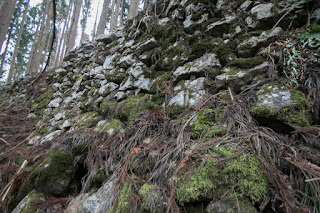 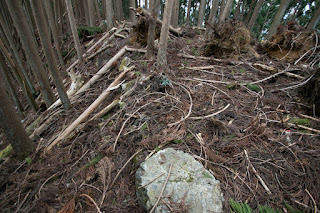 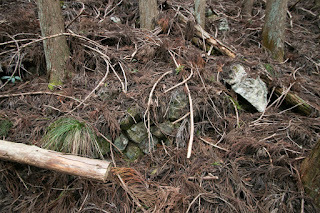 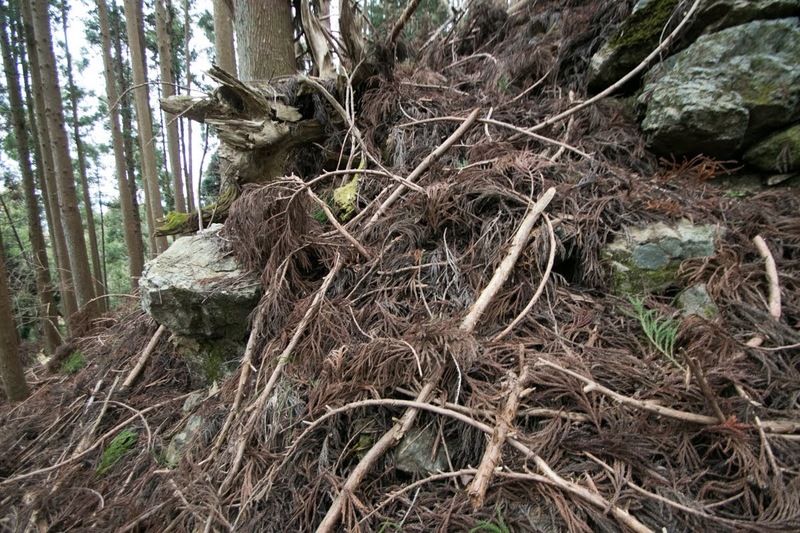 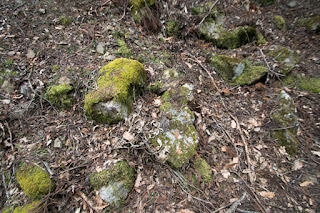 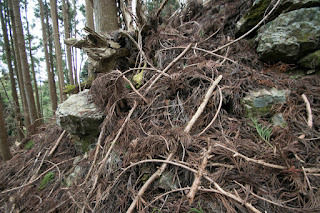 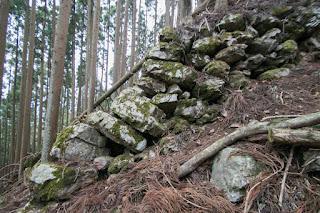 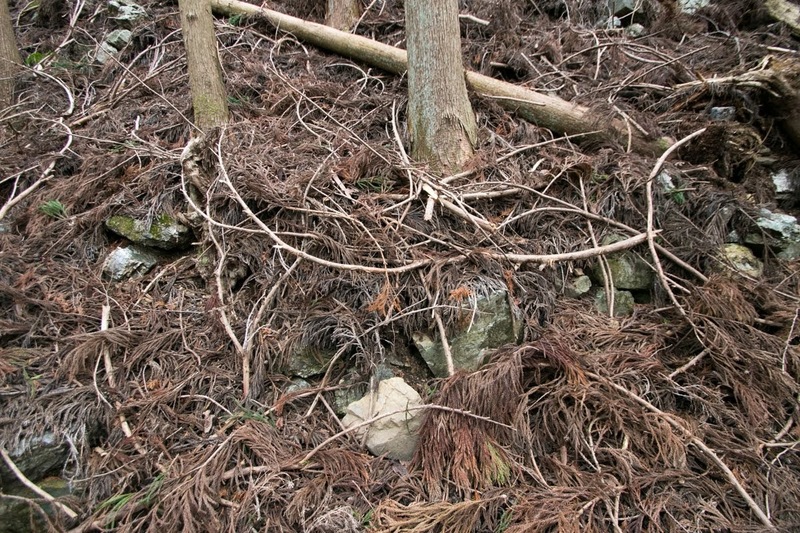 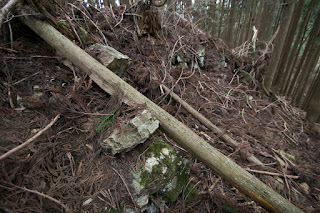 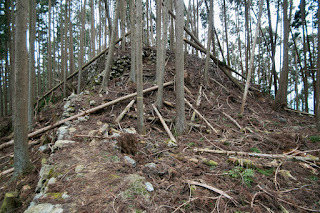 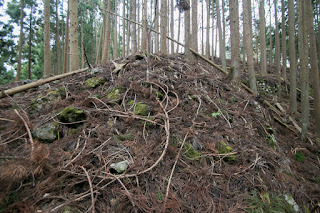 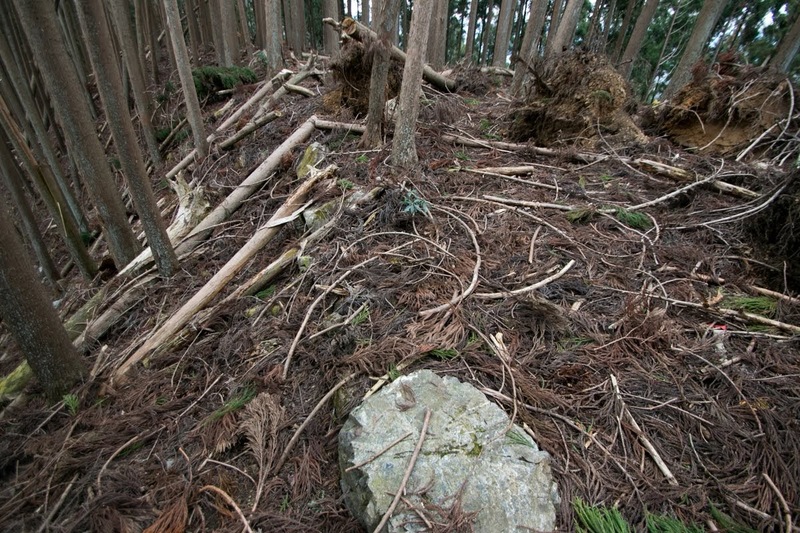 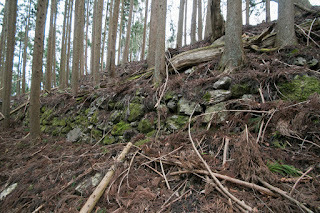 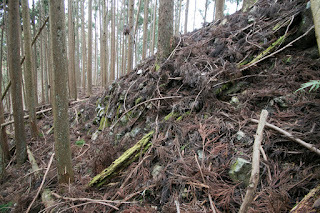 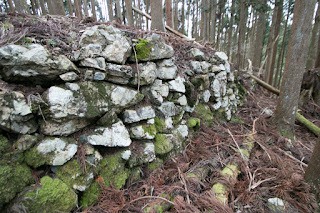 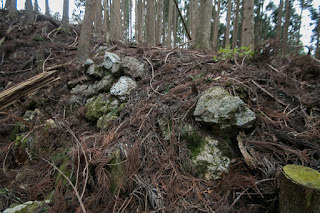 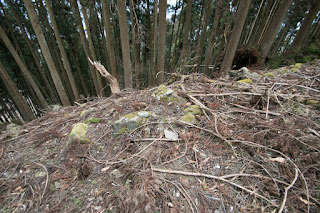 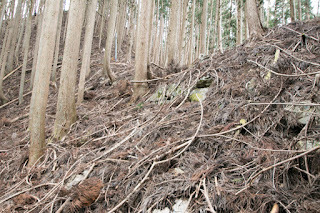 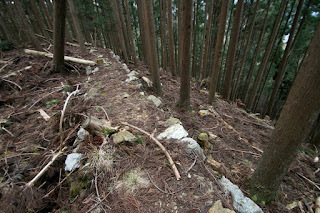 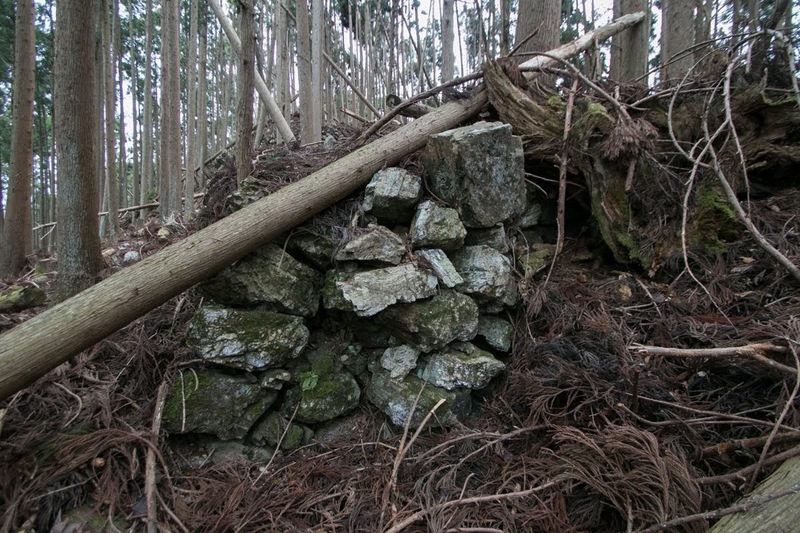 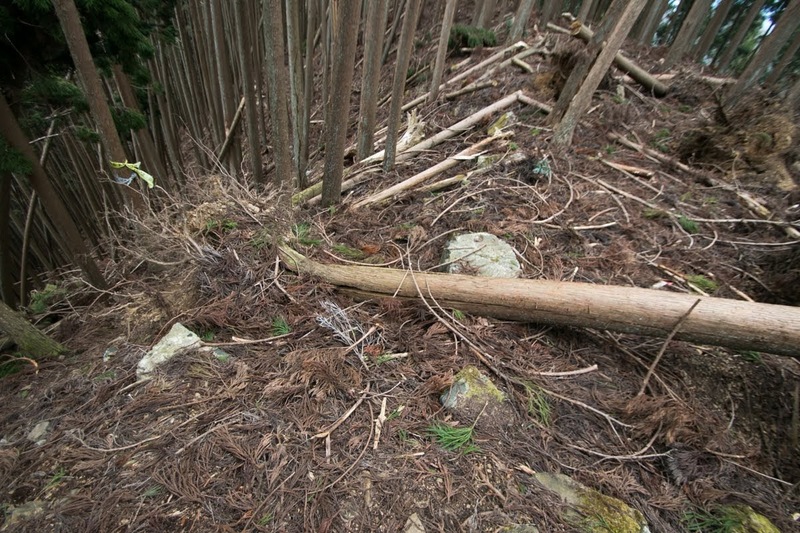 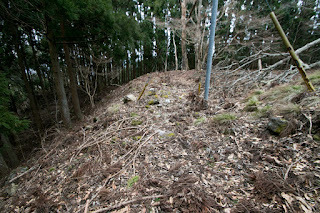 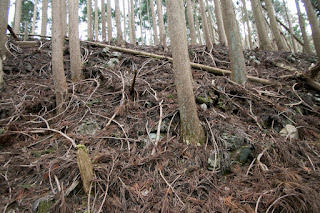 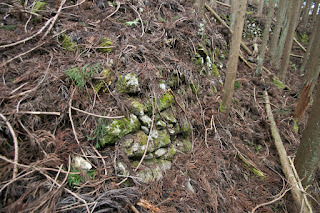 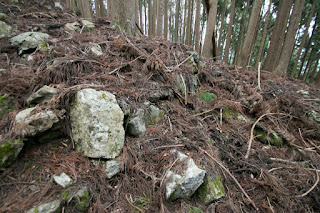 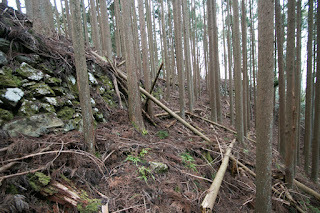 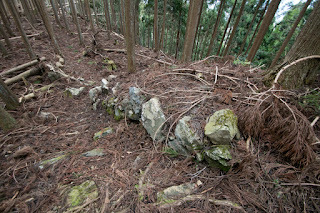 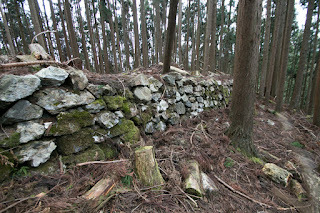 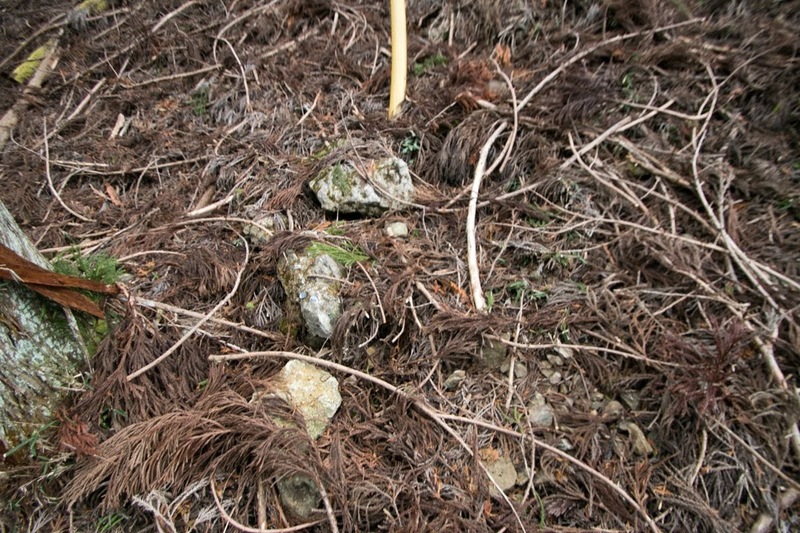 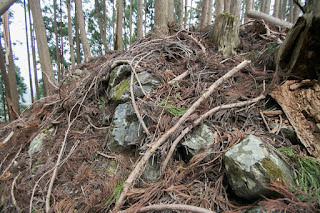 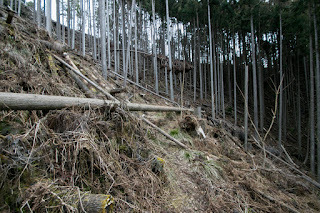 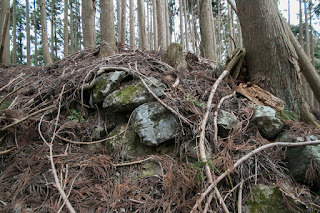 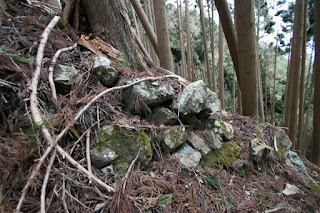 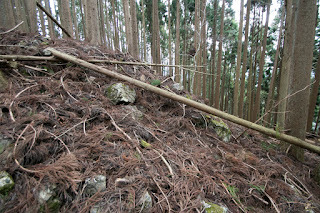 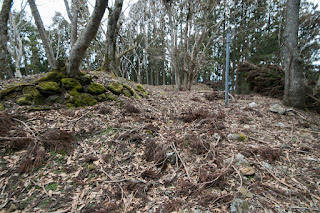 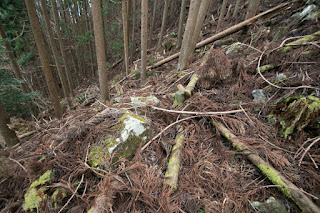 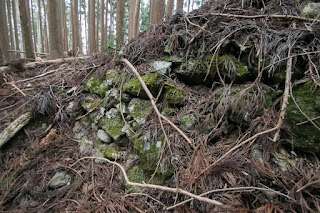 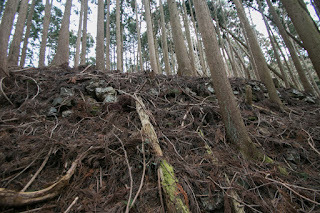 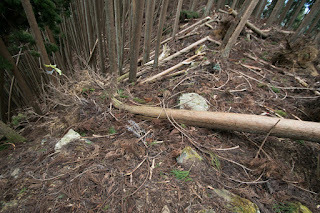 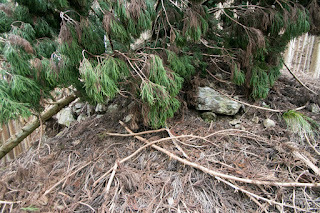 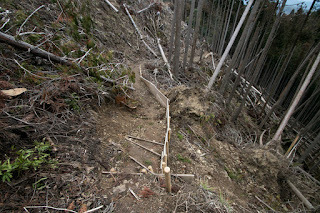 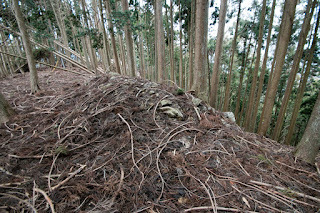 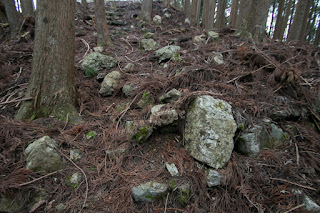 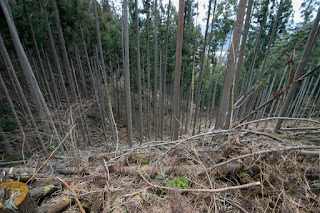 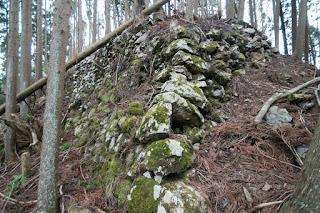 Now half broken stone walls still remain at the mountain. 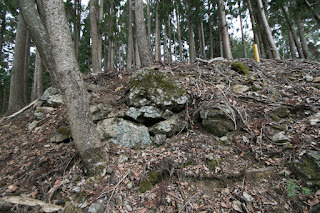 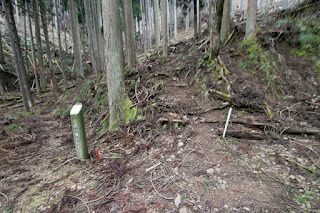 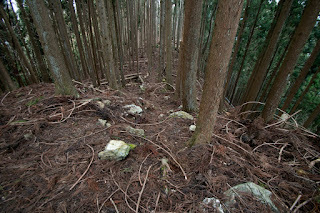 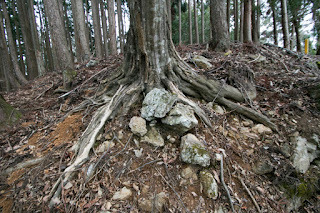 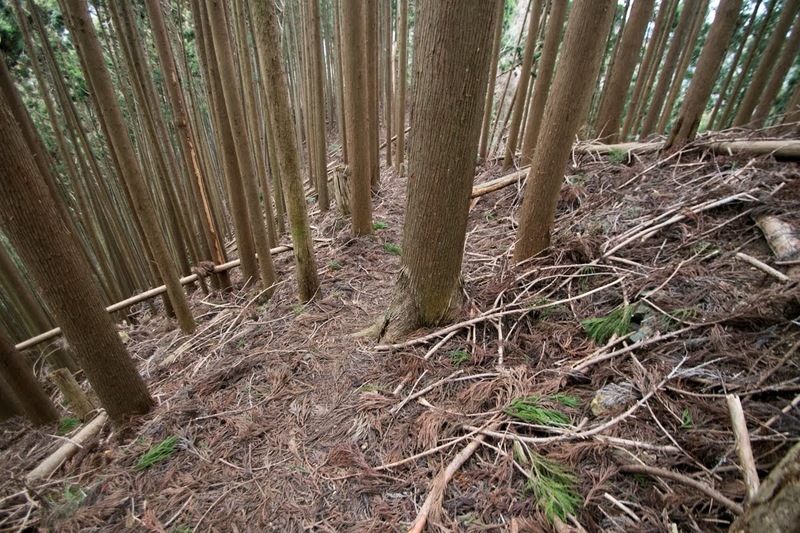 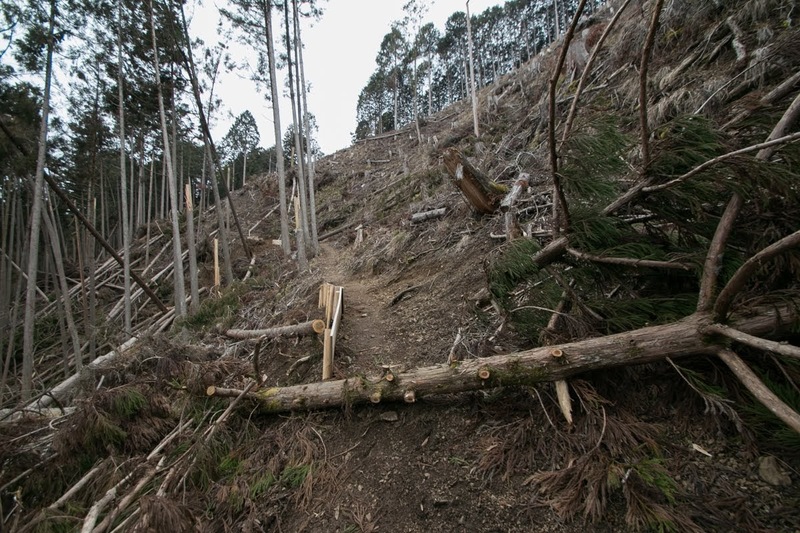 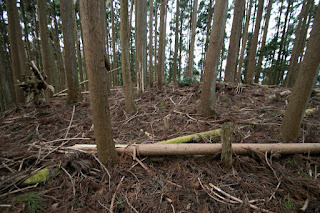 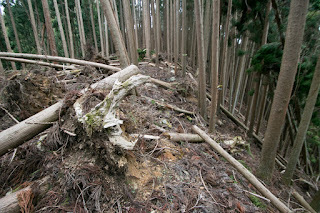 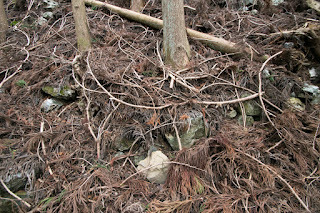 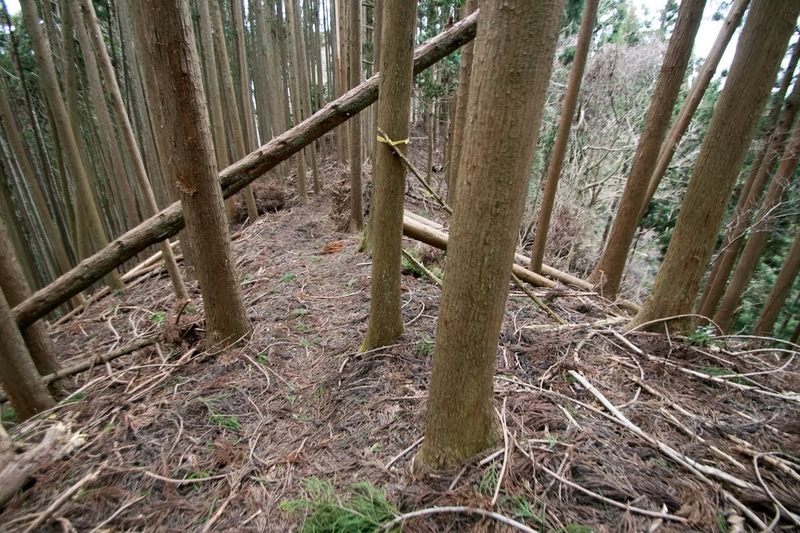 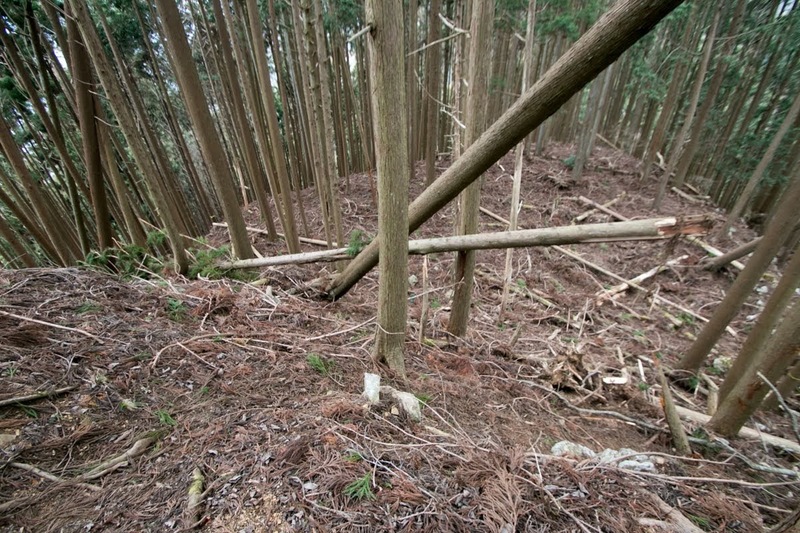 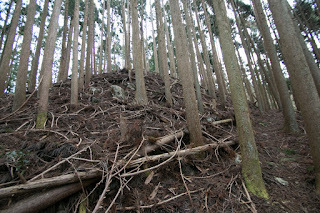 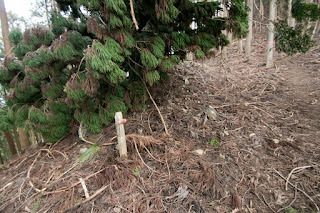 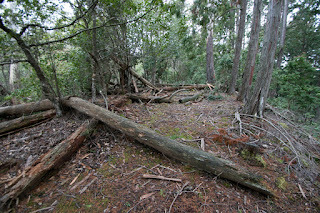 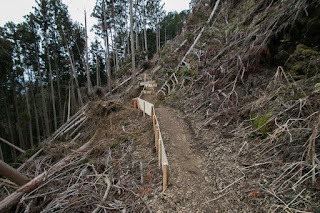 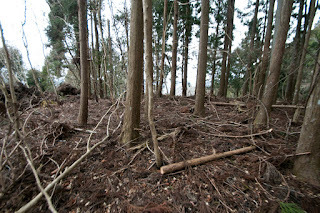 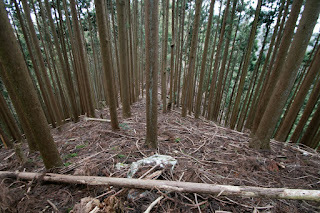 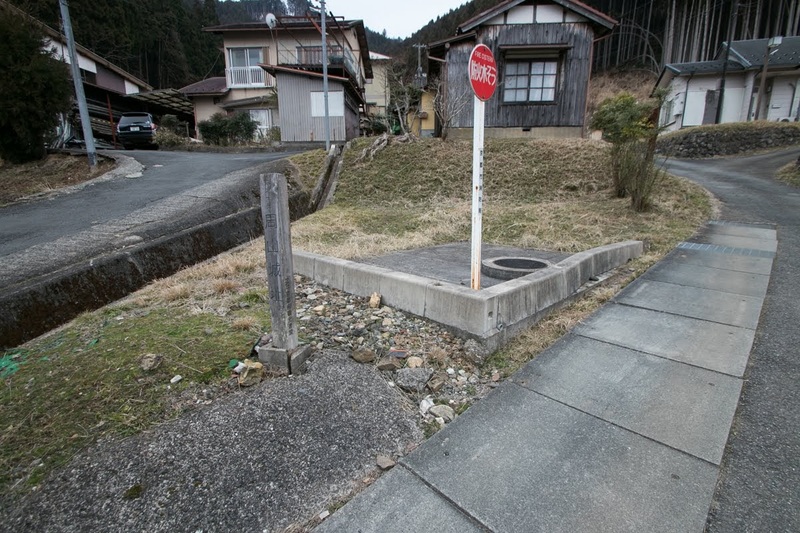 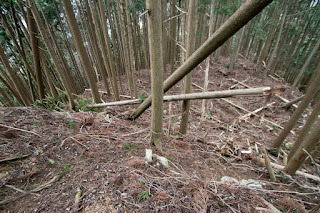 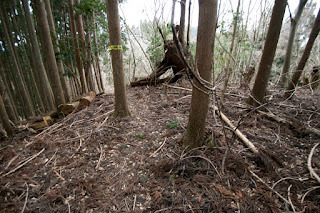 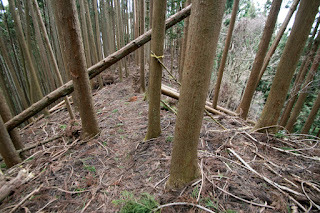 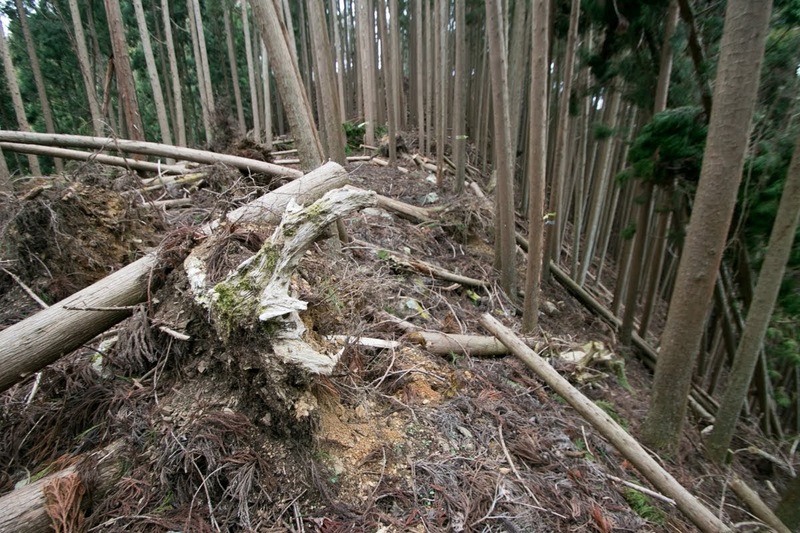 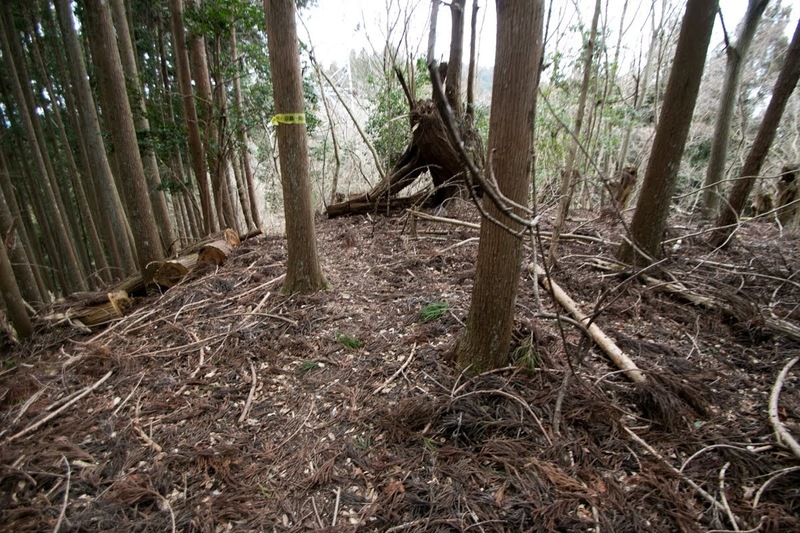 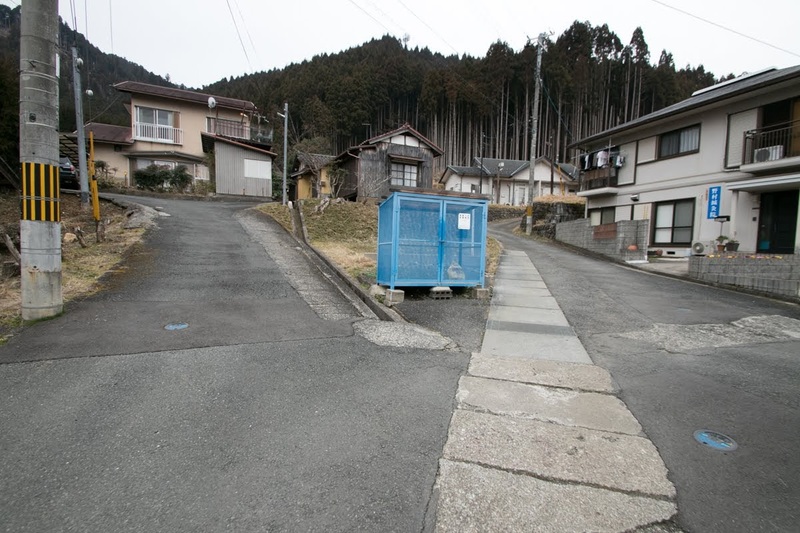 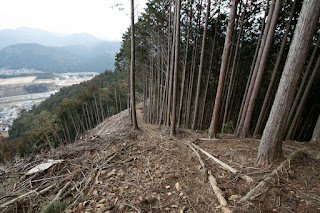 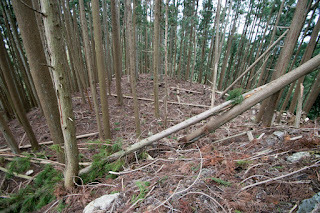 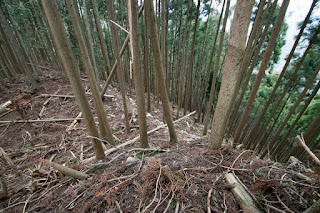 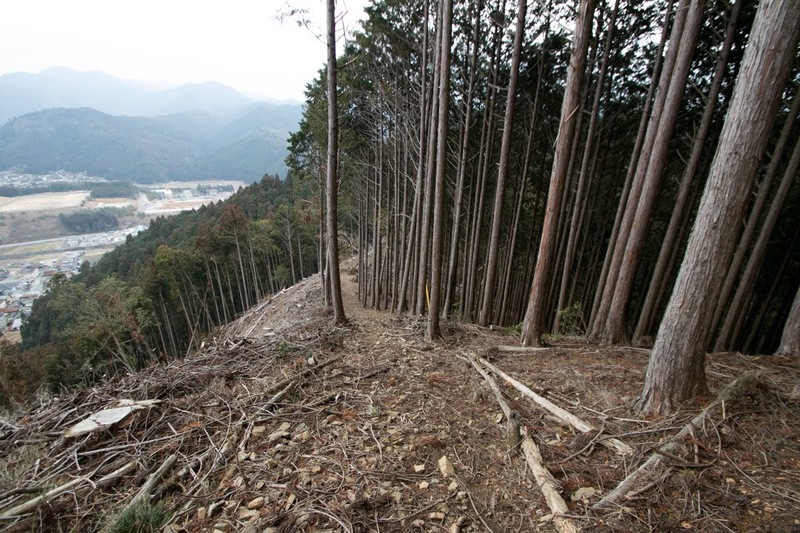 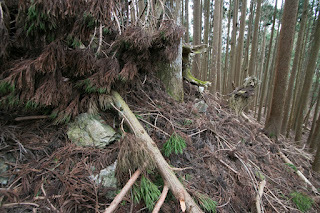 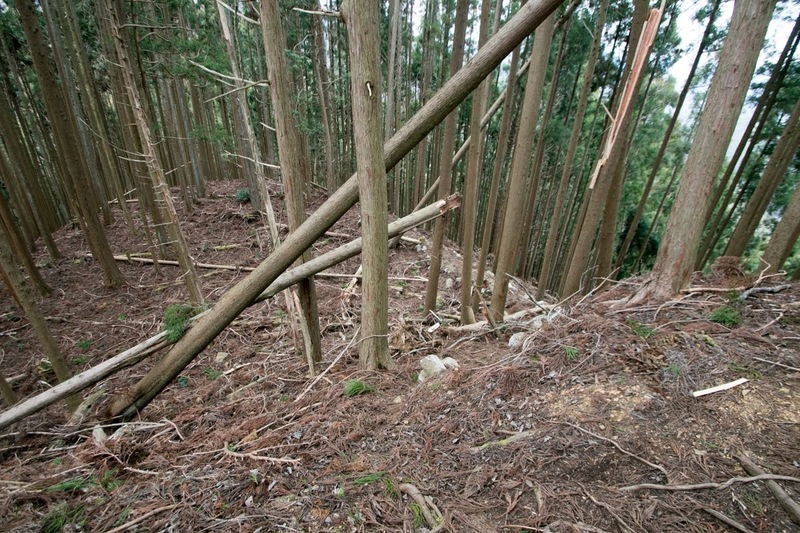 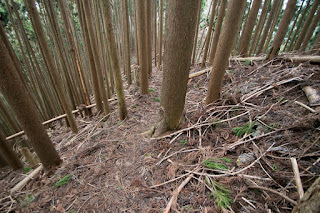 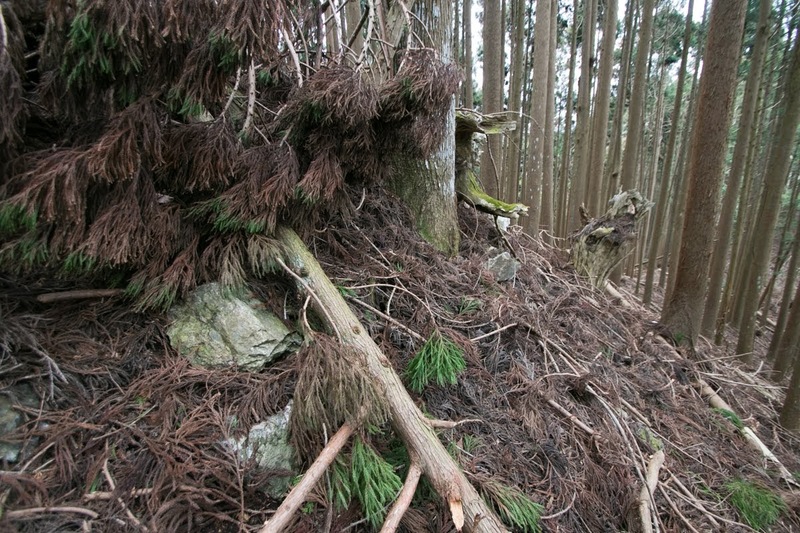 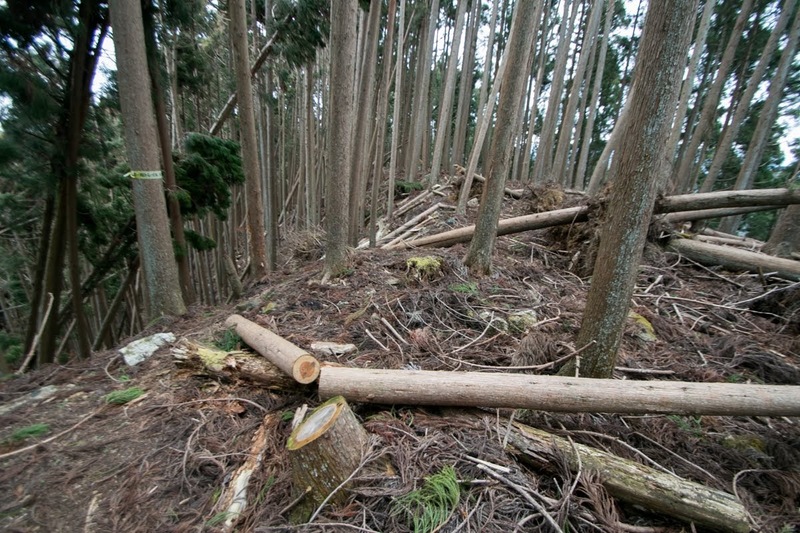 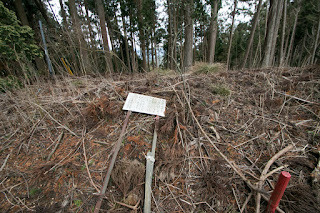 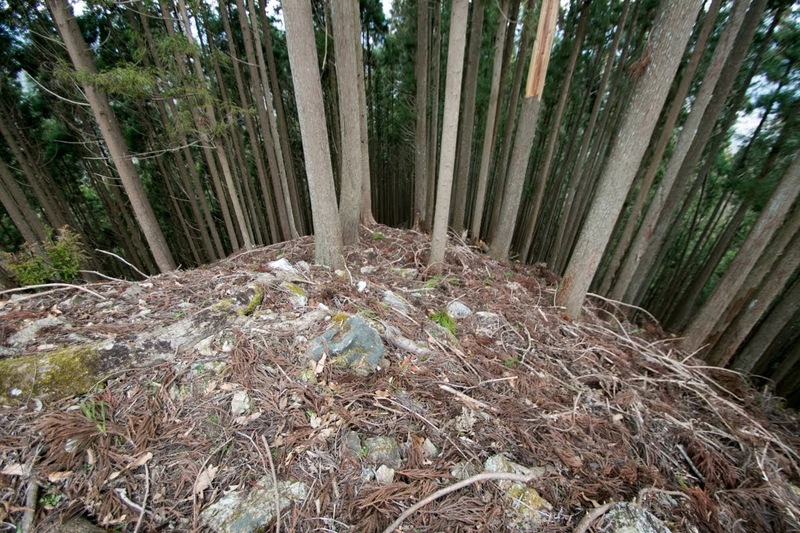 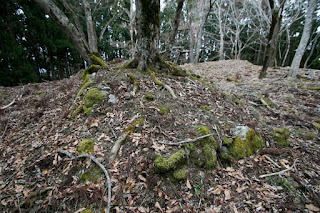 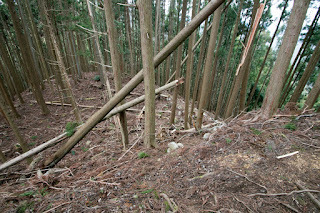 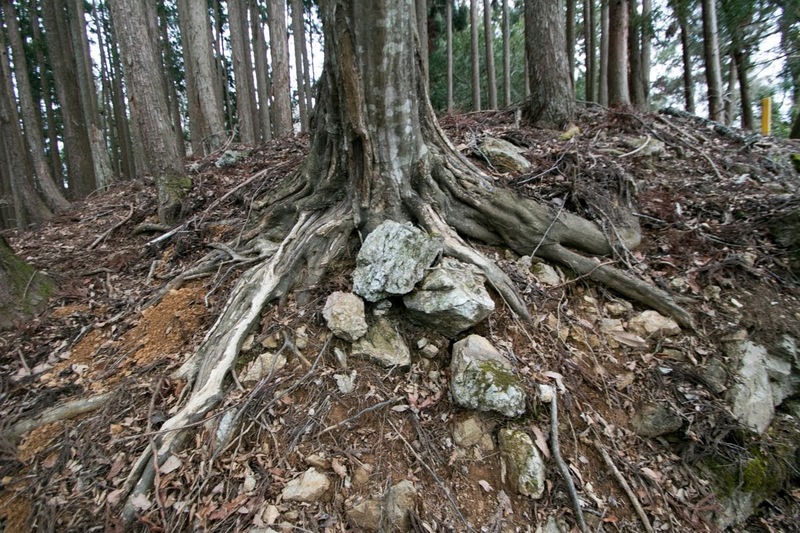 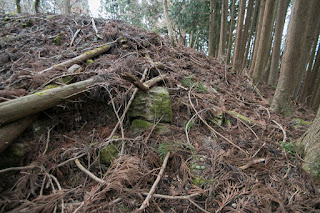 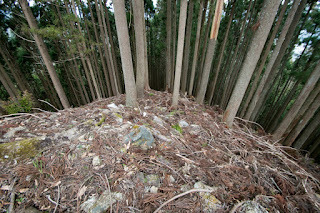 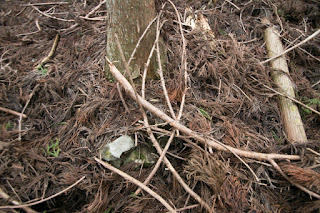 A secure structure not suitable to the small valley shows the importance of this place as a north gate of Kyoto city. 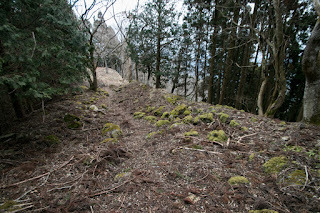 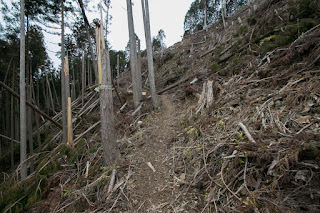 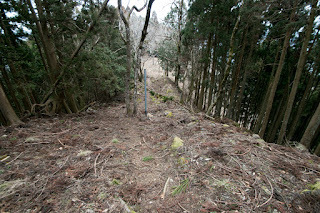 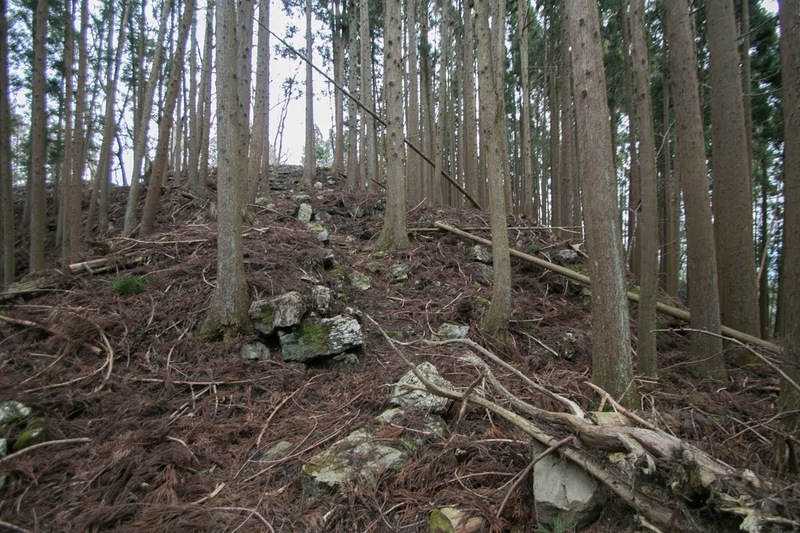 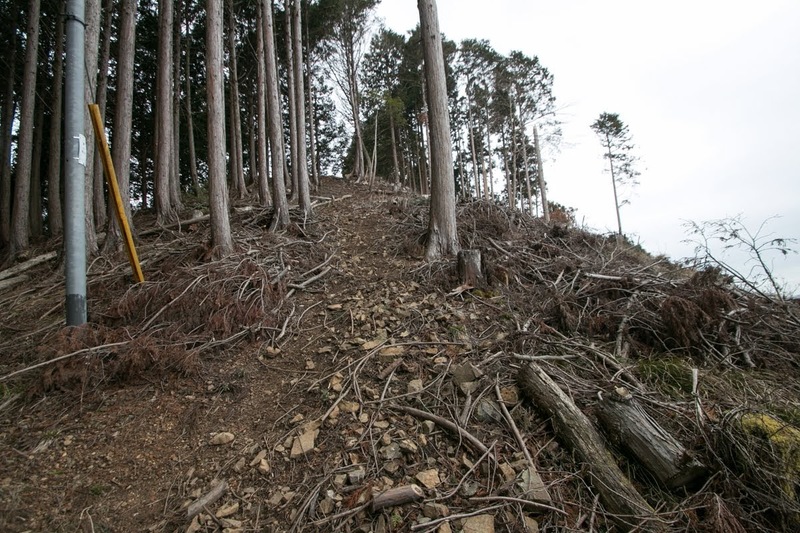 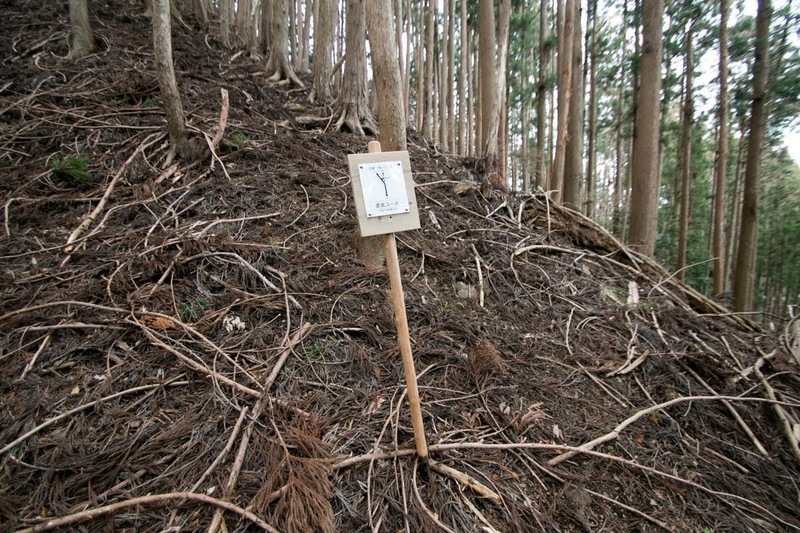 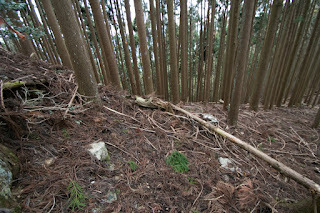 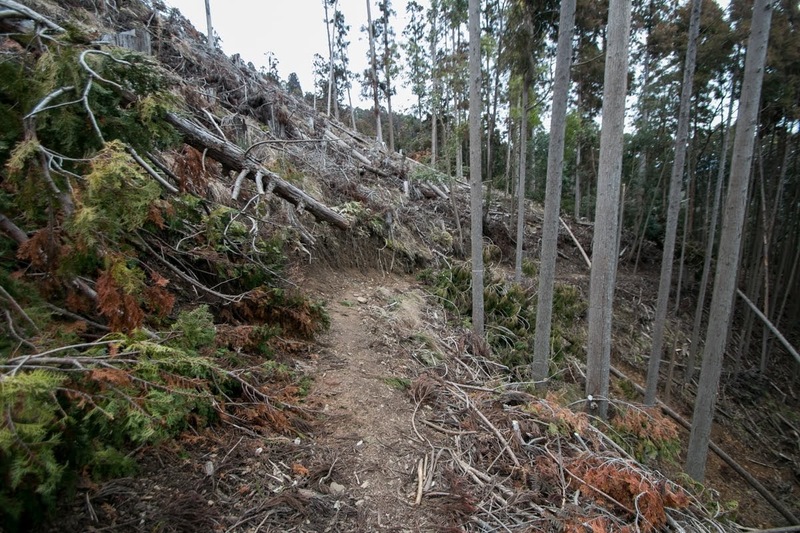 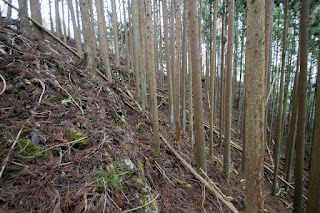 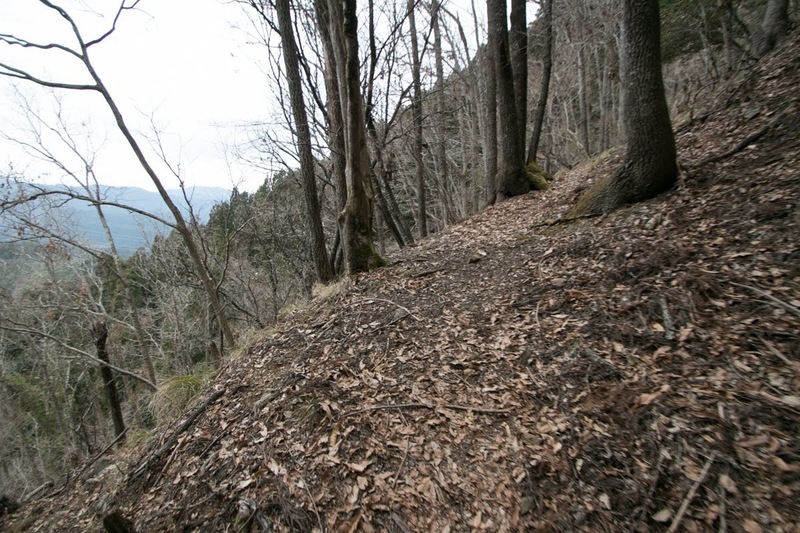 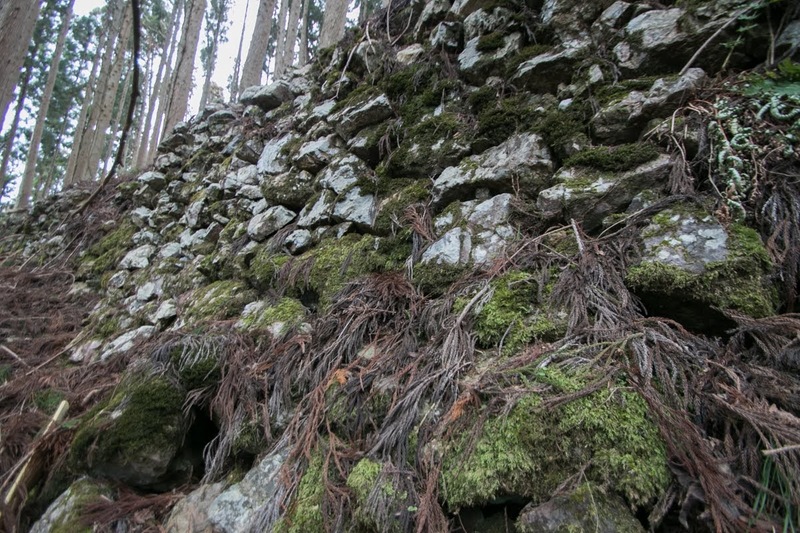 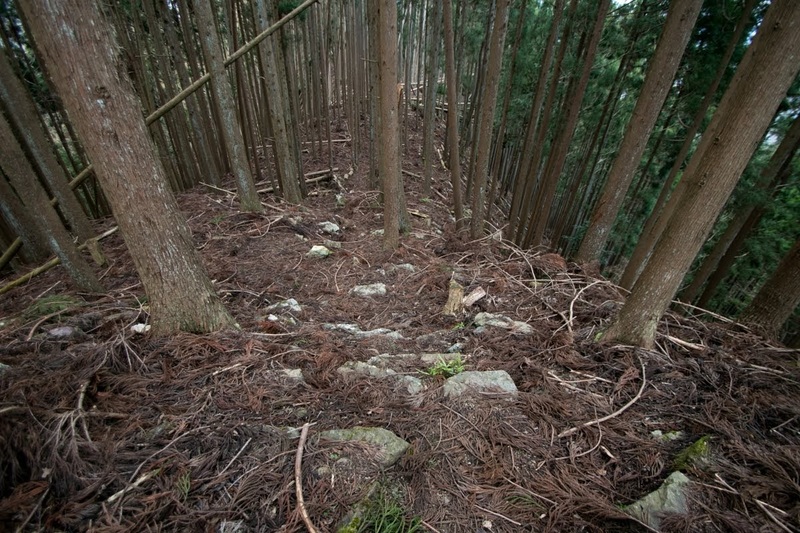 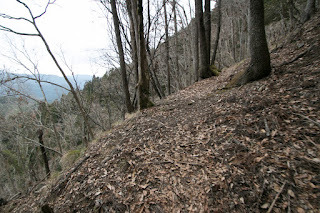 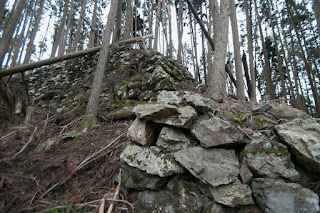 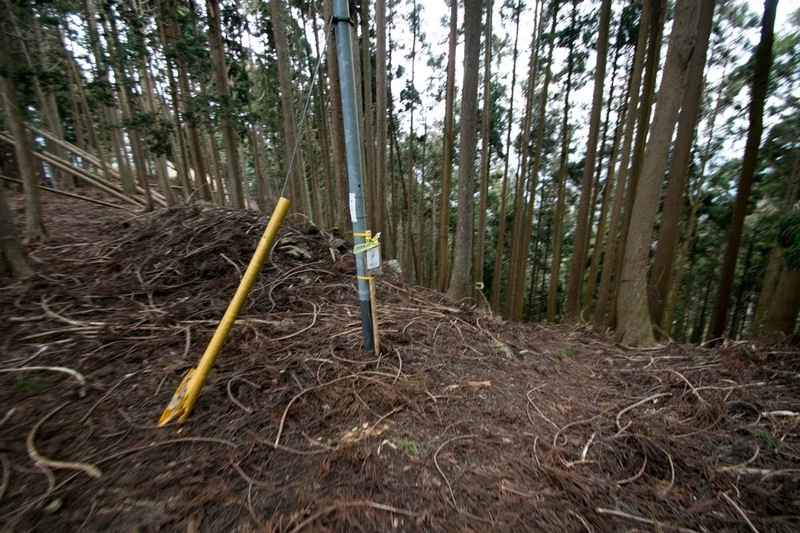 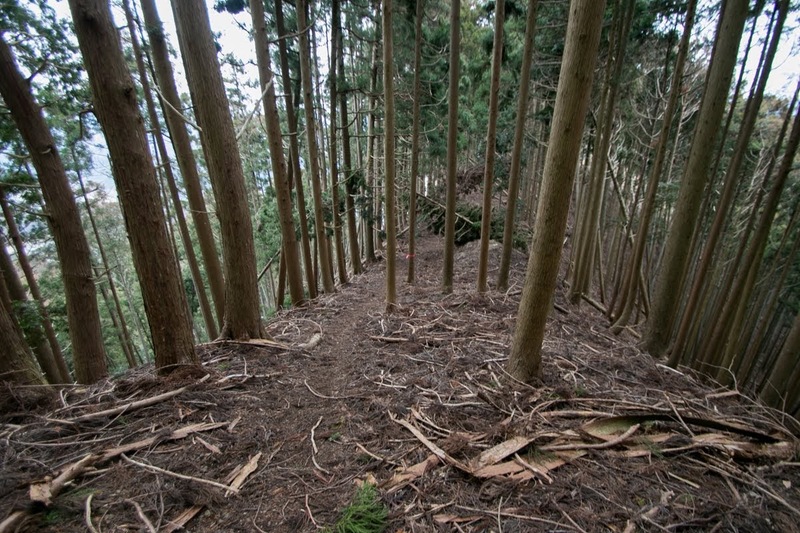 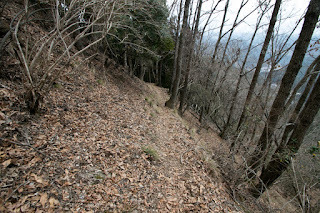 To reach the castle it is necessary to climb steep road over 30 minutes, but broken stone walls continues along with the ridge is worth for visiting. 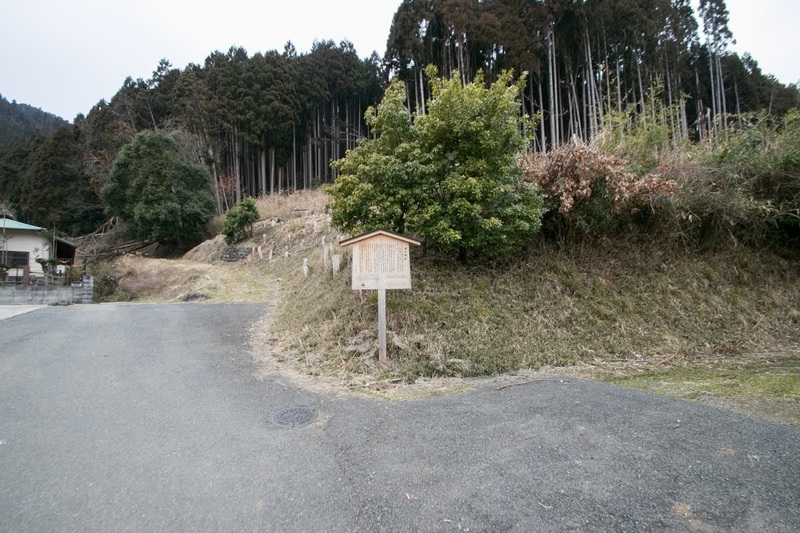 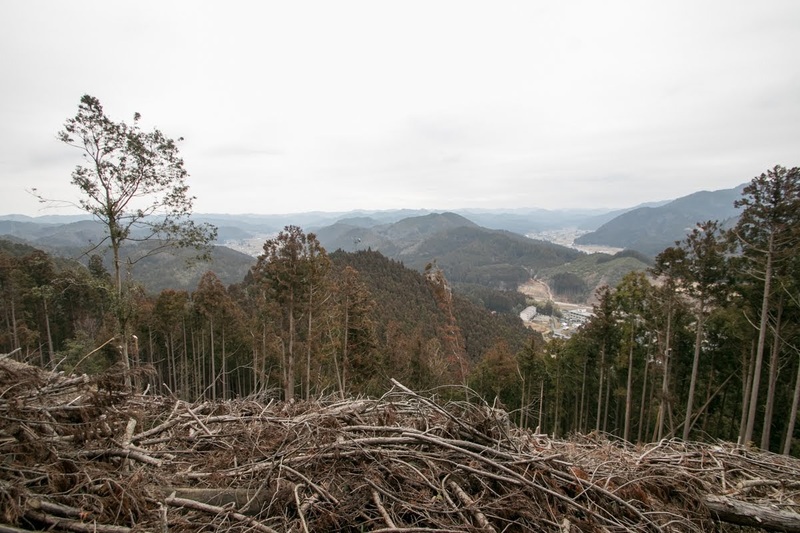 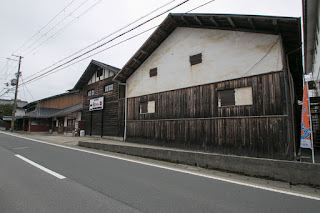 30 minutes drive from Kyoto city via Route 162 to the parking of "Woody Keihoku" (Route 477 is too narrow and not recommended). 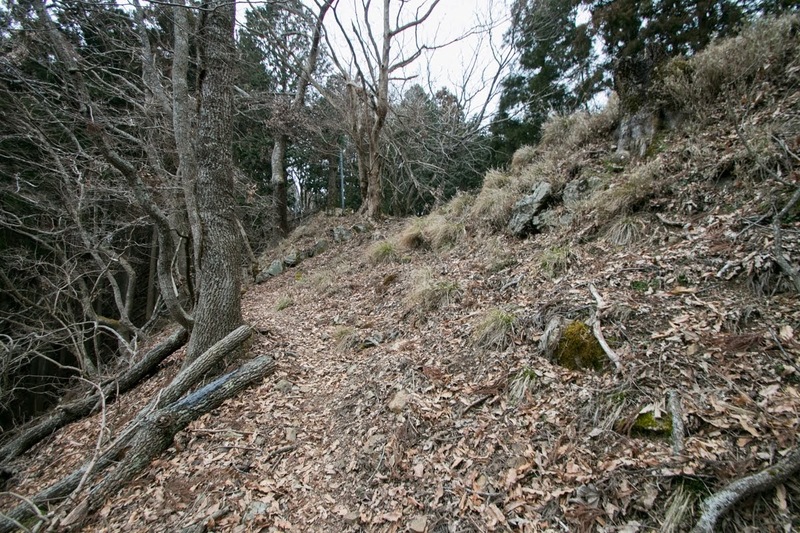 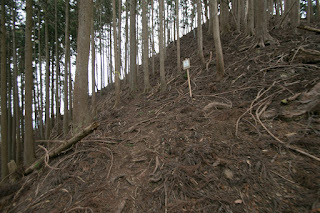 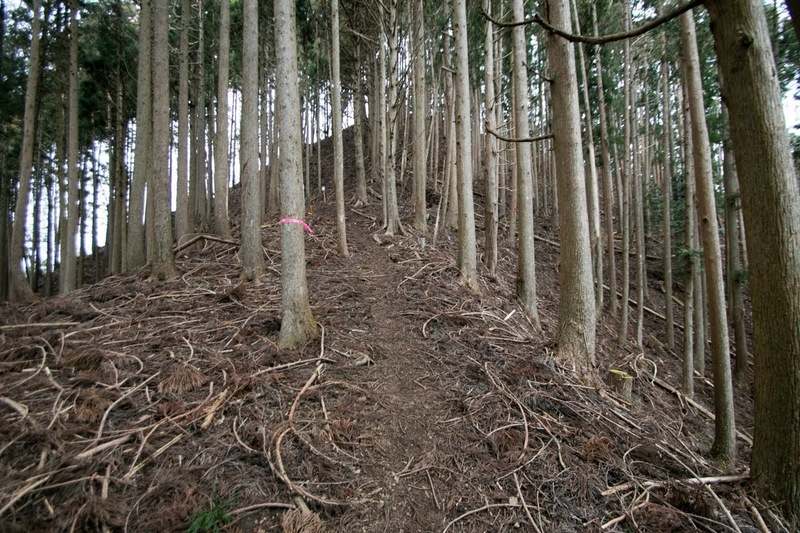 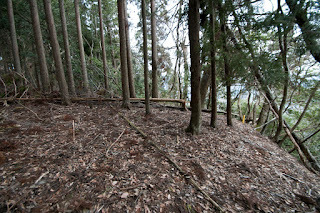 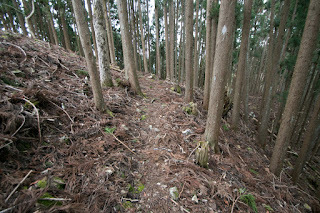 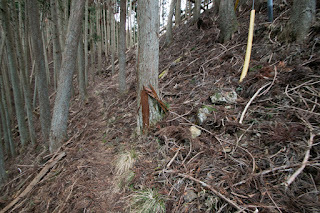 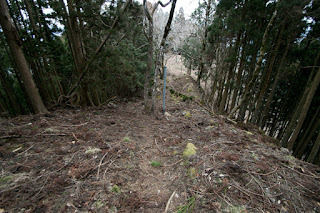 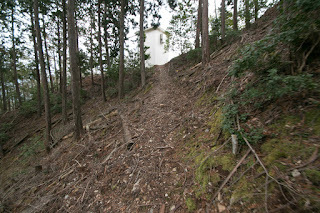 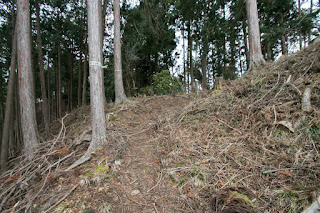 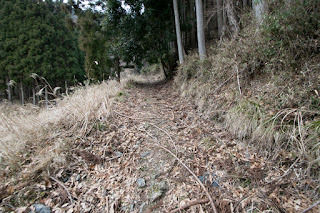 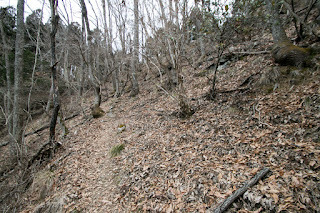 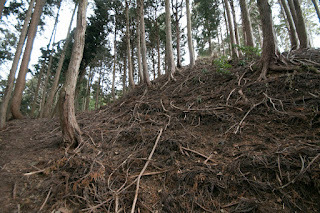 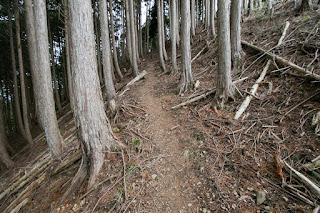 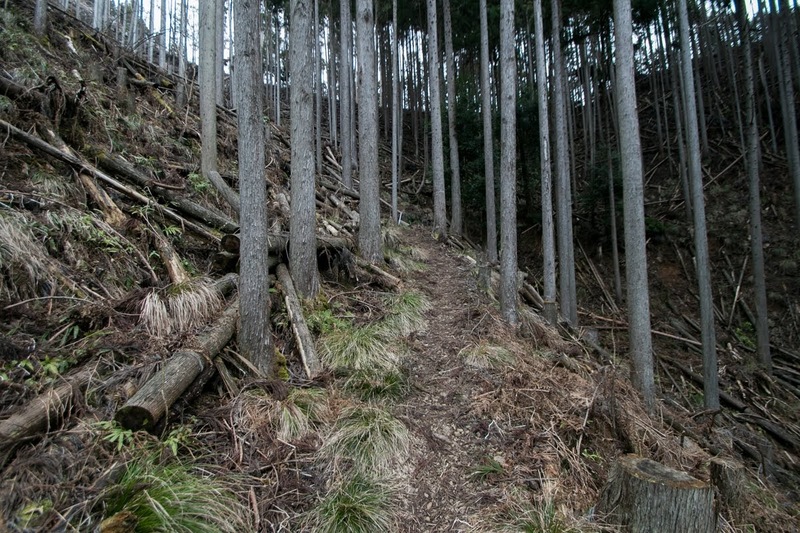 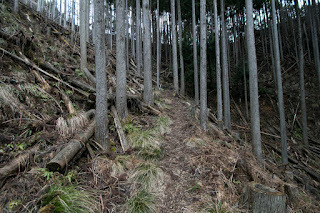 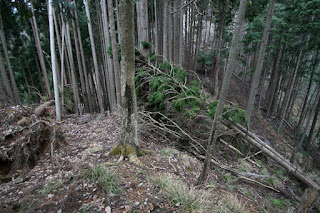 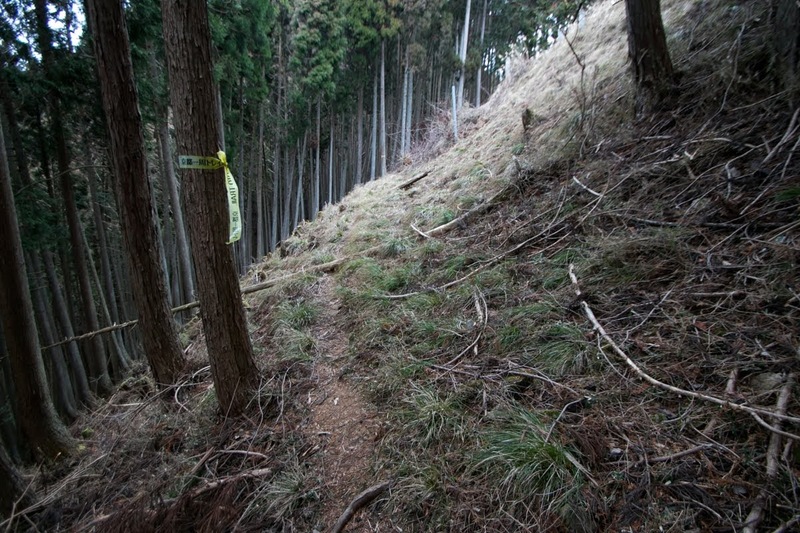 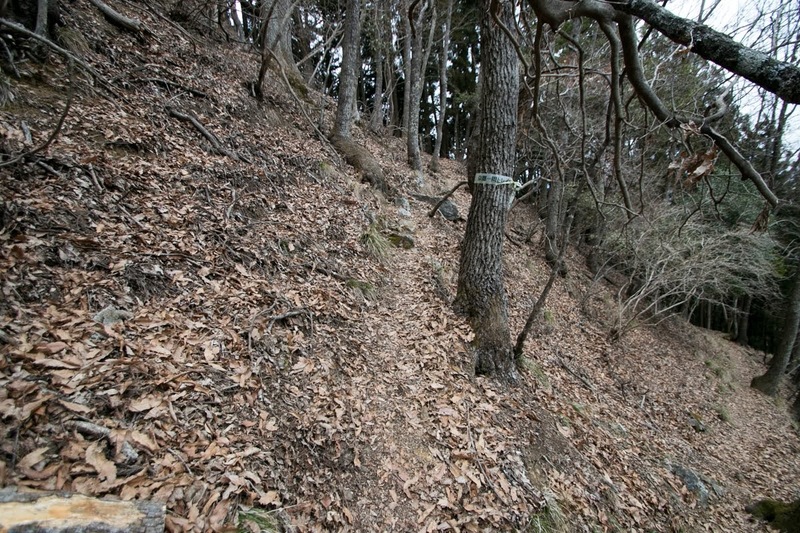 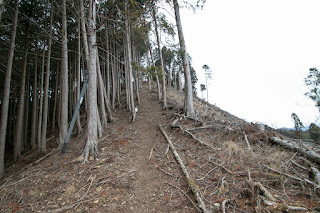 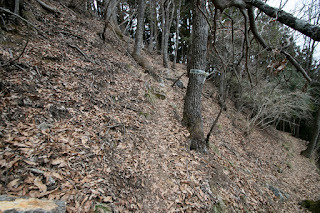 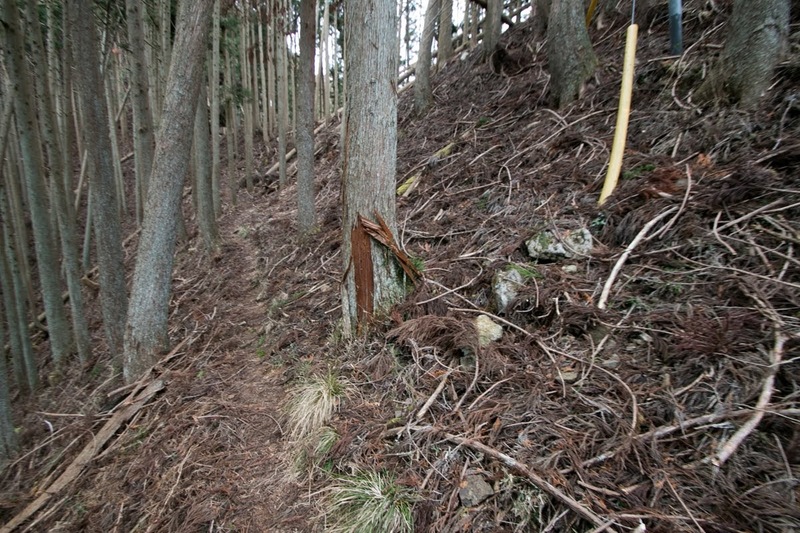 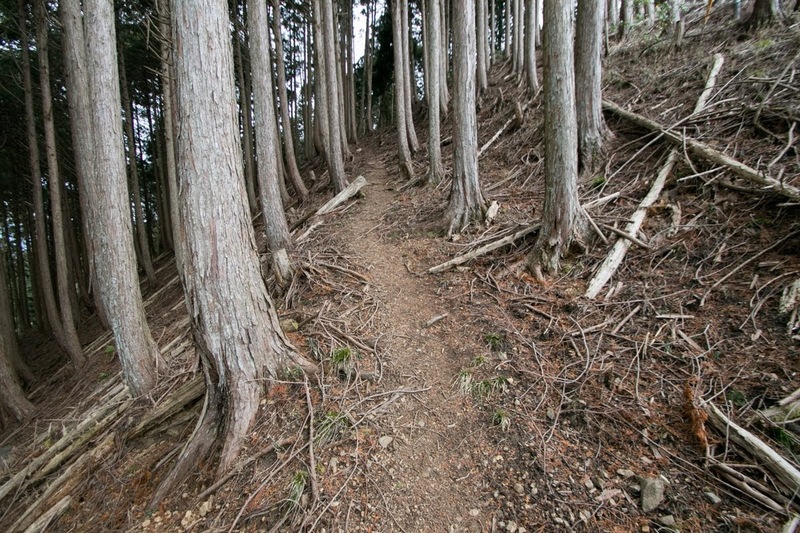 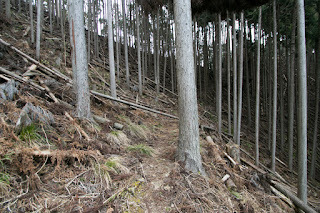 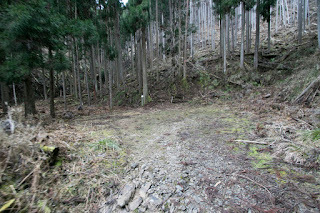 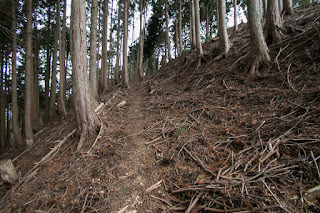 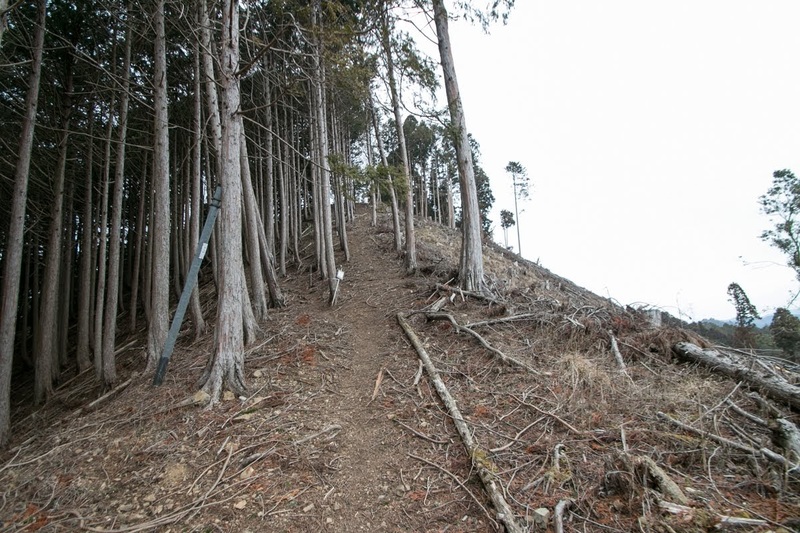 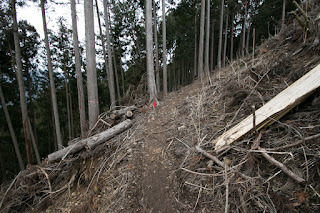 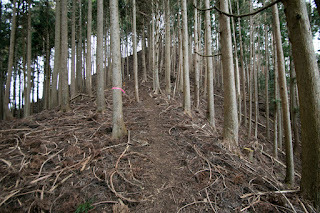 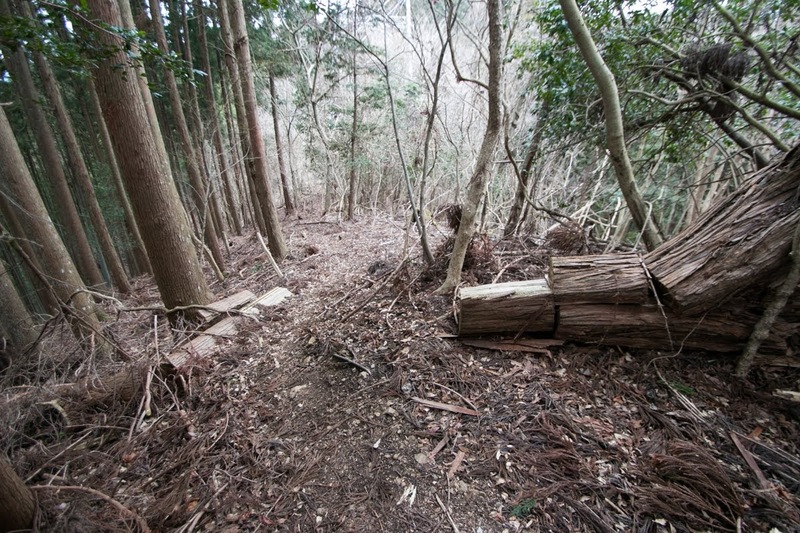 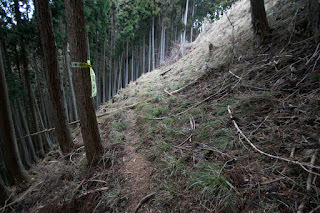 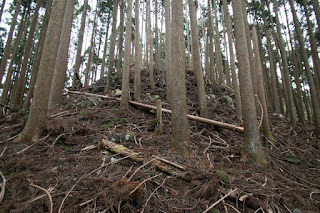 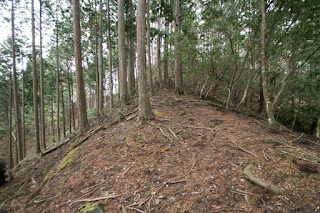 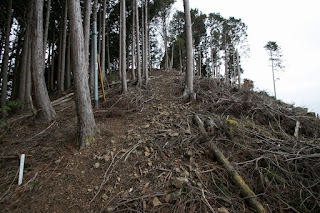 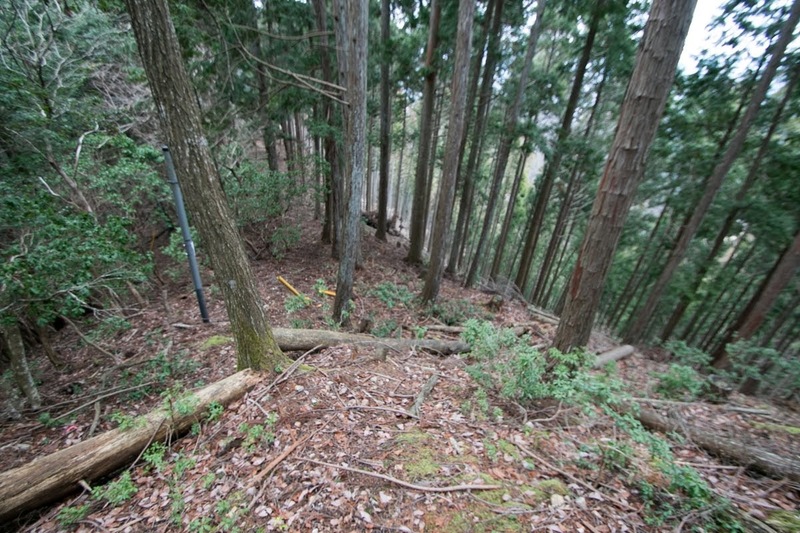 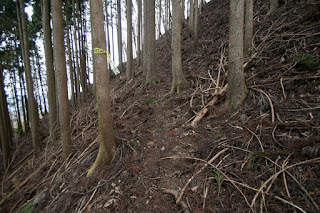 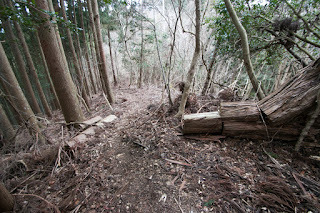 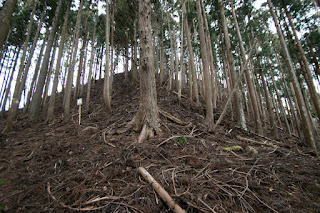 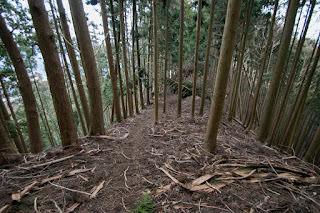 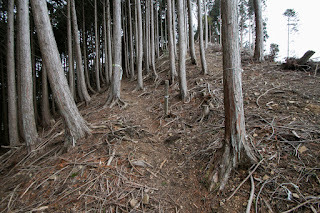 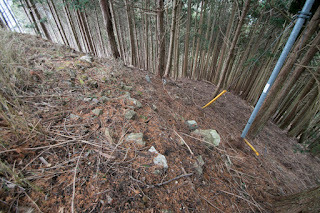 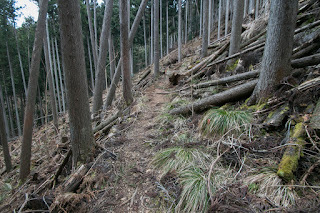 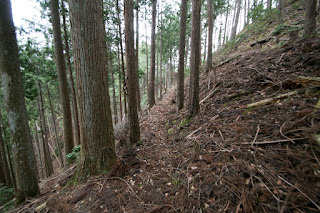 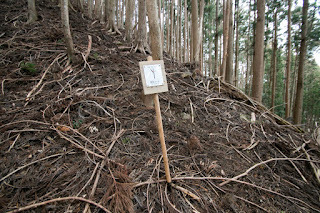 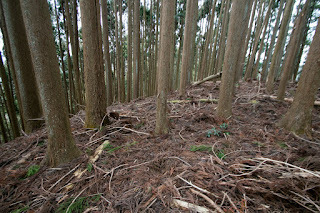 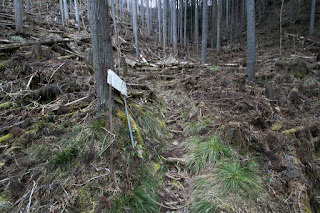 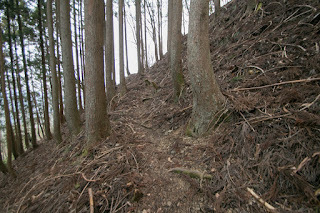 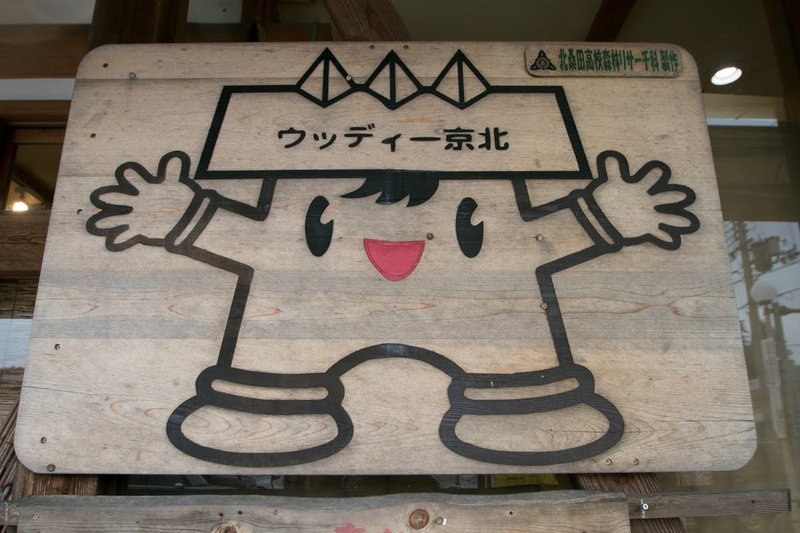 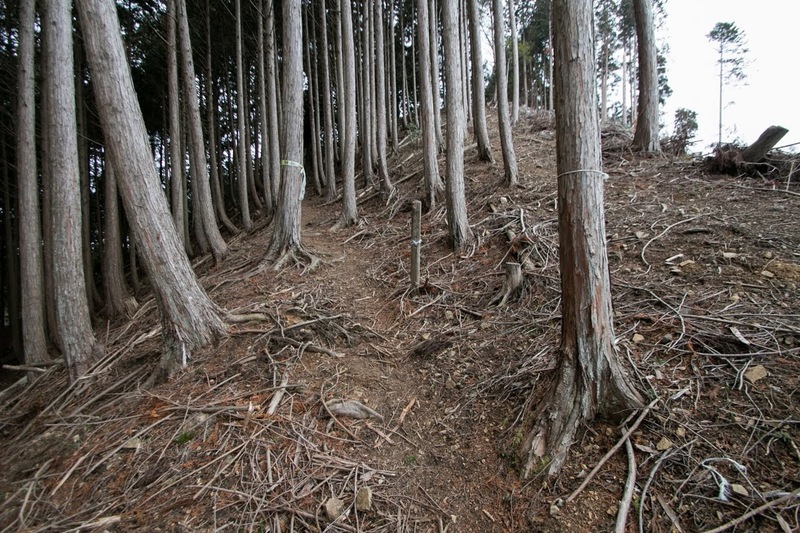 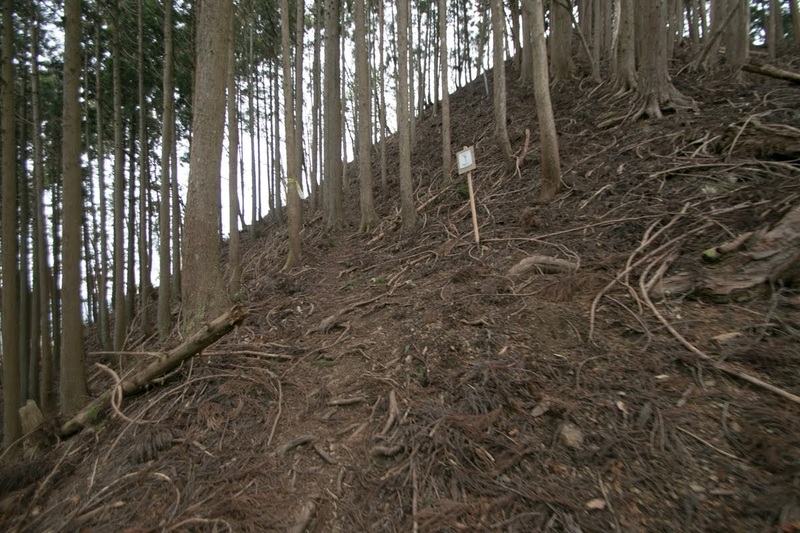 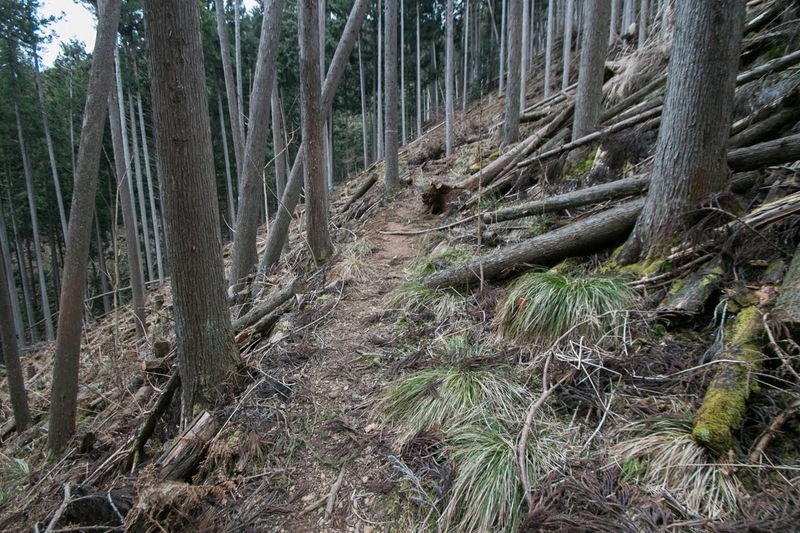 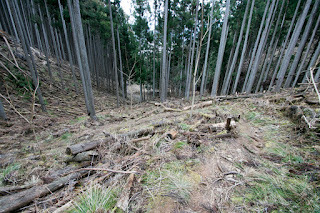 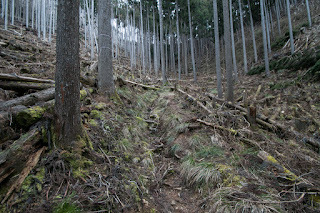 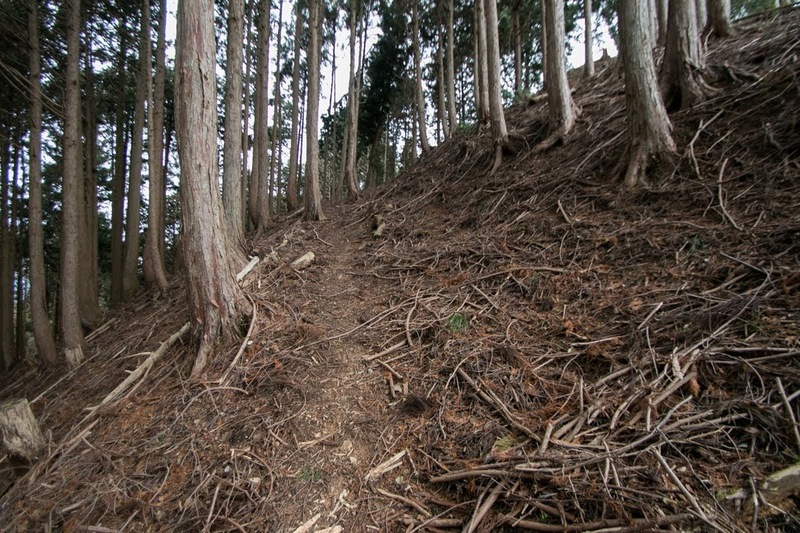 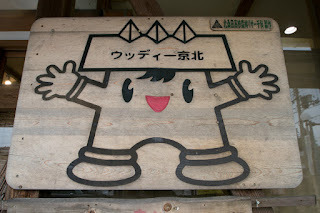 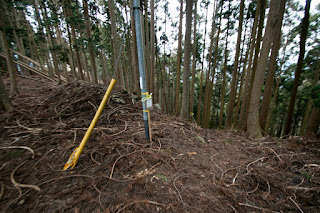 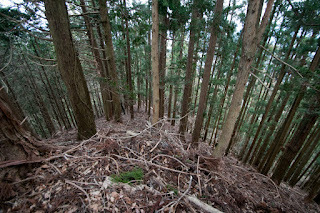 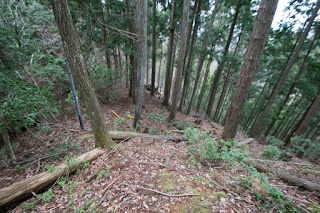 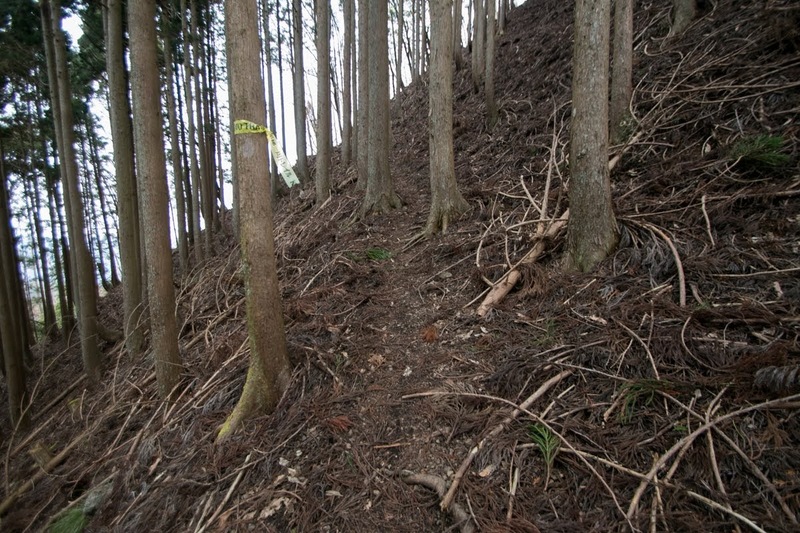 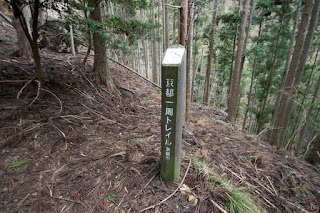 15 minutes walk from "Woody Keihoku" to the entrance of climbing road, and 30 minutes walk from hillside to hilltop castle.